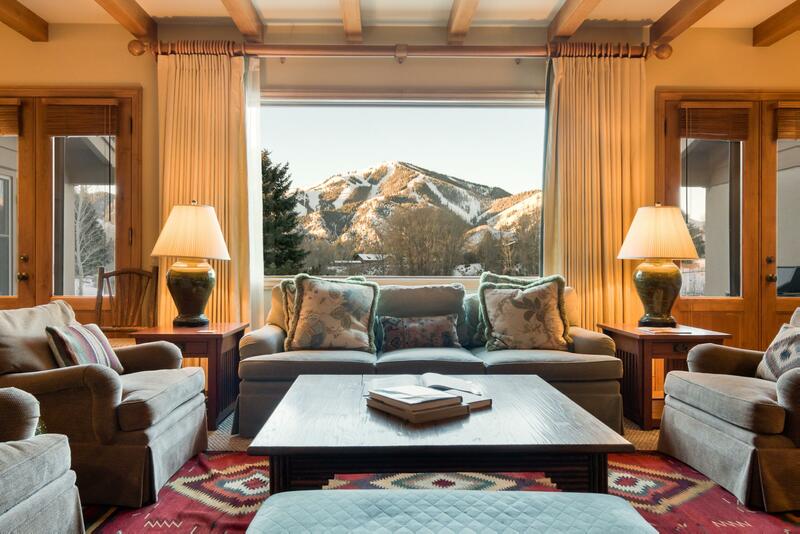 America’s “First Destination Ski Resort,” Sun Valley has attracted alpine enthusiasts since Clark Gable and Katharine Hepburn stem-christied down its pistes, as the resort became synonymous with Hollywood. 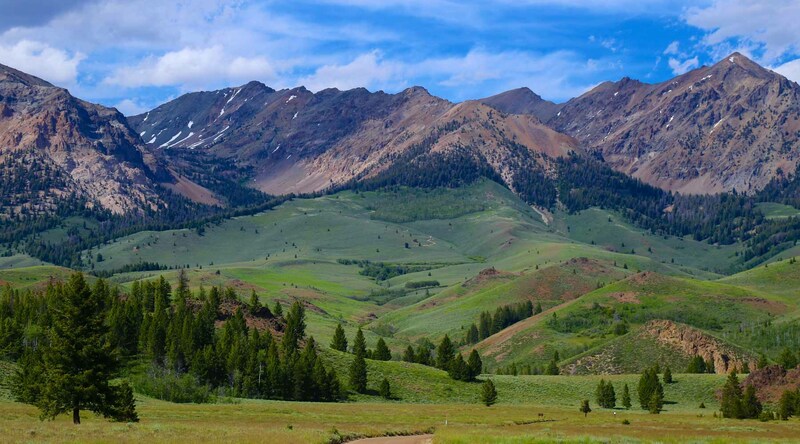 Today, families flock to Sun Valley for four seasons of outdoor adventure and the charming mountain town of Ketchum. 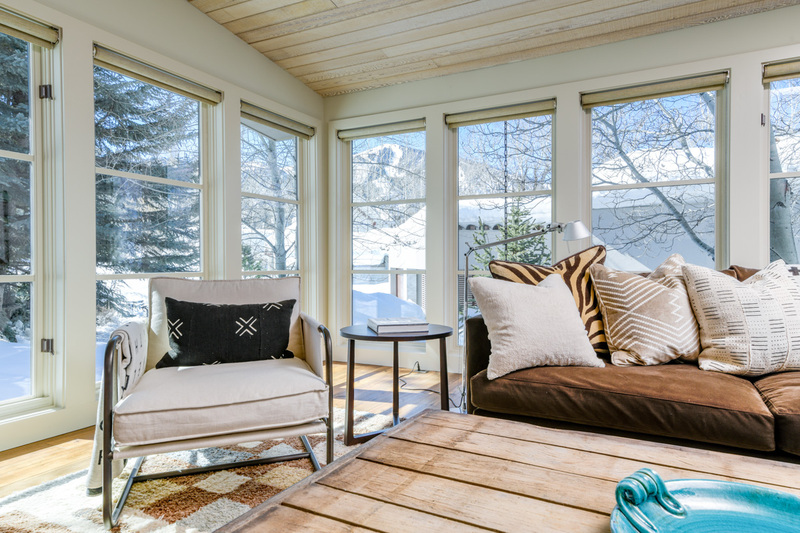 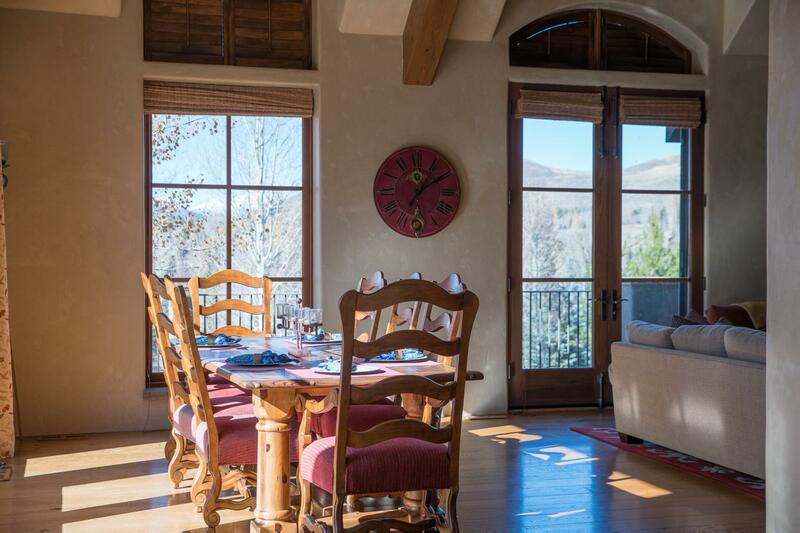 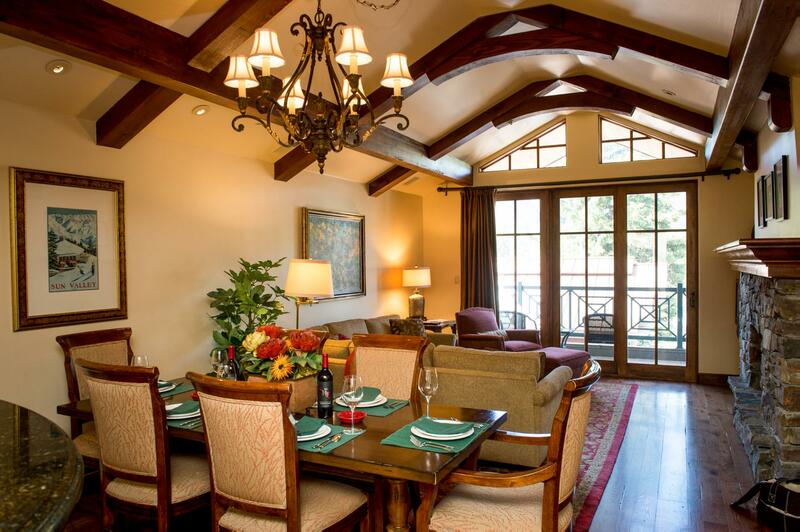 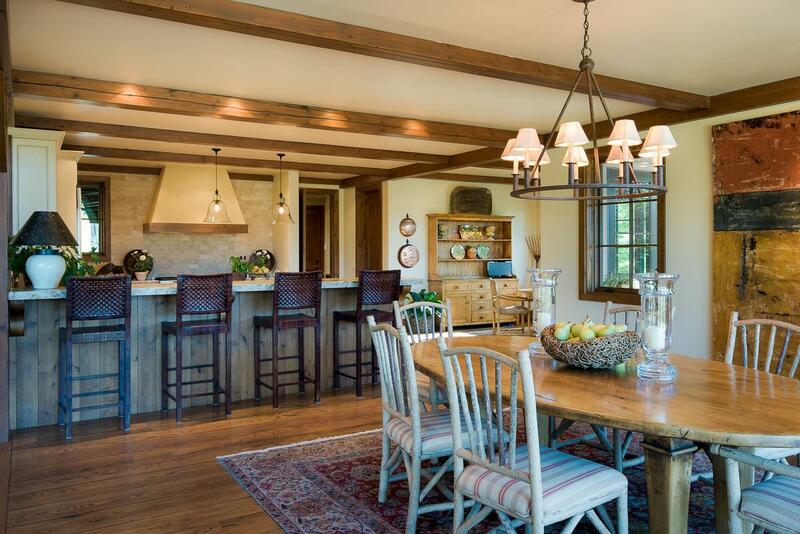 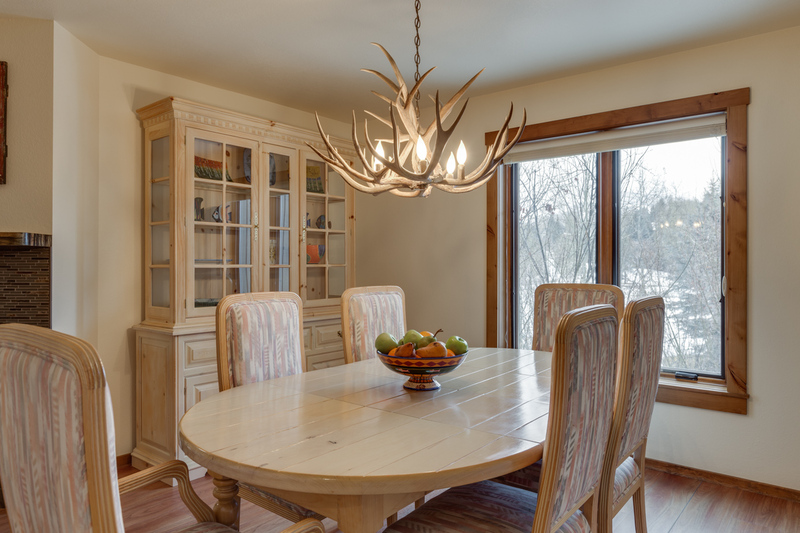 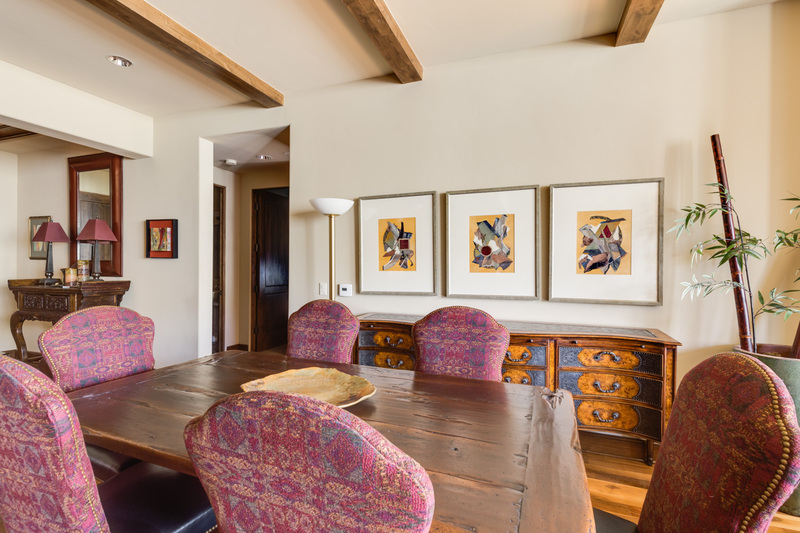 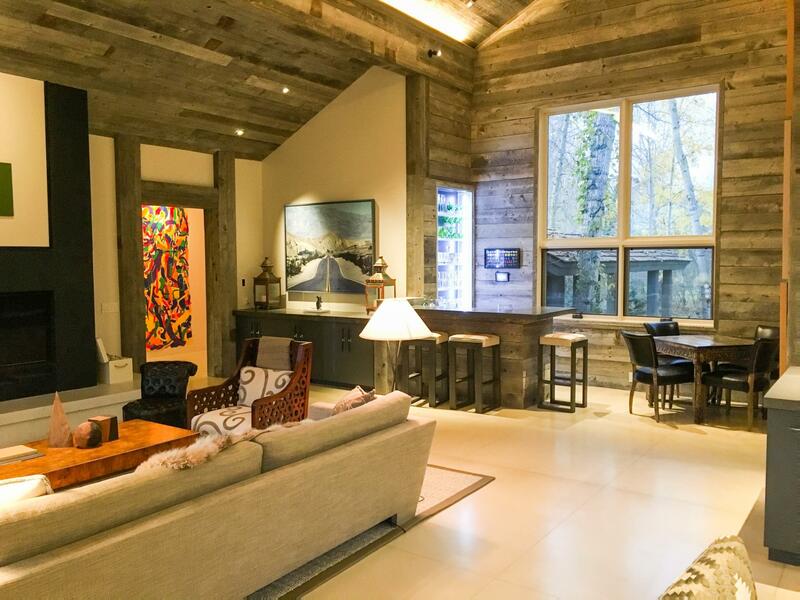 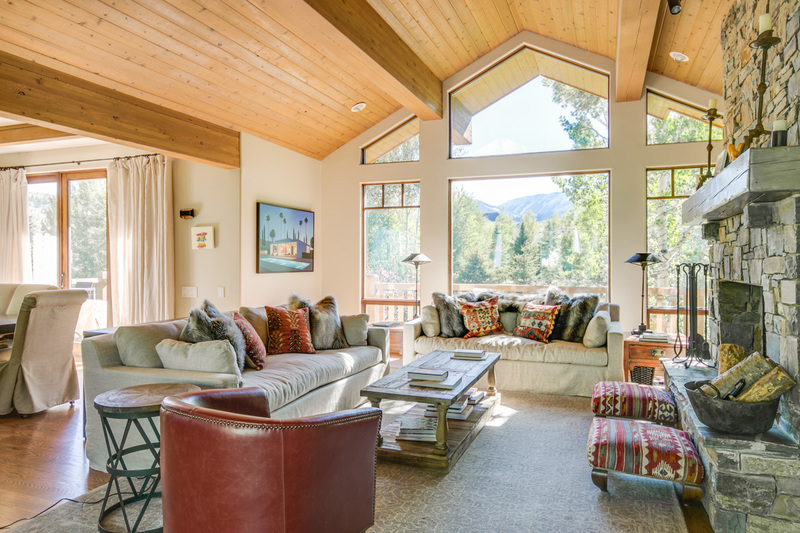 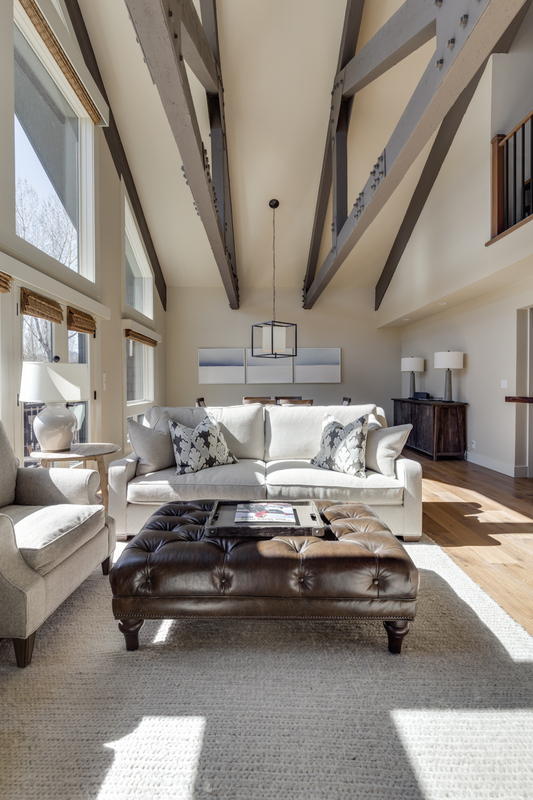 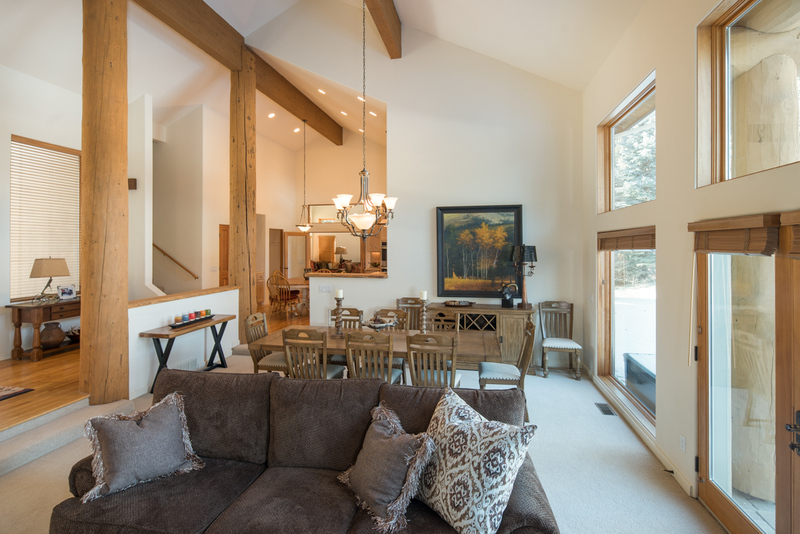 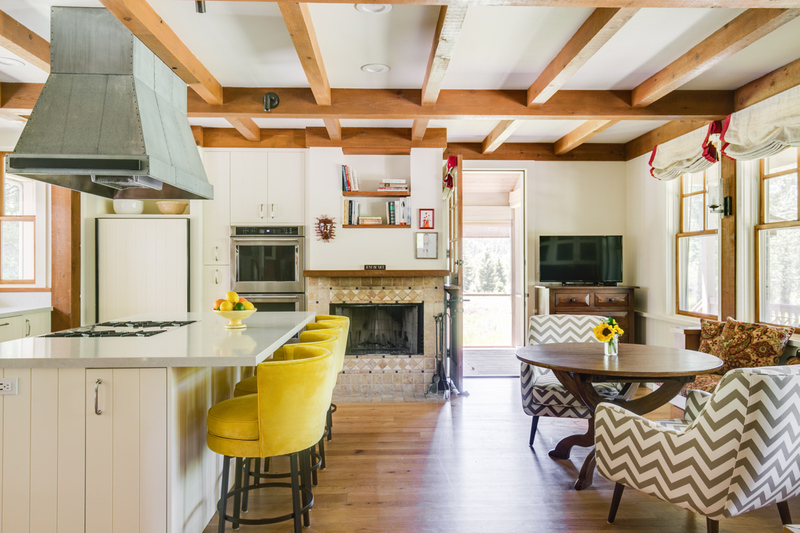 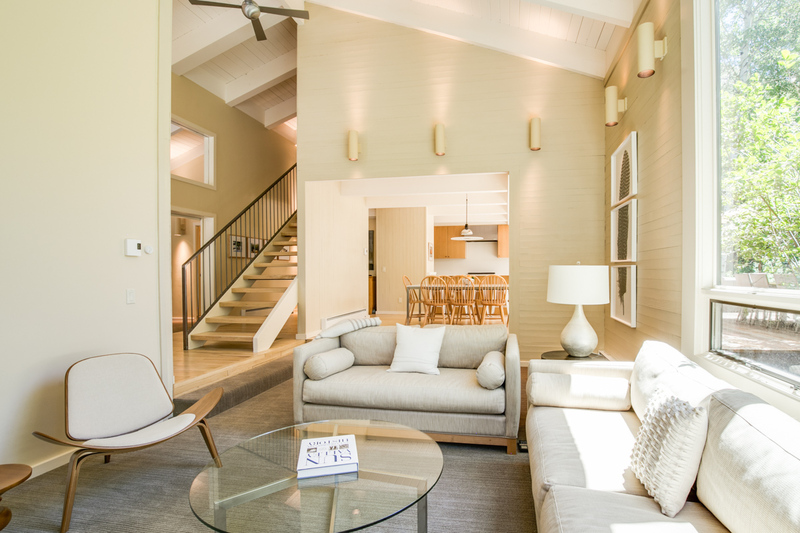 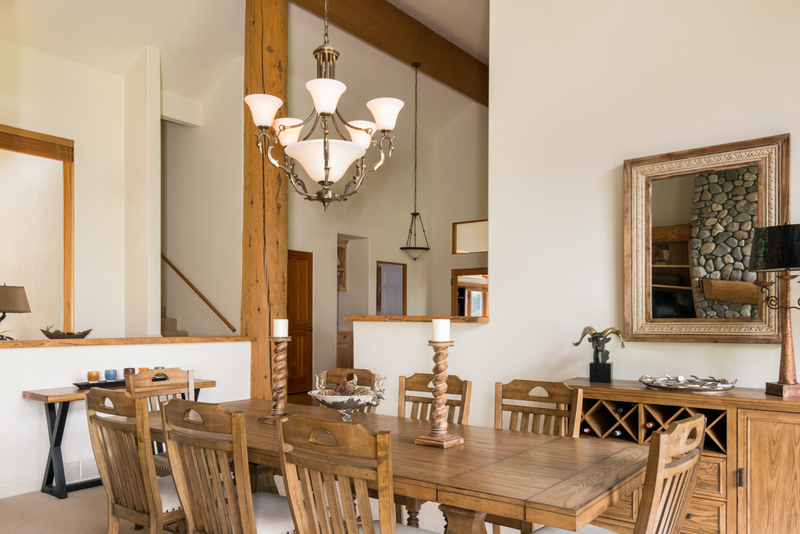 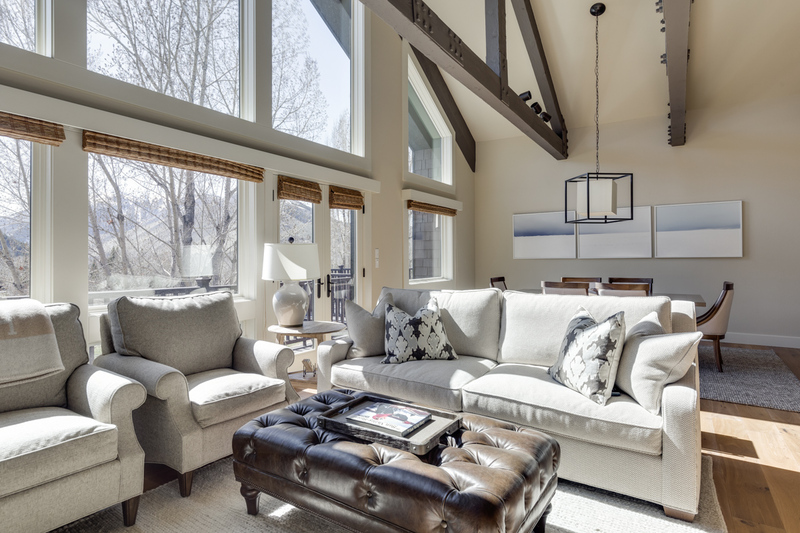 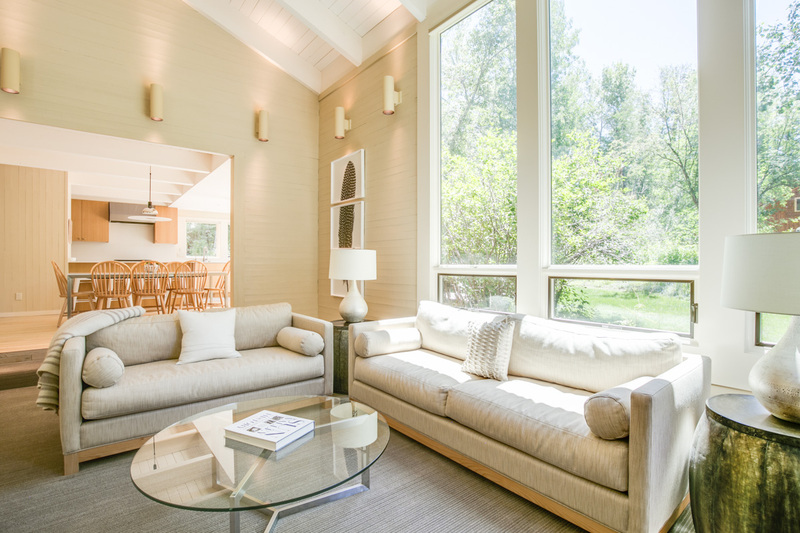 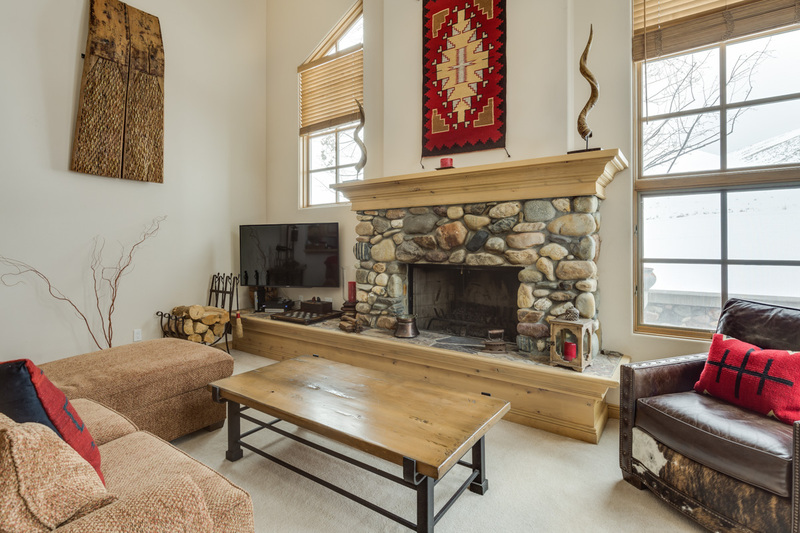 Our Sun Valley vacation rentals range from stylish condos in downtown Ketchum, to grand estates on manicured grounds with private river access and luxury amenities. 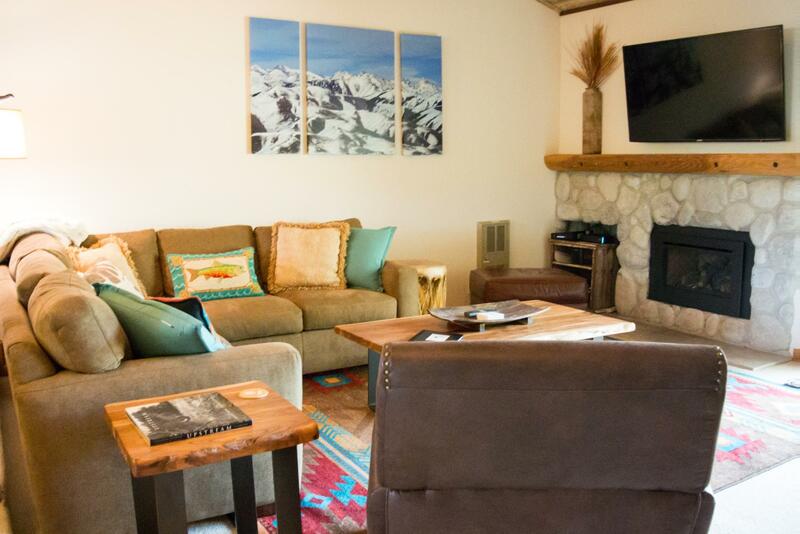 Our local Sun Valley team delights in sharing their insider local knowledge to make trying new adventures seamless. 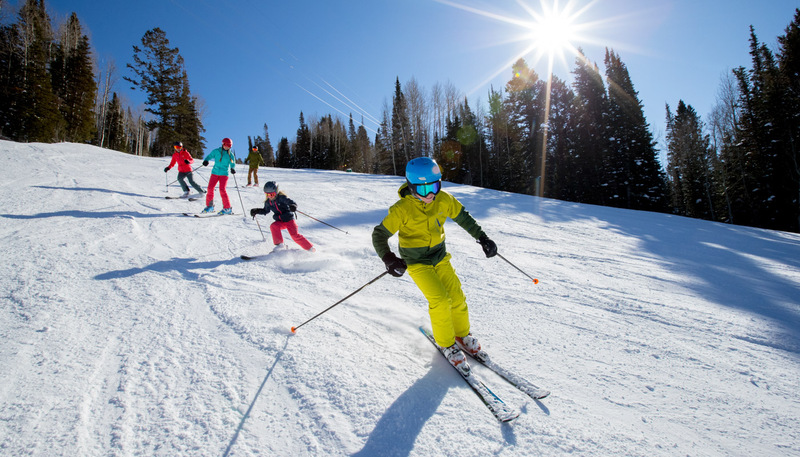 They’ll recommend where to try your first black diamond run, the best restaurant to celebrate afterward, and how to explore Sun Valley off the slopes, from fly-fishing to ice skating. 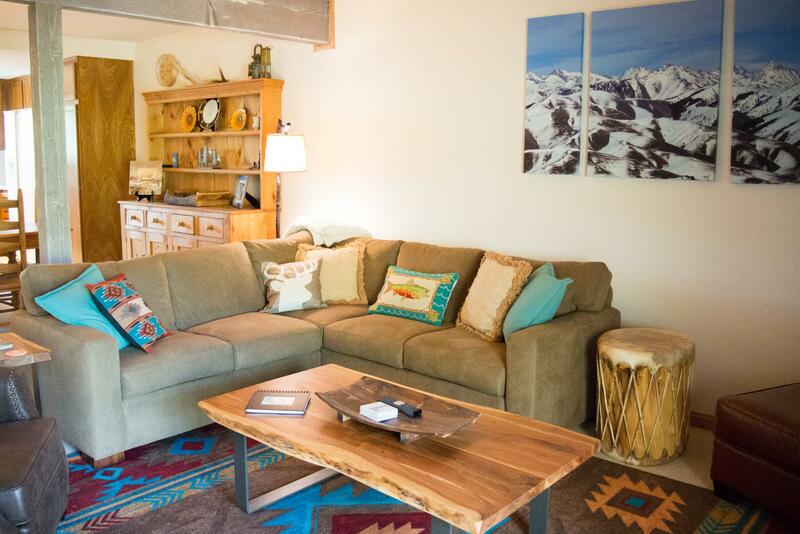 During the summer, they’ll connect you to local guides for mountain biking, horseback riding, fly-fishing, and more. 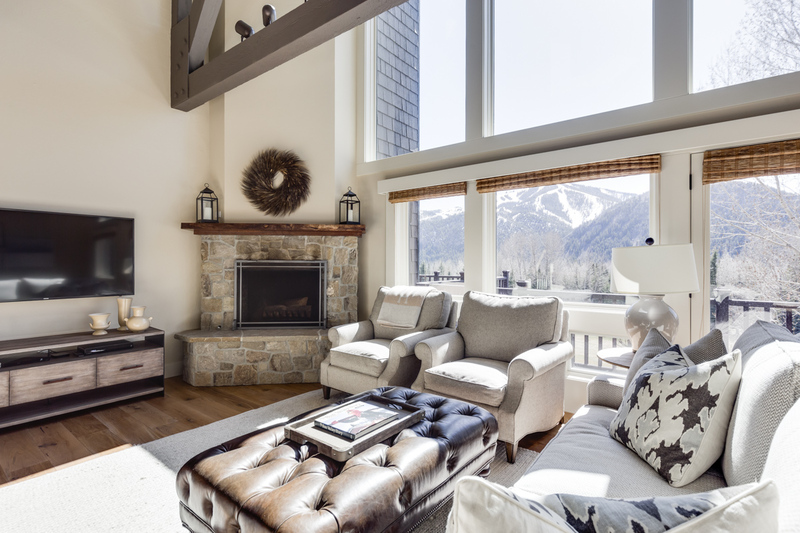 The town behind the destination, Ketchum gives Sun Valley its local soul, including family-run restaurants, shops, and apres-ski hangouts. 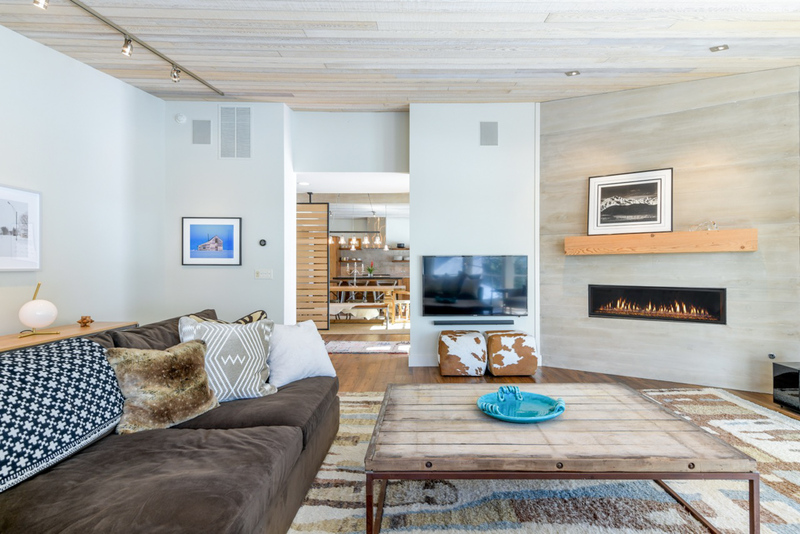 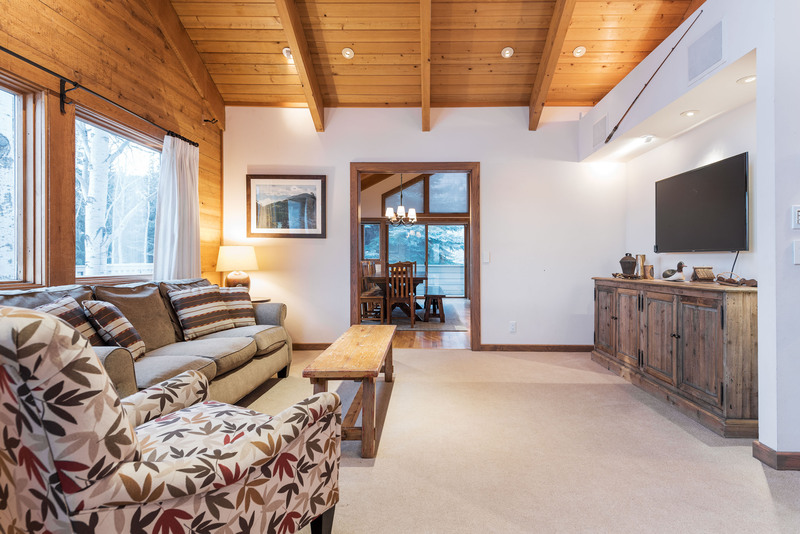 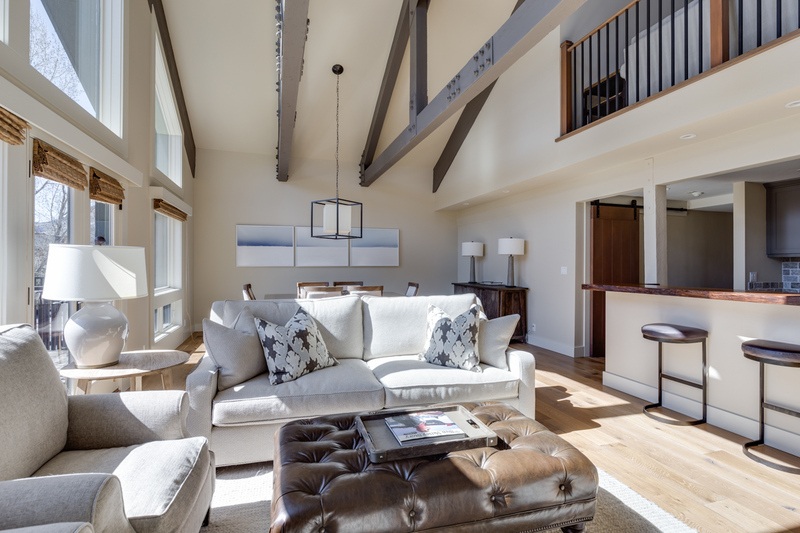 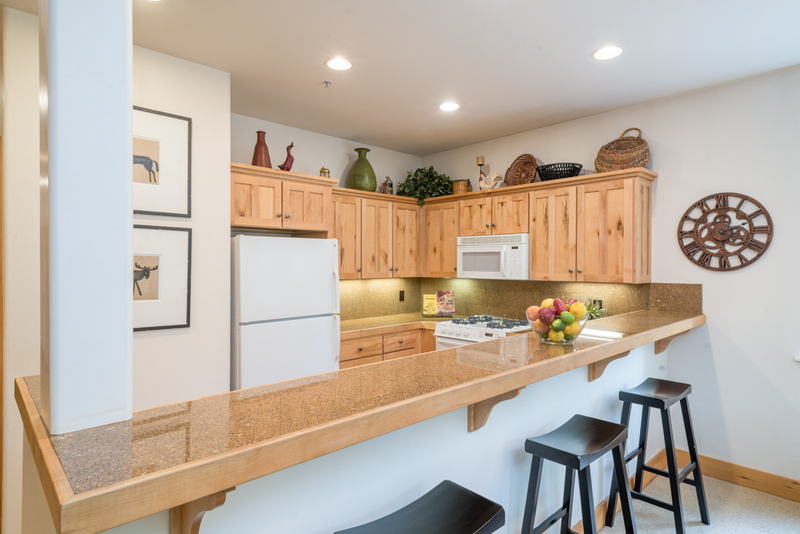 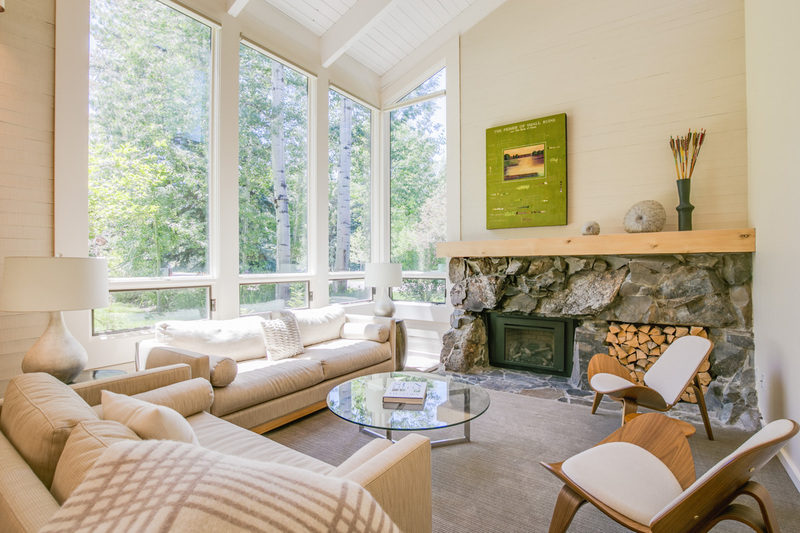 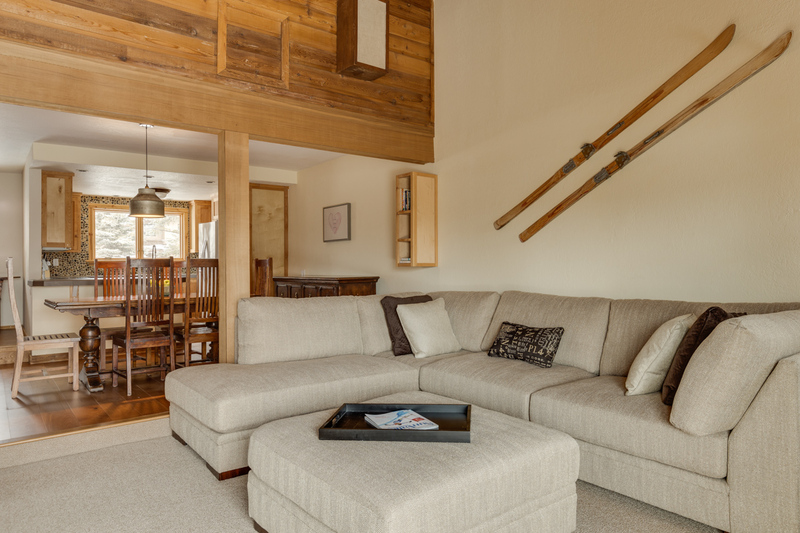 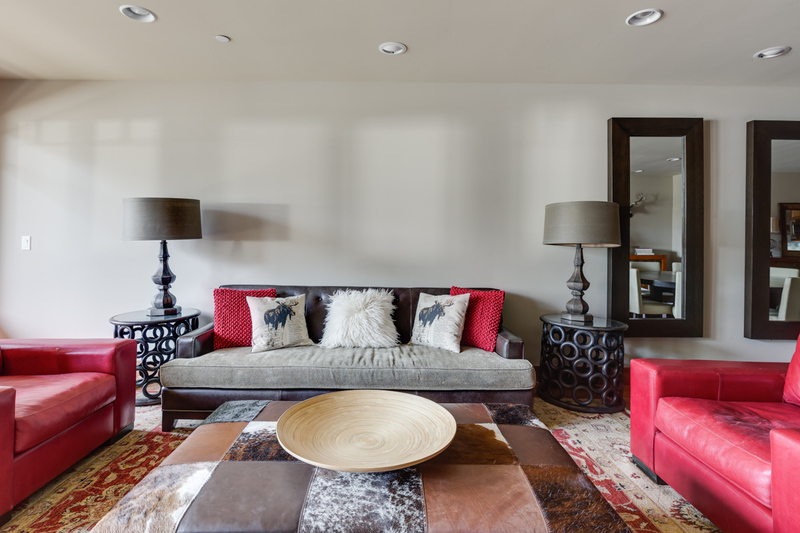 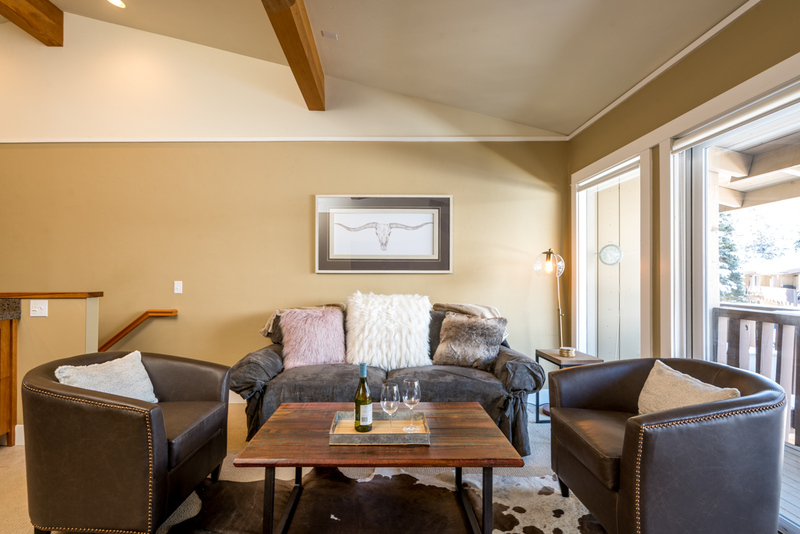 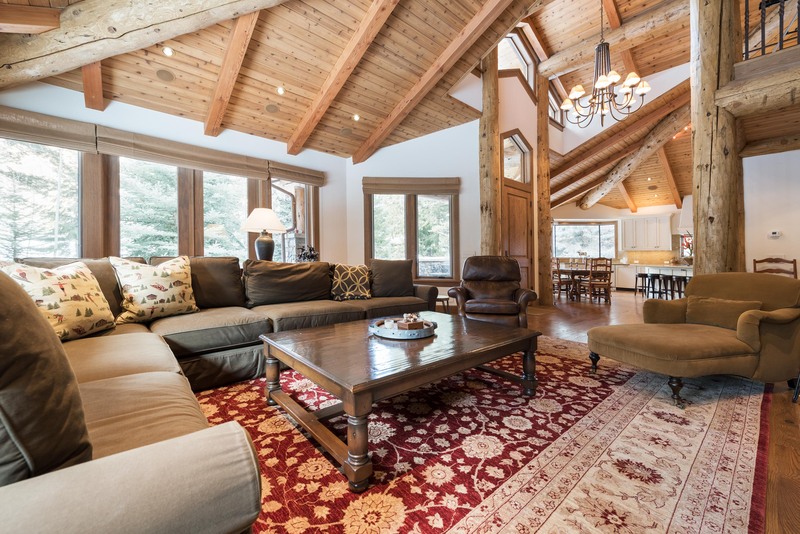 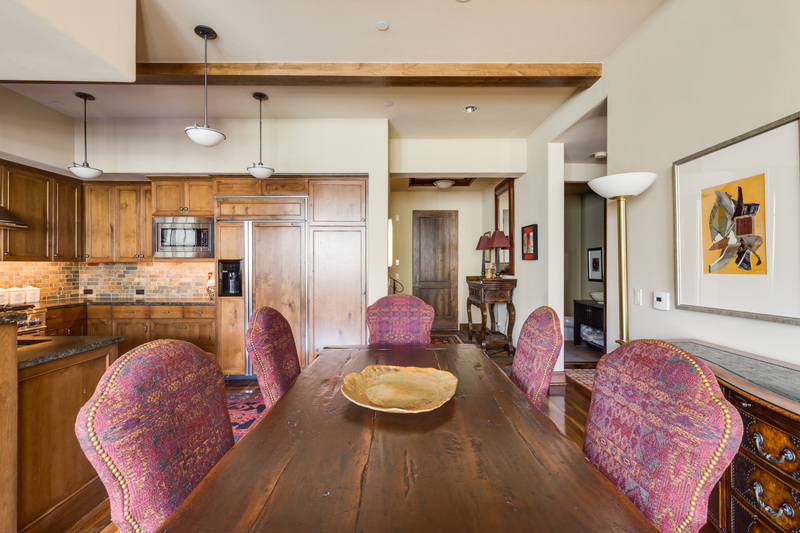 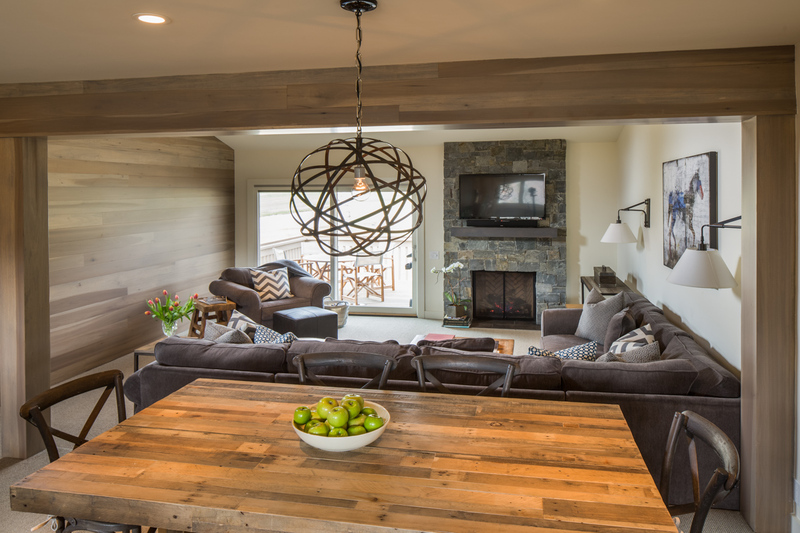 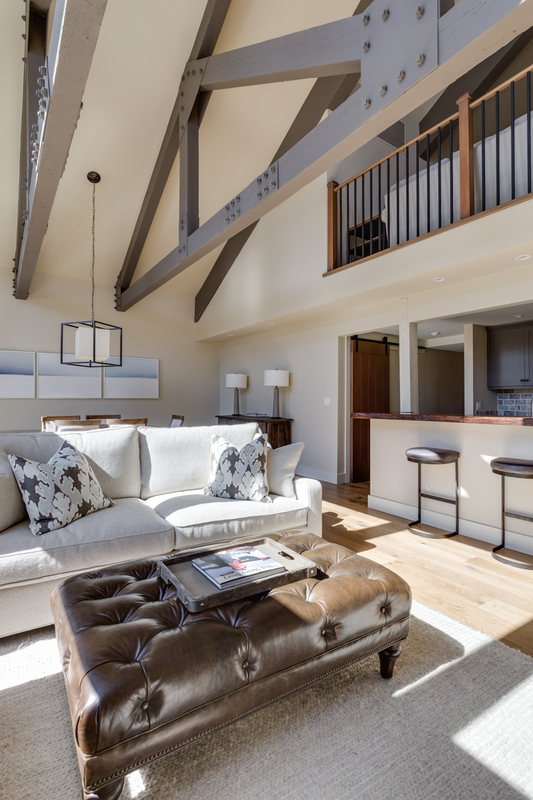 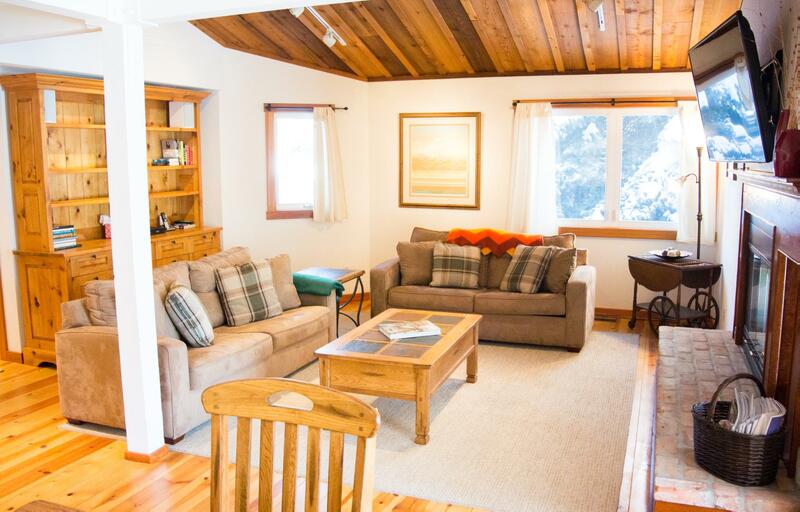 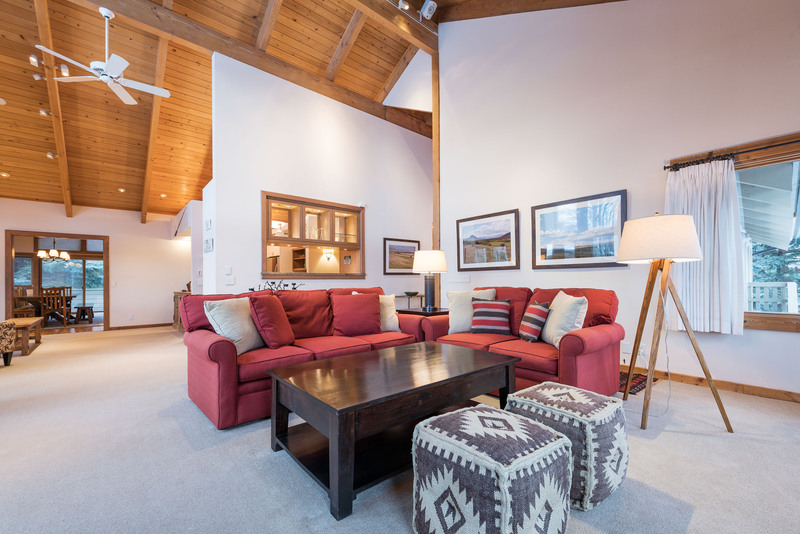 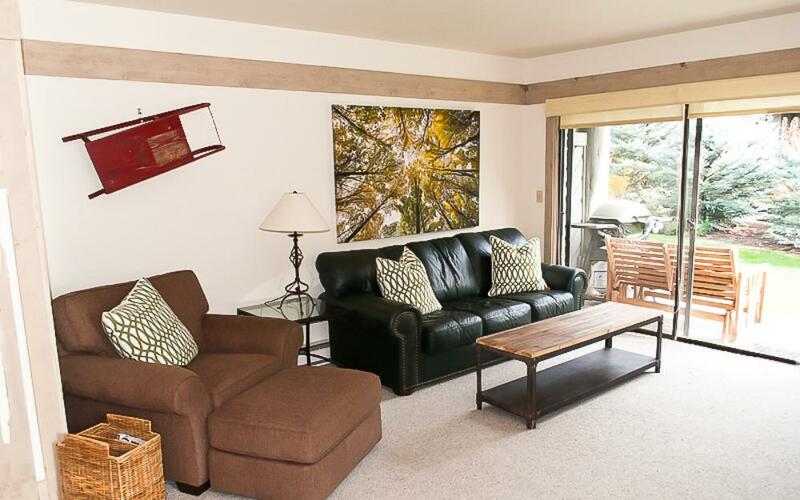 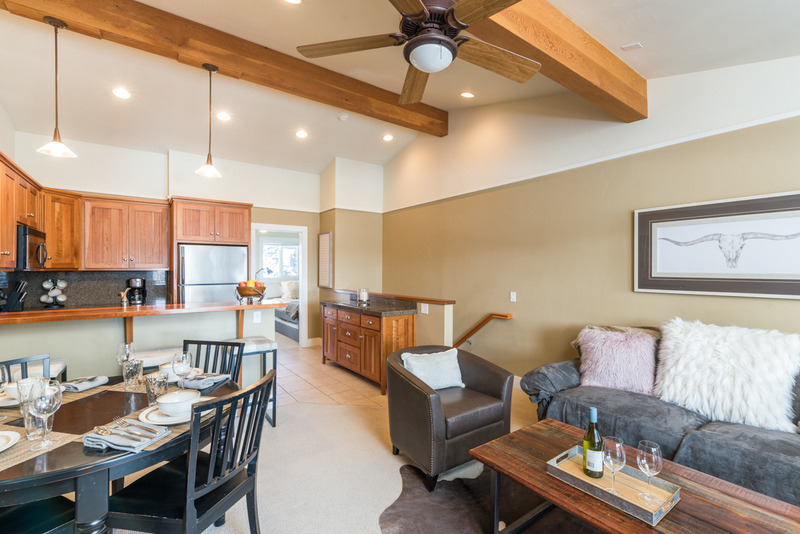 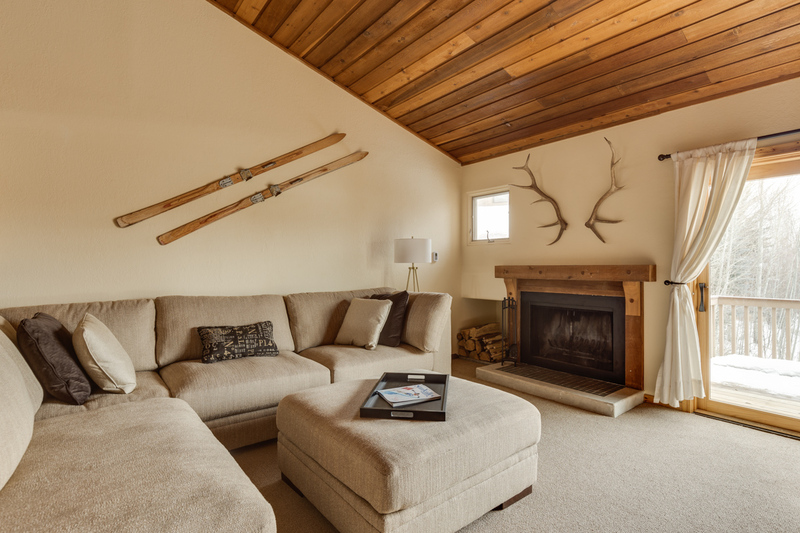 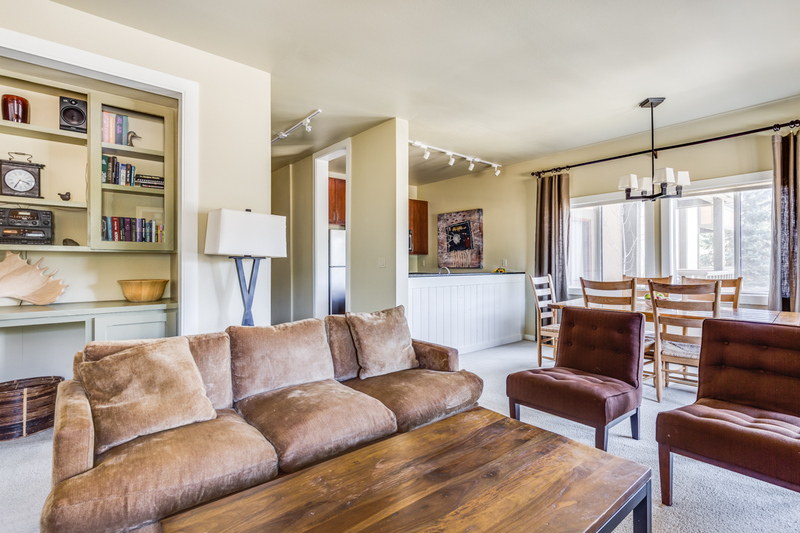 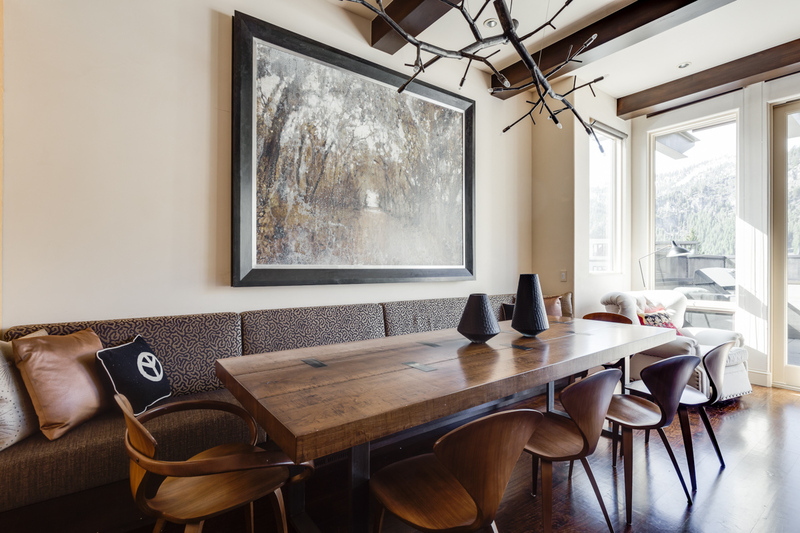 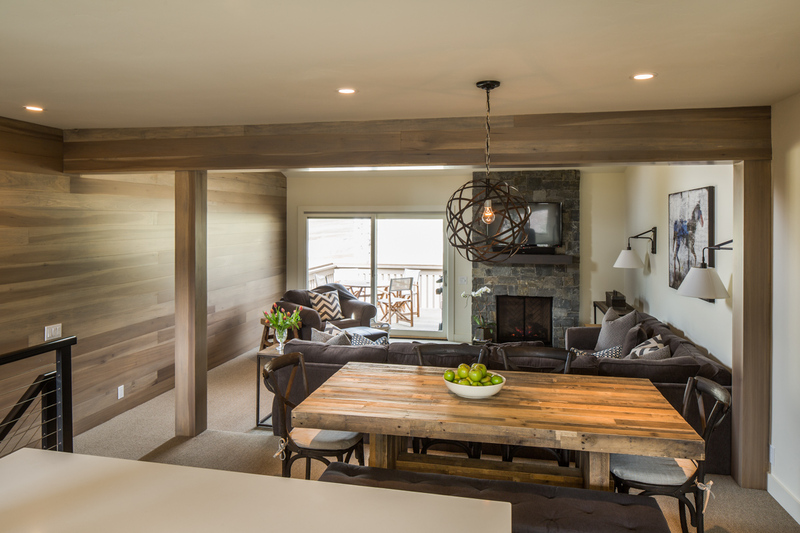 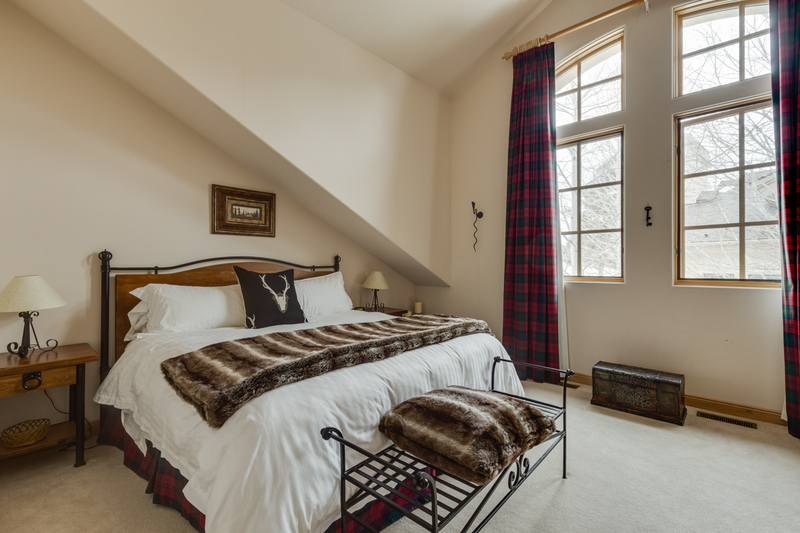 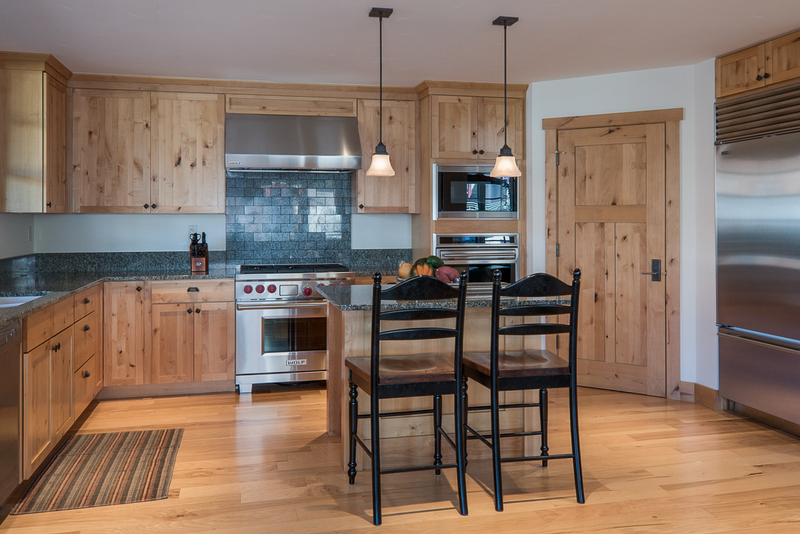 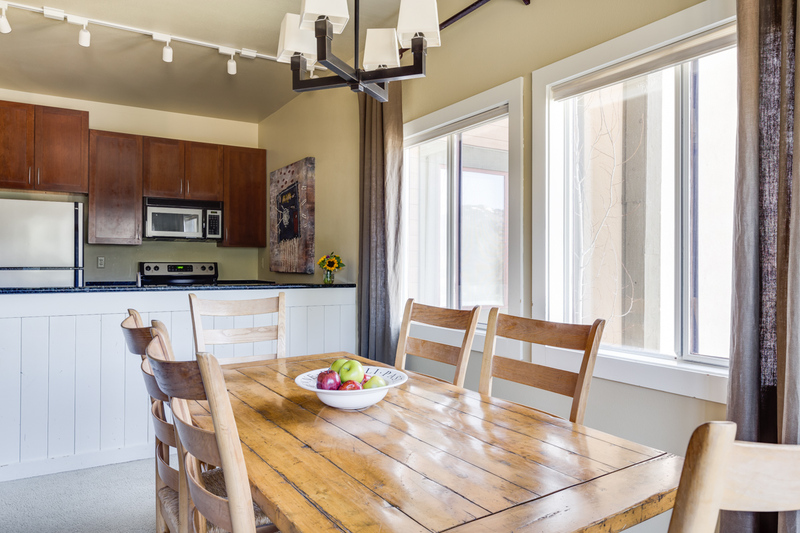 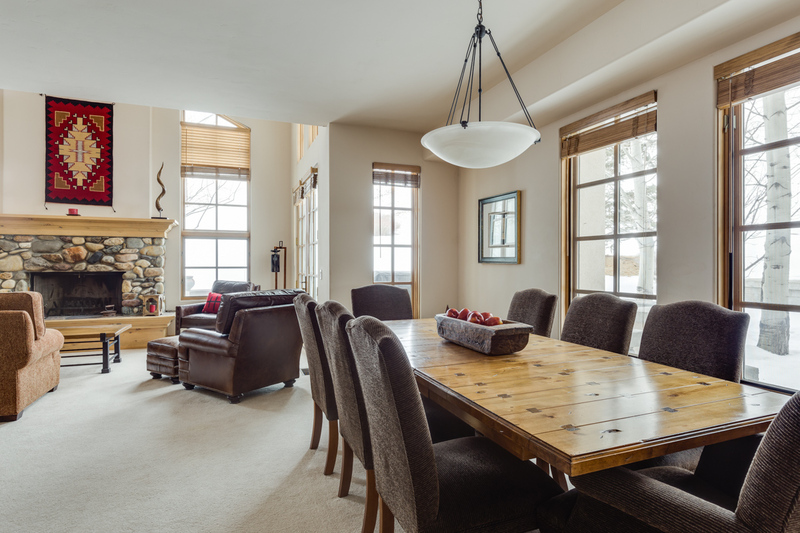 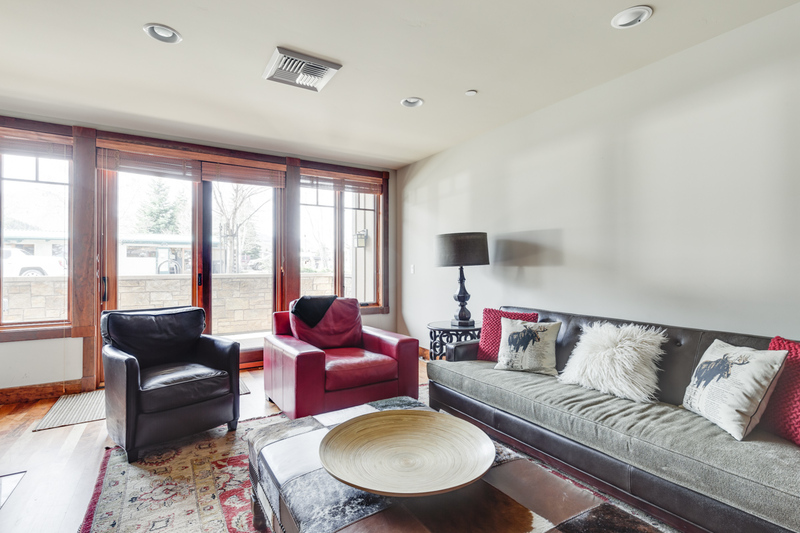 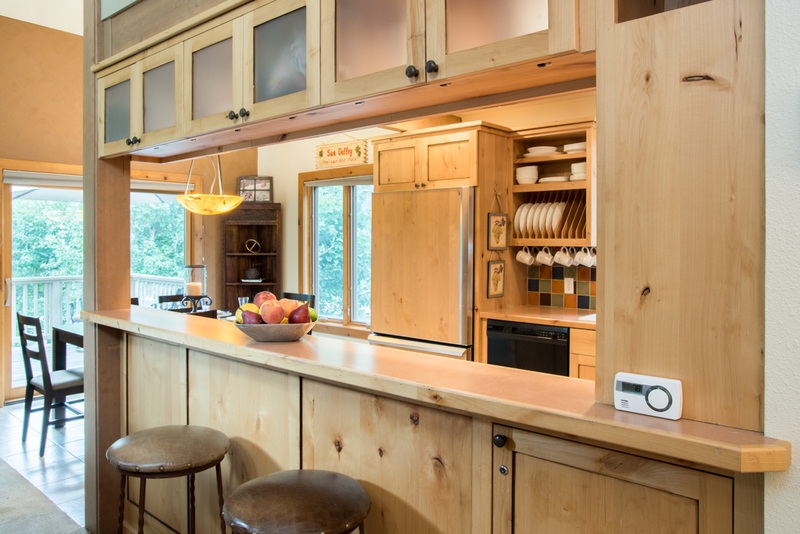 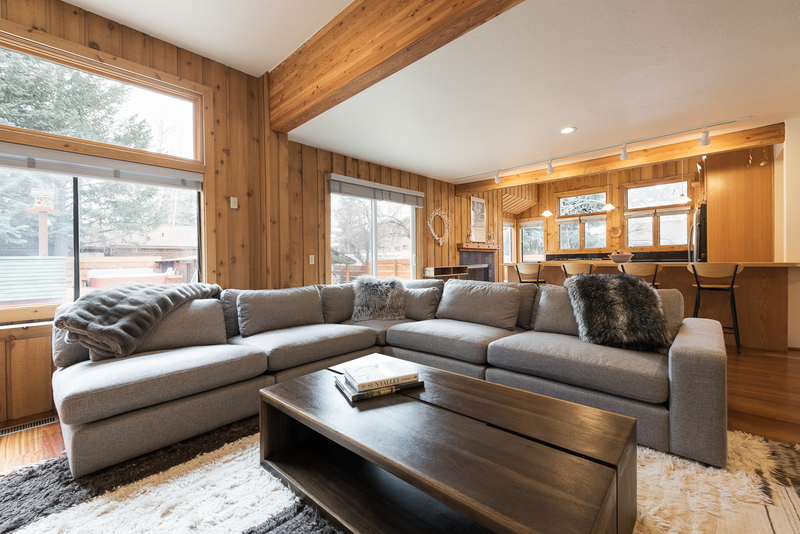 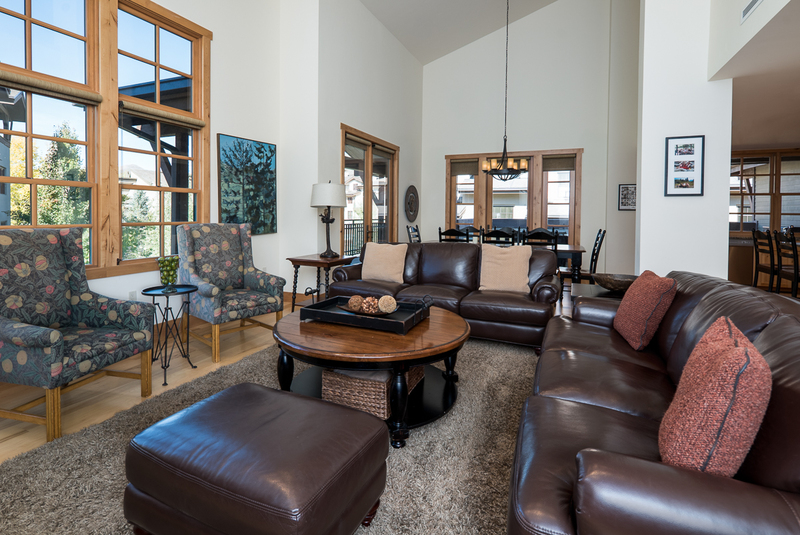 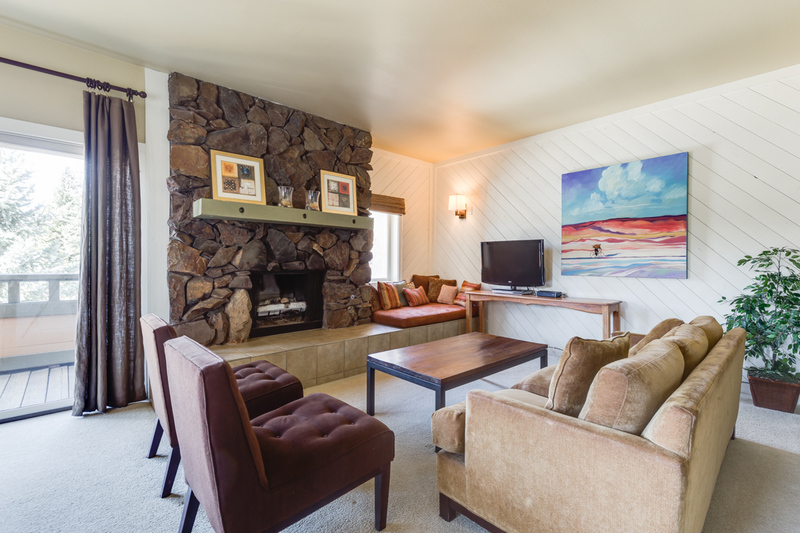 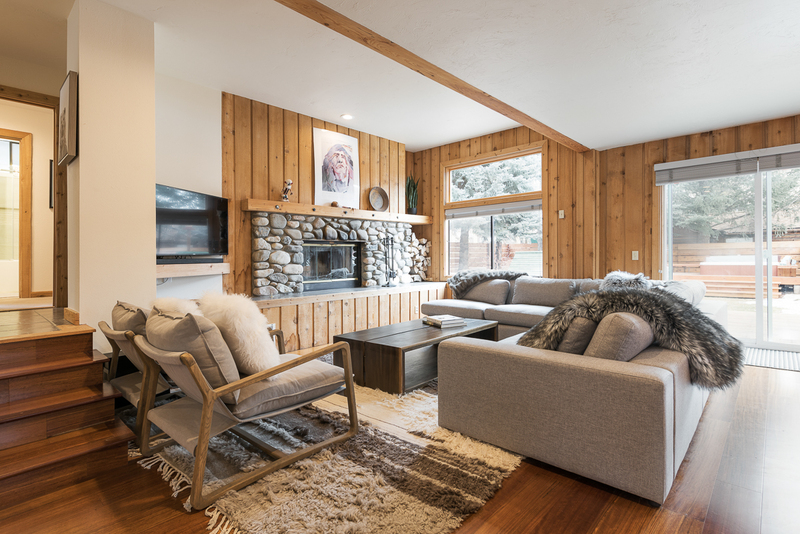 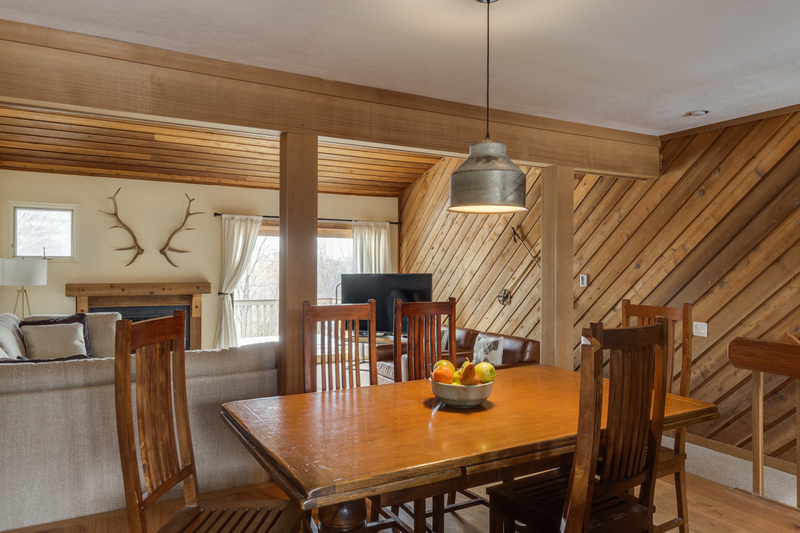 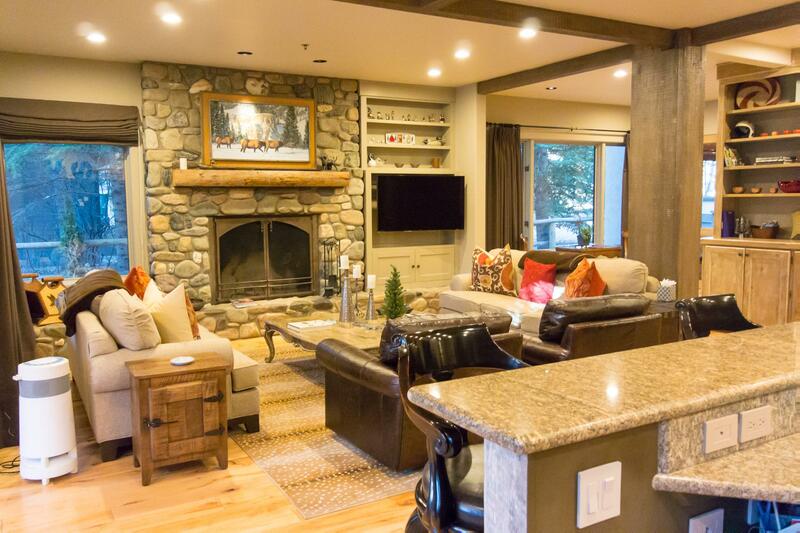 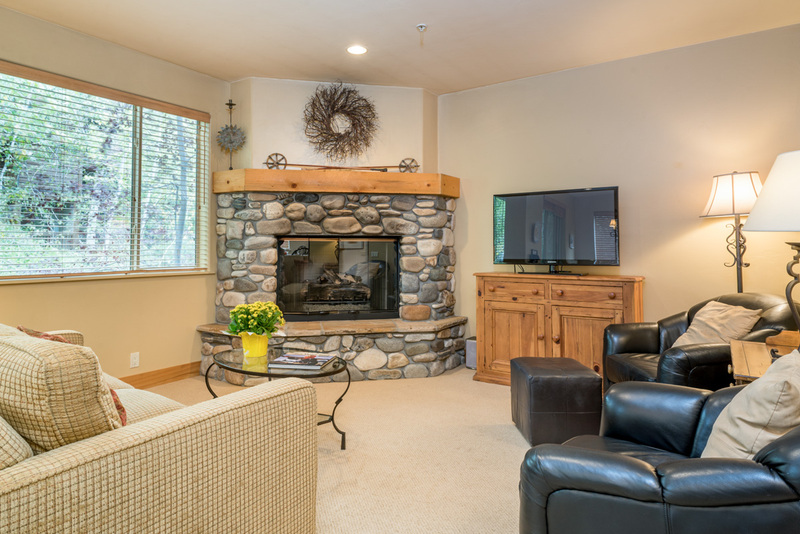 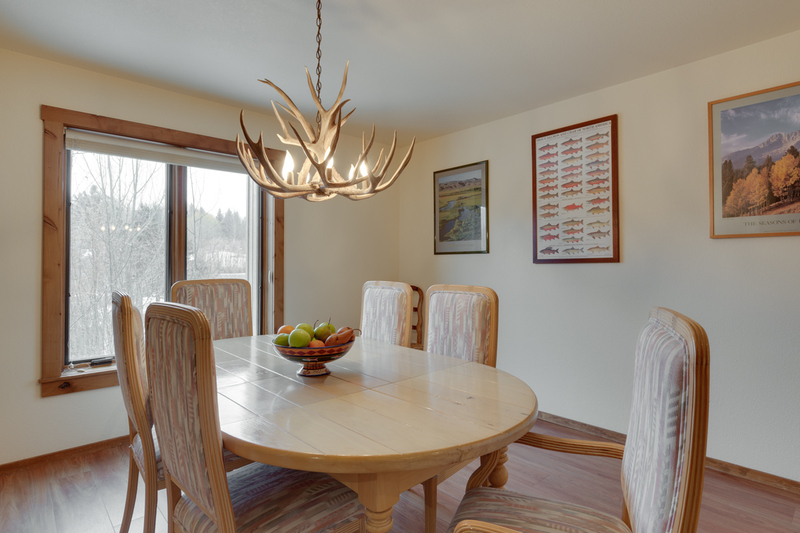 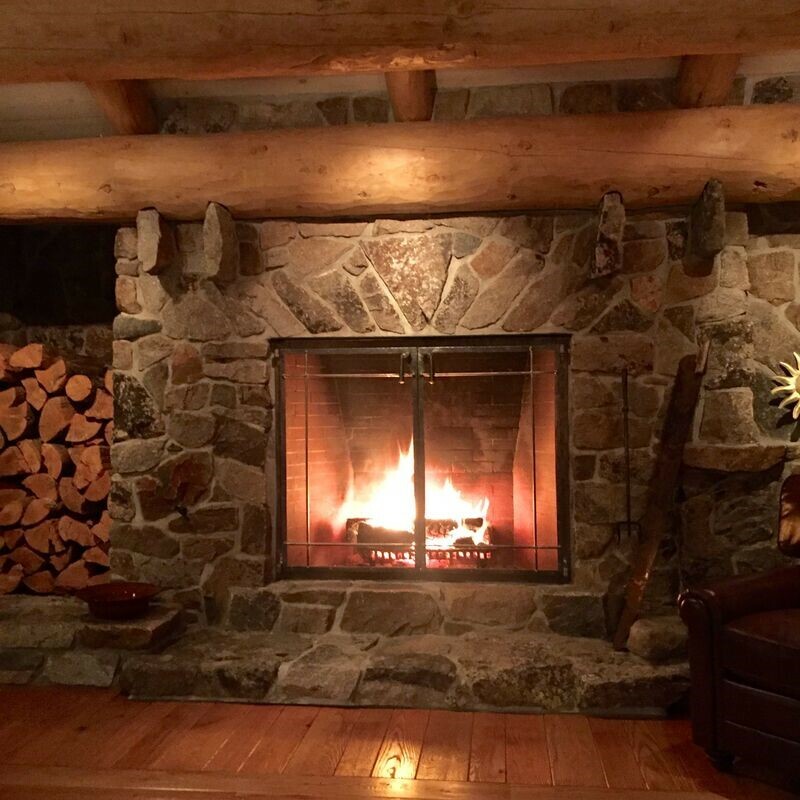 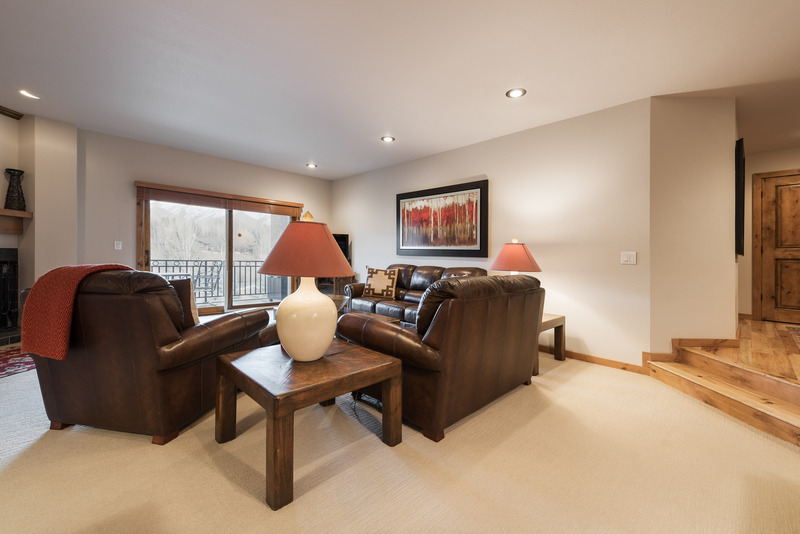 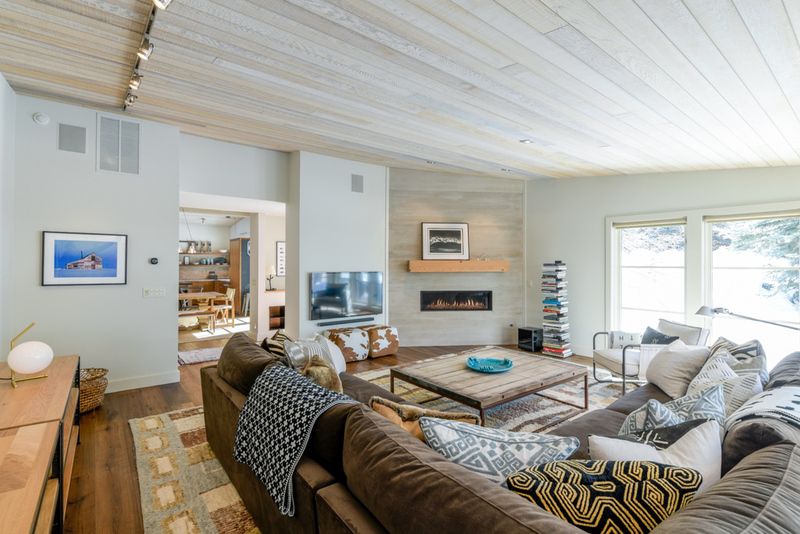 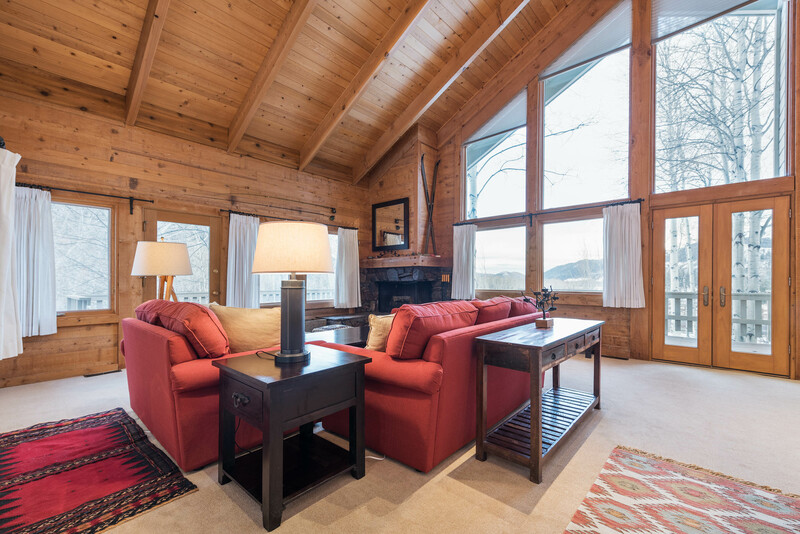 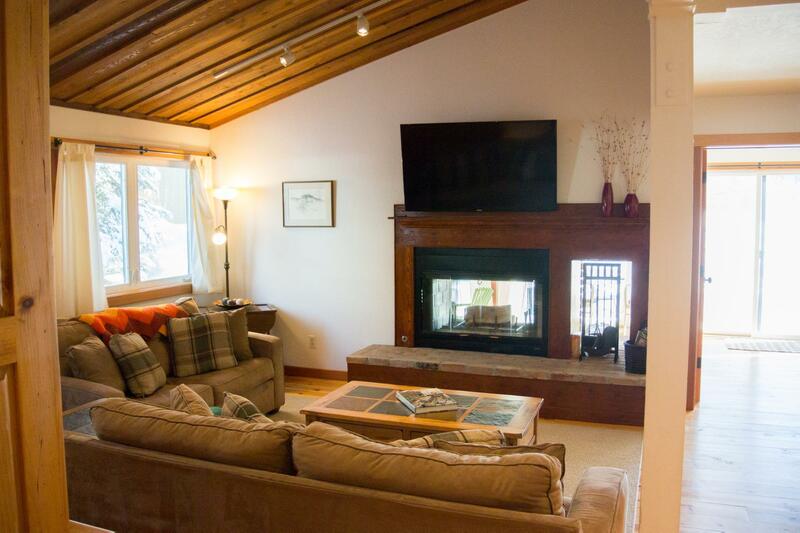 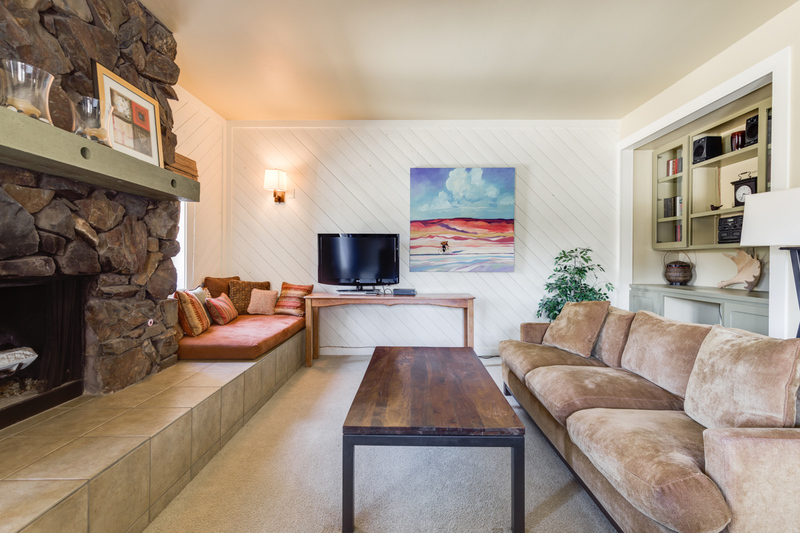 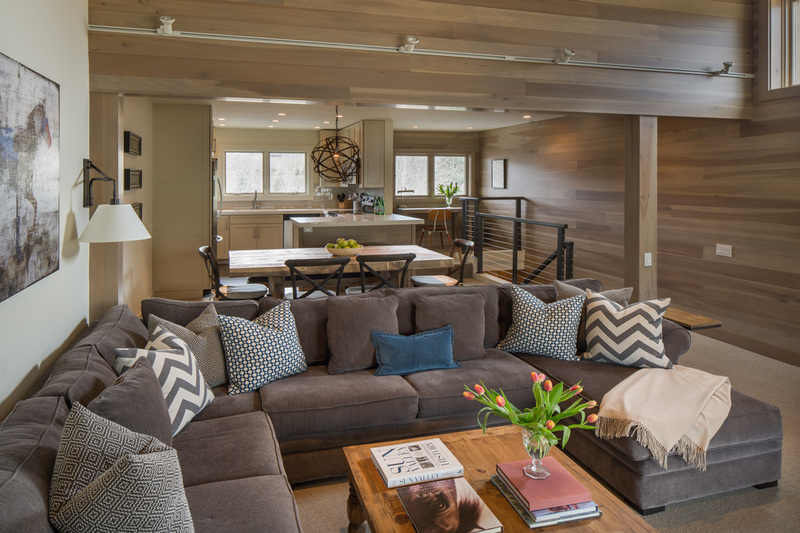 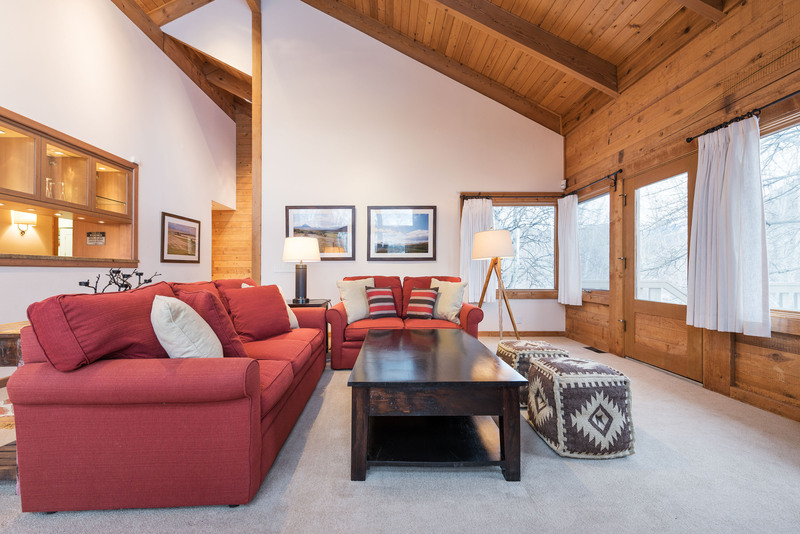 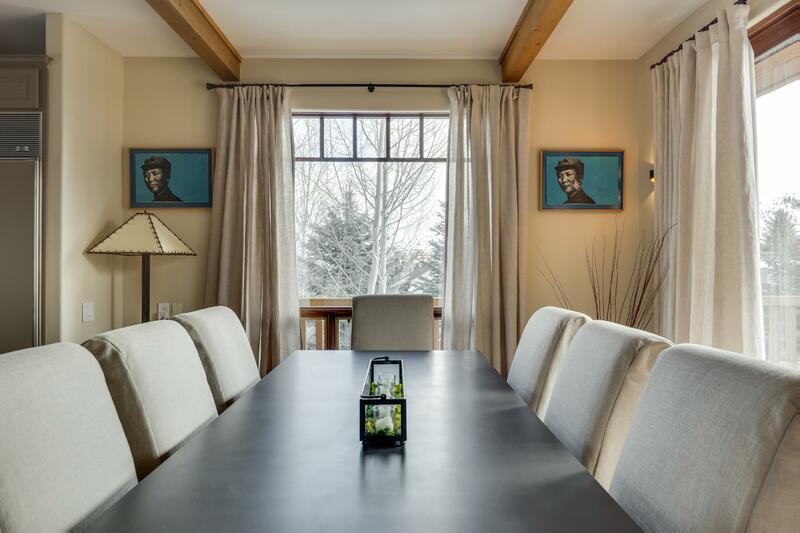 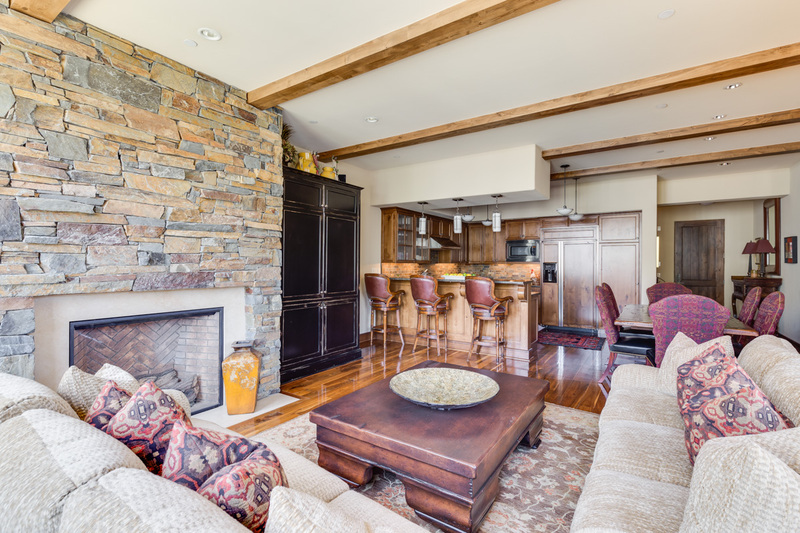 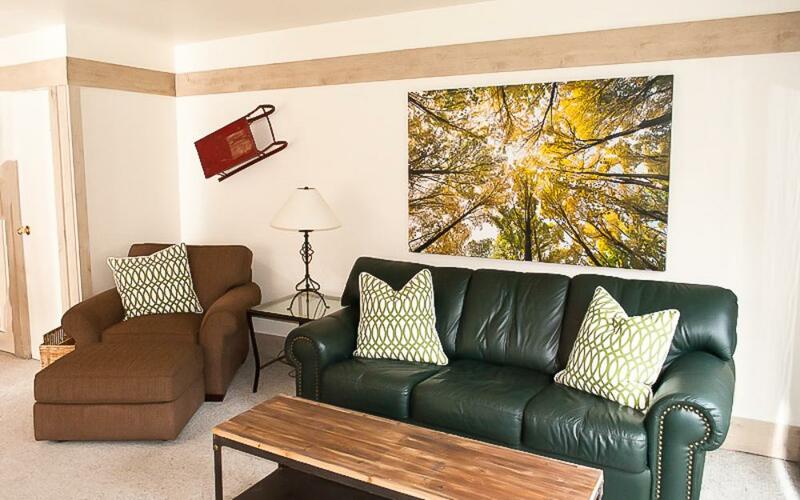 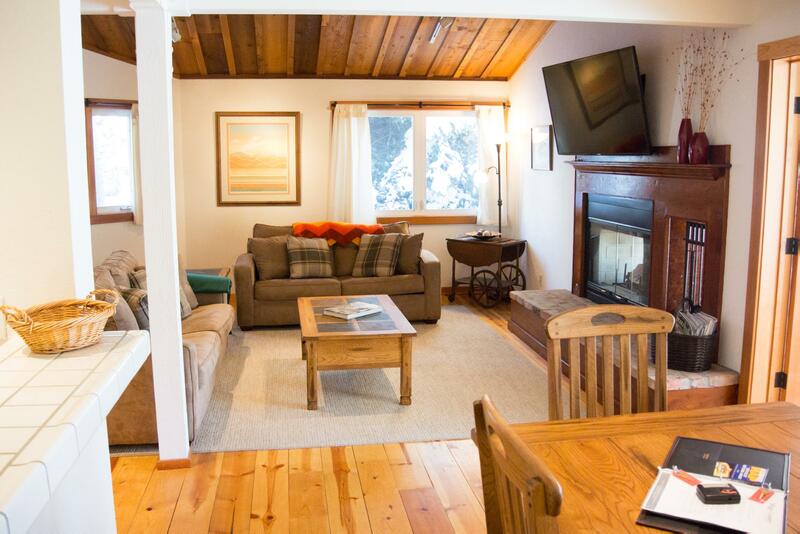 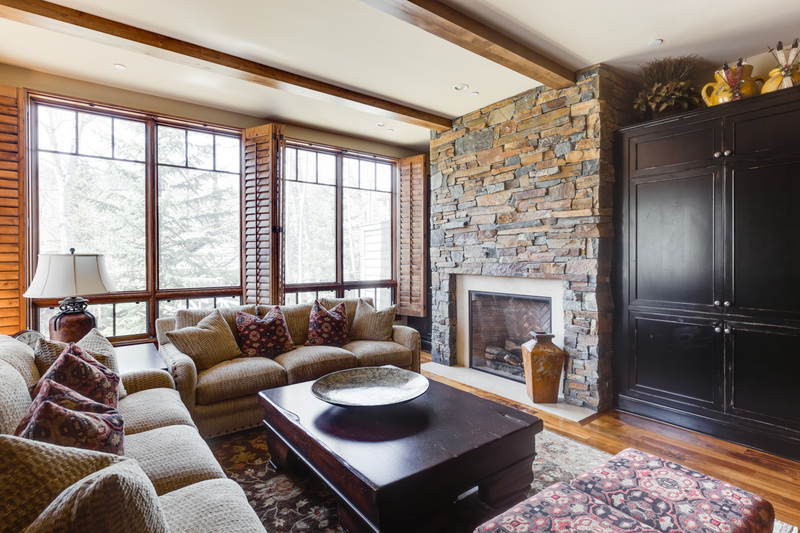 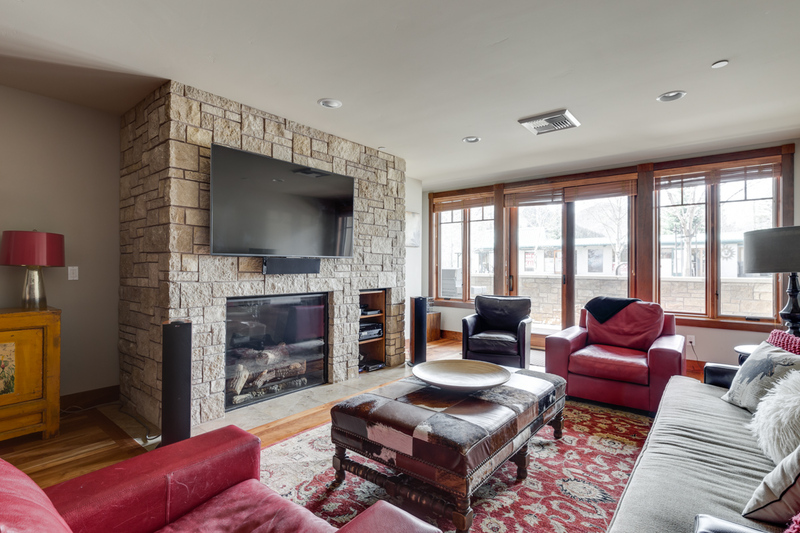 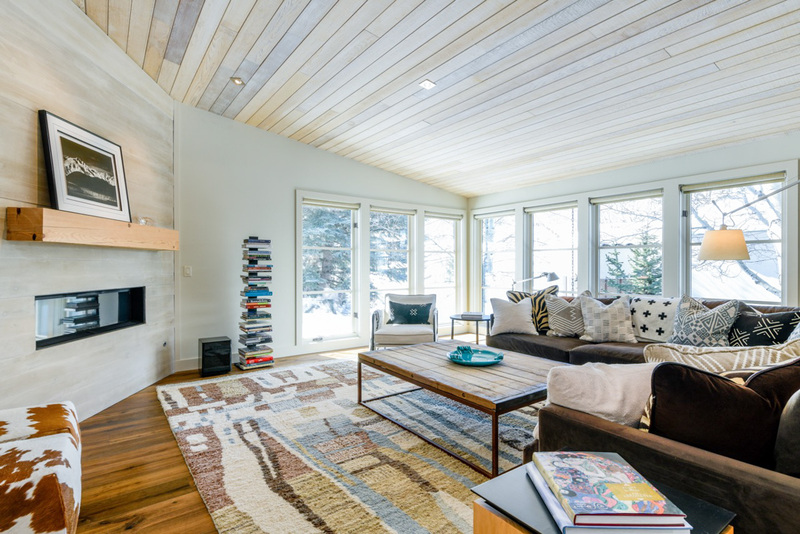 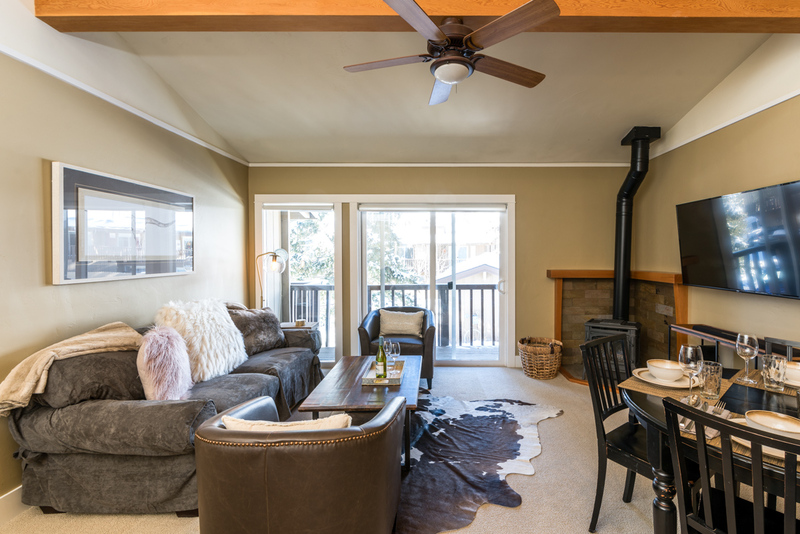 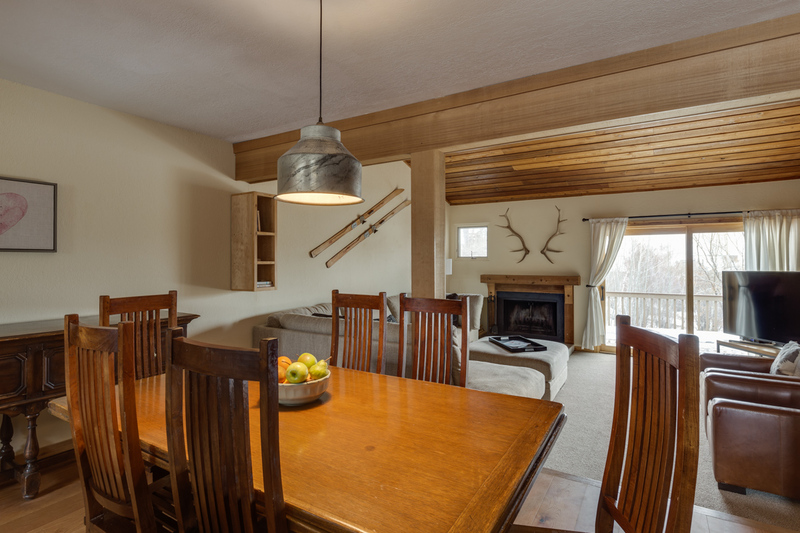 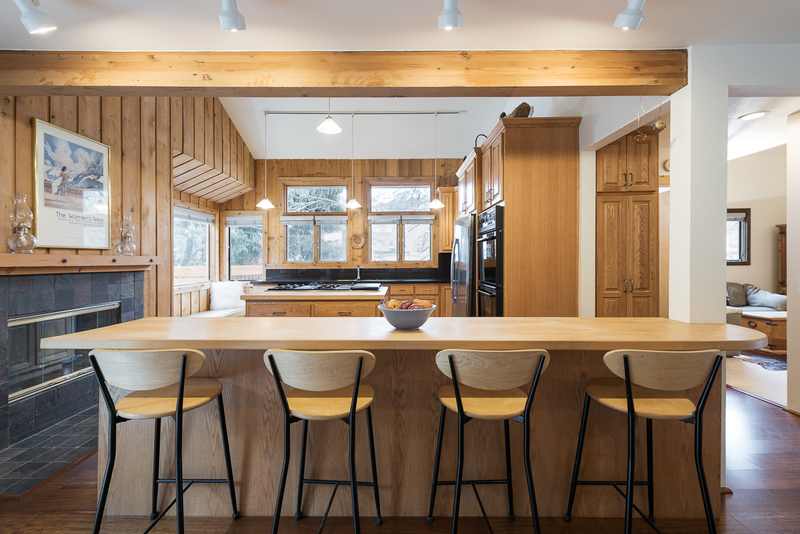 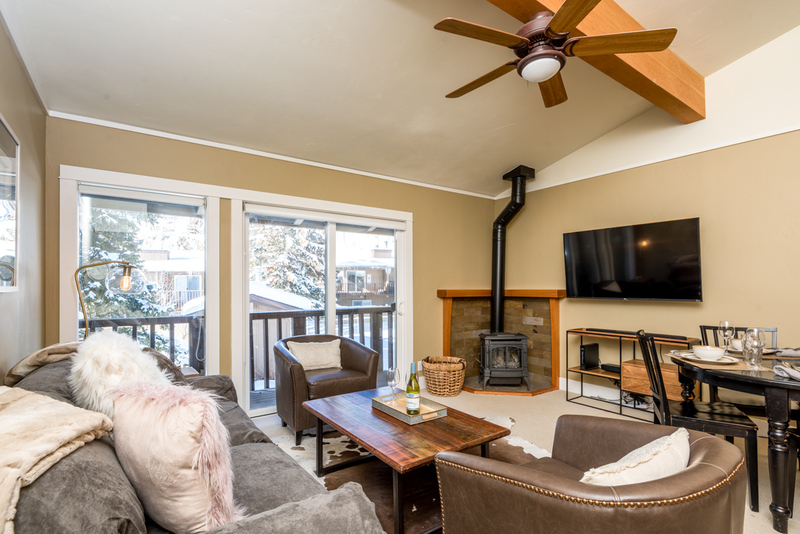 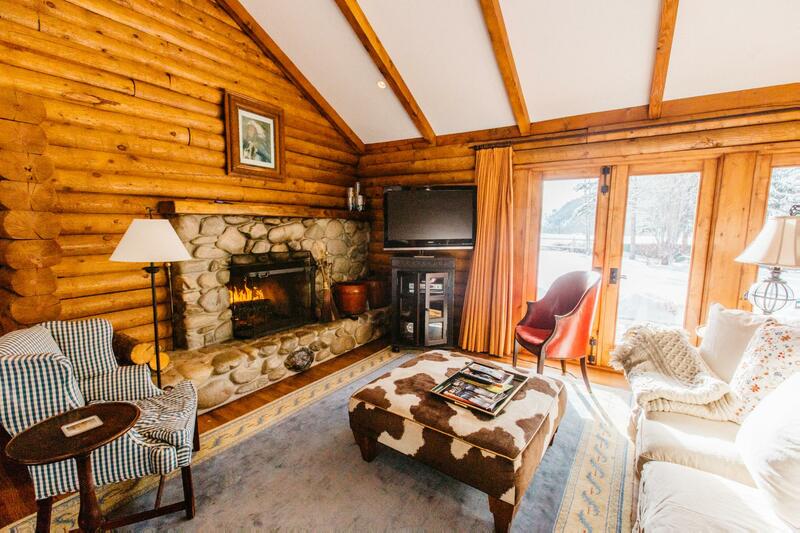 Our stylish Ketchum rentals range from modern condos a short stroll from downtown with rooftop hot tubs and views of Bald Mountain, contemporary mountain homes with media rooms and wrap-around decks, and charming lodge condos with wood-burning fireplaces. 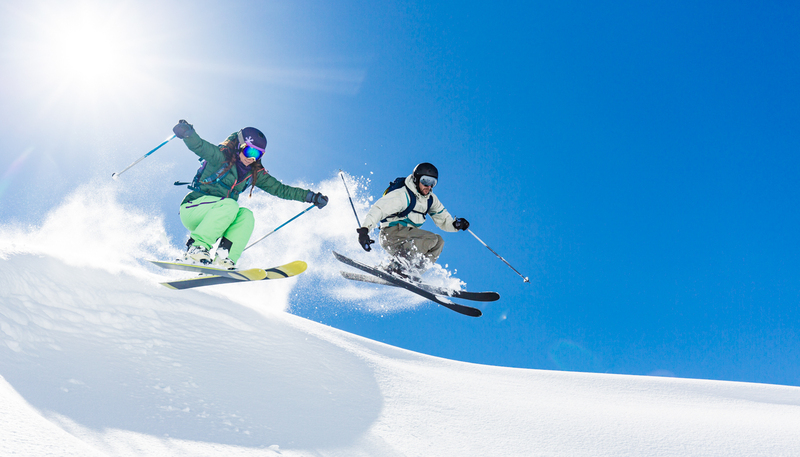 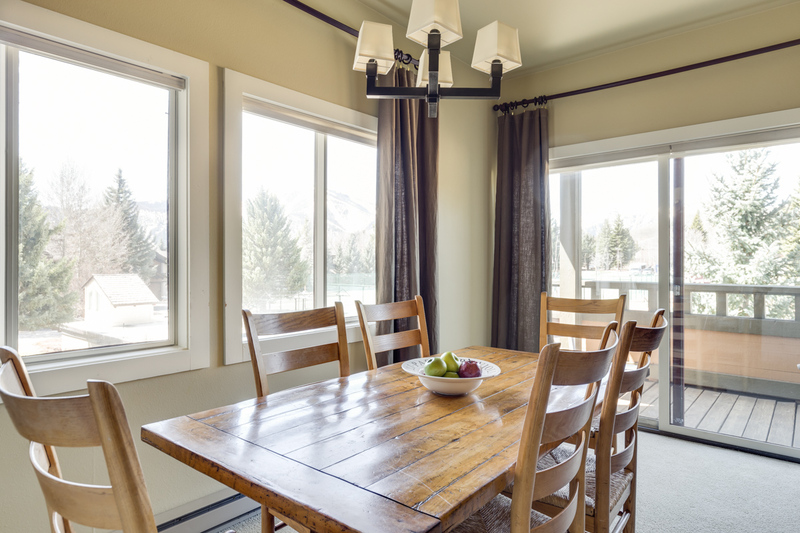 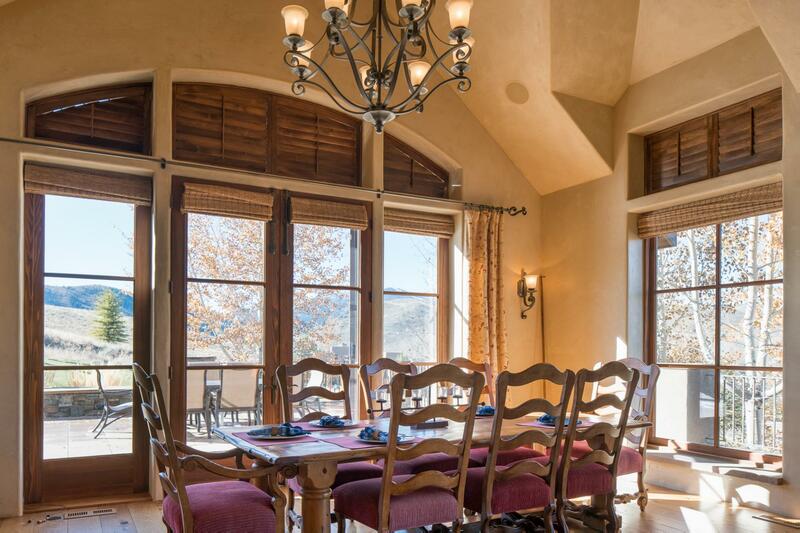 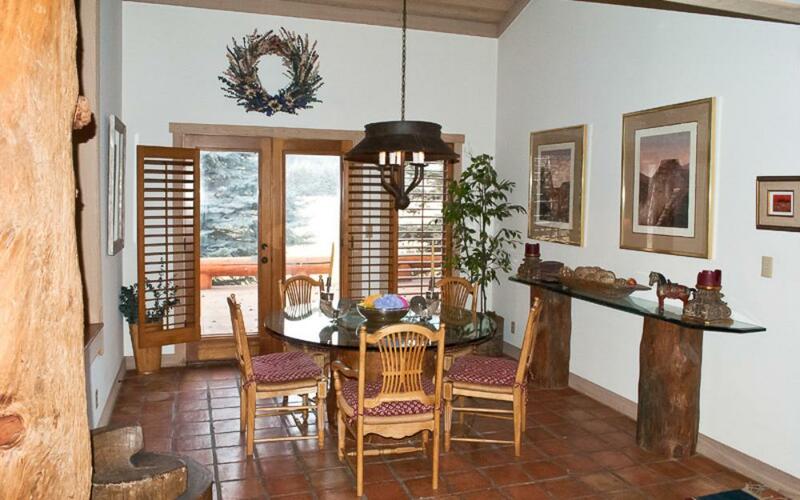 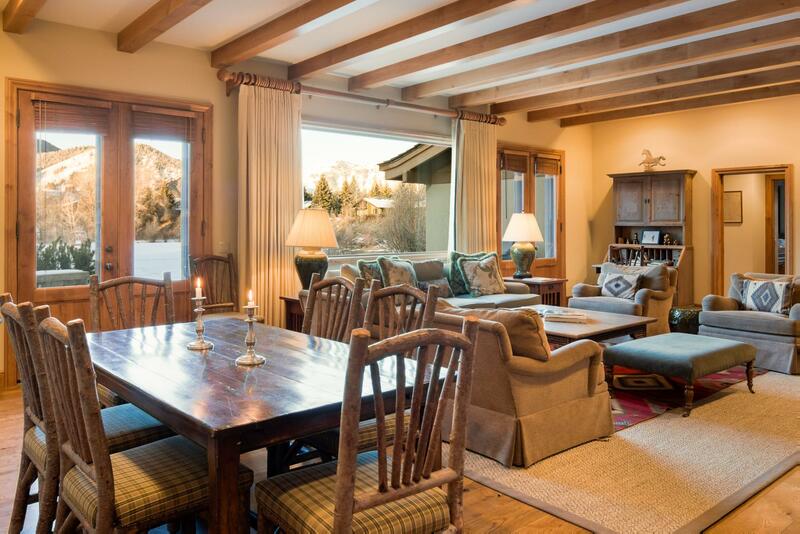 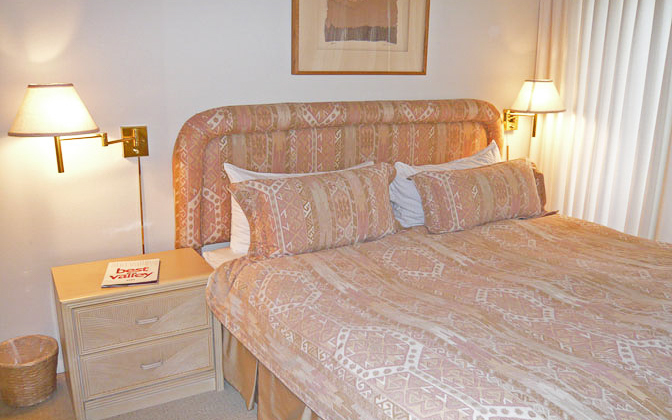 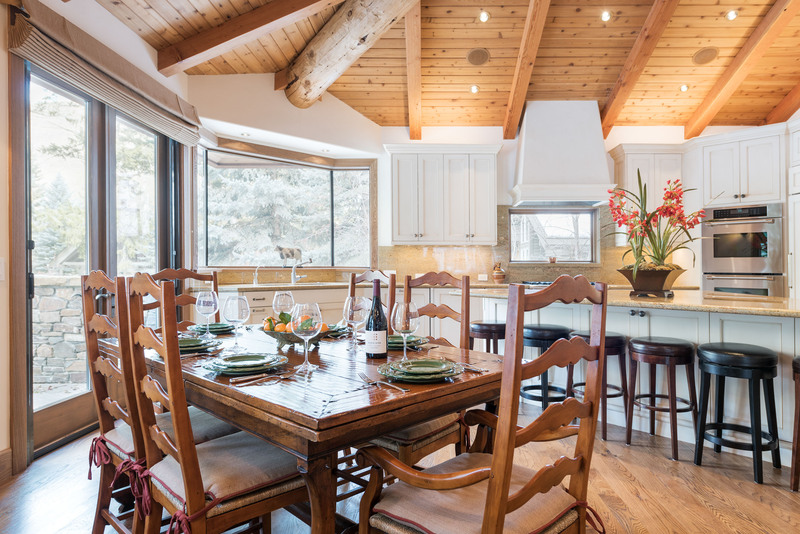 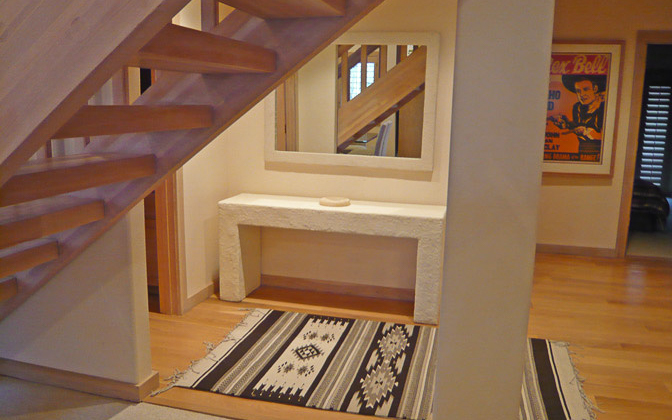 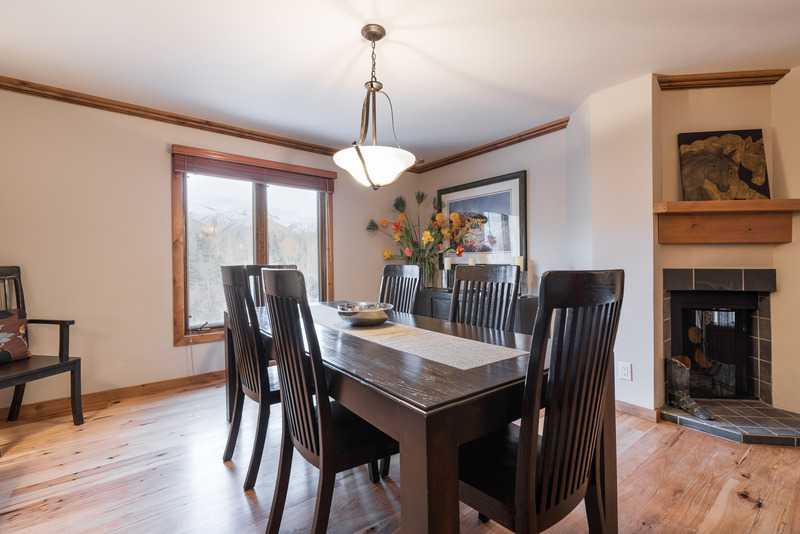 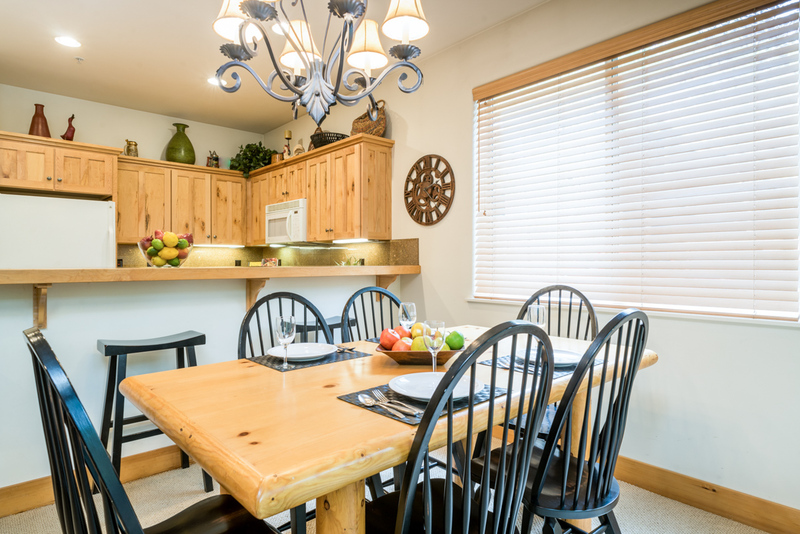 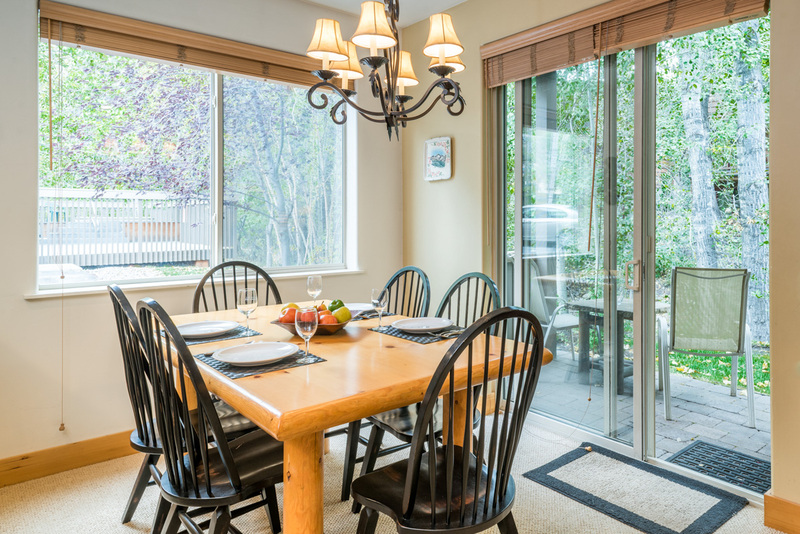 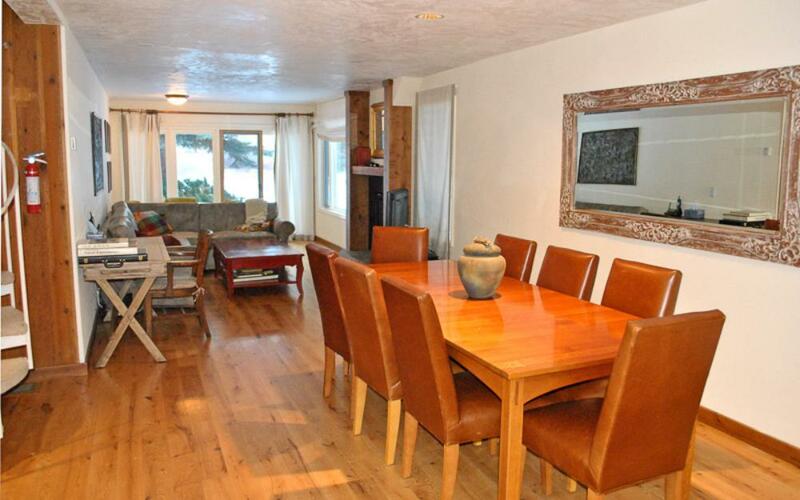 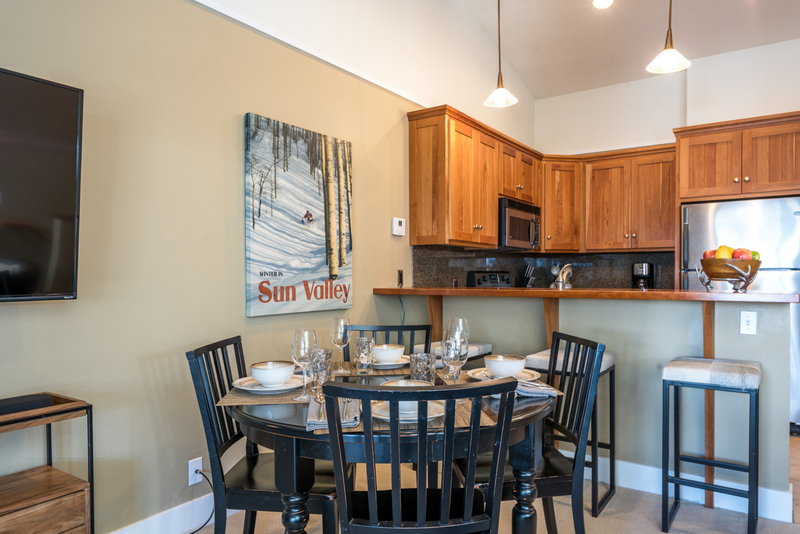 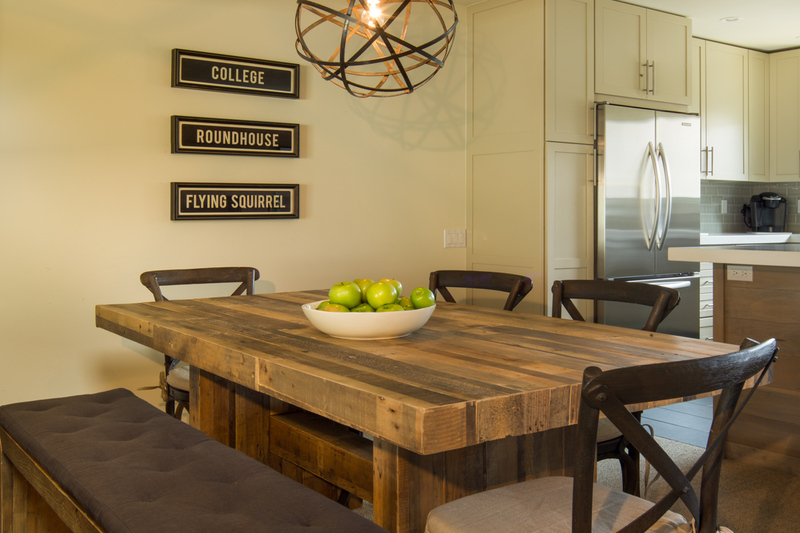 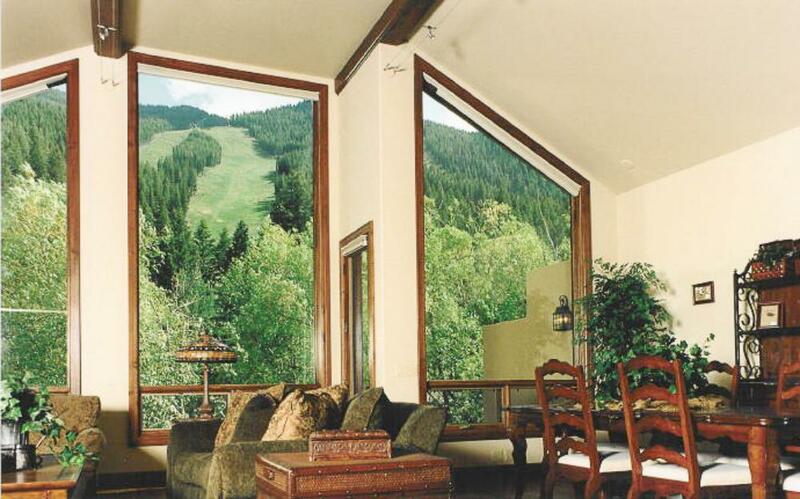 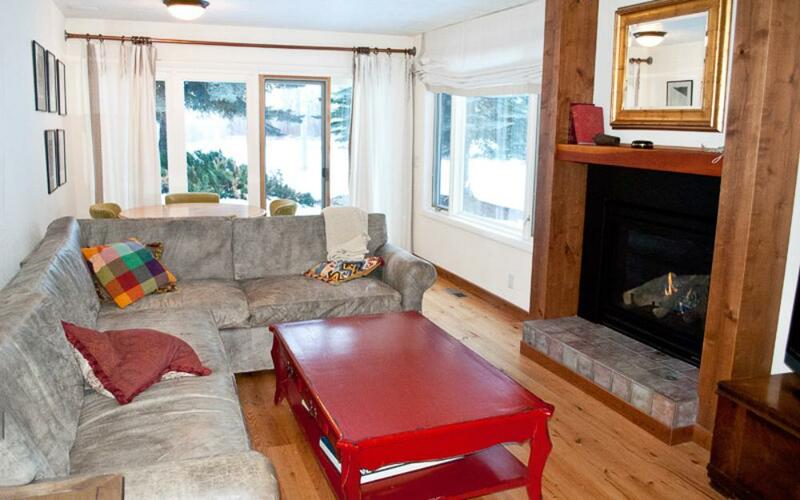 All Ketchum vacation rentals offer shuttle access to the slopes. 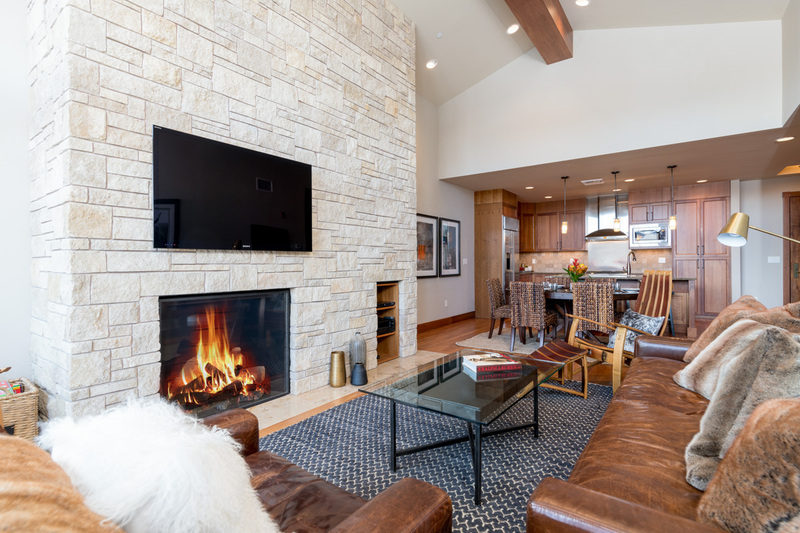 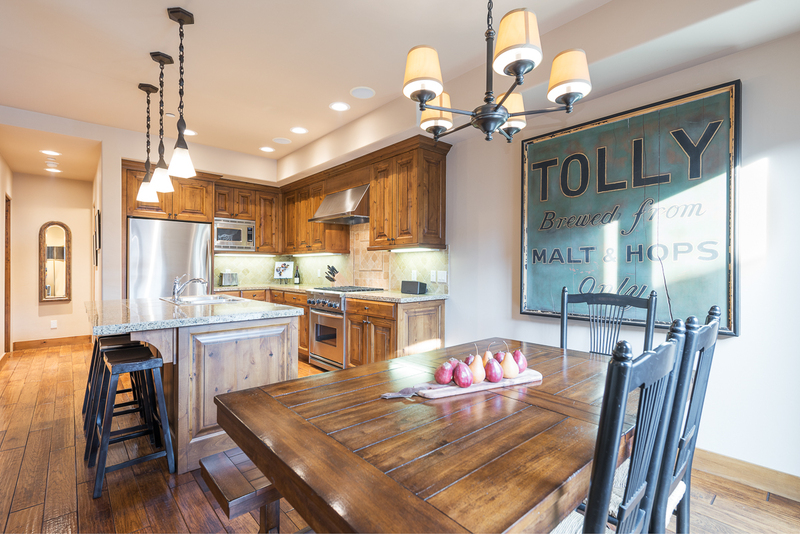 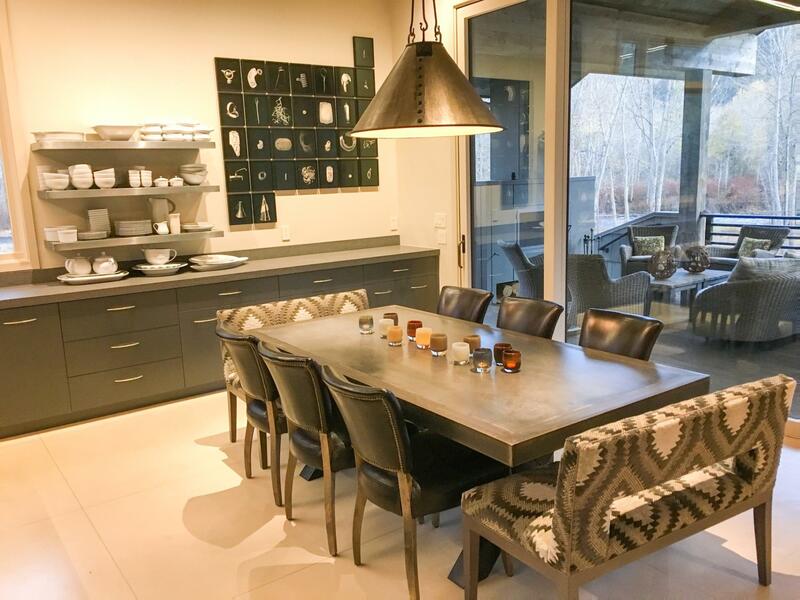 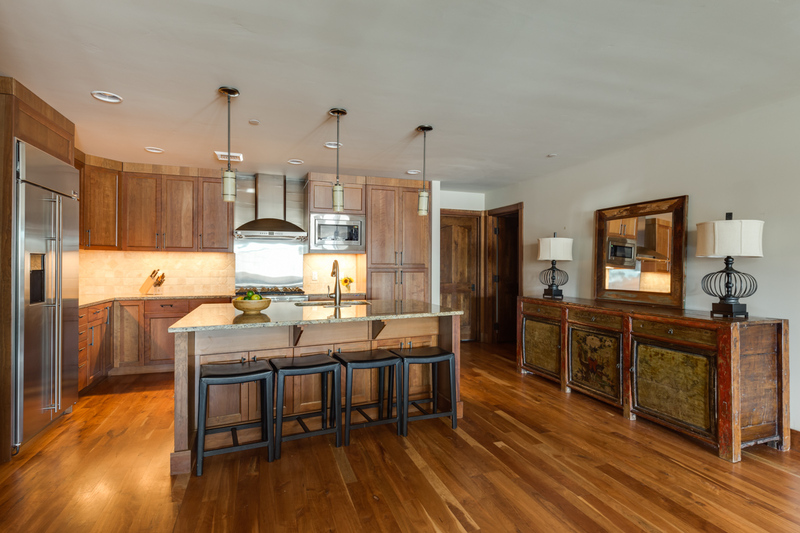 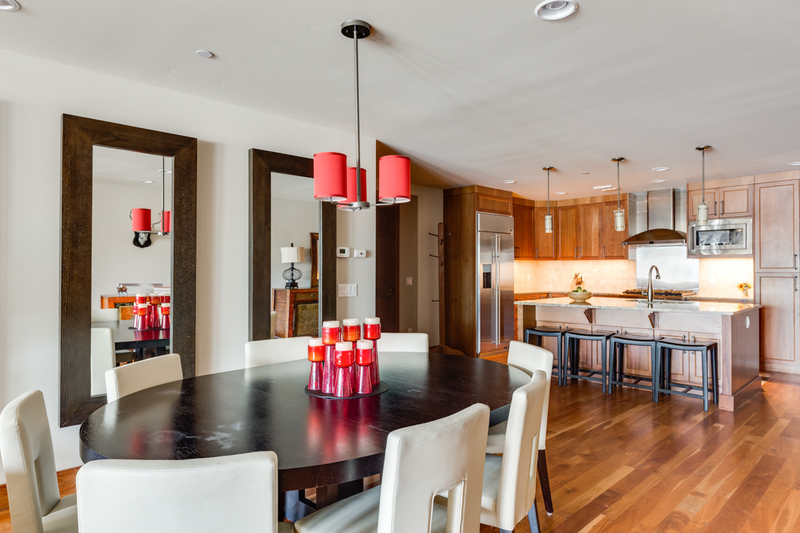 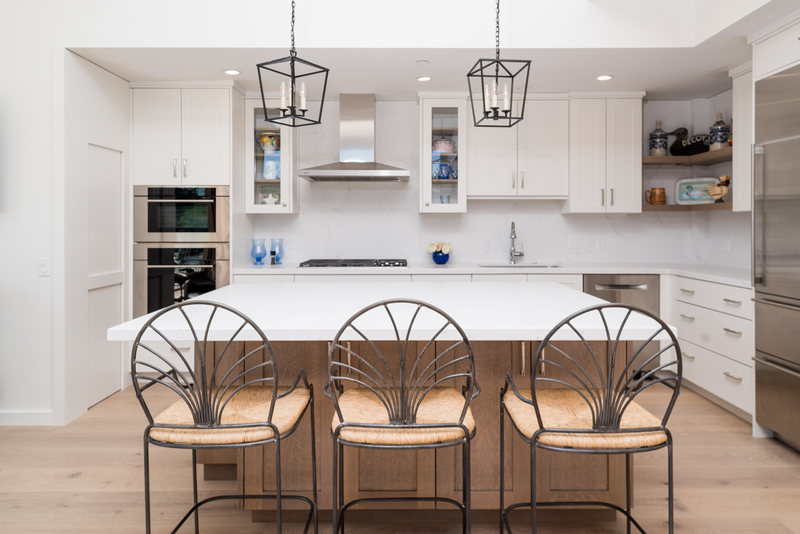 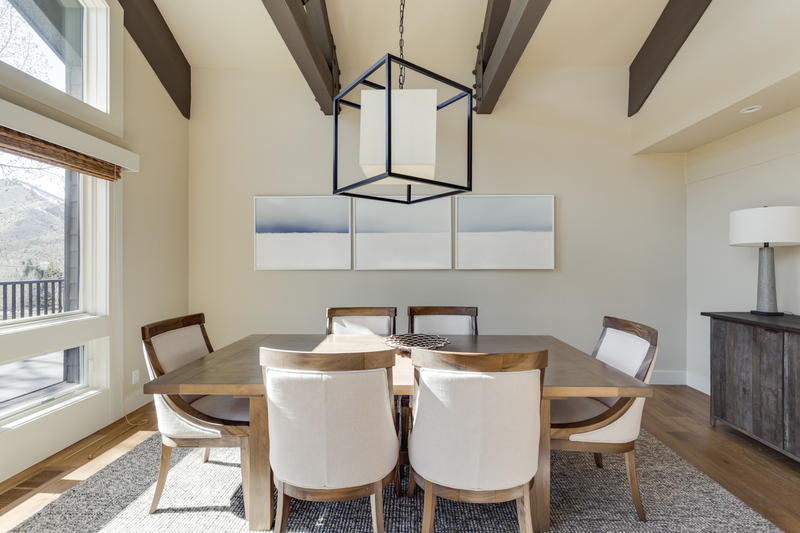 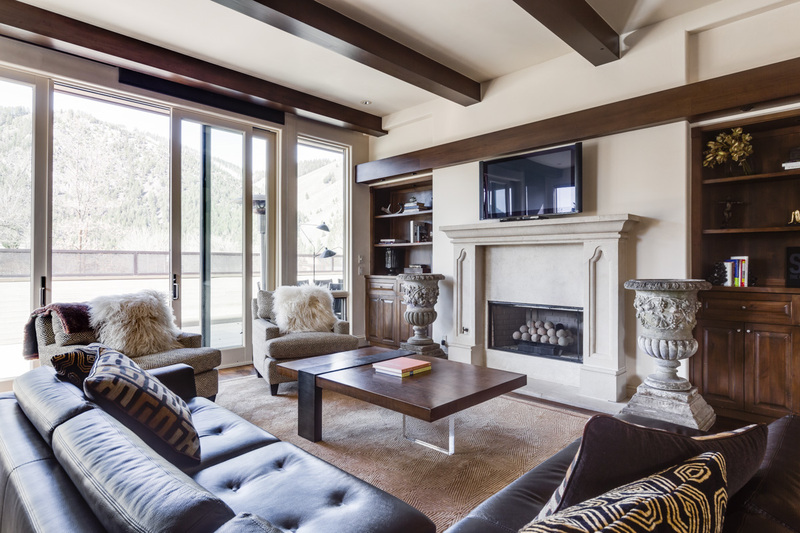 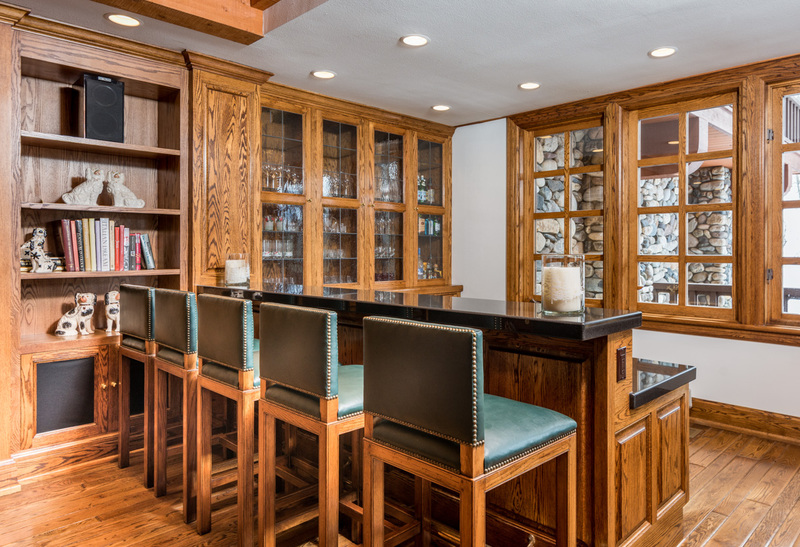 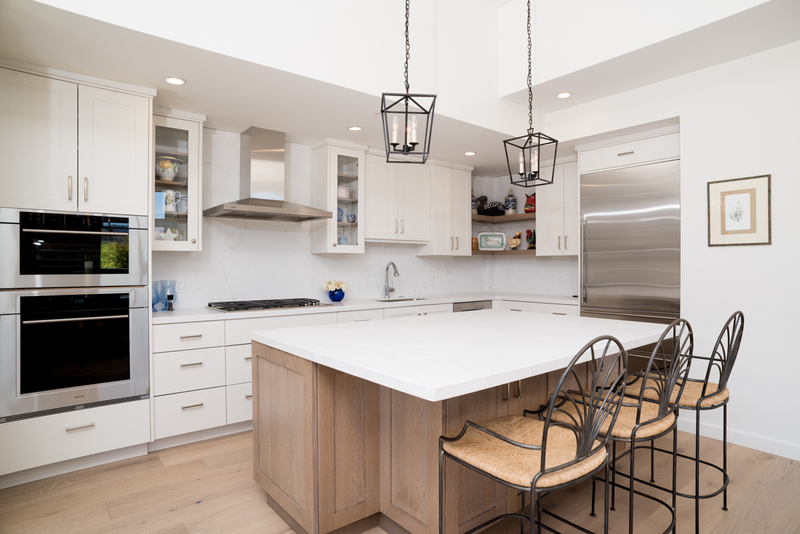 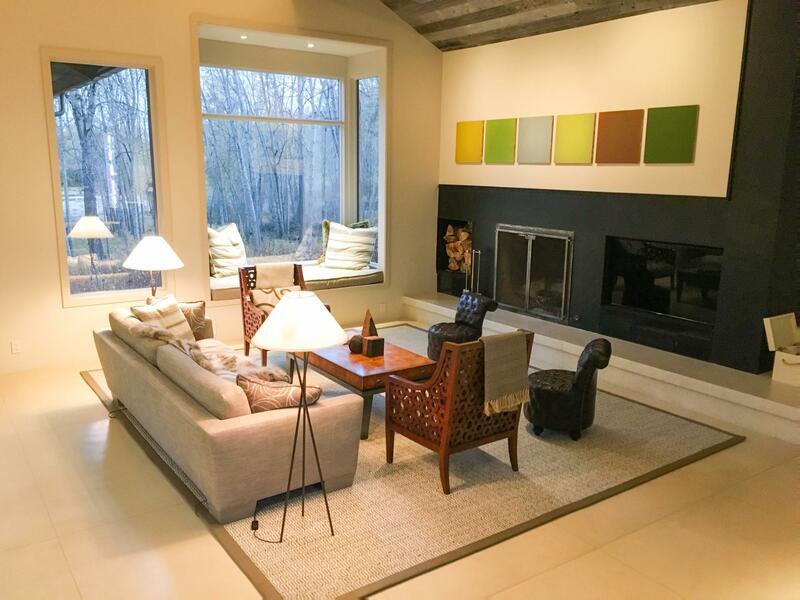 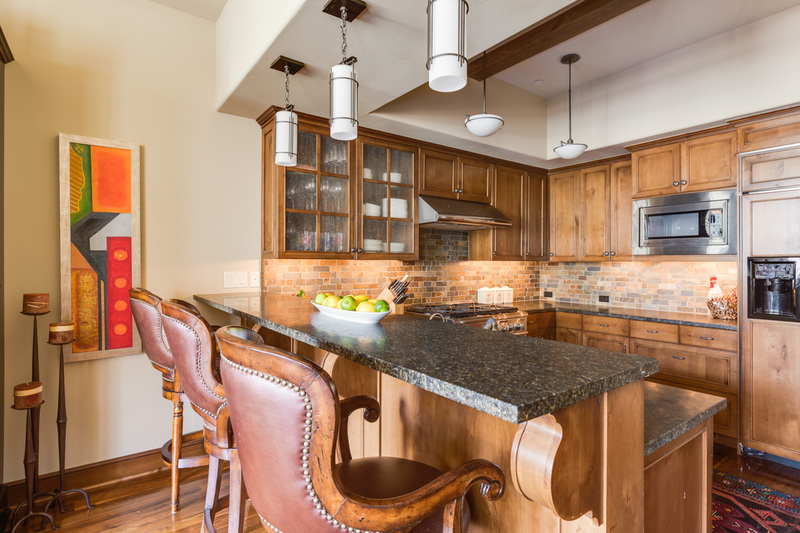 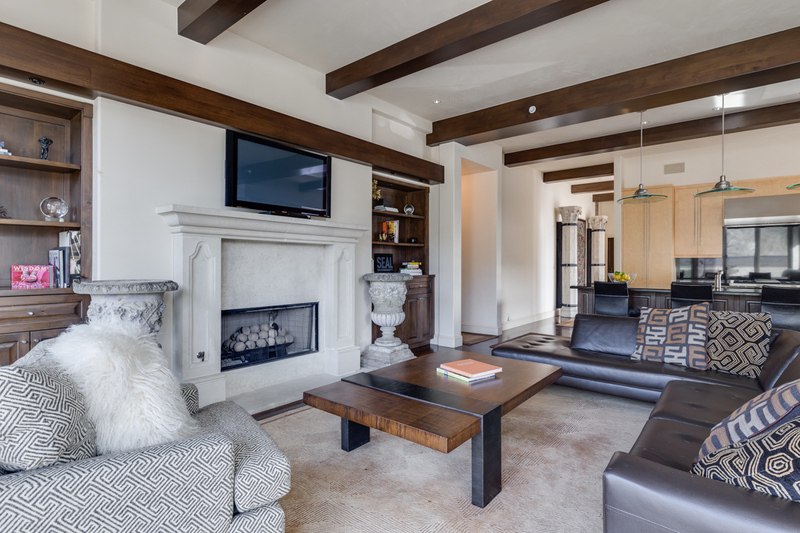 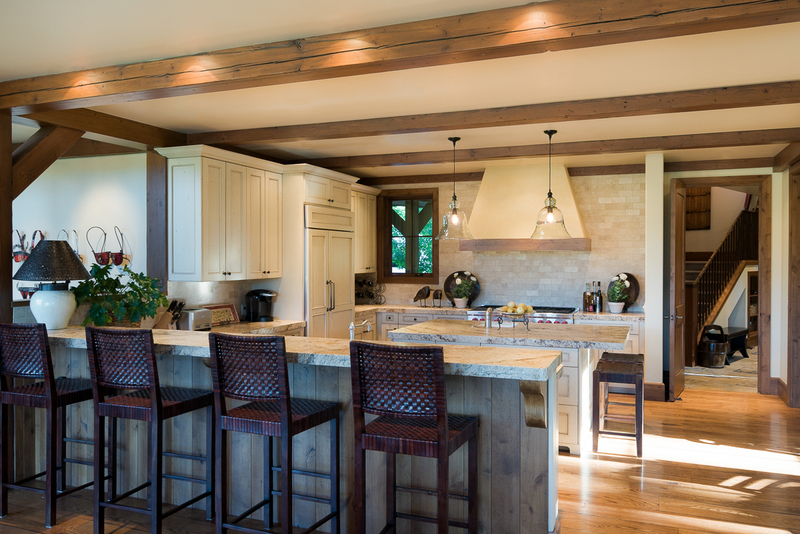 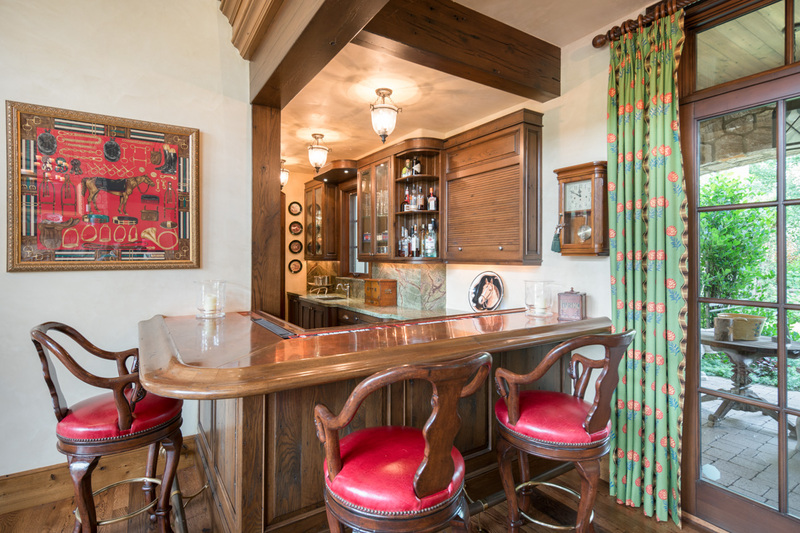 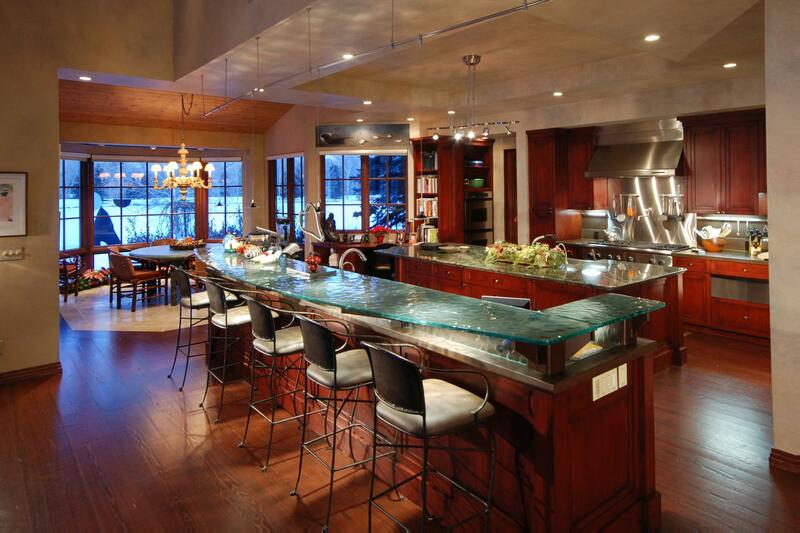 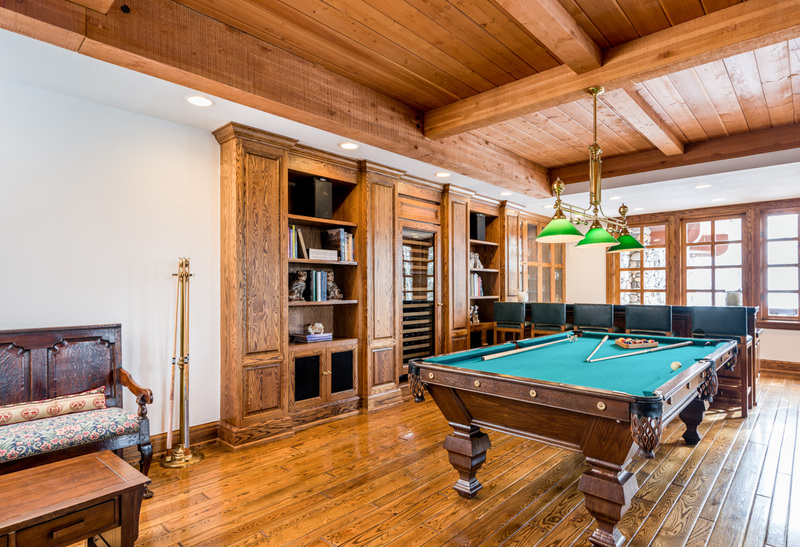 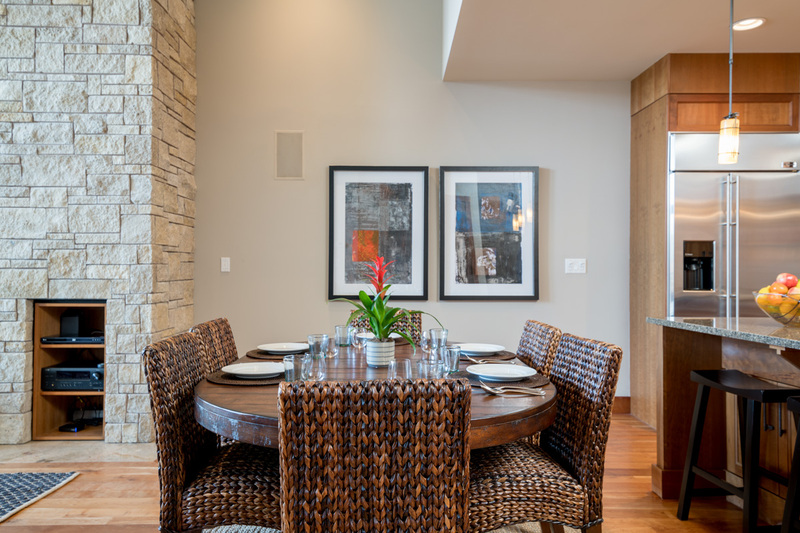 Located in the hills above Ketchum, the high-end Elkhorn development offers well-appointed condos, townhouses, and private homes with and clubhouse amenities, including a community hot tub, sauna, lounge, and summer-use swimming pool and tennis courts. 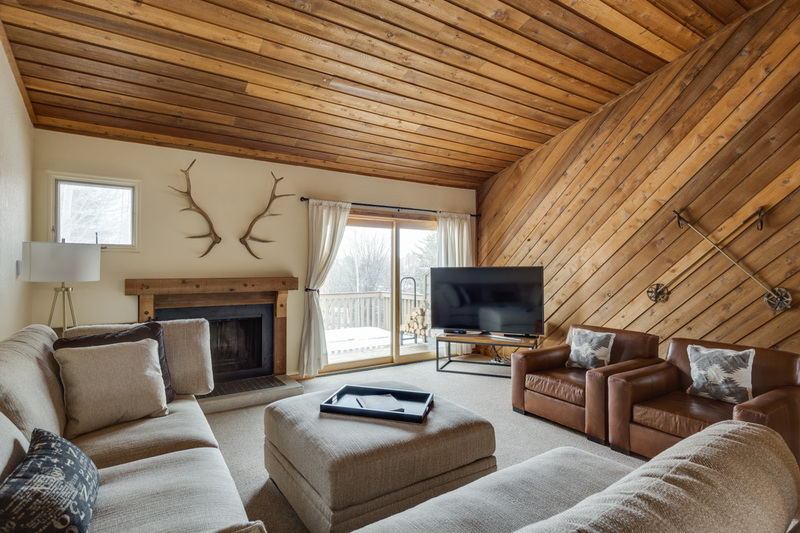 From their hilltop vantage point, our Elkhorn vacation homes offer sweeping mountain and golf course views and a feeling of total privacy, with skiing at River Run Lodge just three miles away. 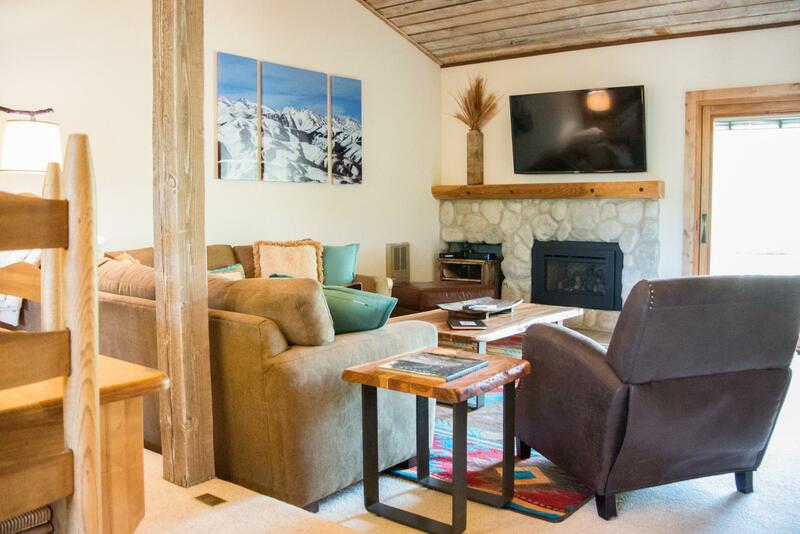 All of these Sun Valley rentals offer private parking. 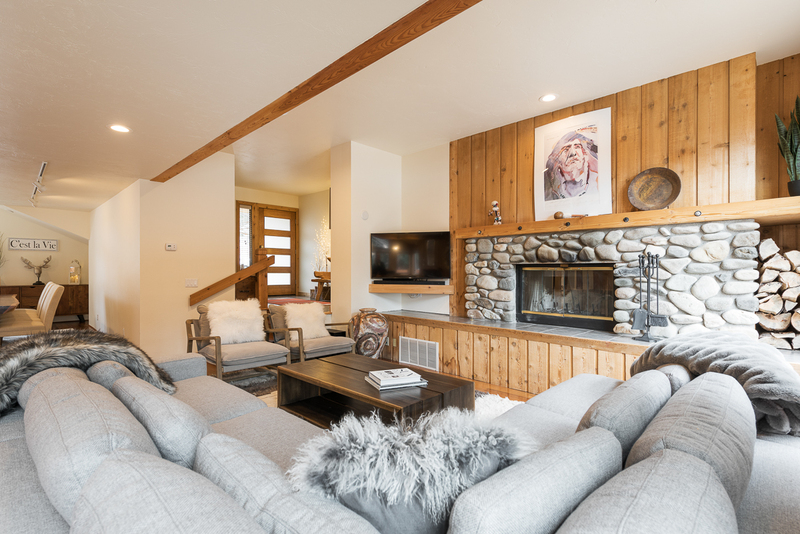 Nestled directly on Bald Mountain with walking access to the Challenger and Greyhawk chairlifts, Sun Valley’s Warm Springs neighborhood is ideal for skiers and snowboarders looking to catch both first tracks and last chair. 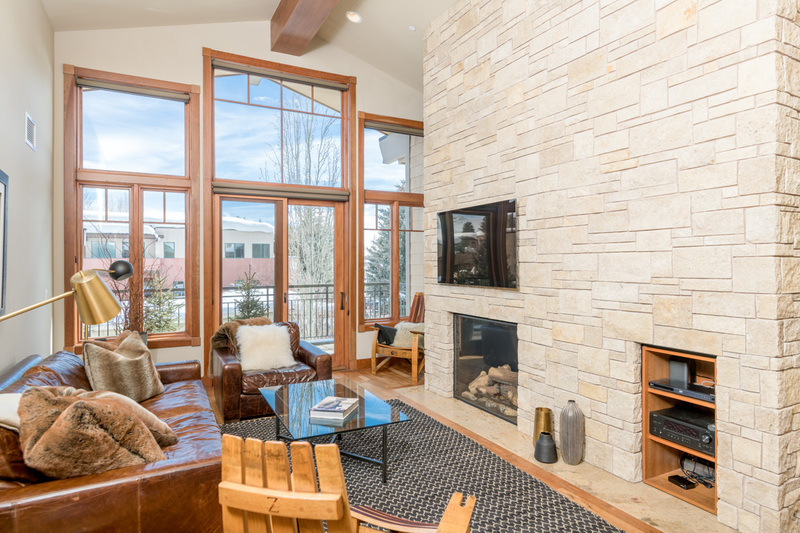 Choose from elegant condos with hot tub access, slopeside townhomes with clubhouse amenities, and contemporary homes with river rock fireplaces, private hot tubs and decks with mountain views. 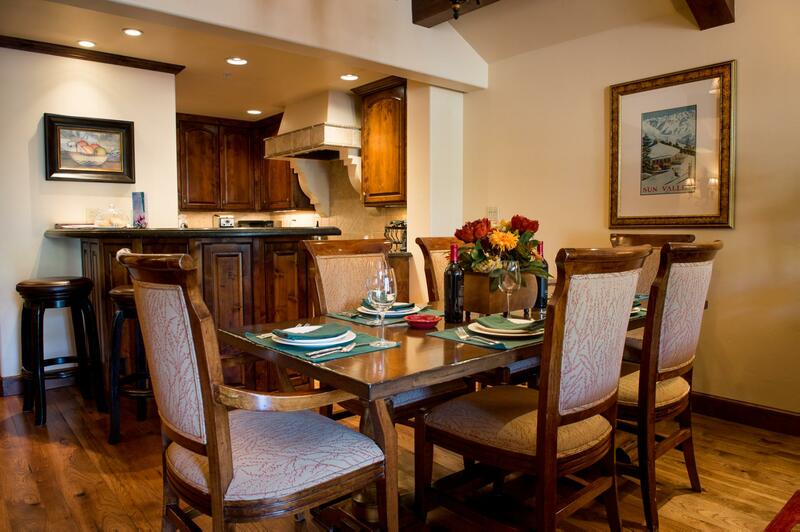 Dining and apres-ski options lie within walking distance near the lifts, with even more restaurants, pubs and entertainment options three miles away in downtown Ketchum, accessible on the free city bus. 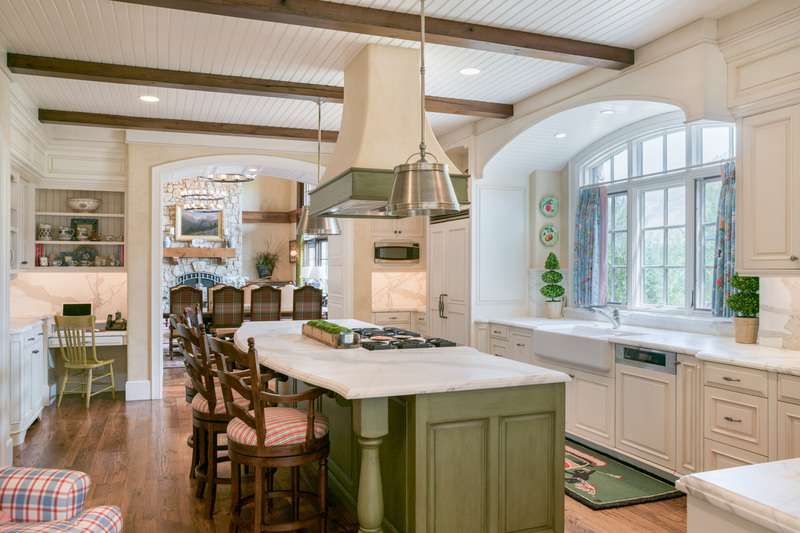 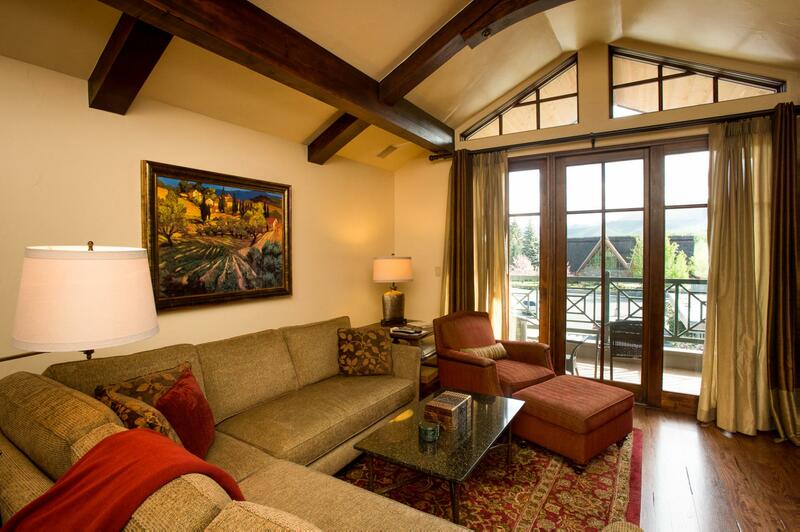 The lush, wooded Mid Valley area is home to some of Sun Valley’s most stunning private residences. 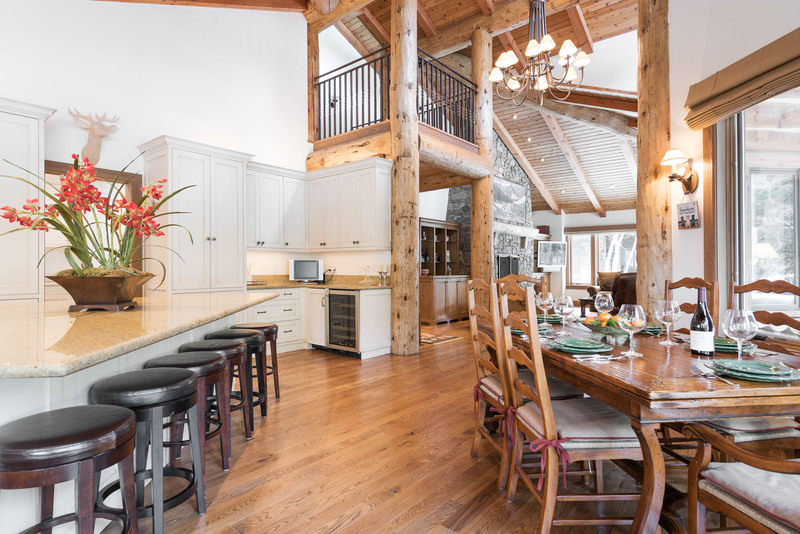 Contemporary log cabins with private swimming pools overlook the mountains from private decks, and European-style villas sit on expansive grounds with walking paths and private fishing access. 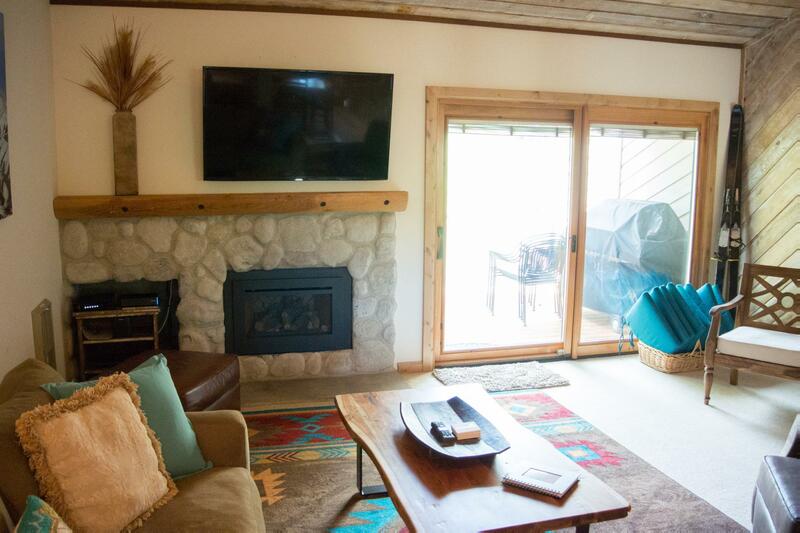 Our handpicked Mid Valley vacation rentals include the finest of these homes, featuring amenities like private theaters, outdoor fire pits and tranquil lakes. 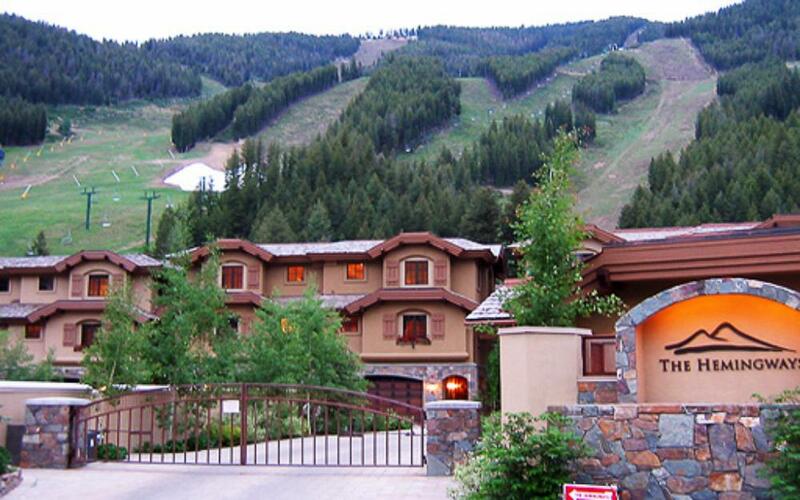 Ski access is a scenic 20-minute drive away. 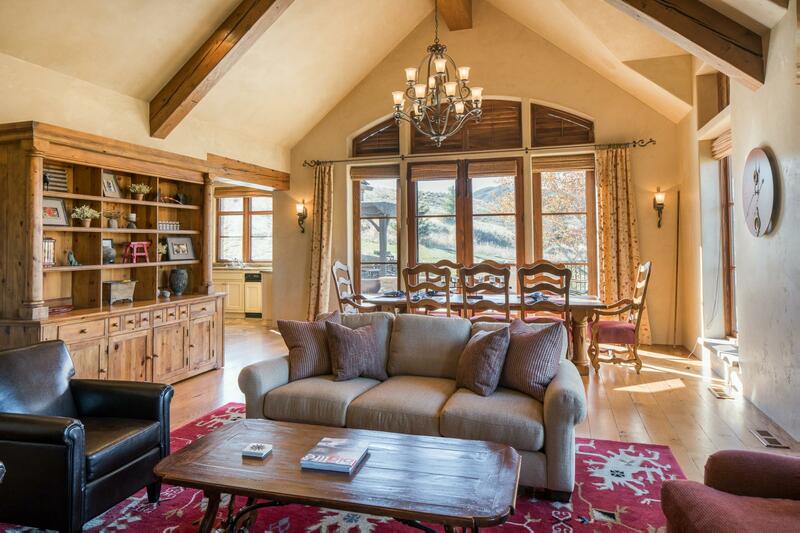 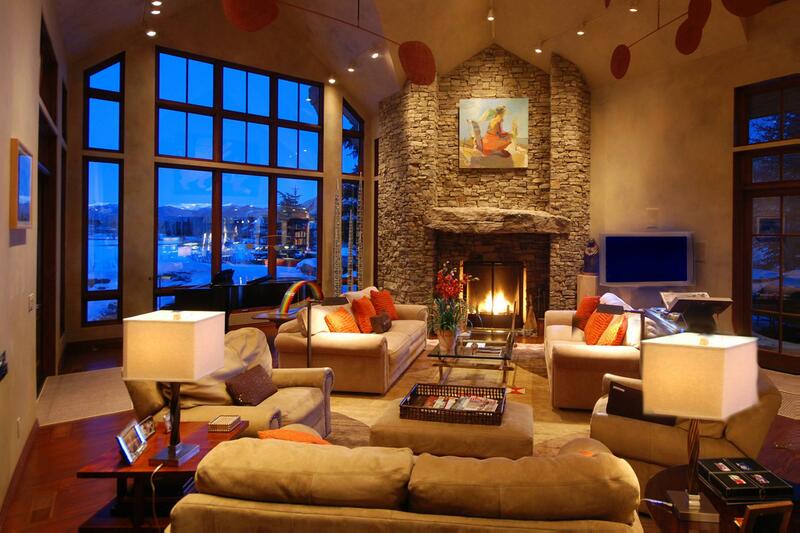 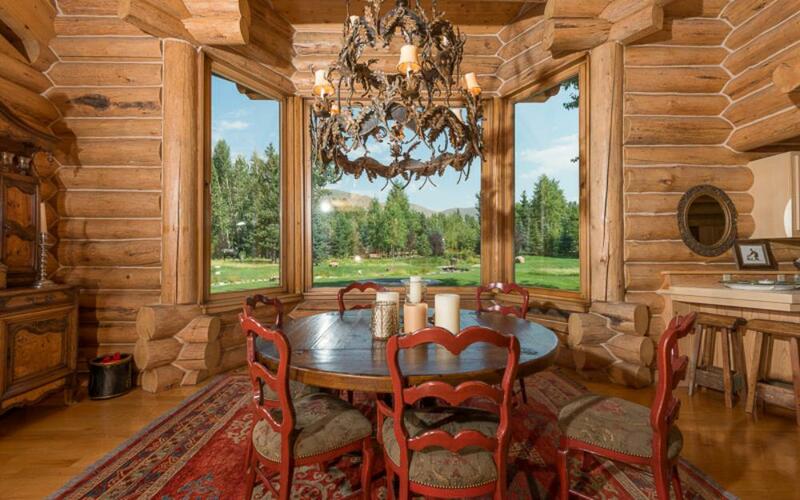 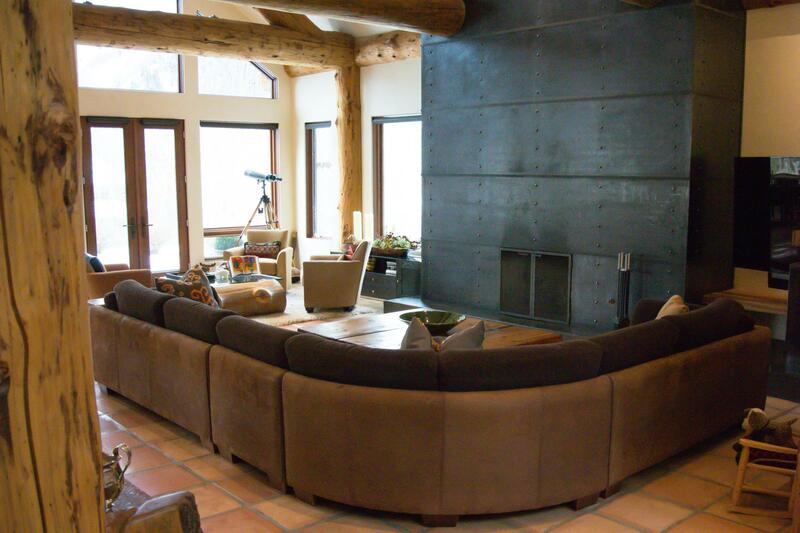 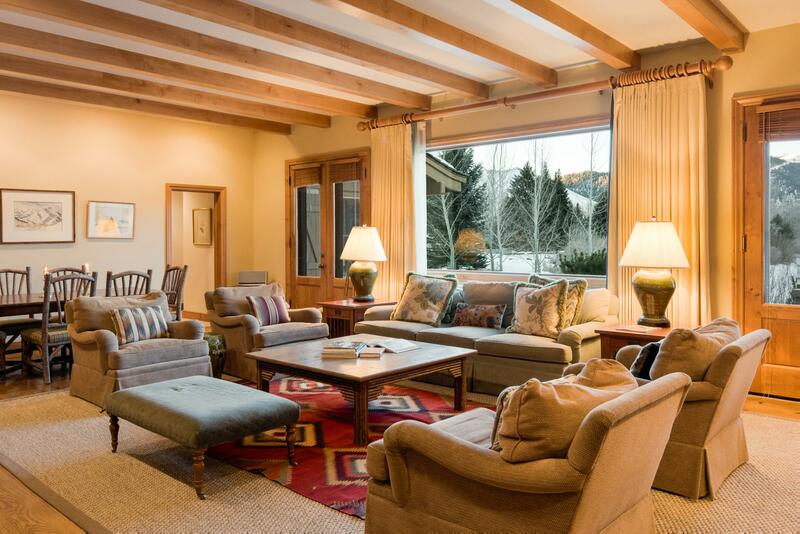 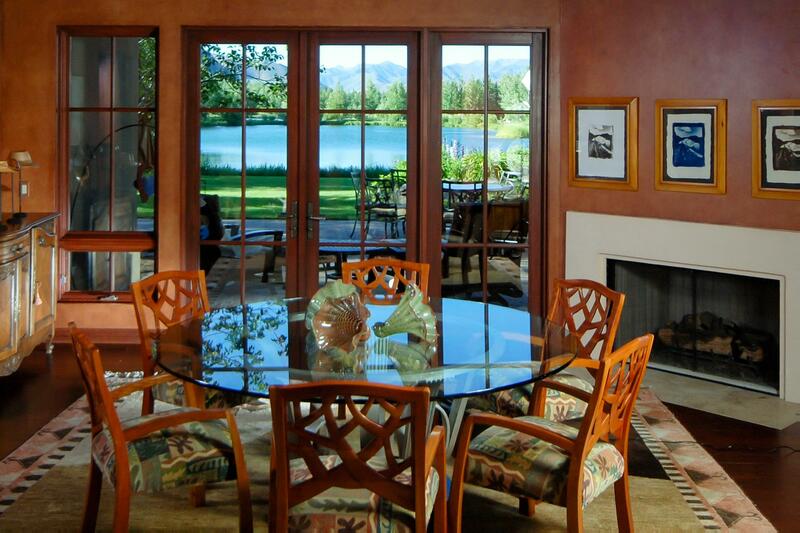 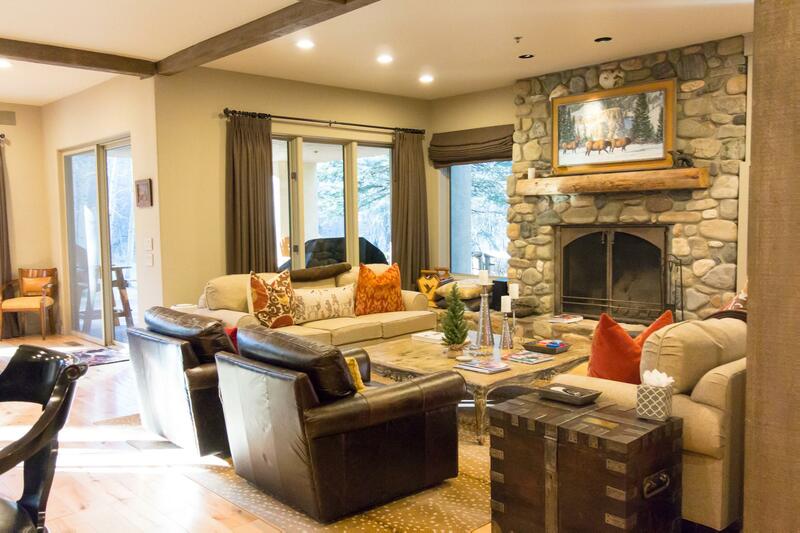 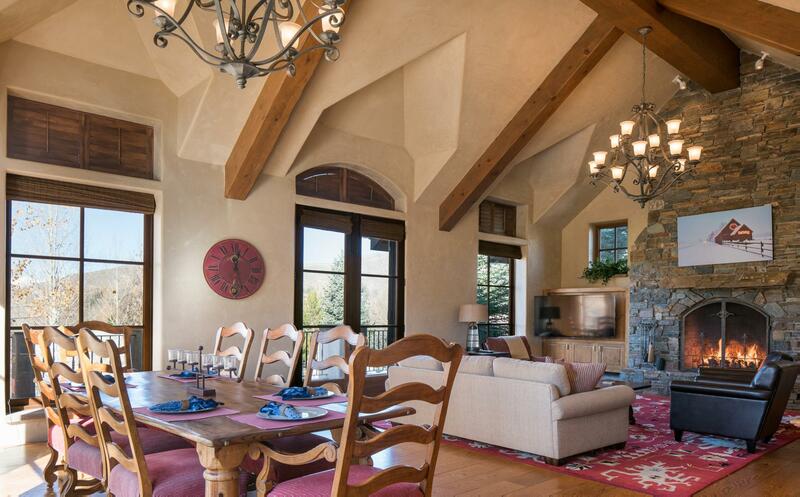 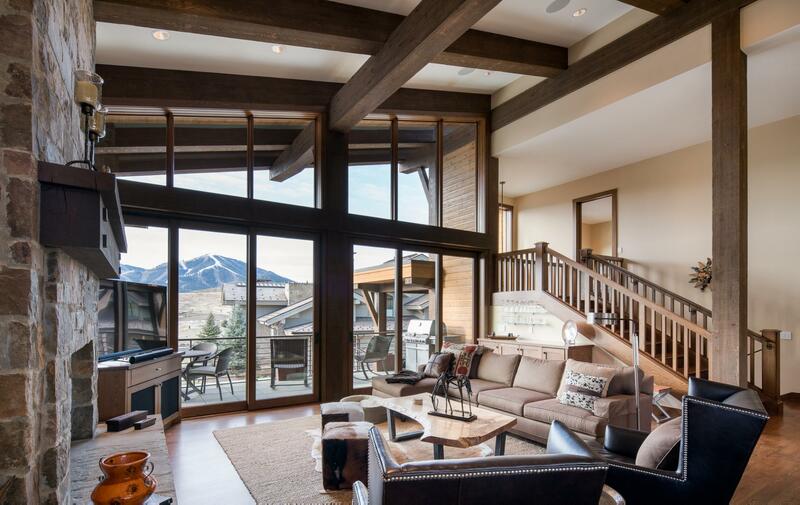 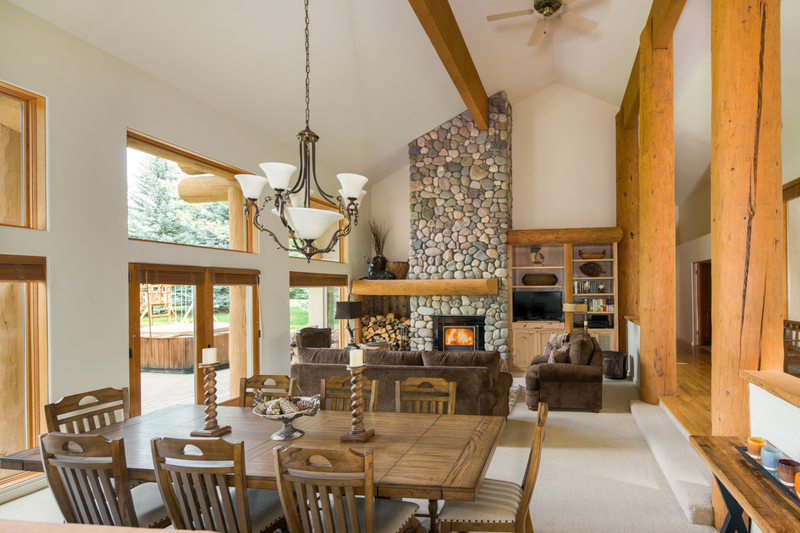 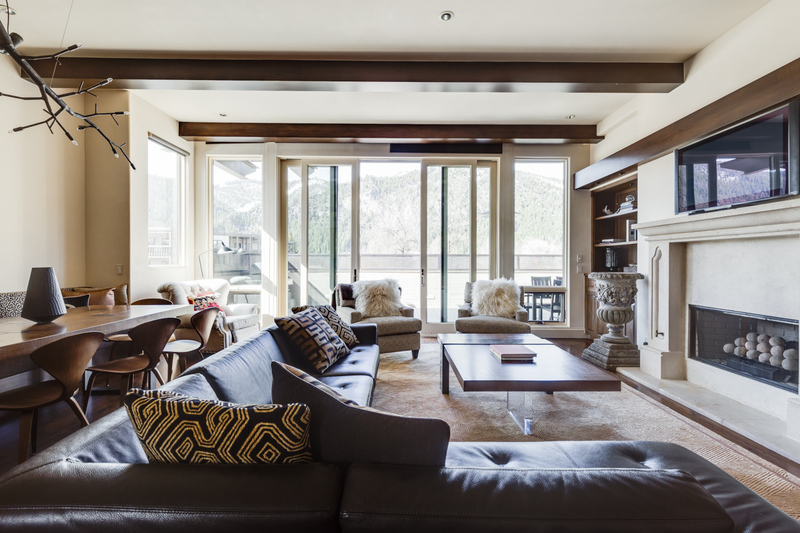 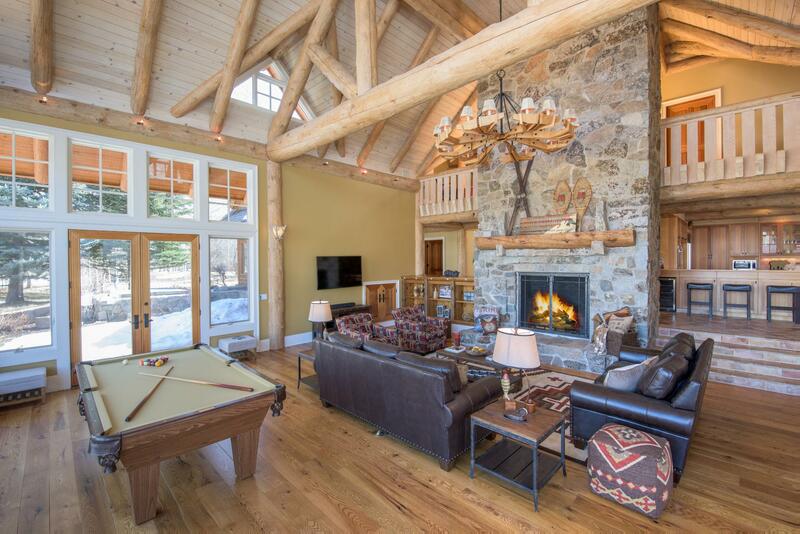 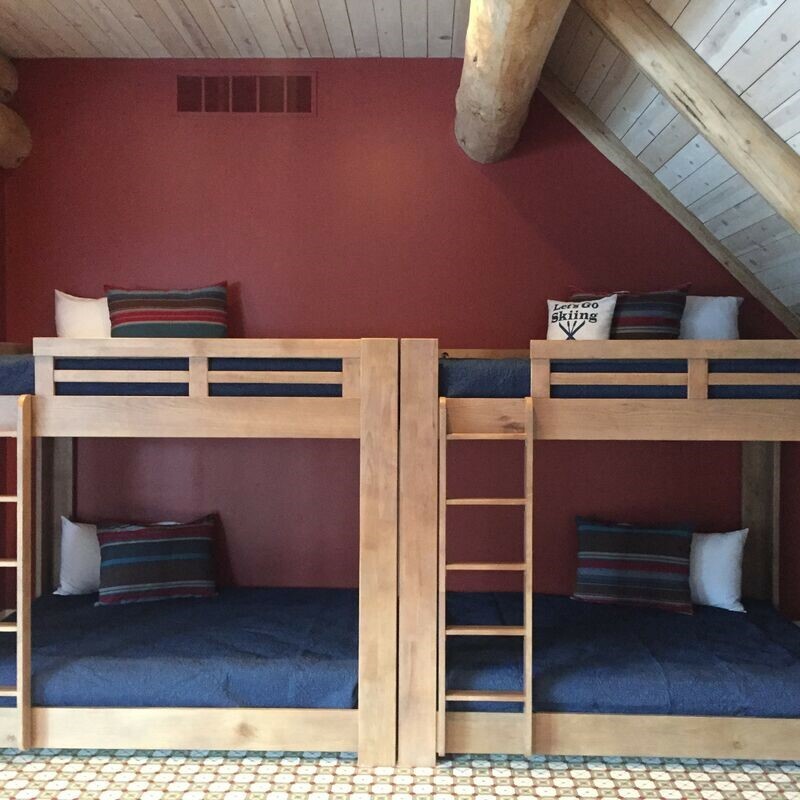 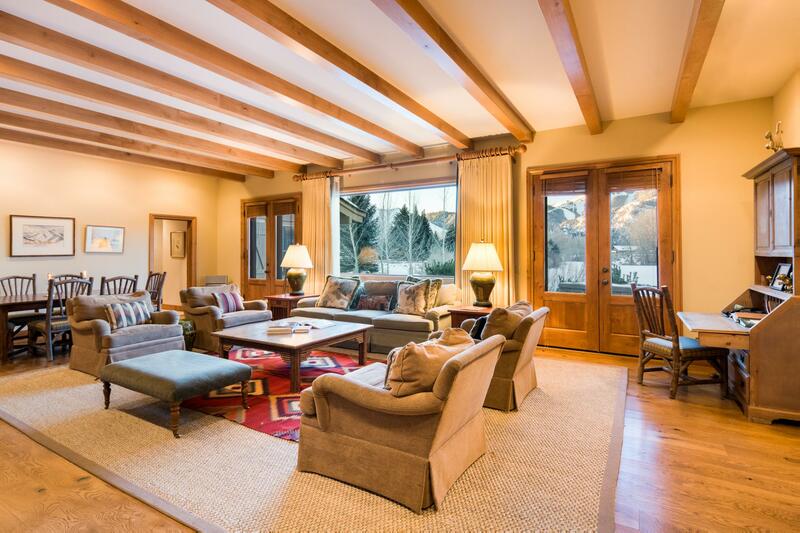 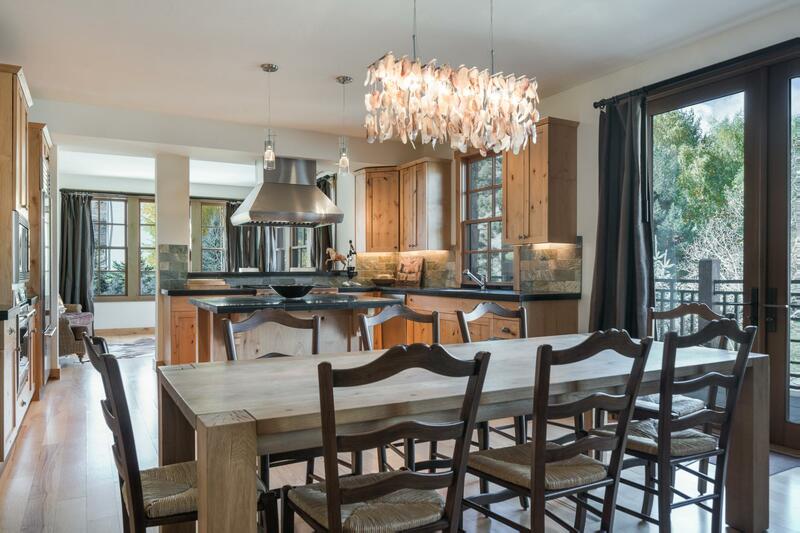 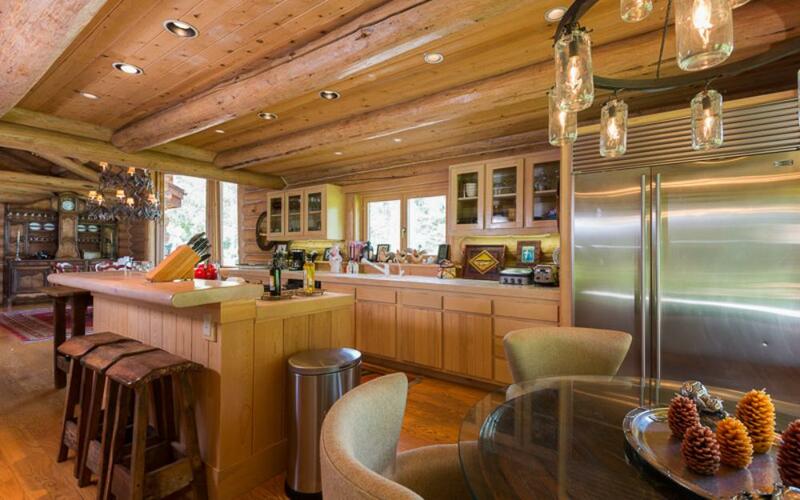 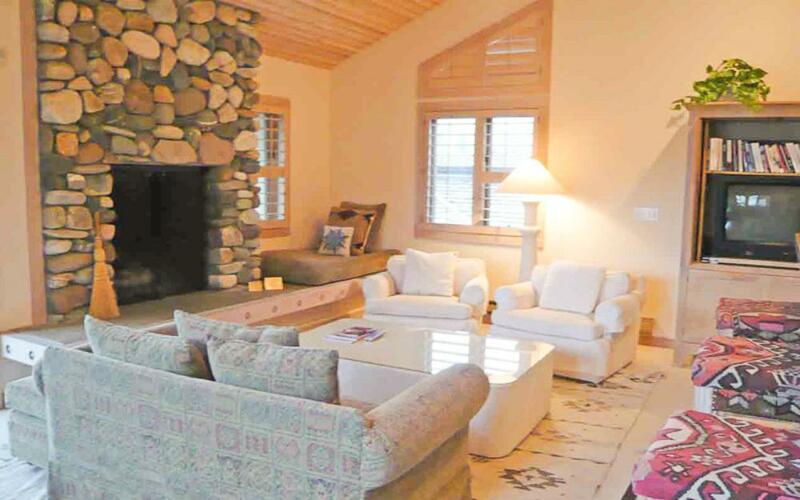 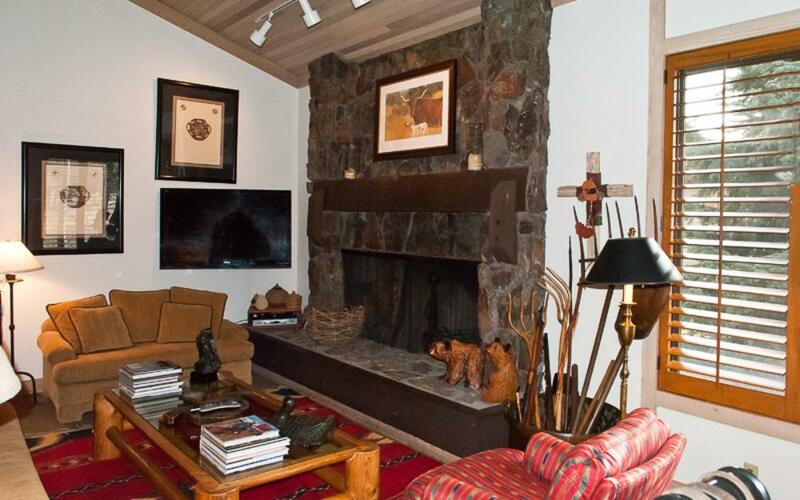 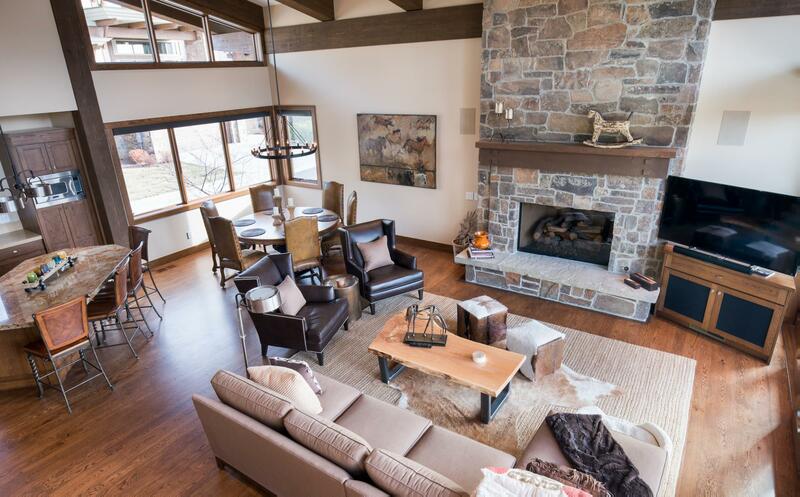 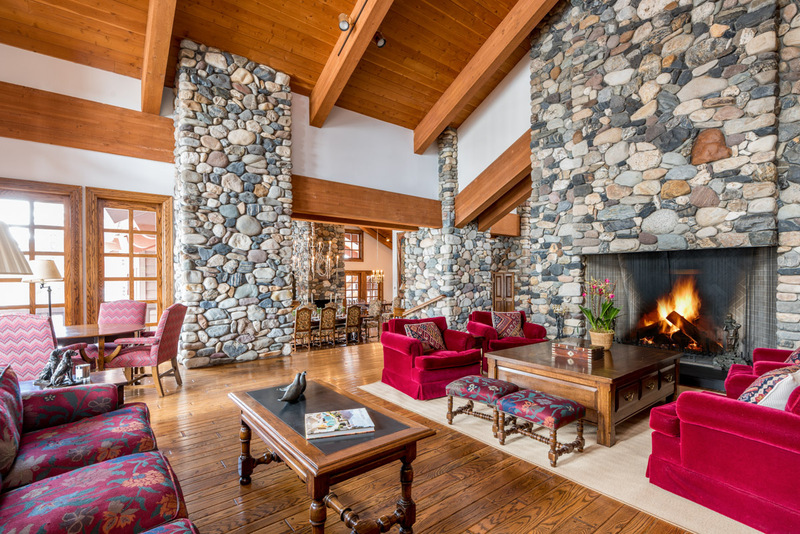 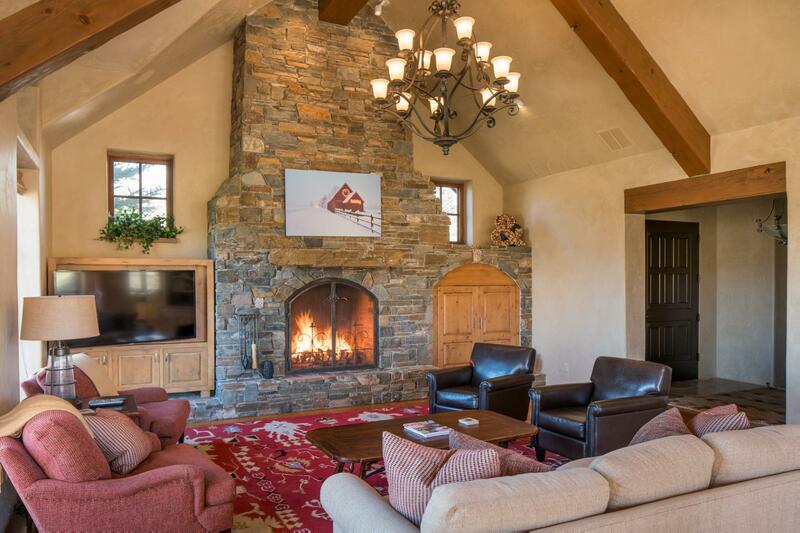 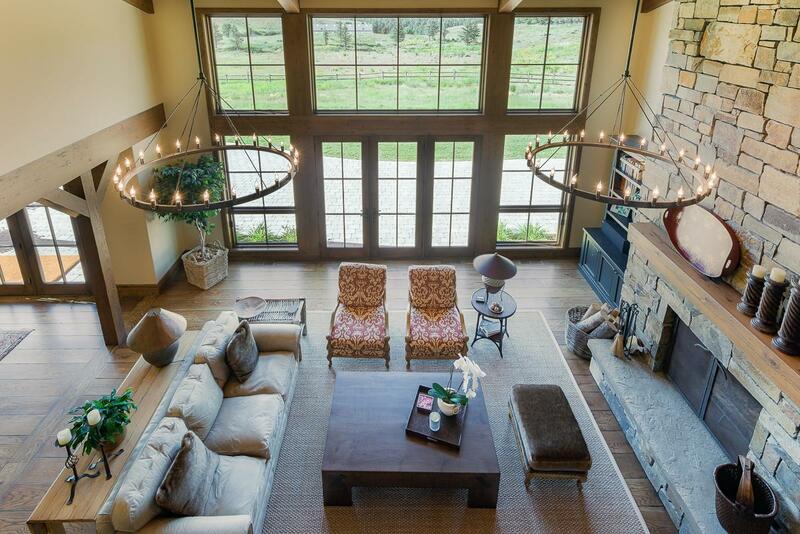 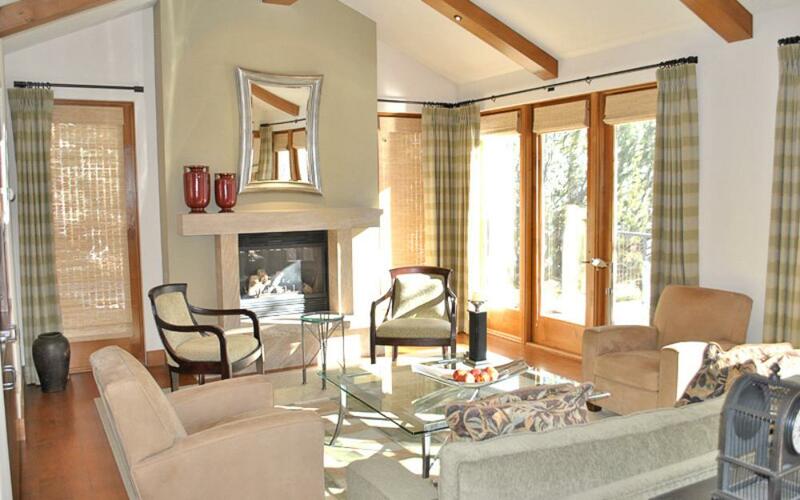 Family-friendly luxury retreat near Sun Valley with Mount Baldy views and resort amenities -- walk to Ketchum. 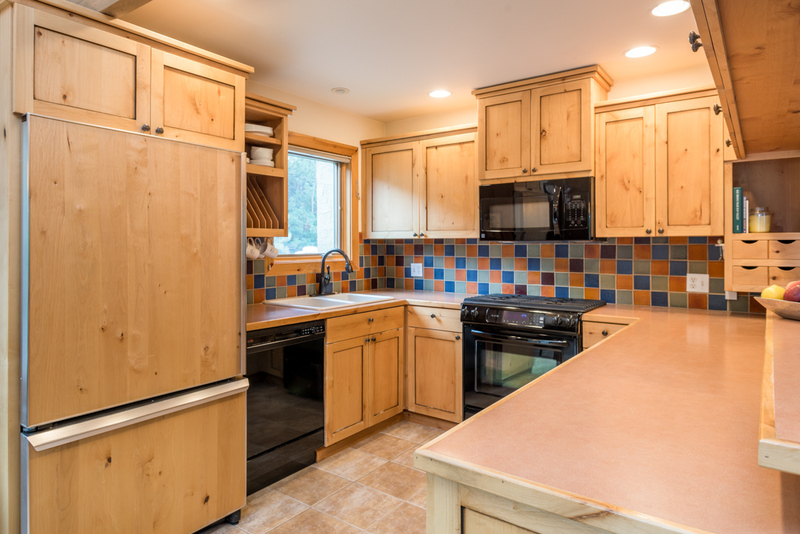 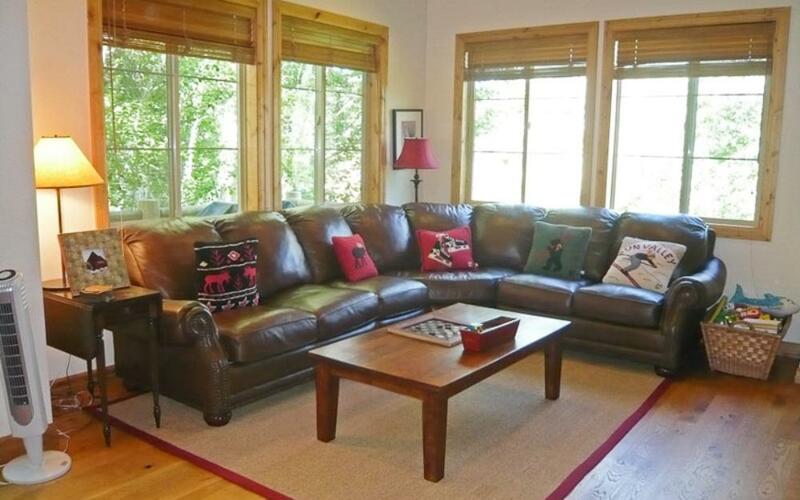 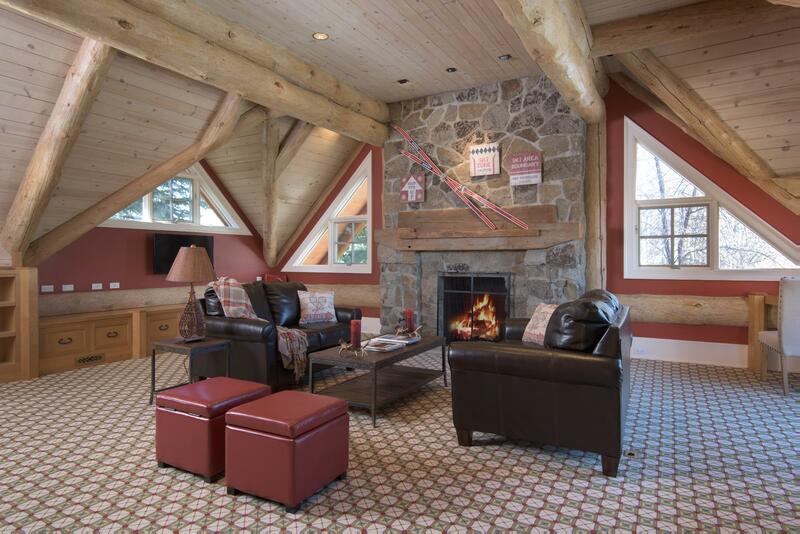 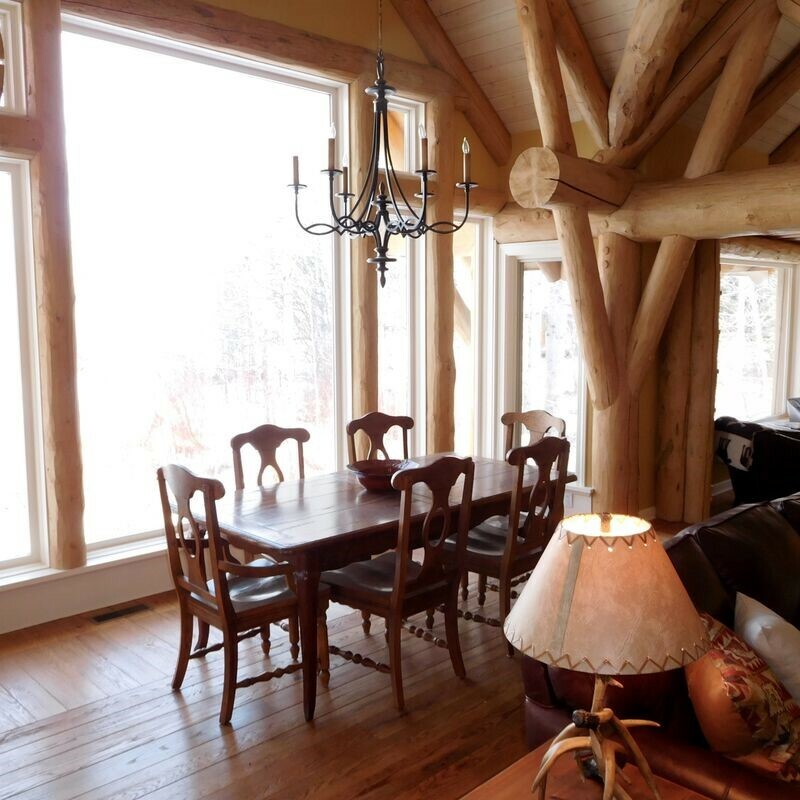 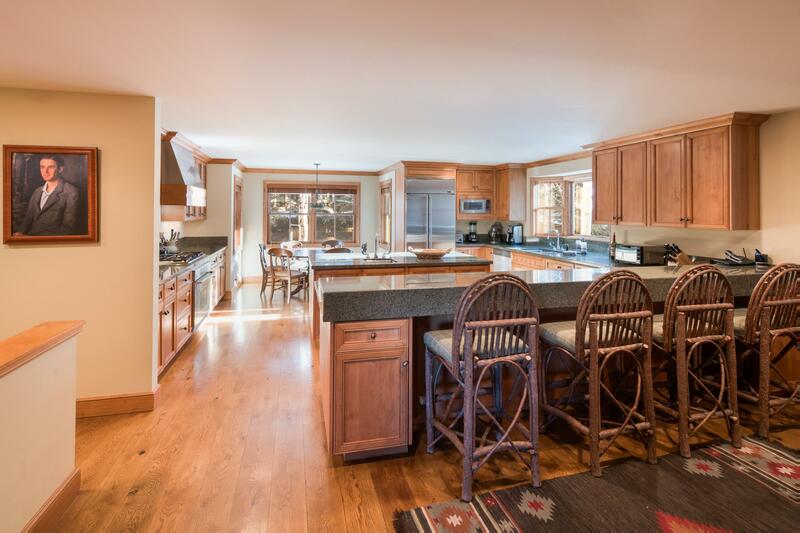 Family-friendly home with game room and views of Bald Mountain -- five minutes to skiing, golf, shopping and dining. 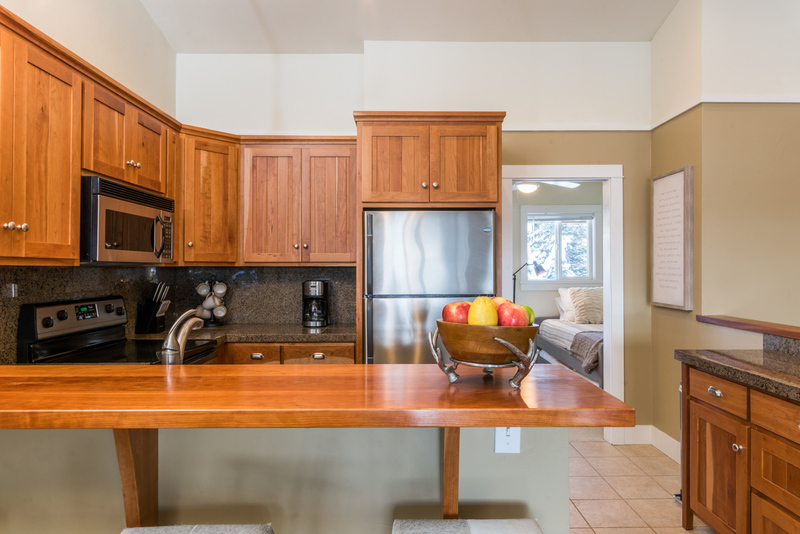 Beautifully decorated ground-floor condo 3 blocks from Main Street -- enjoy access to fitness suite, lounge and rooftop hot tub. 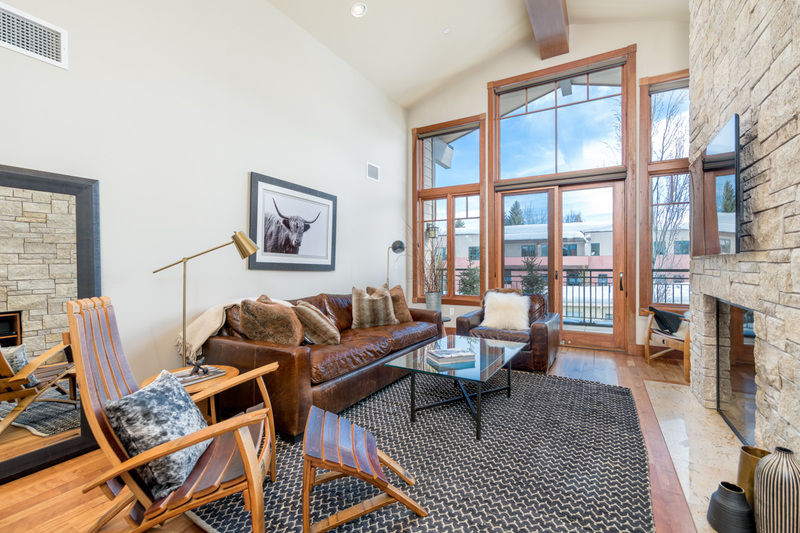 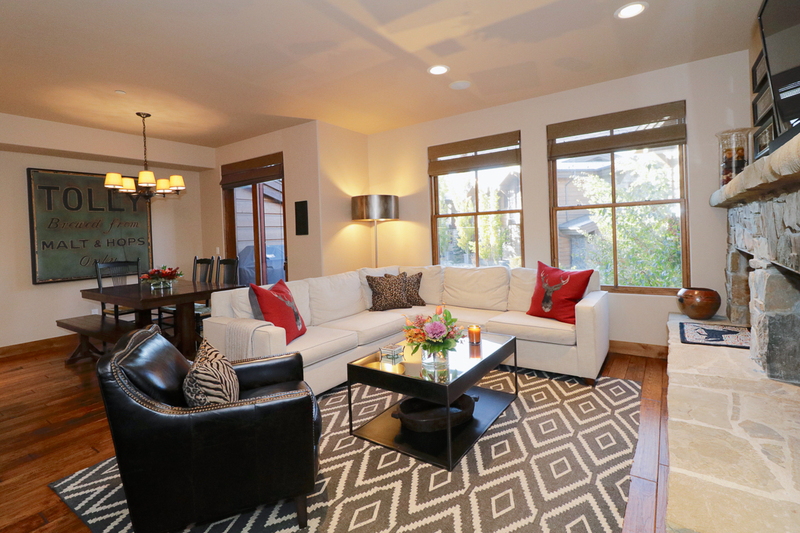 Newly constructed Ketchum townhome with a media room, modern accents and mountain views -- walk to shopping and dining. 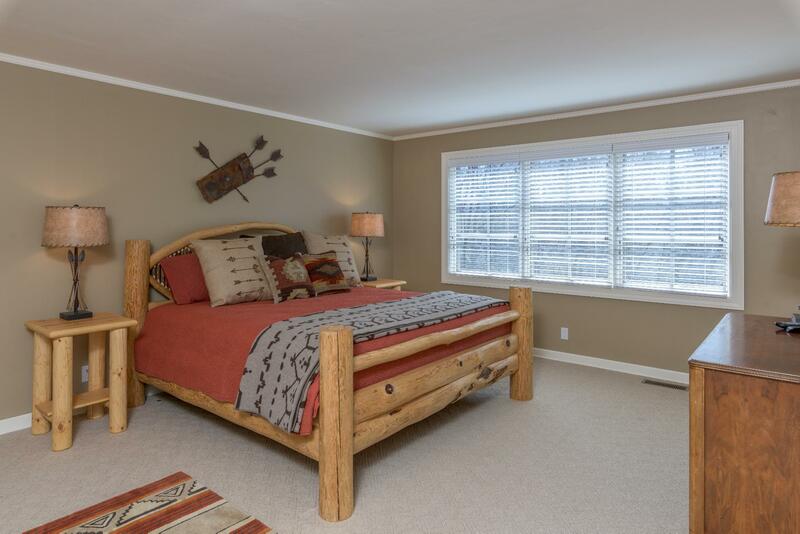 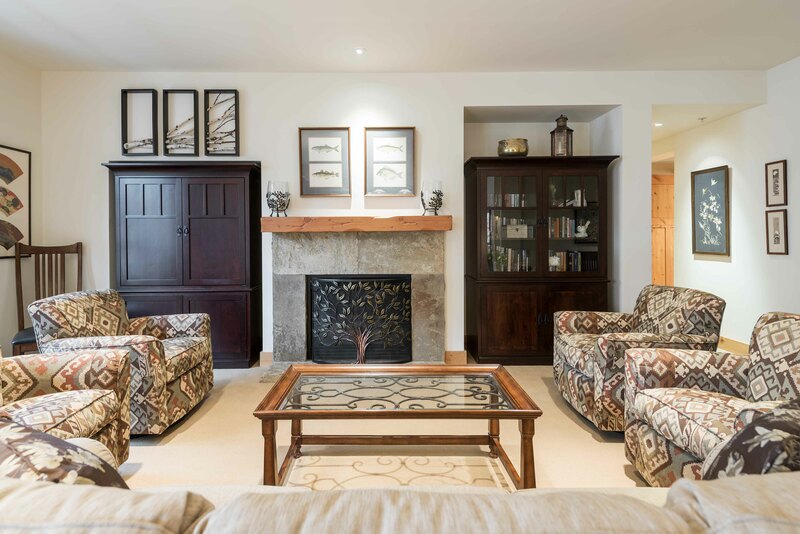 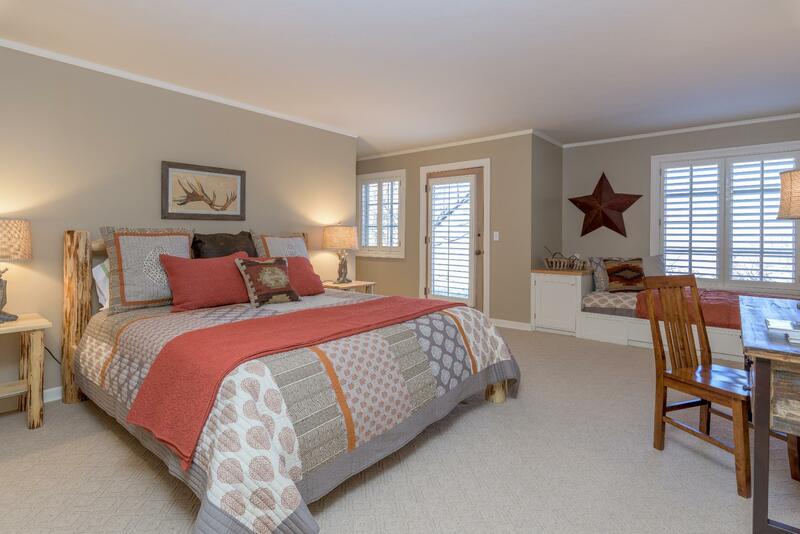 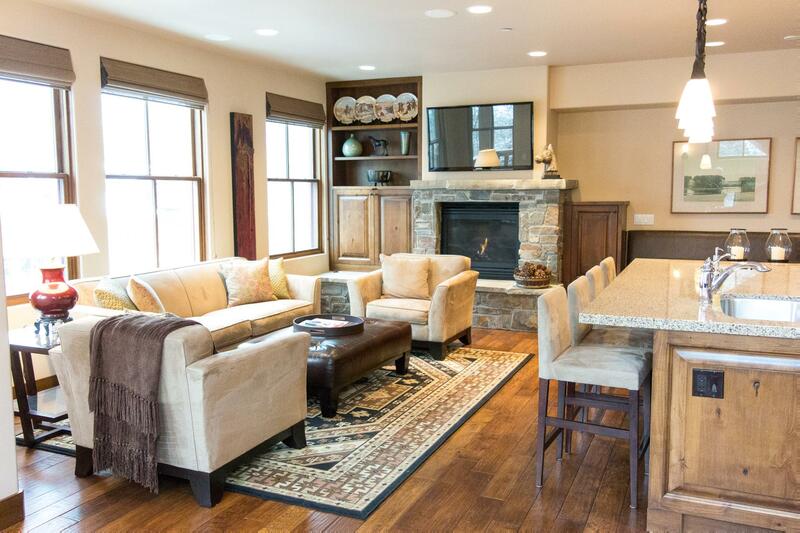 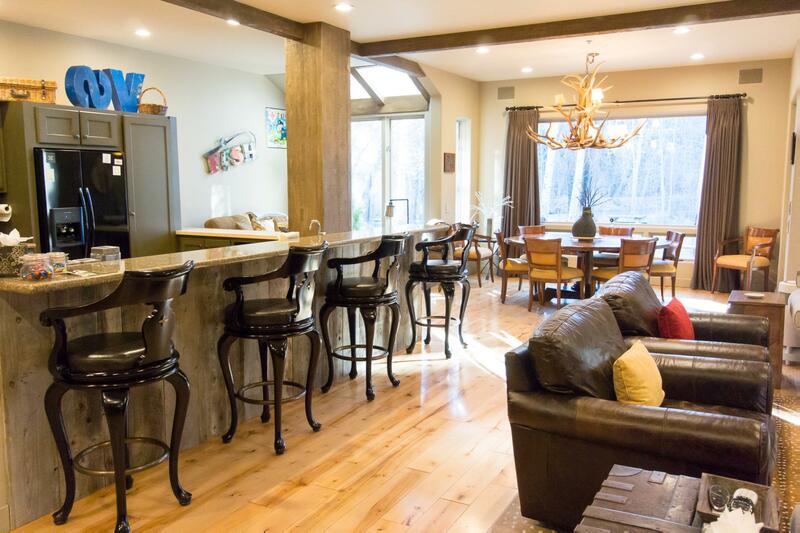 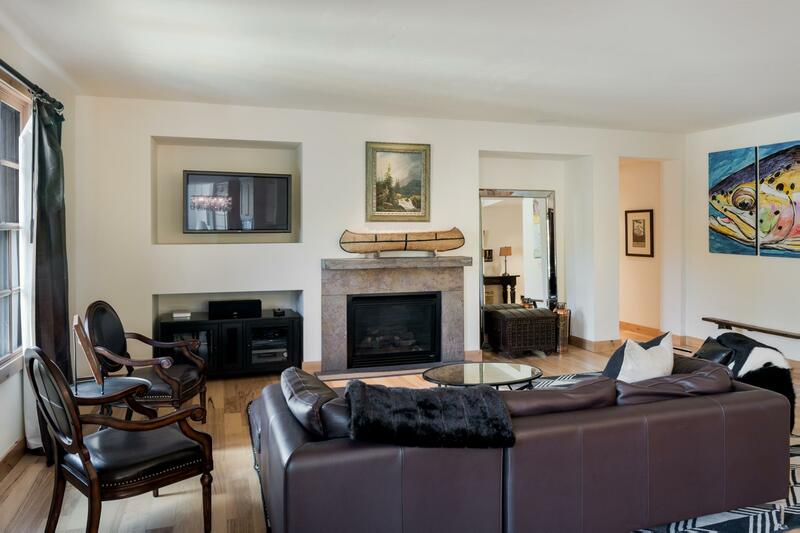 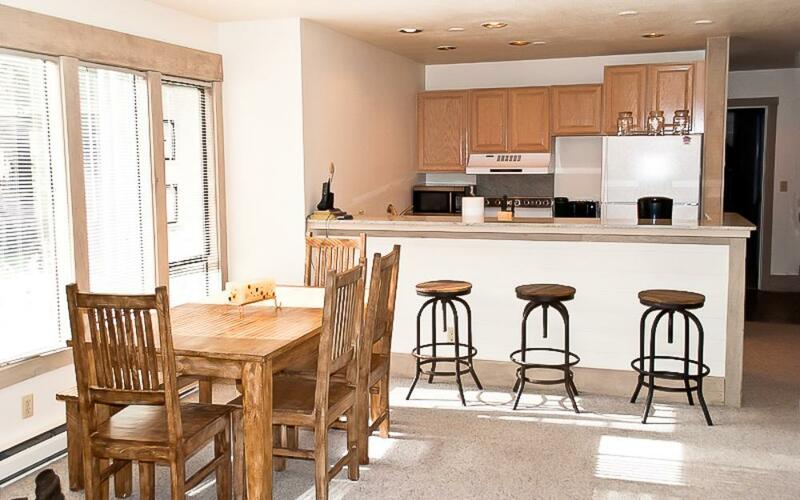 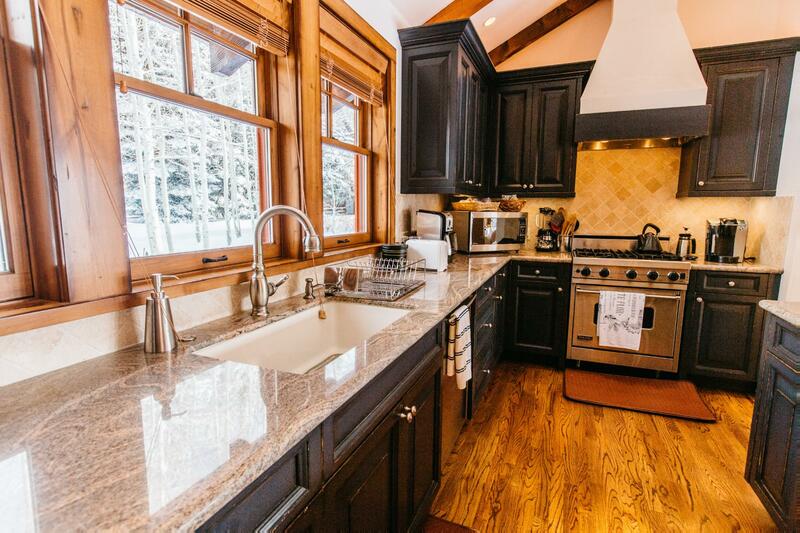 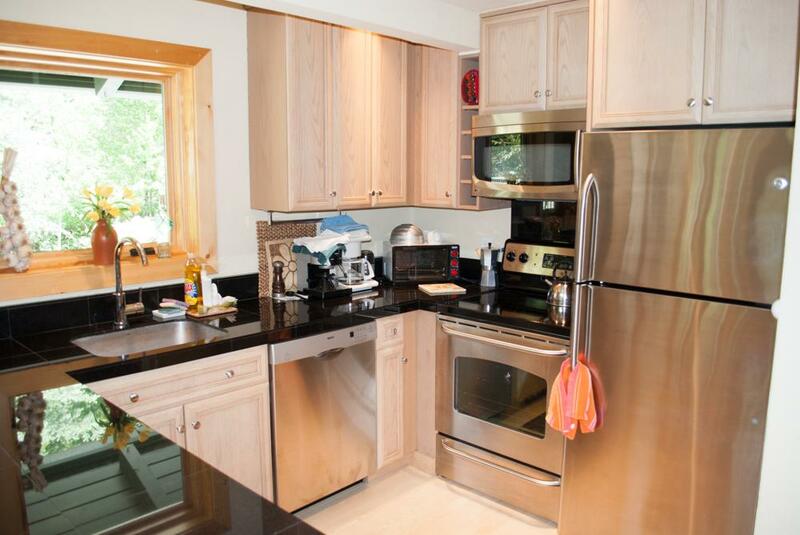 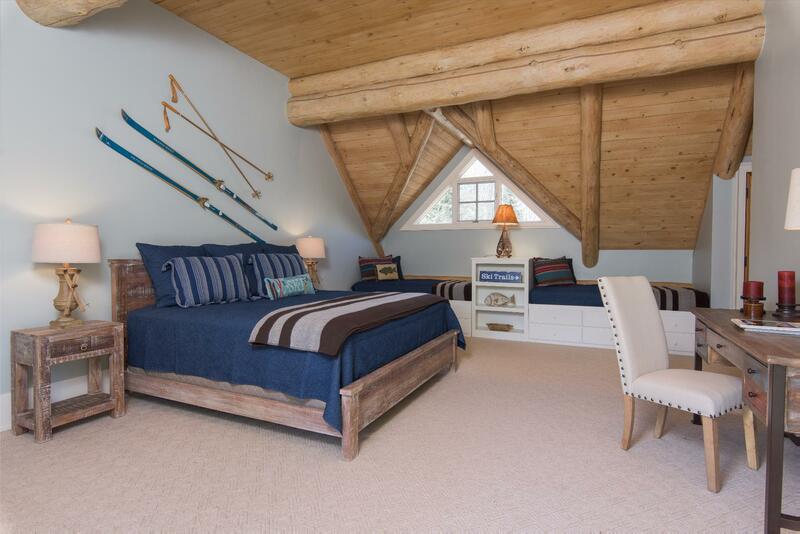 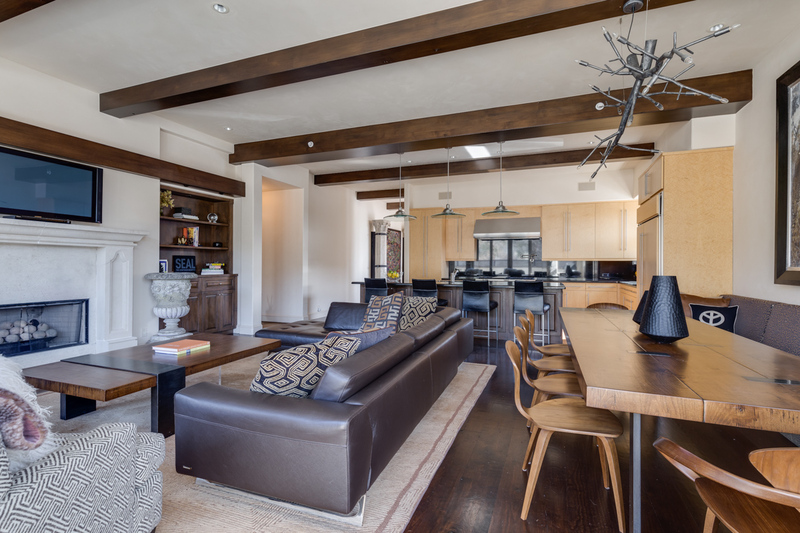 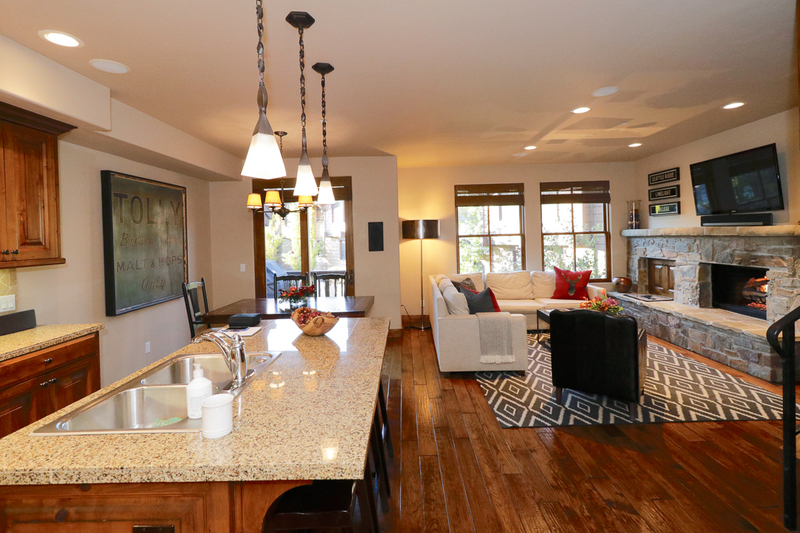 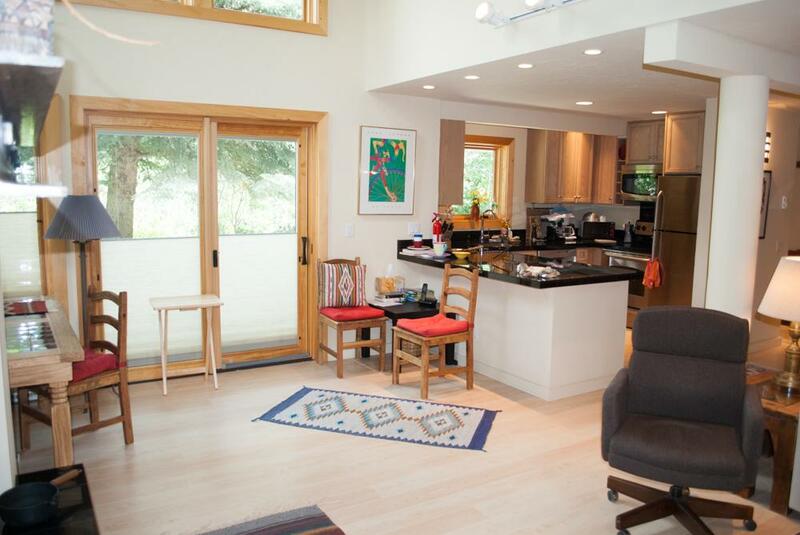 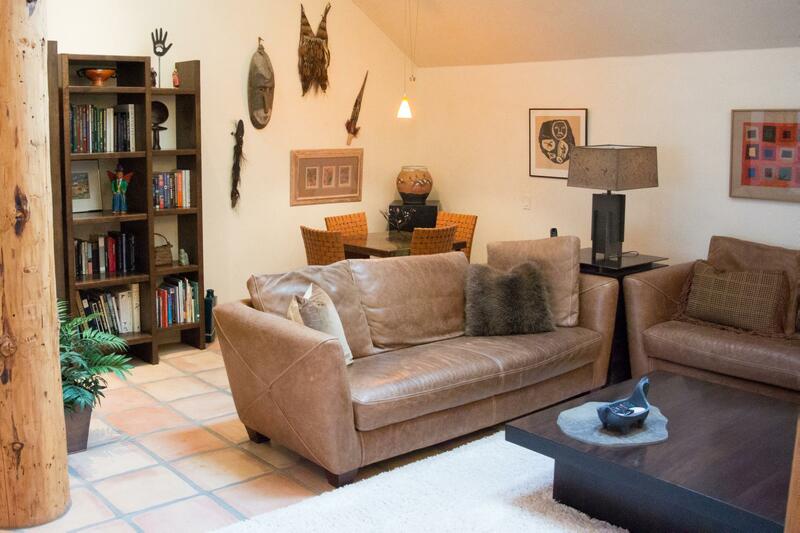 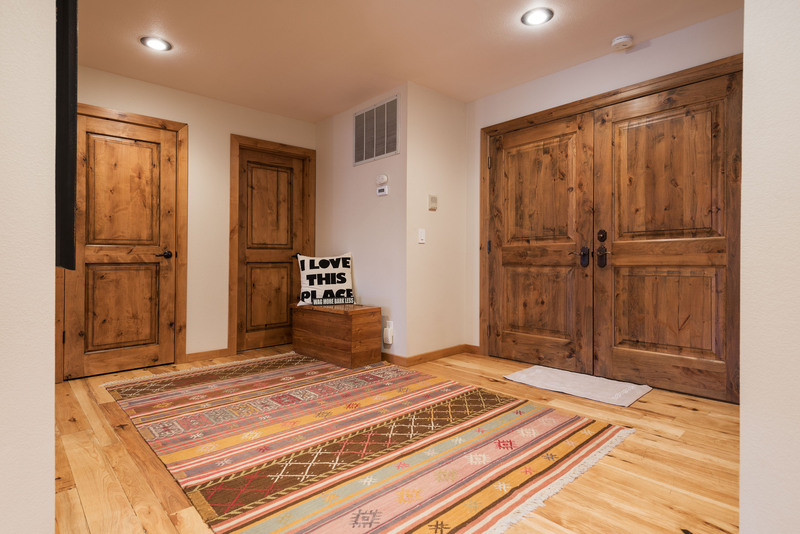 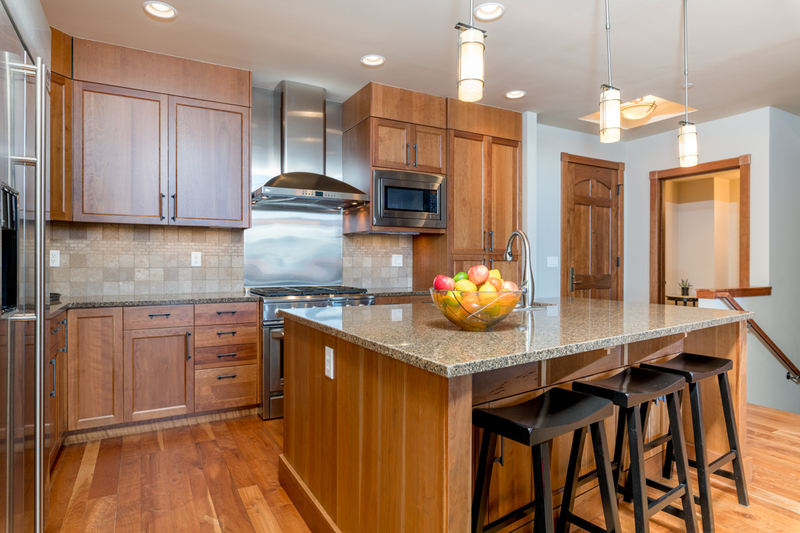 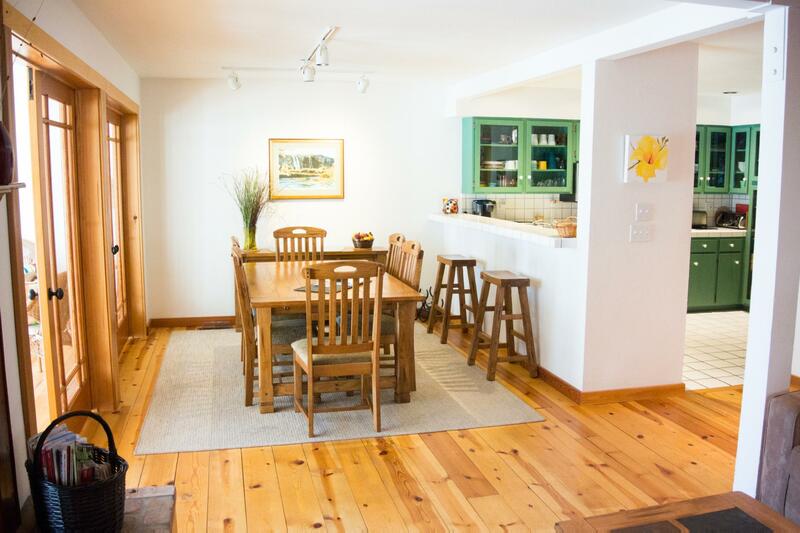 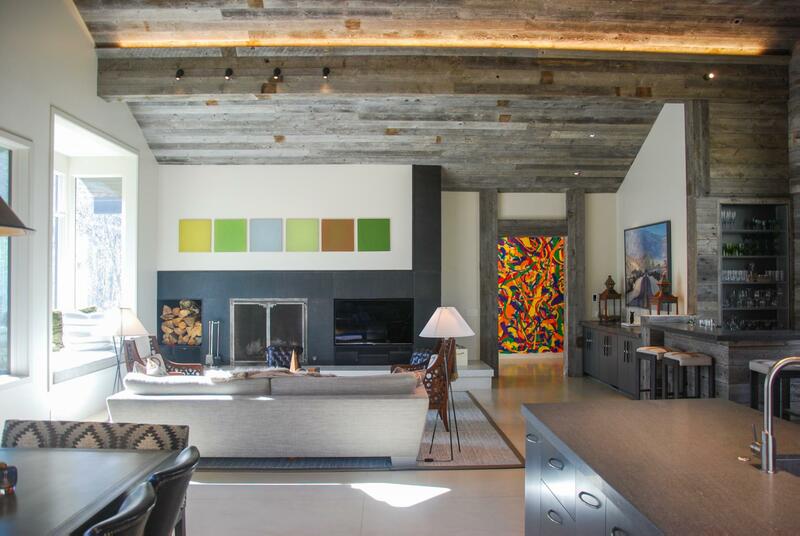 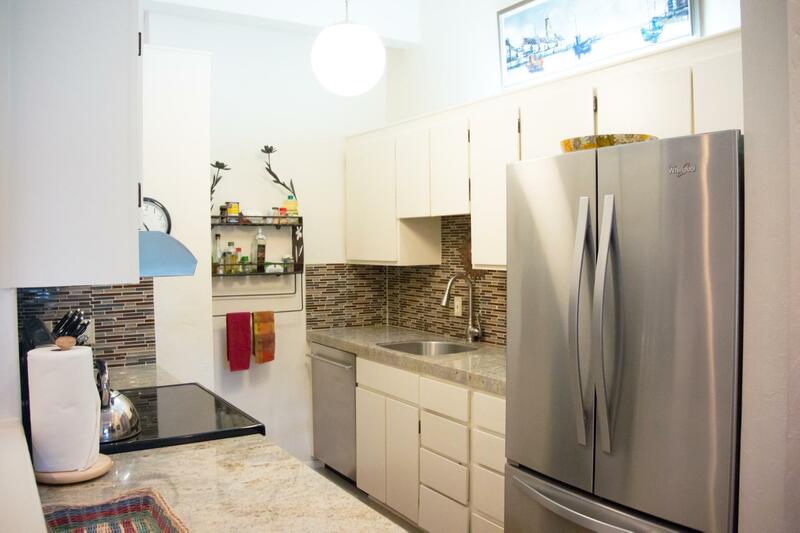 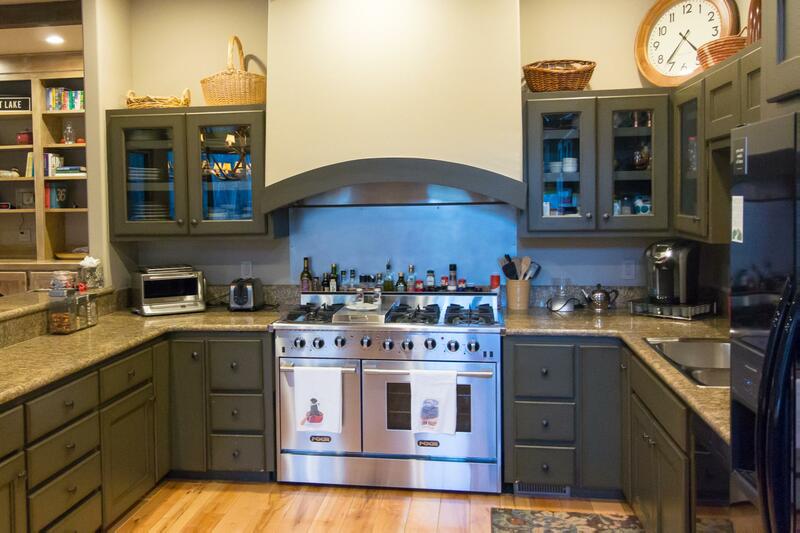 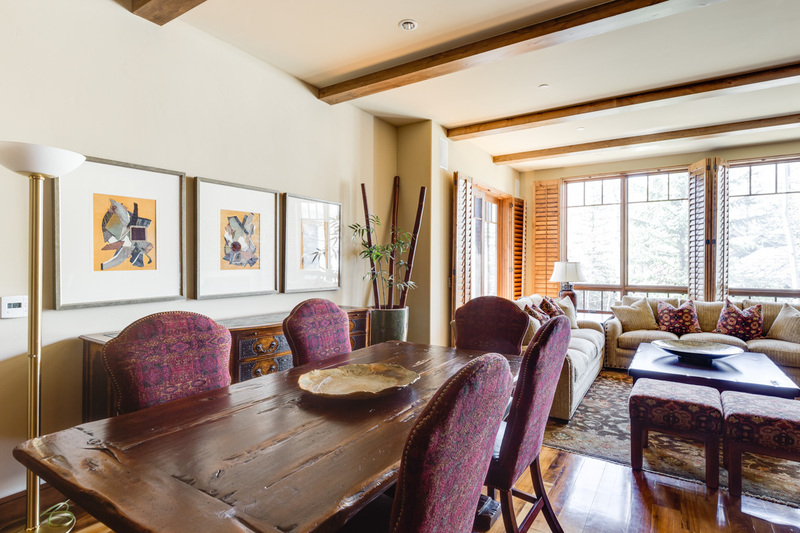 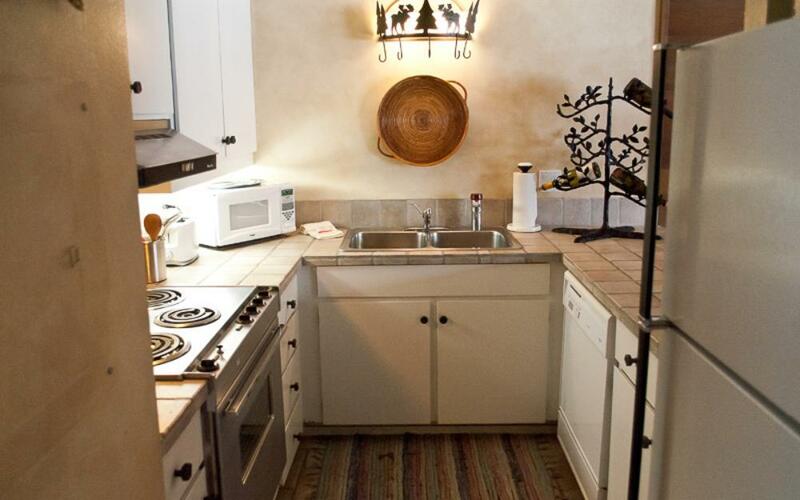 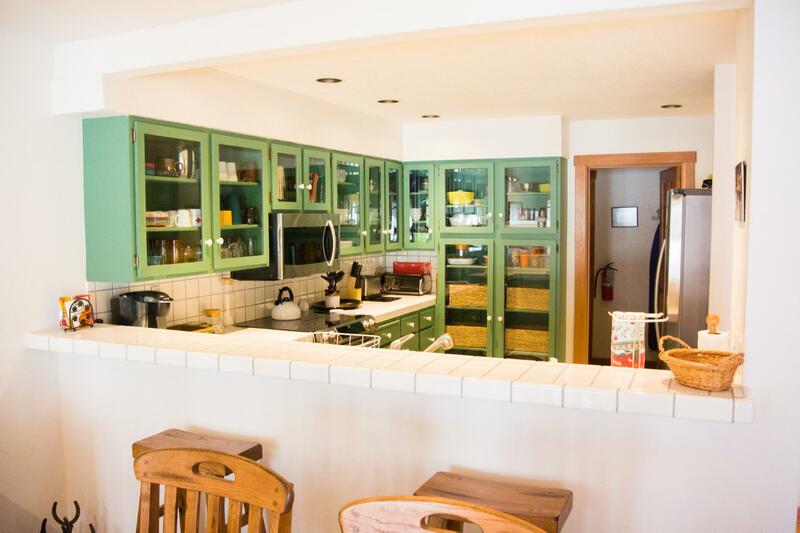 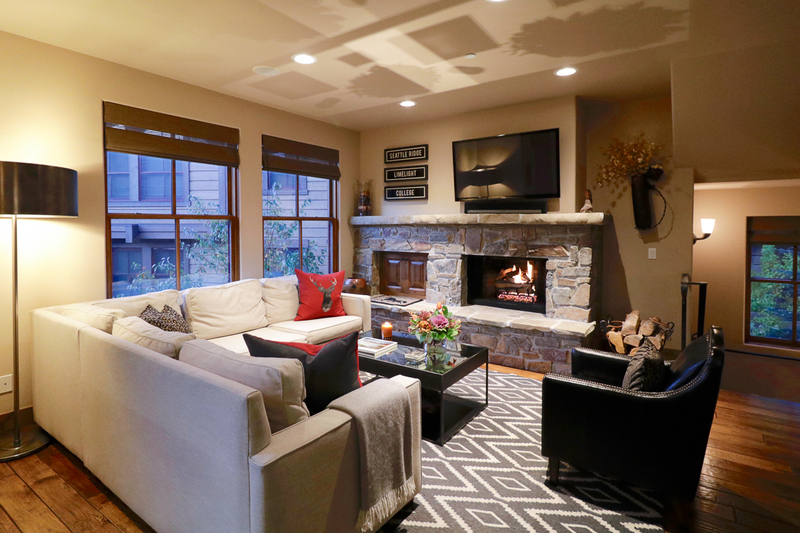 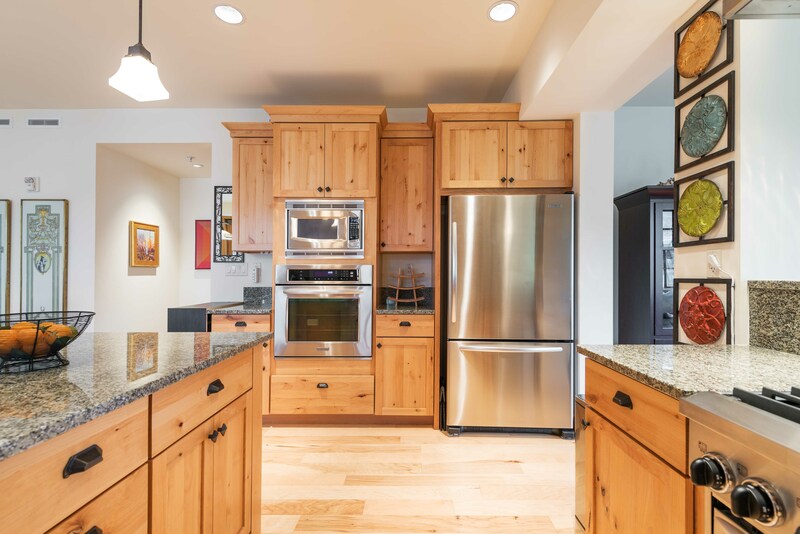 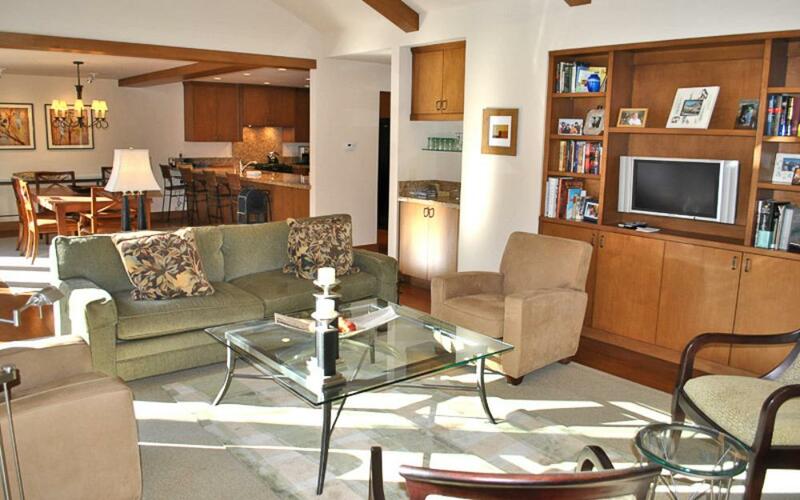 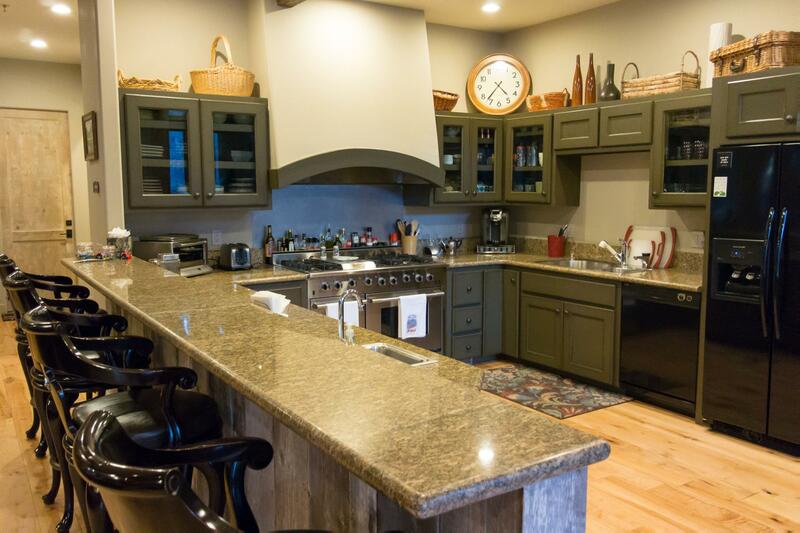 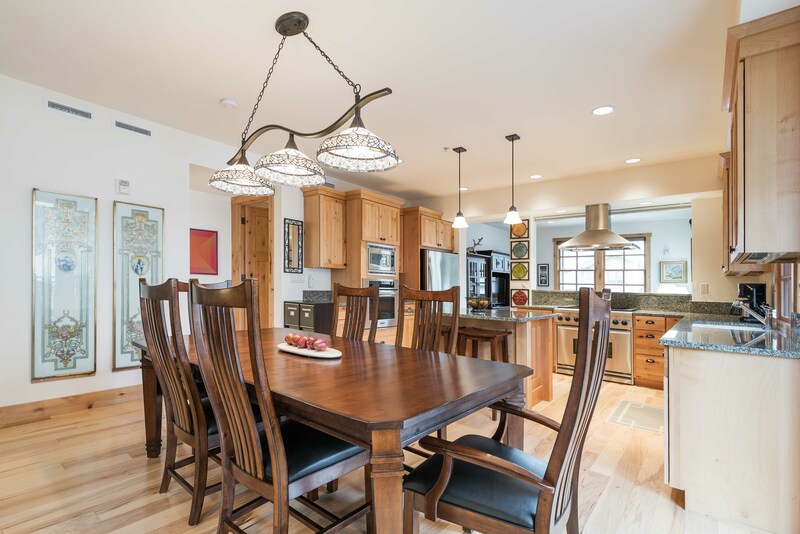 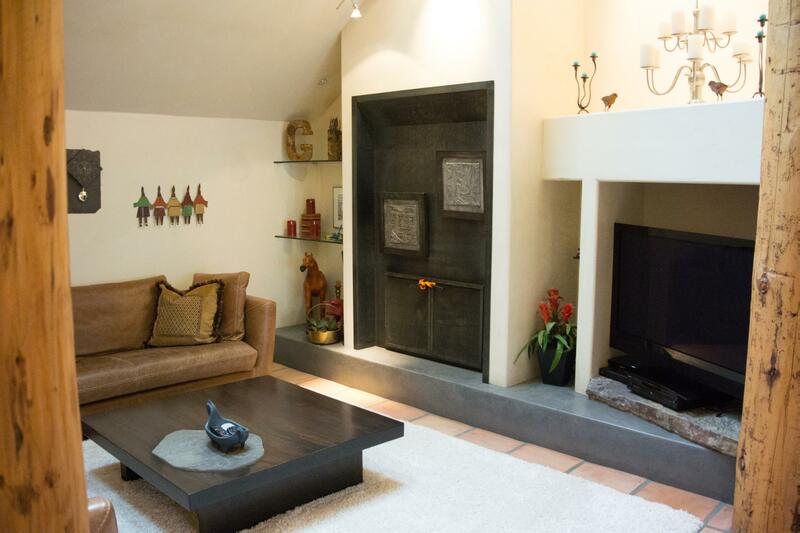 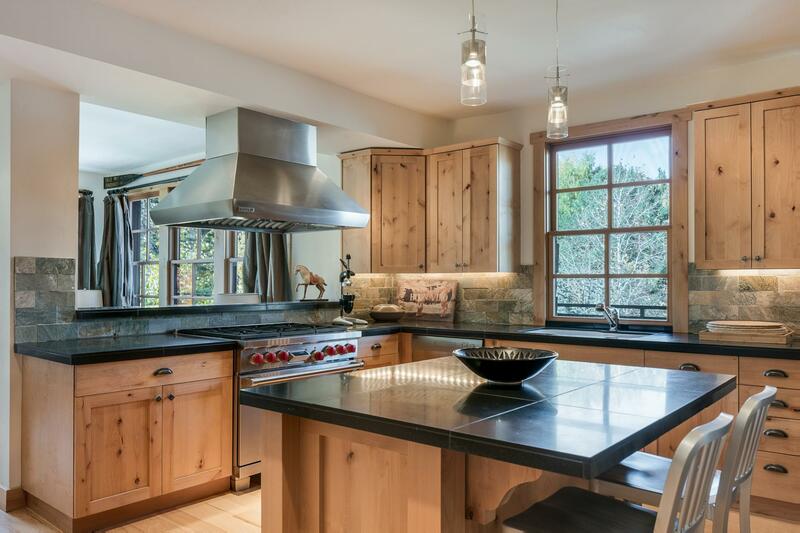 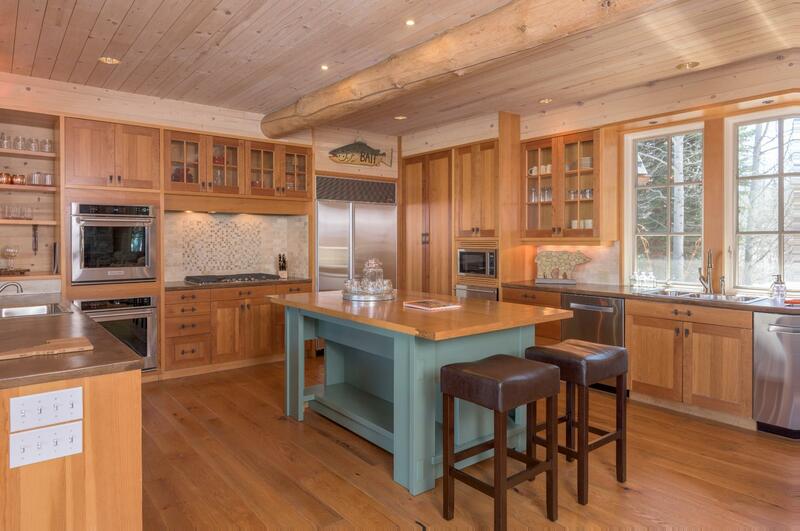 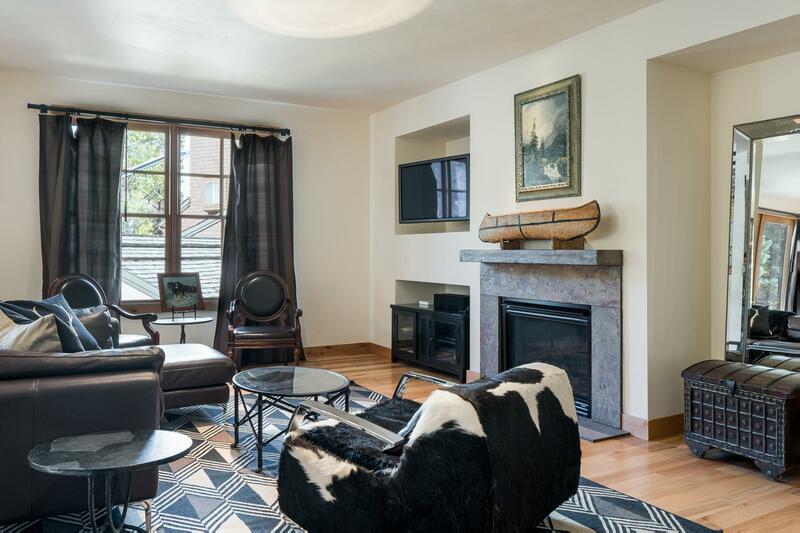 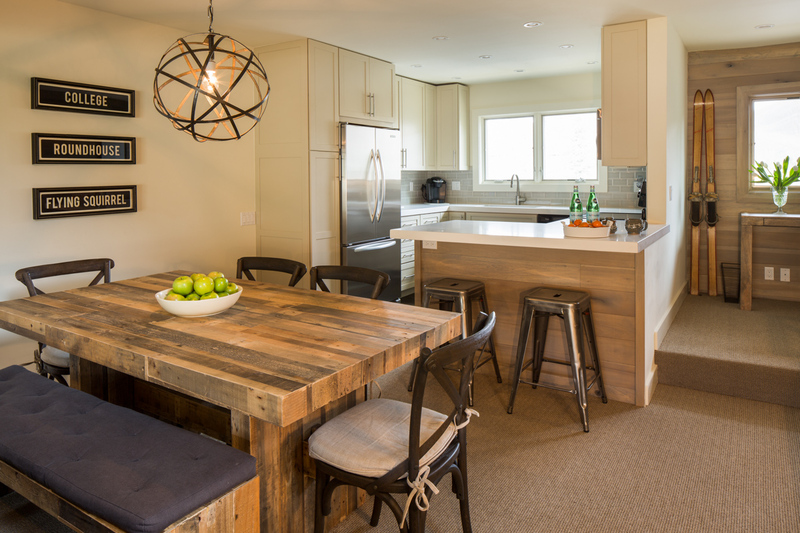 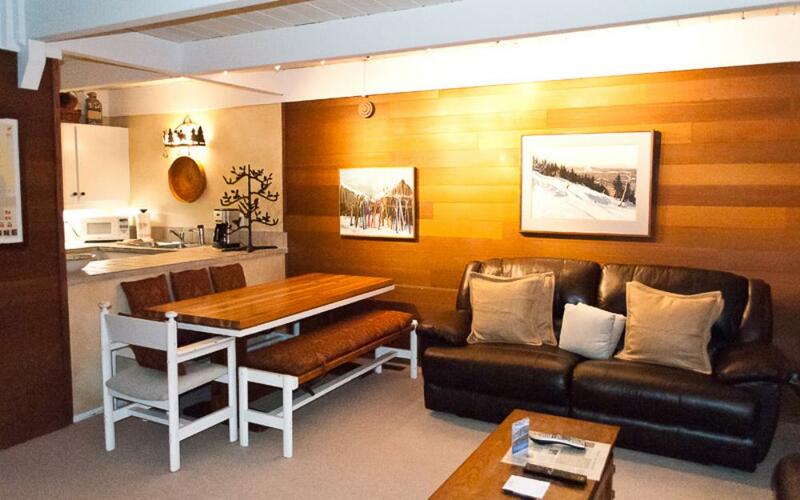 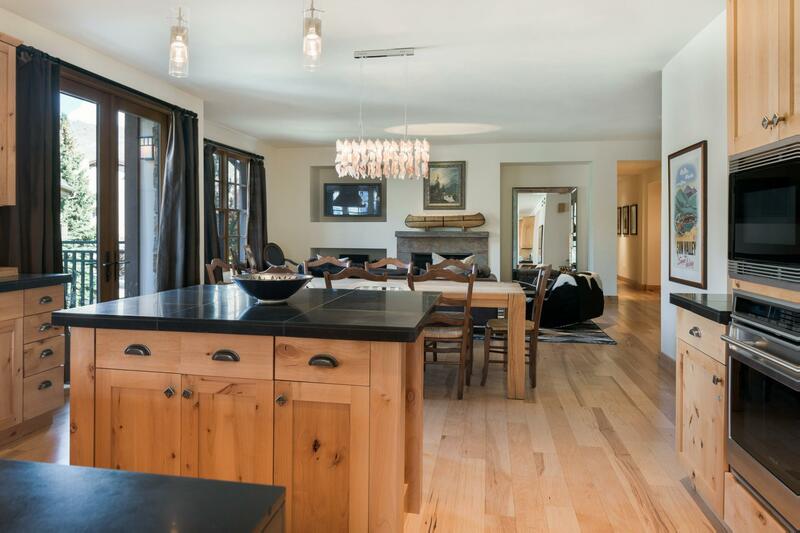 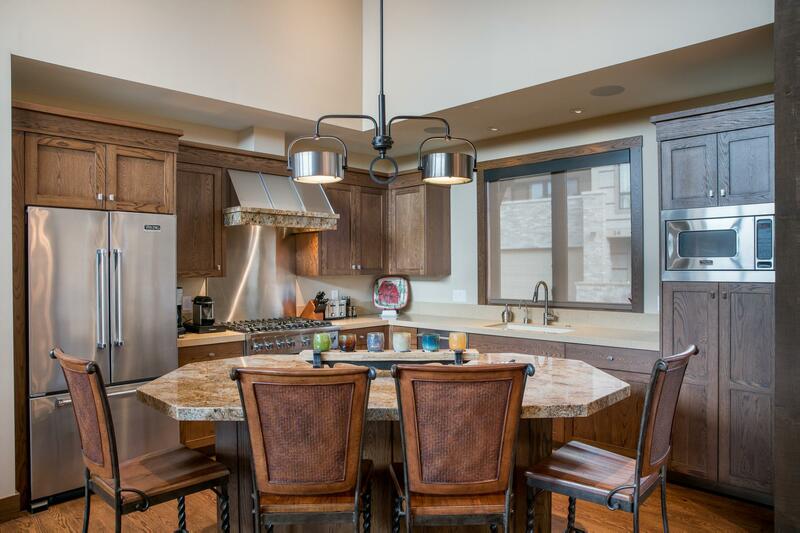 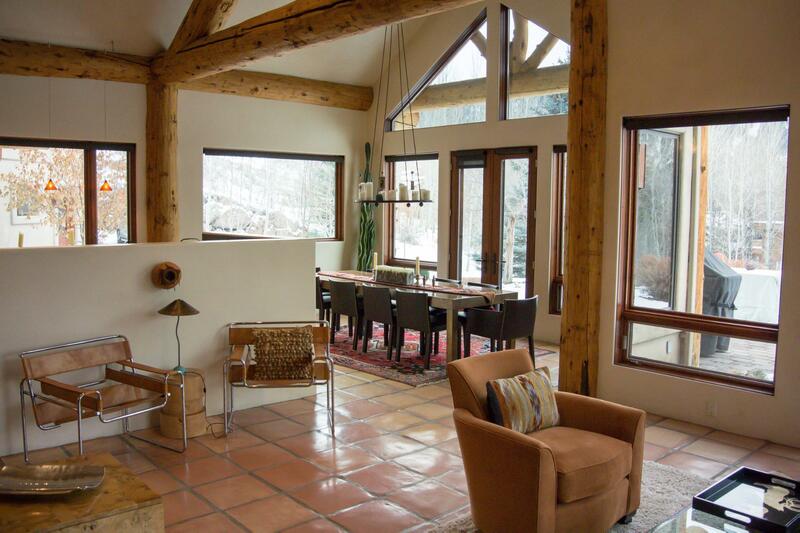 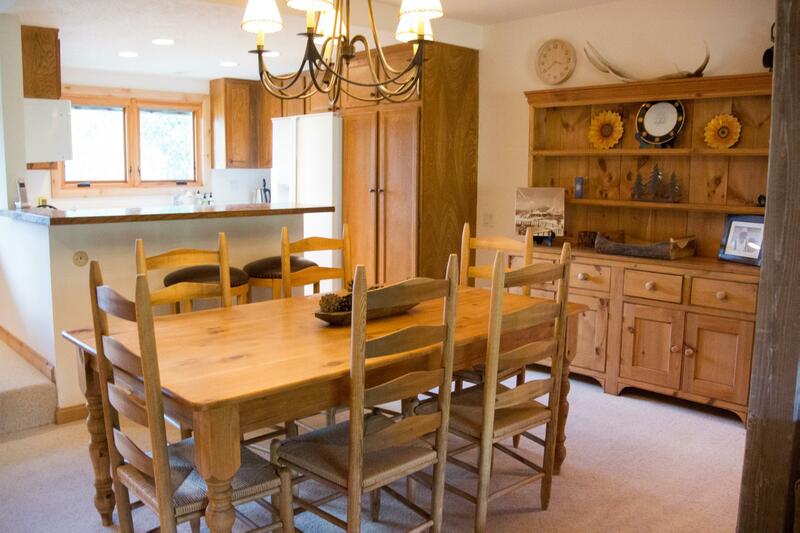 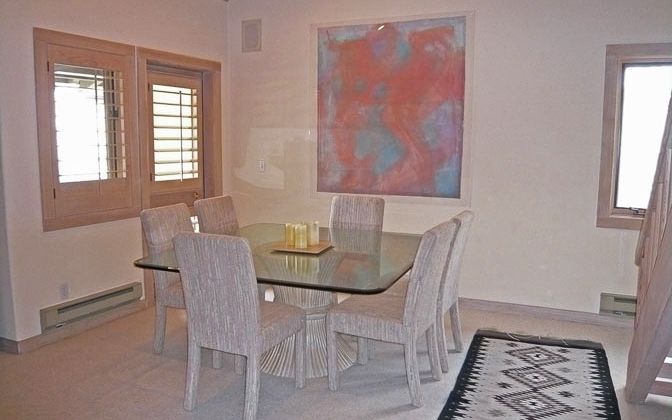 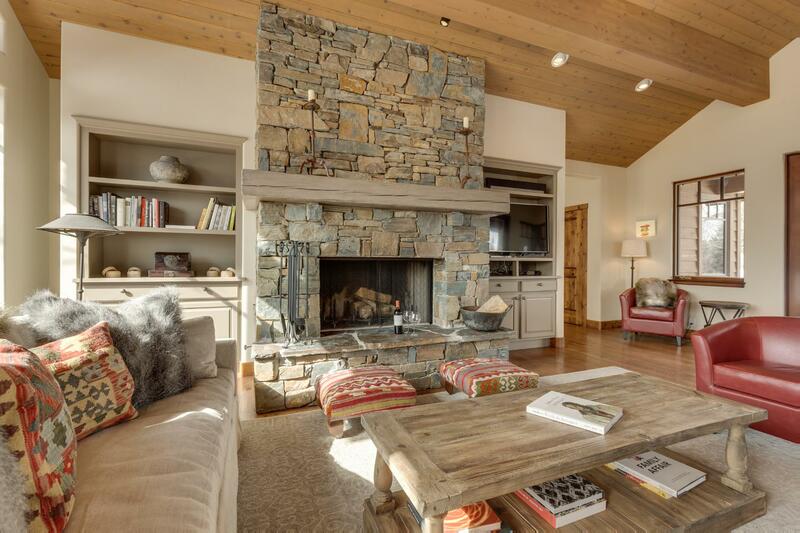 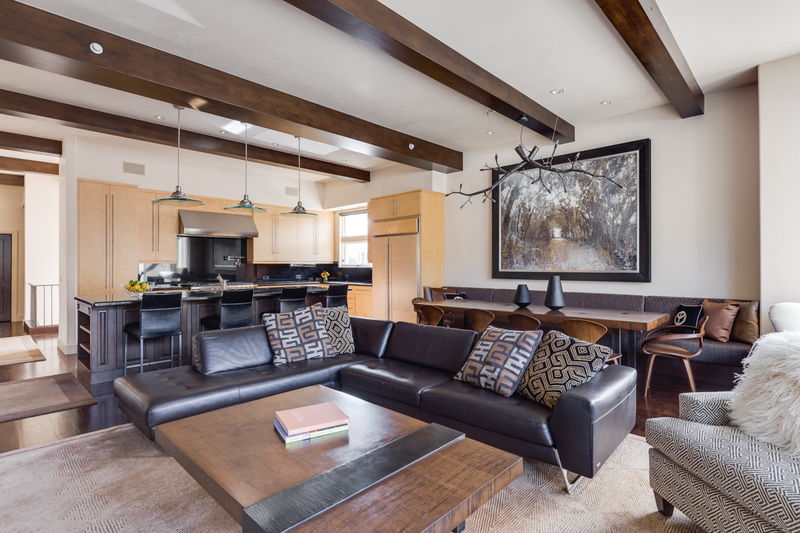 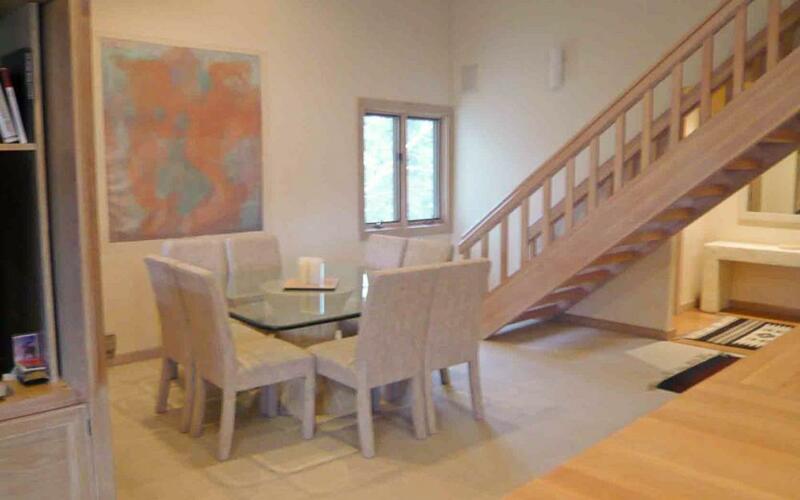 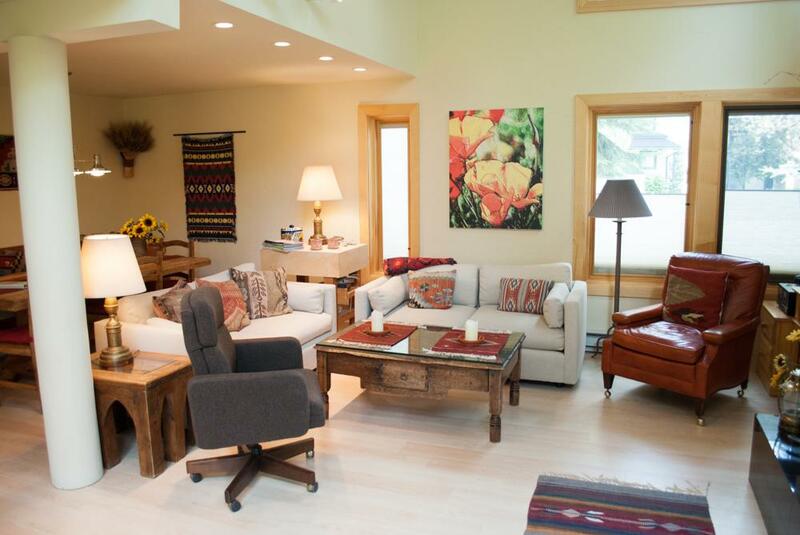 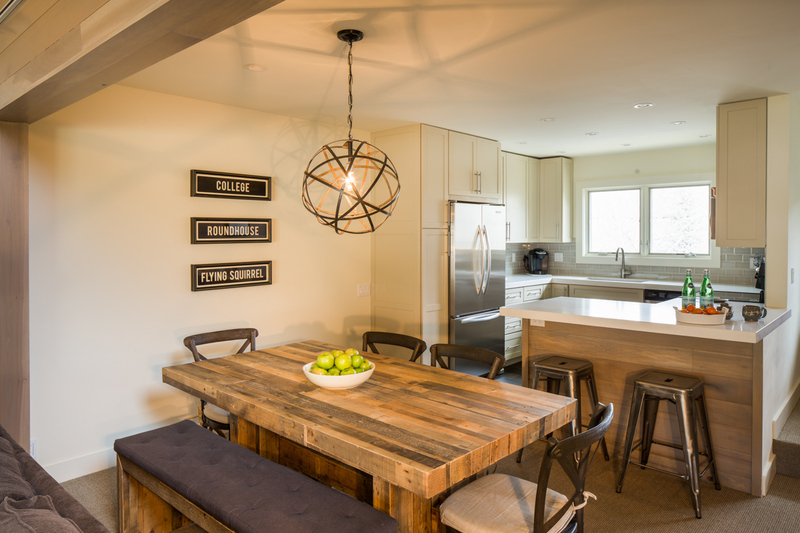 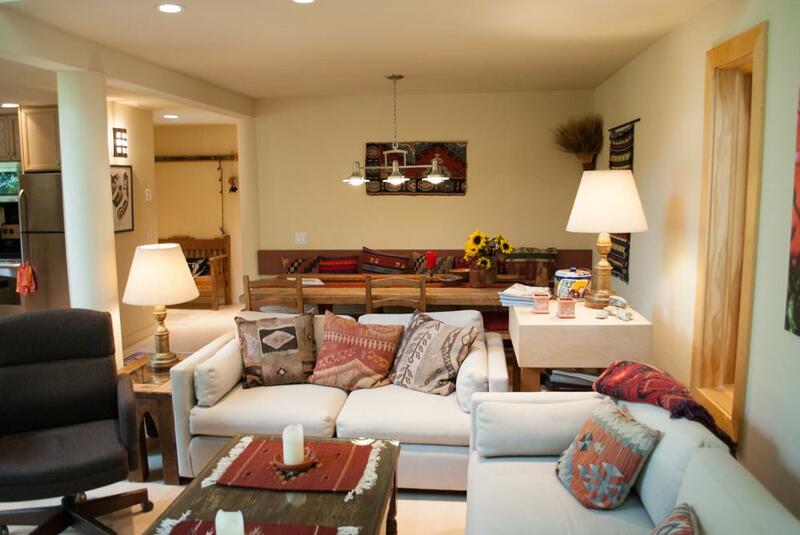 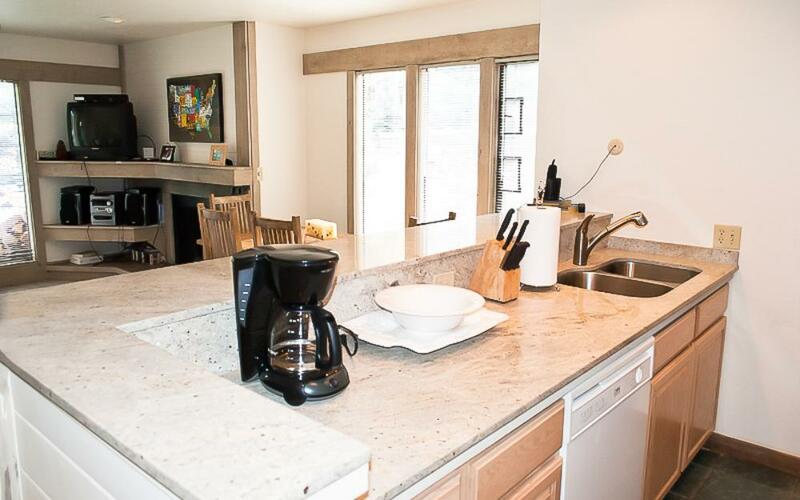 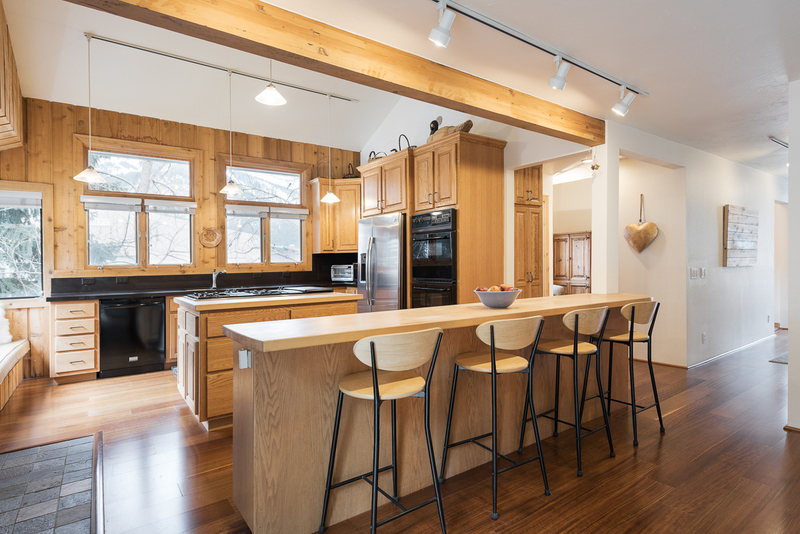 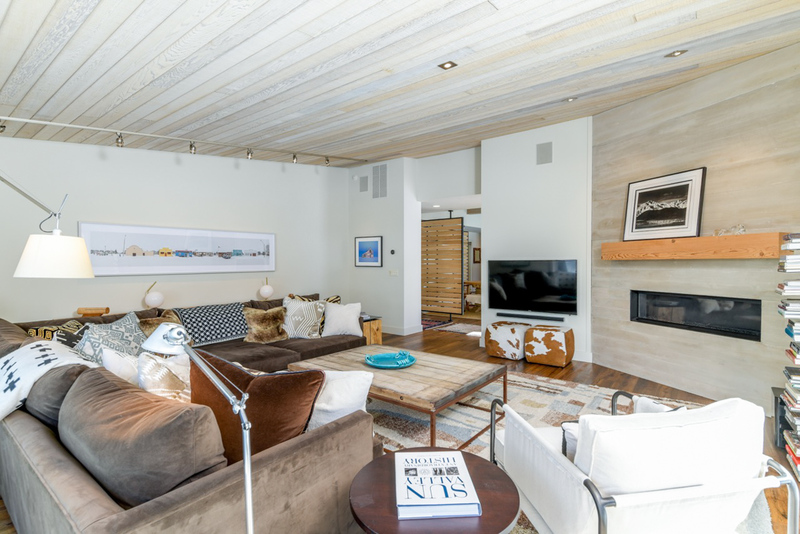 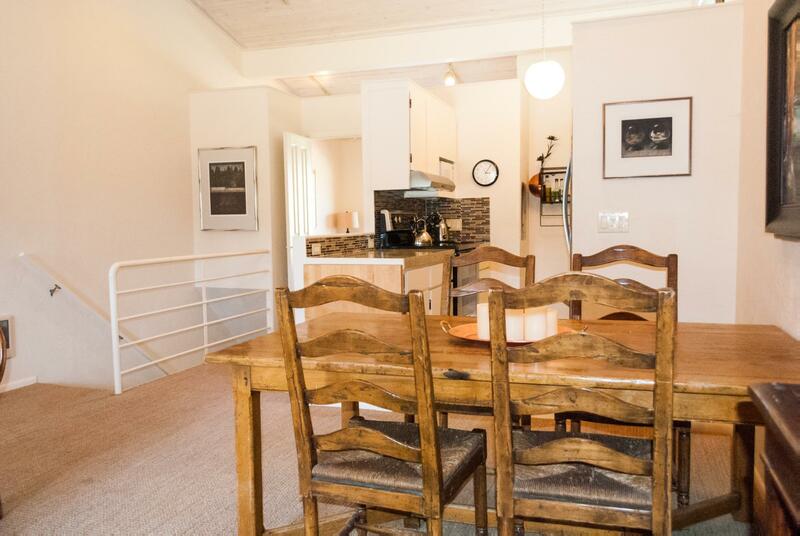 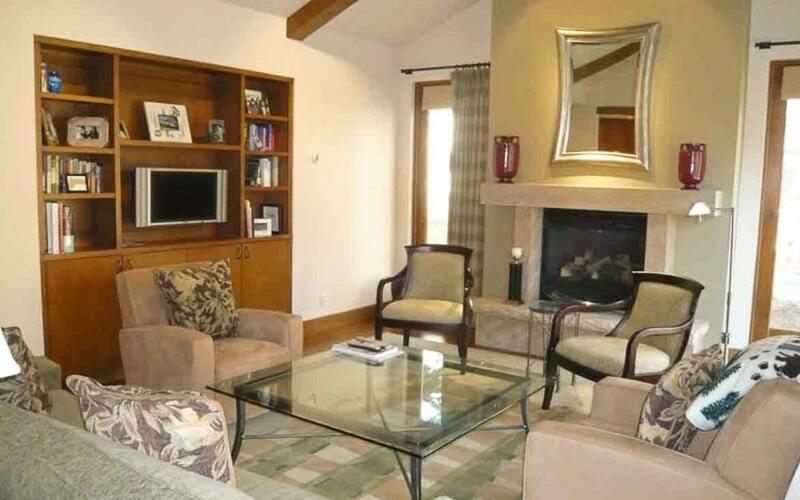 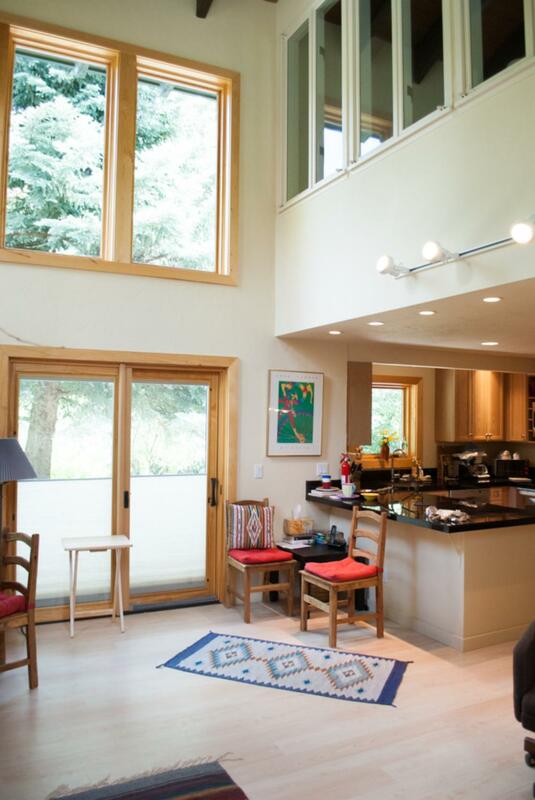 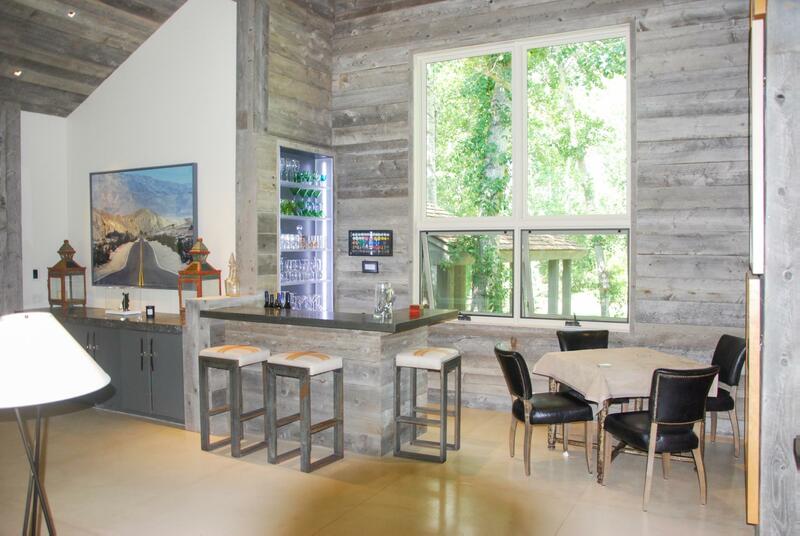 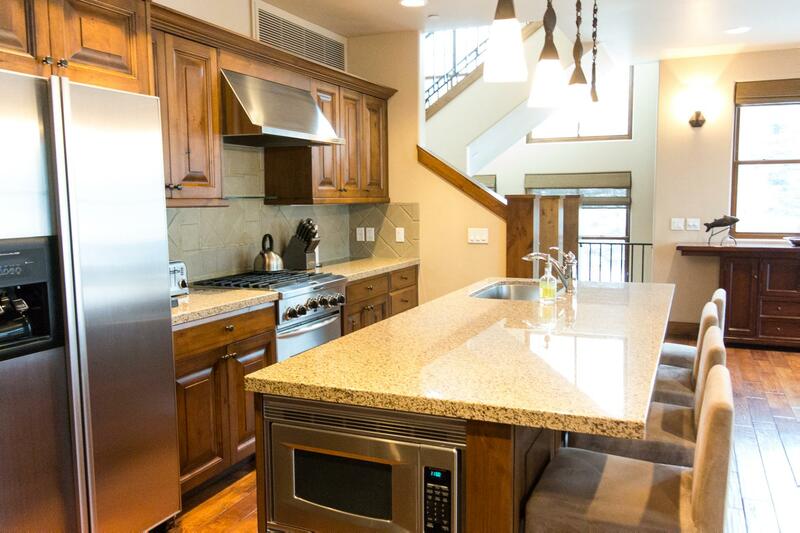 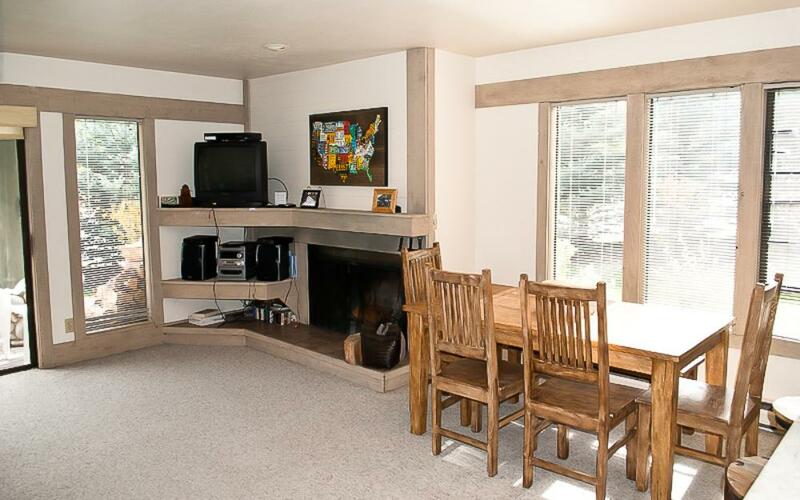 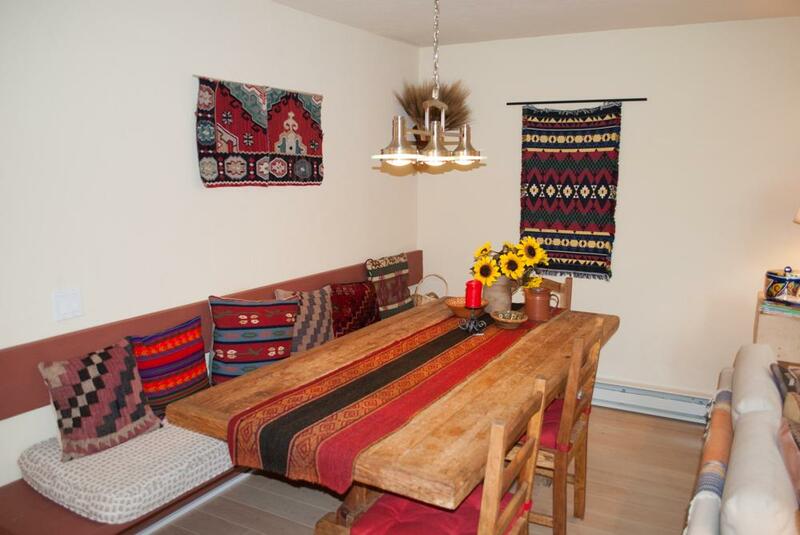 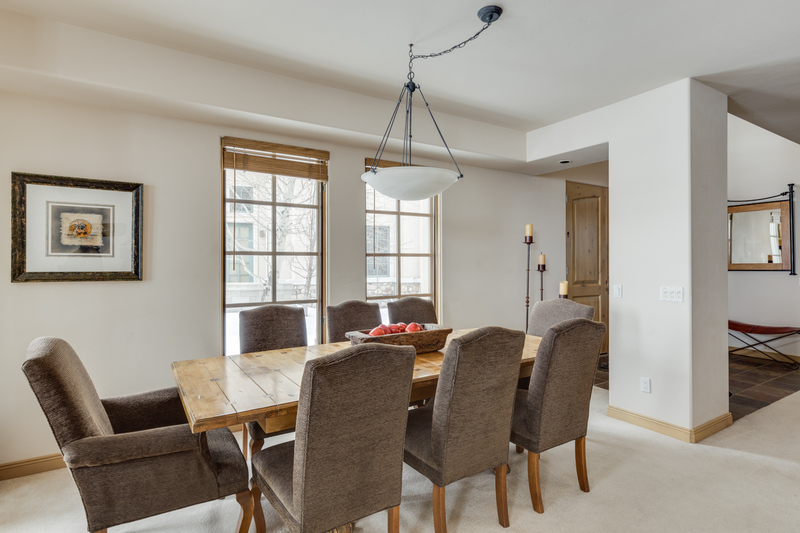 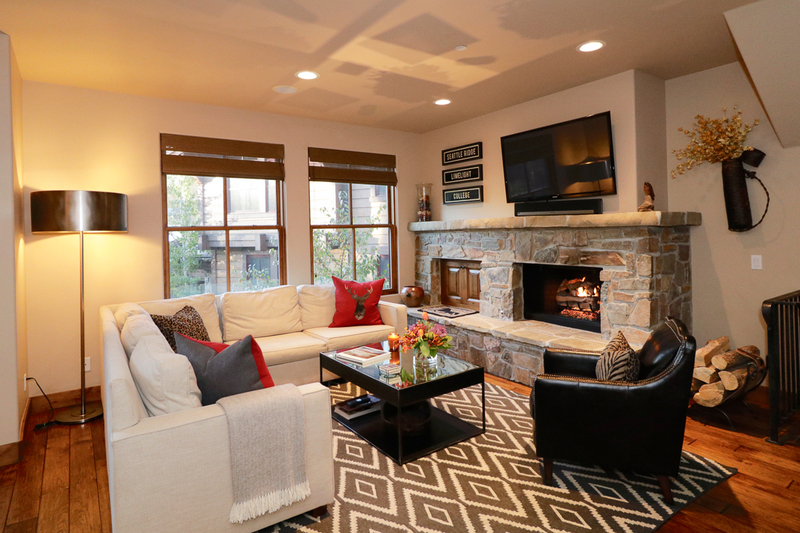 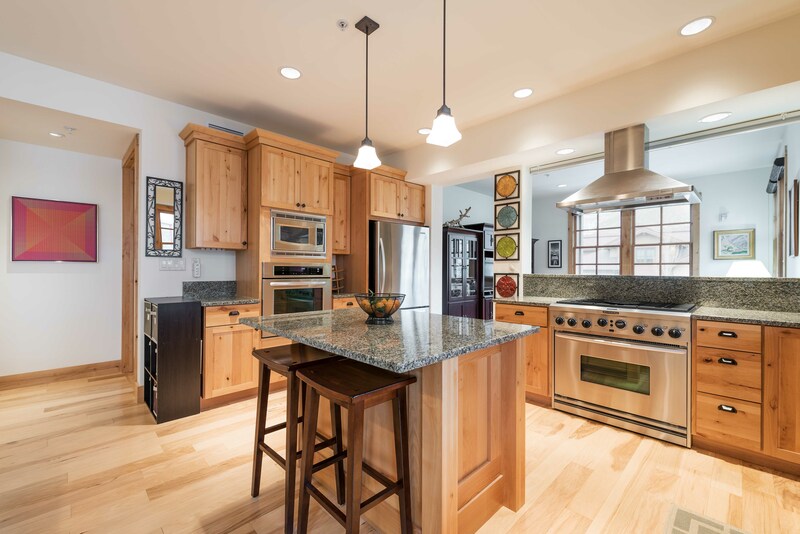 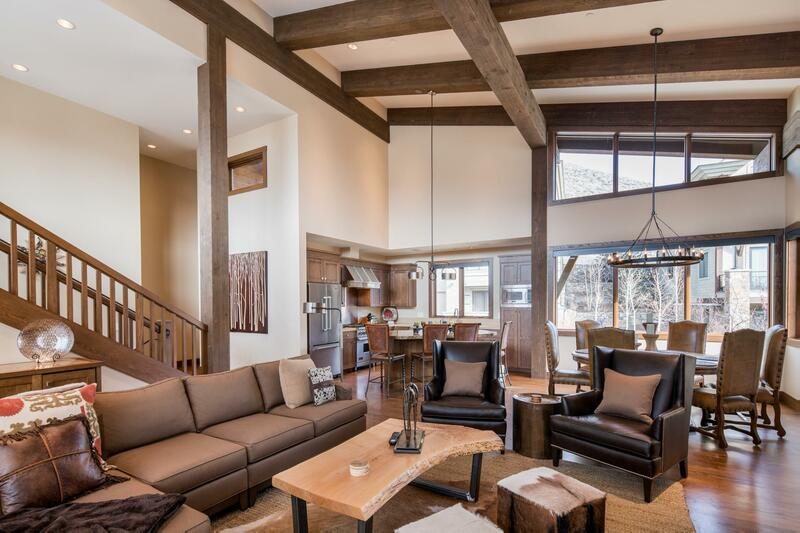 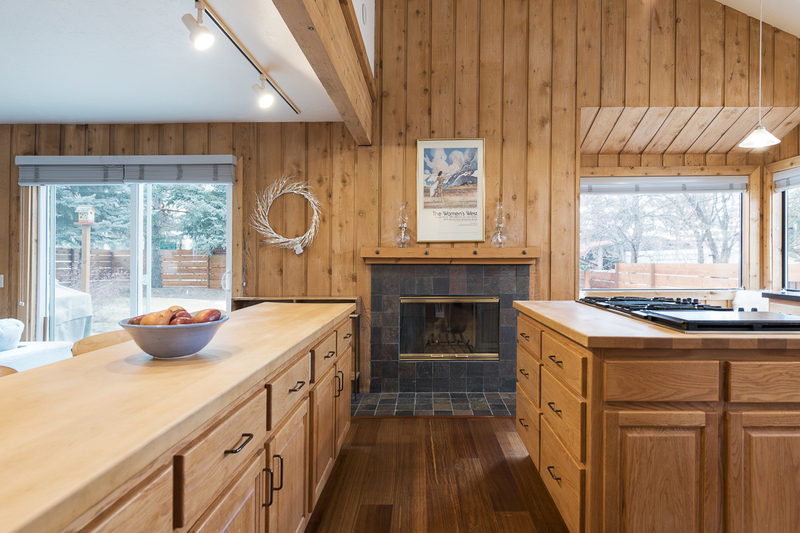 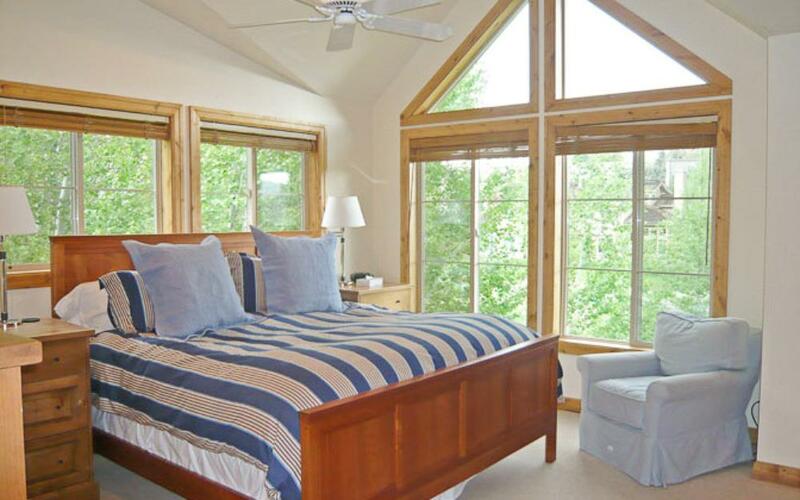 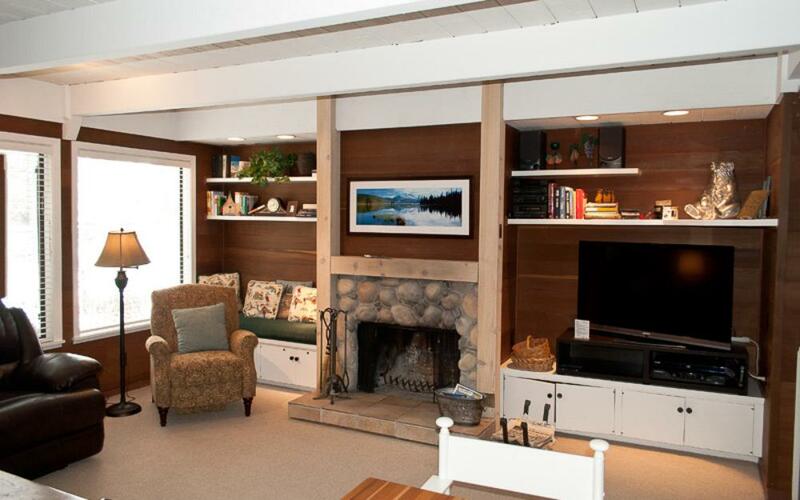 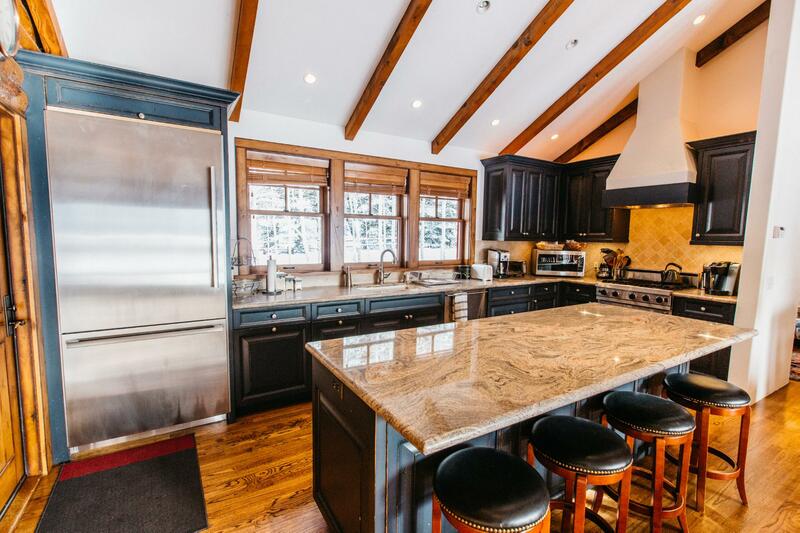 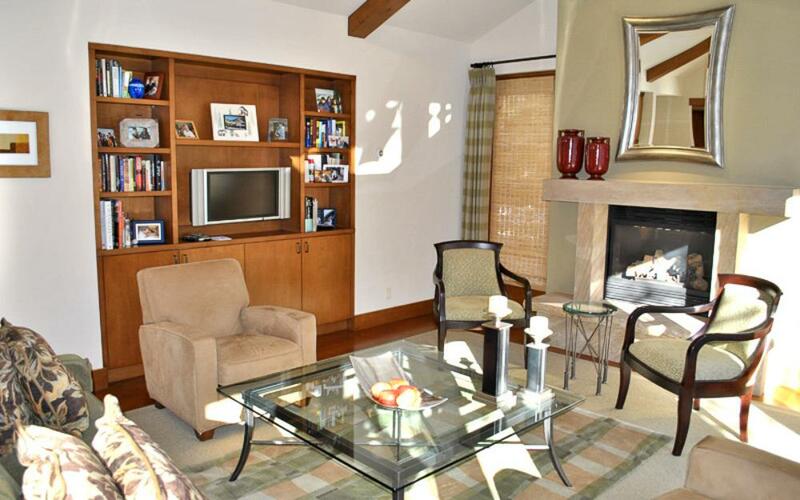 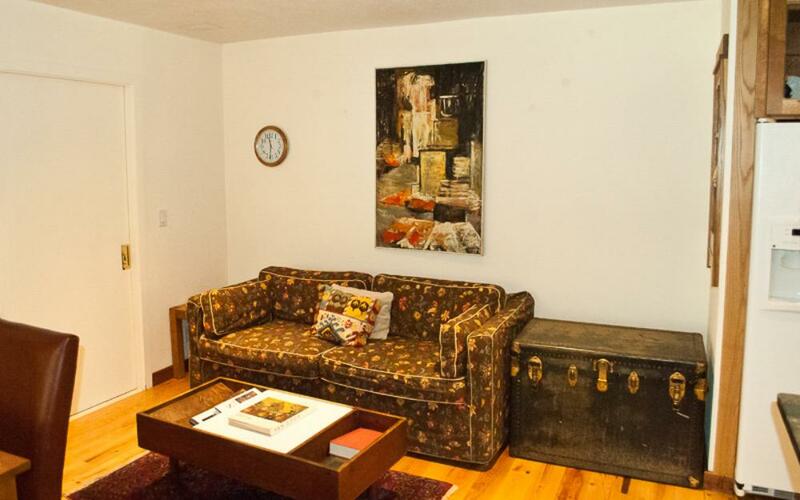 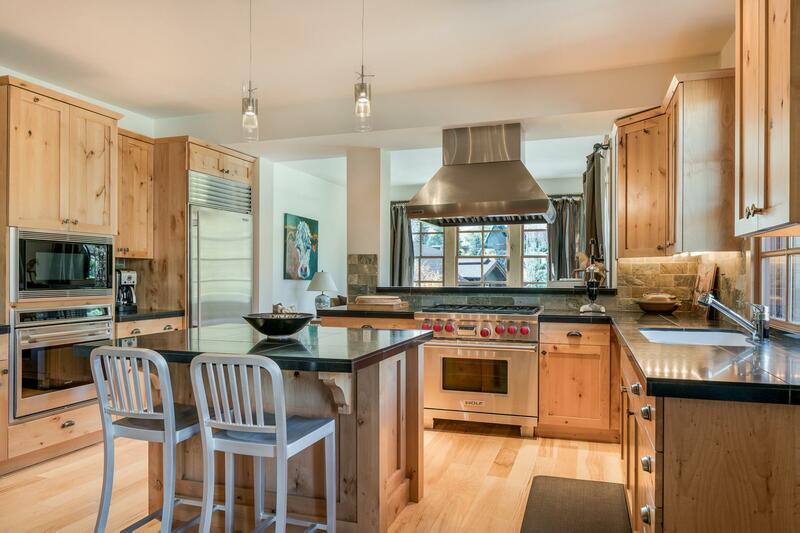 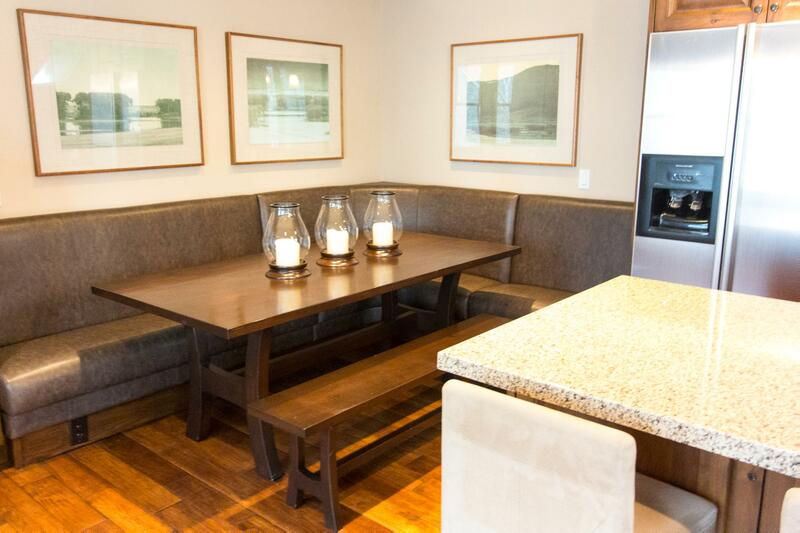 Modern, family-friendly townhome in downtown Ketchum with bunk room and mountain views. 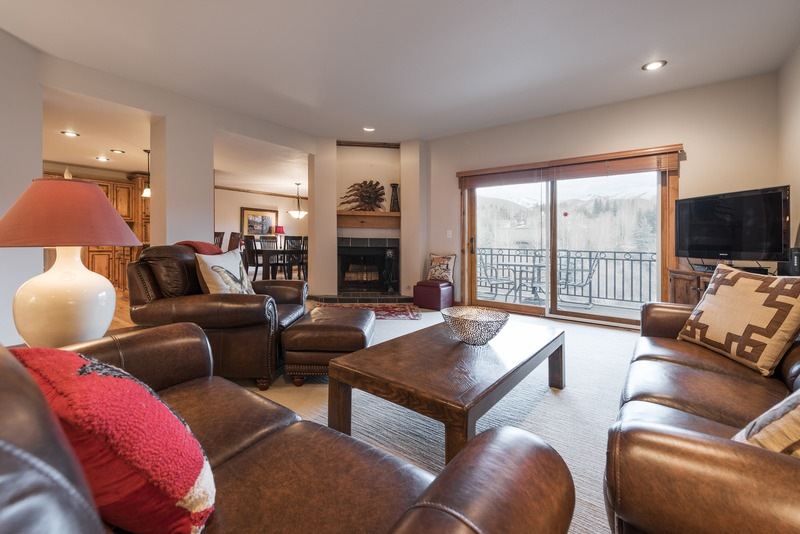 New family-friendly luxury condo with access to entire Sun Valley area, including Elkhorn Village pool, hot tub and tennis courts. 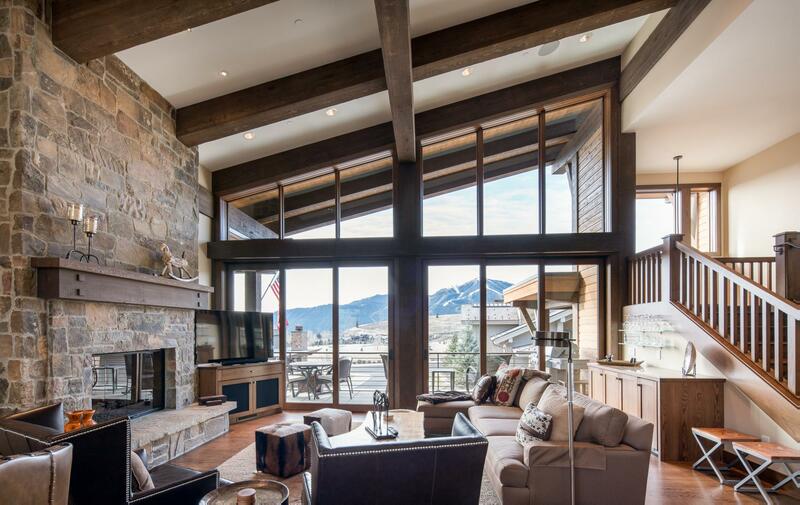 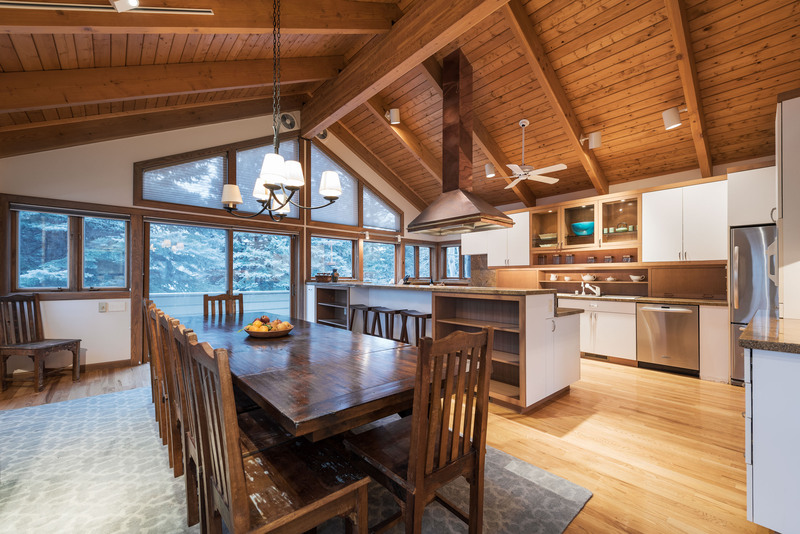 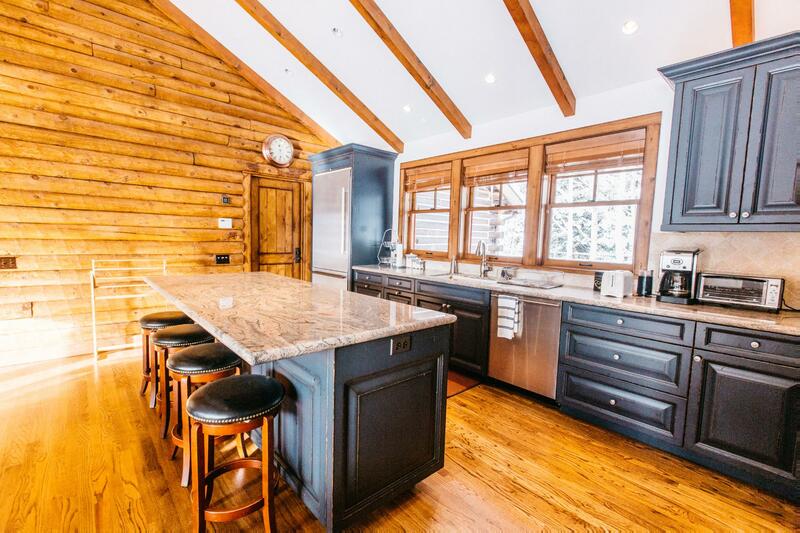 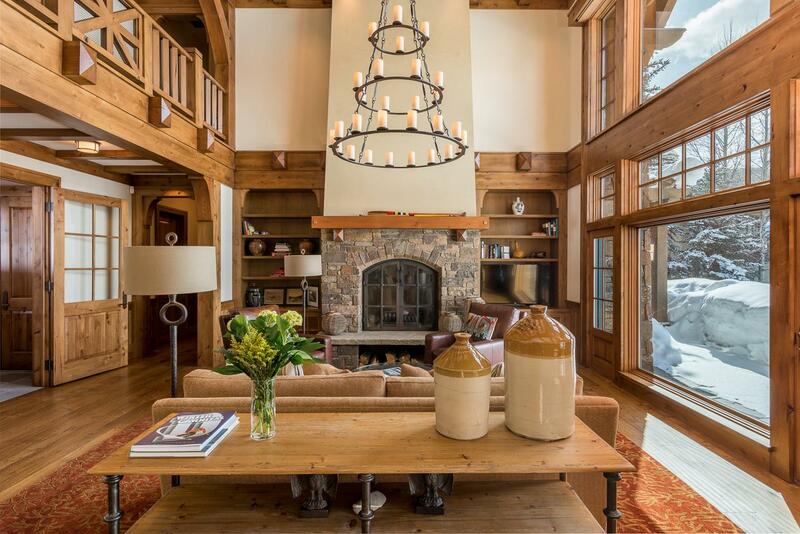 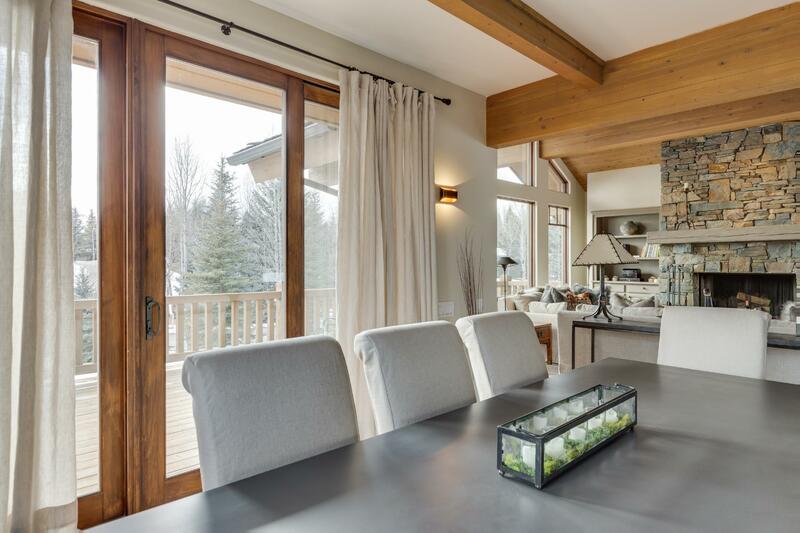 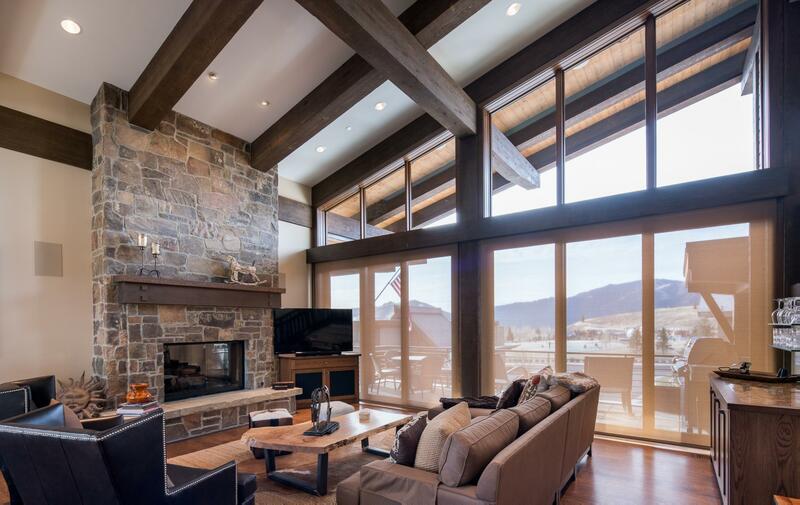 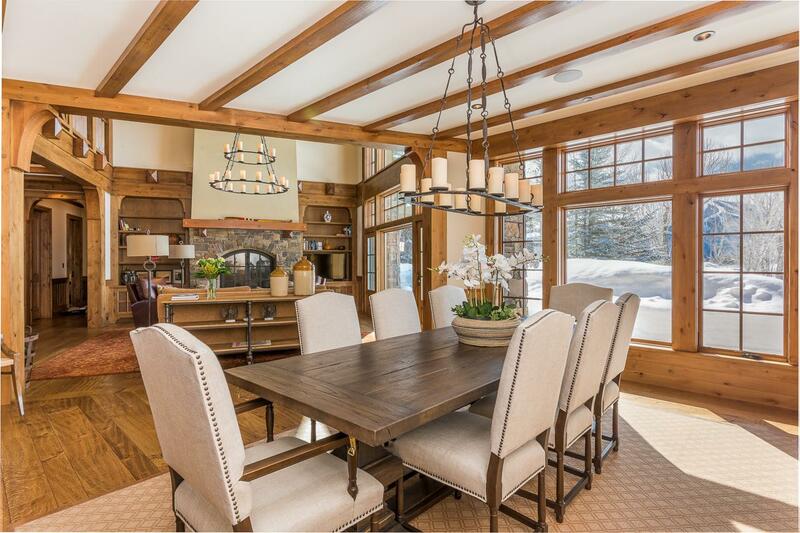 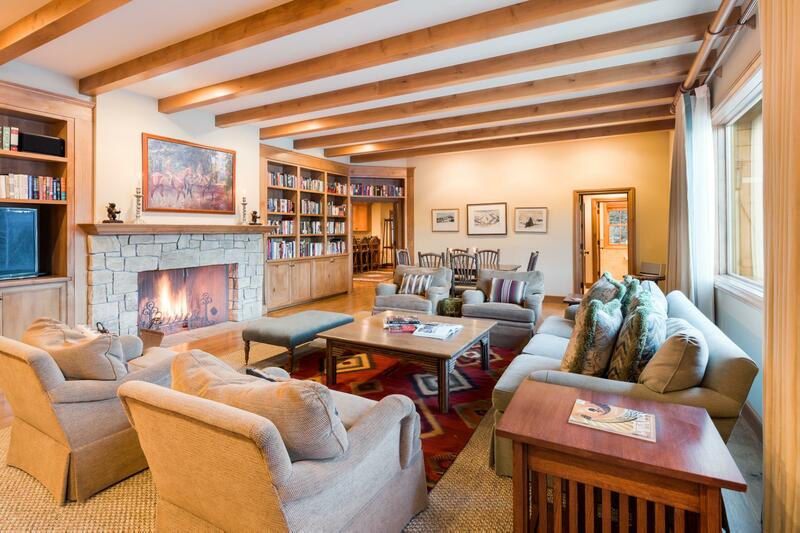 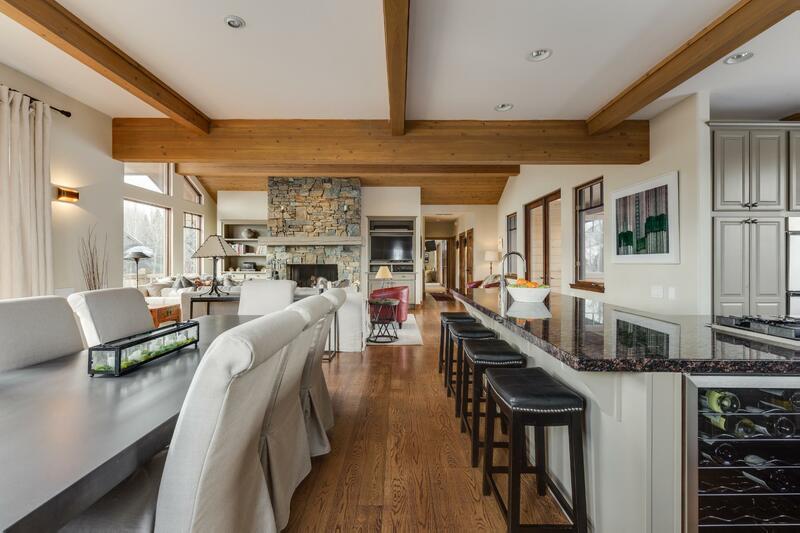 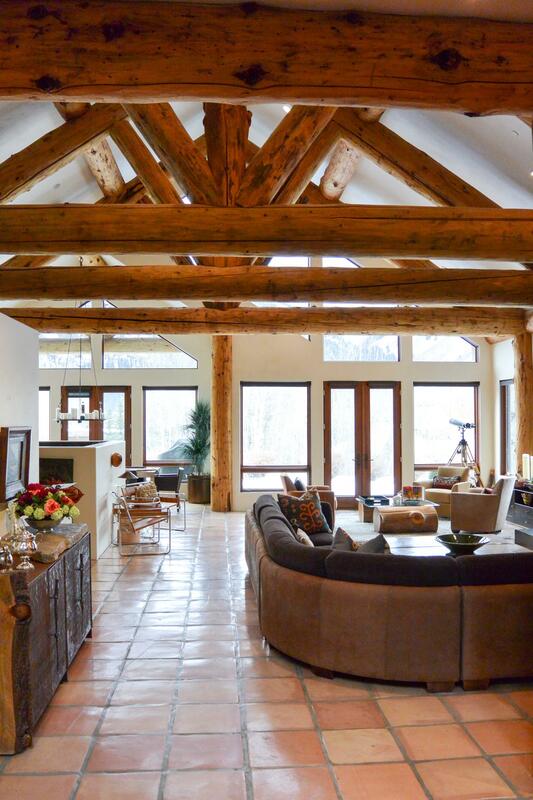 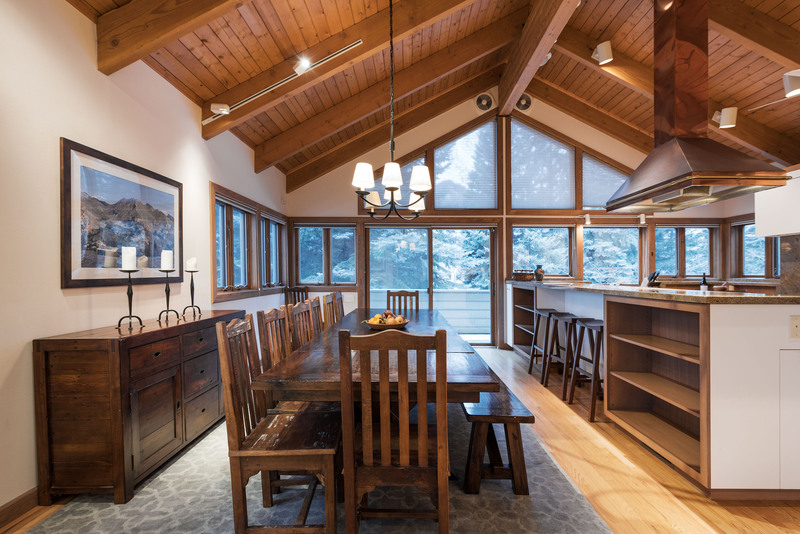 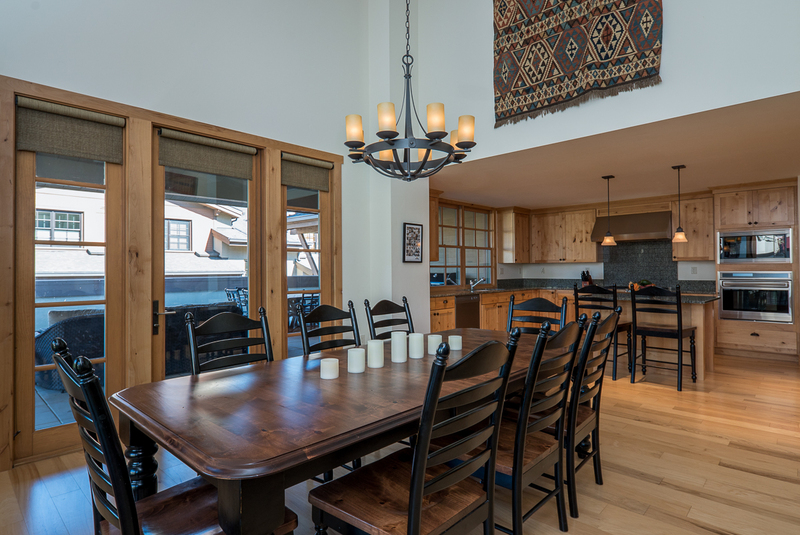 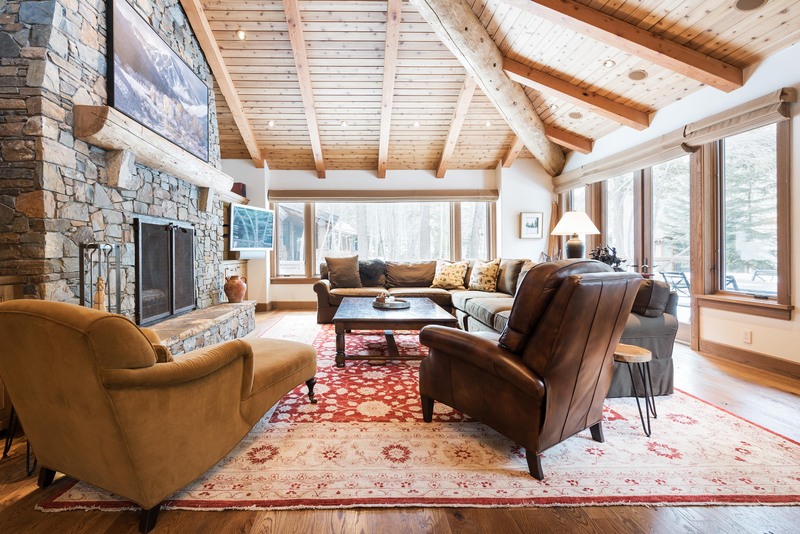 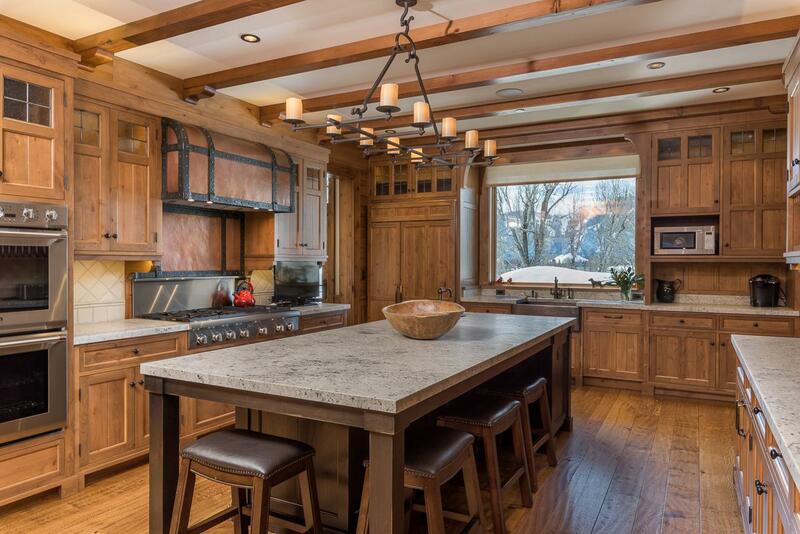 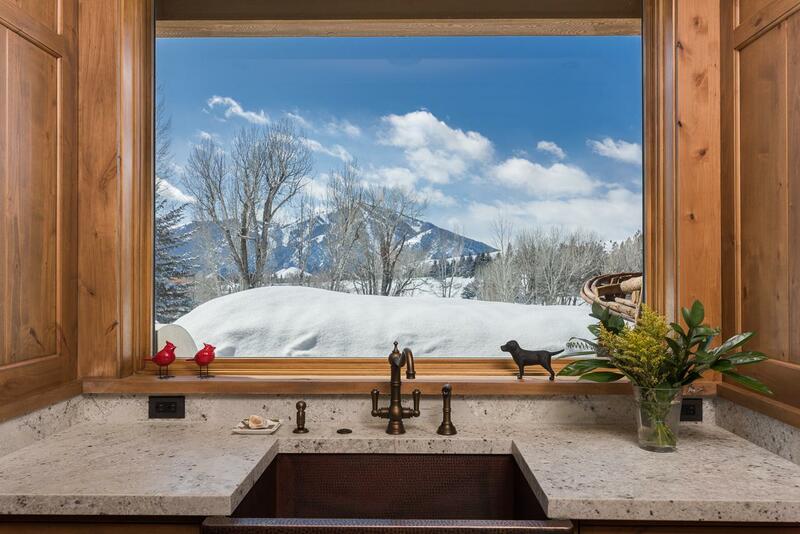 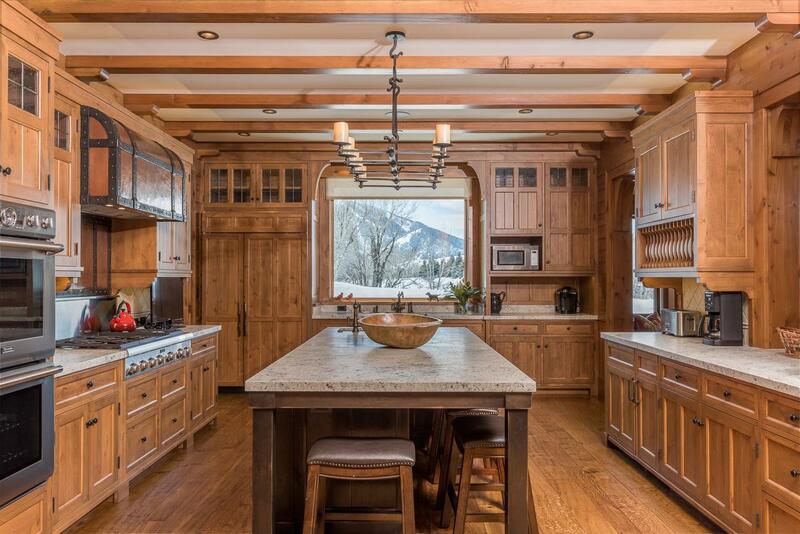 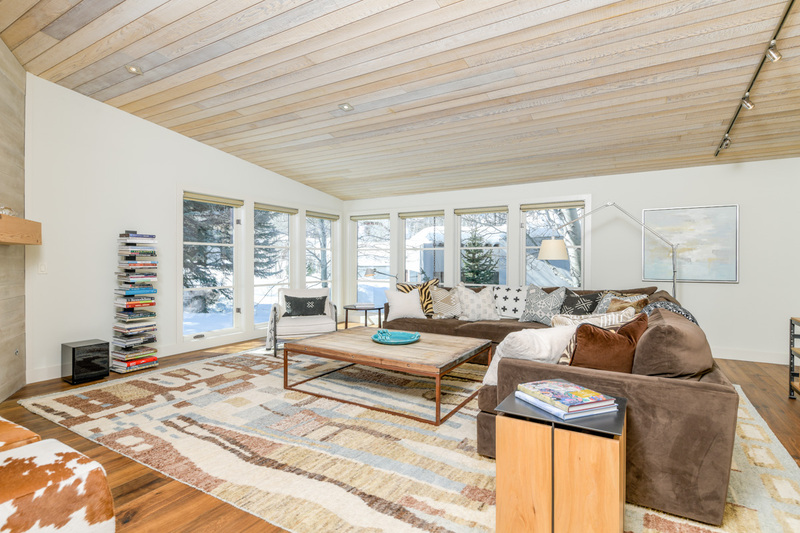 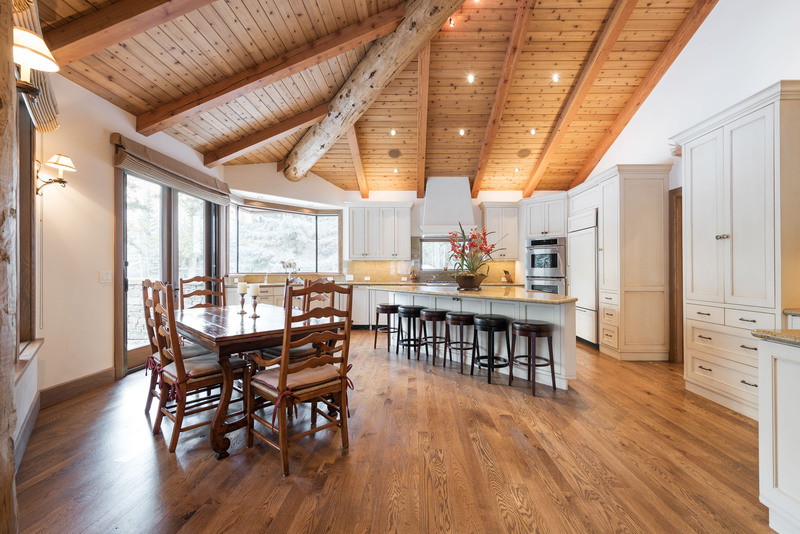 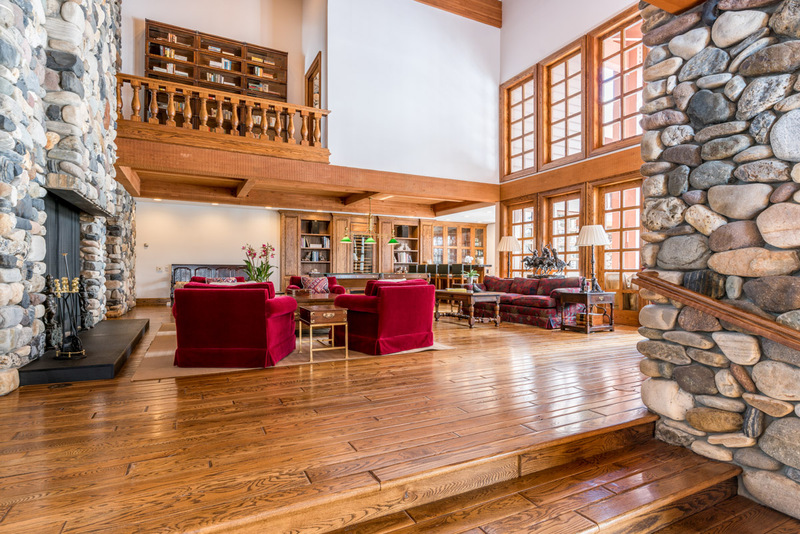 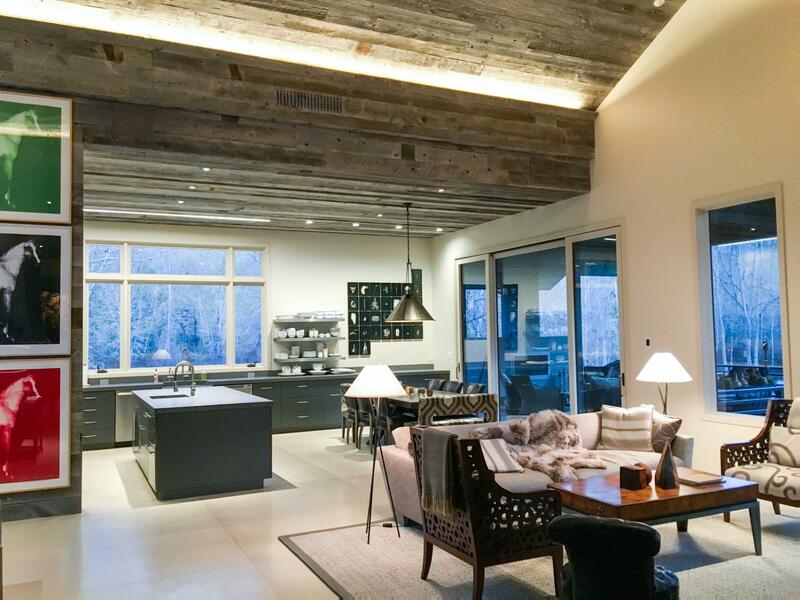 Private family-friendly ski home with unparalleled Bald Mountain views, centrally located between Bald Mountain and downtown Ketchum. 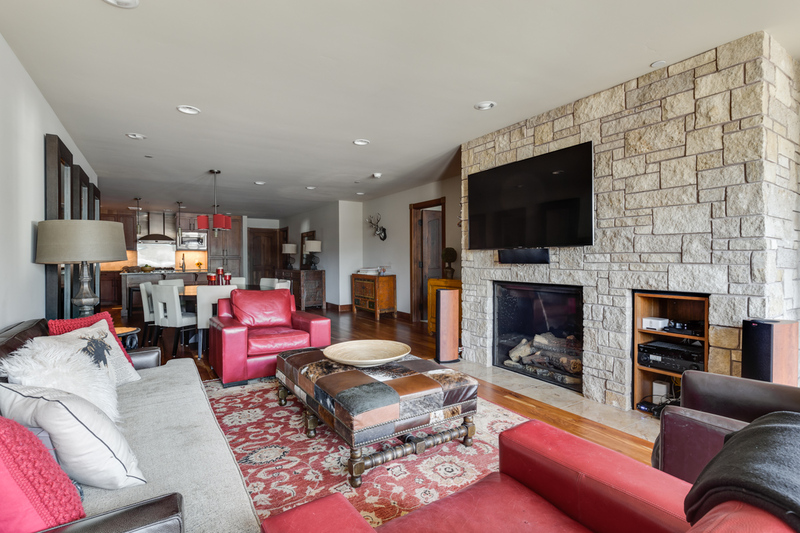 Private, recently remodeled sanctuary on Trail Creek with hardwood floors, top-of-the-line appliances and stunning river views. 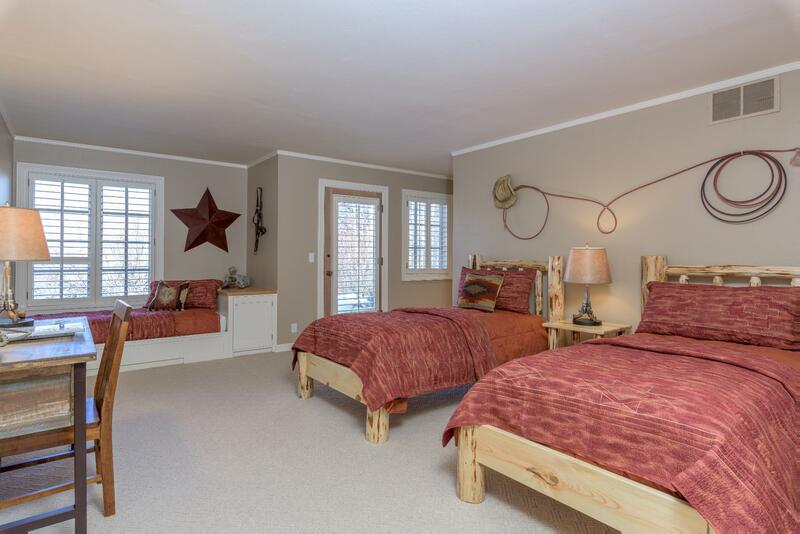 3-bedroom townhome in Elkhorn, great for families and within walking distance of playground, pool and tennis courts. 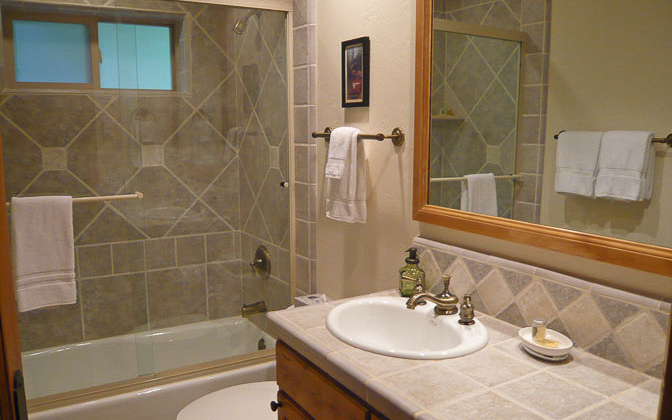 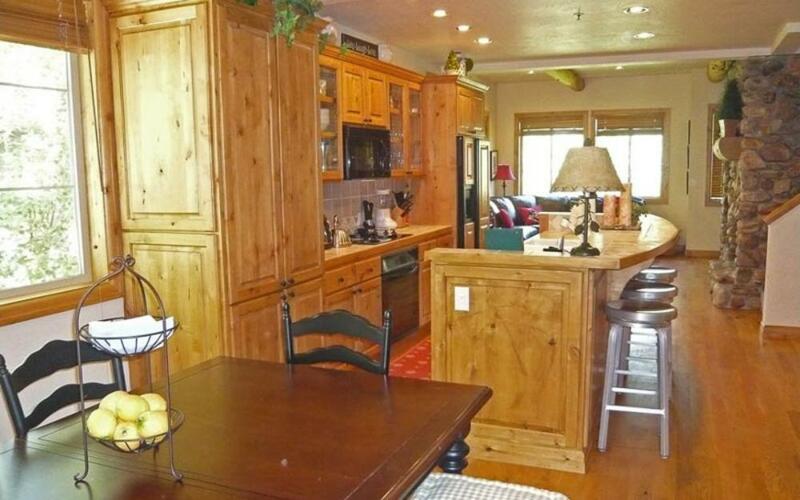 Completely remodeled townhome with mountain views in Elk Village -- walk to hot tub, tennis courts and summer-use pool. 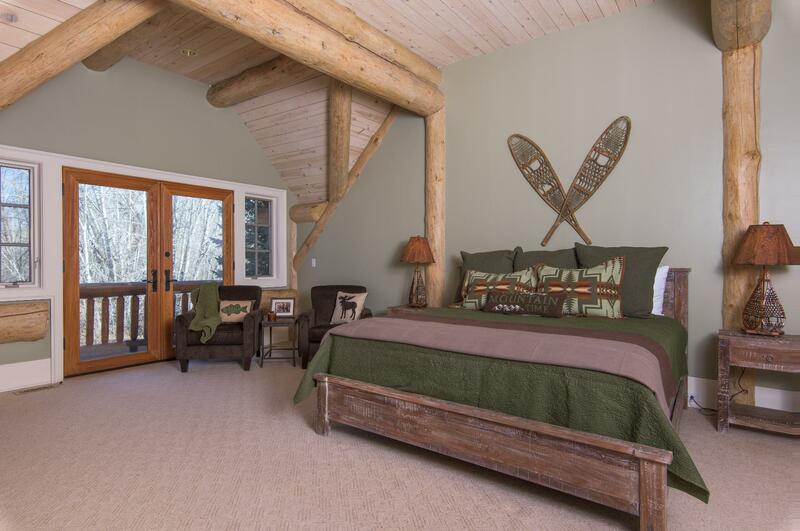 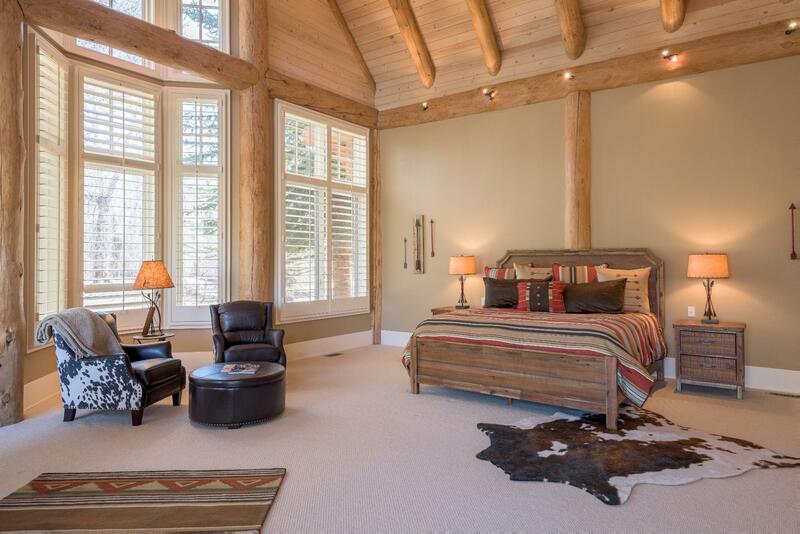 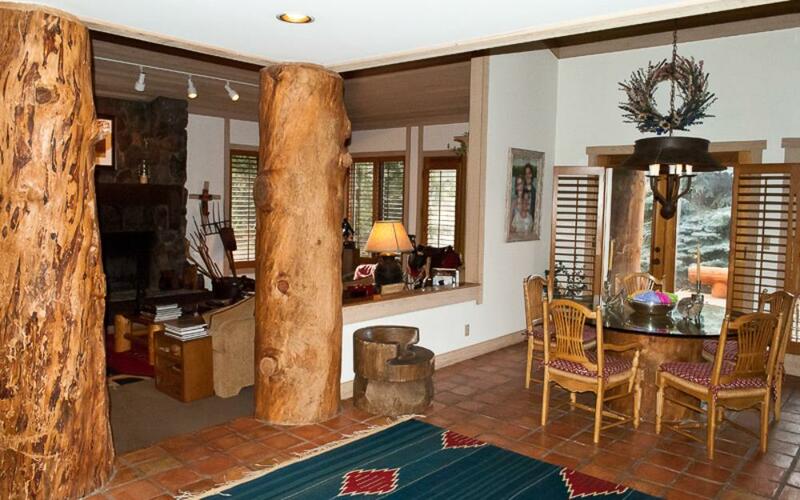 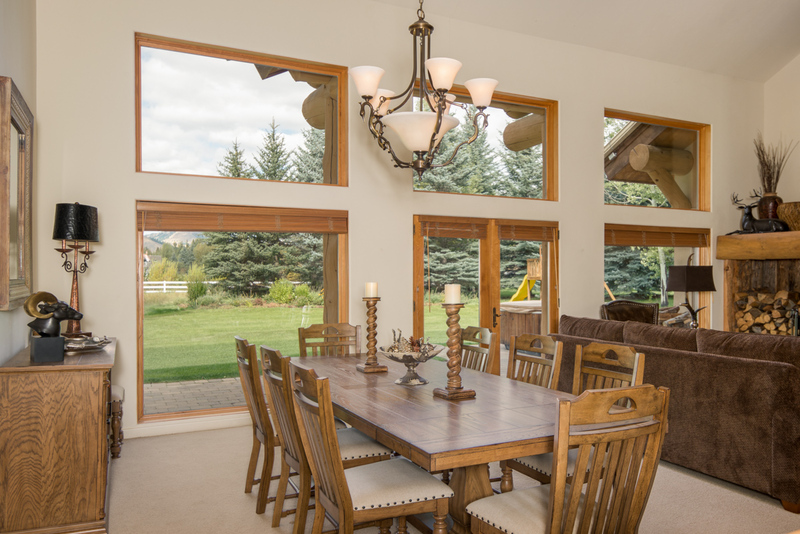 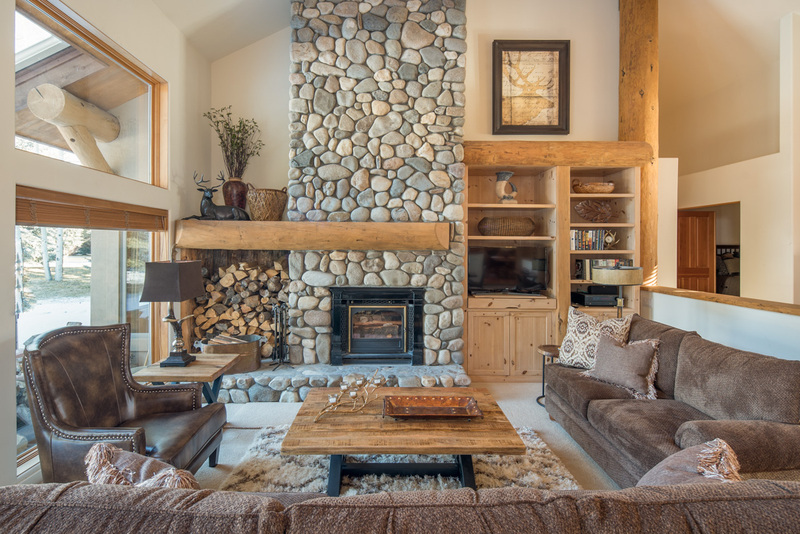 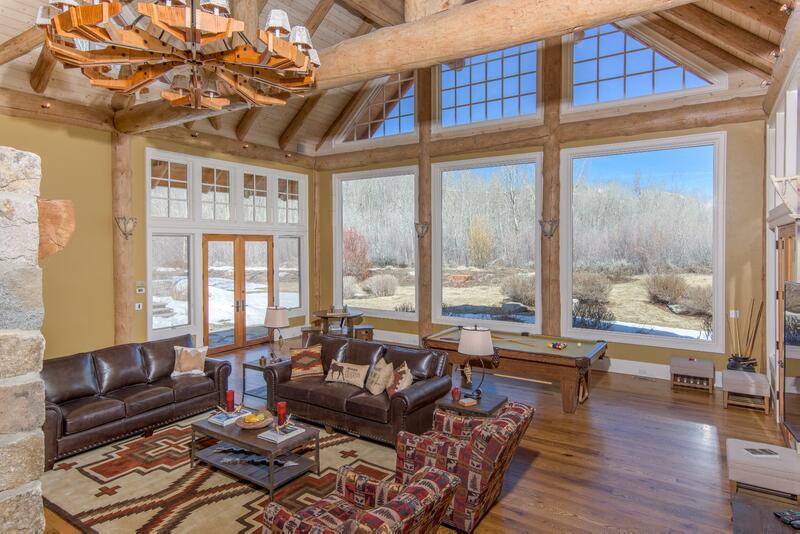 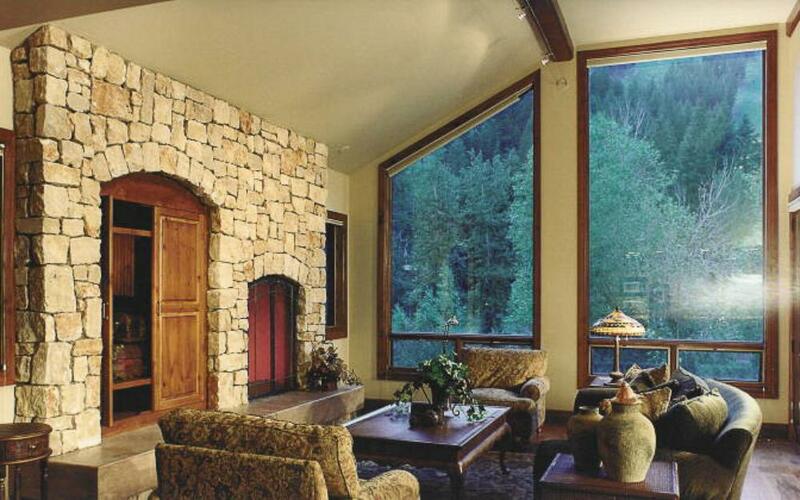 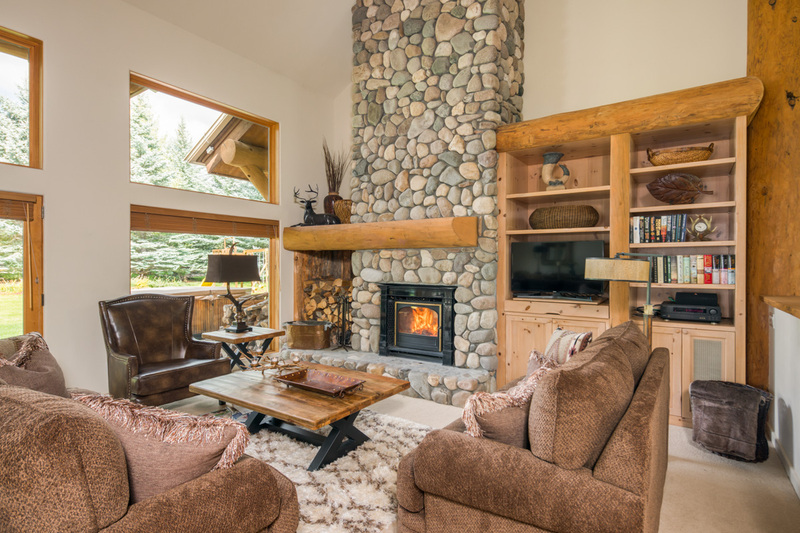 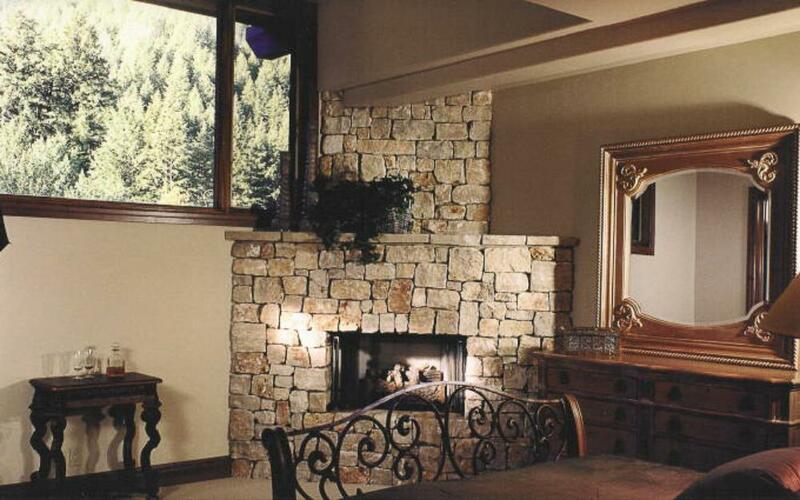 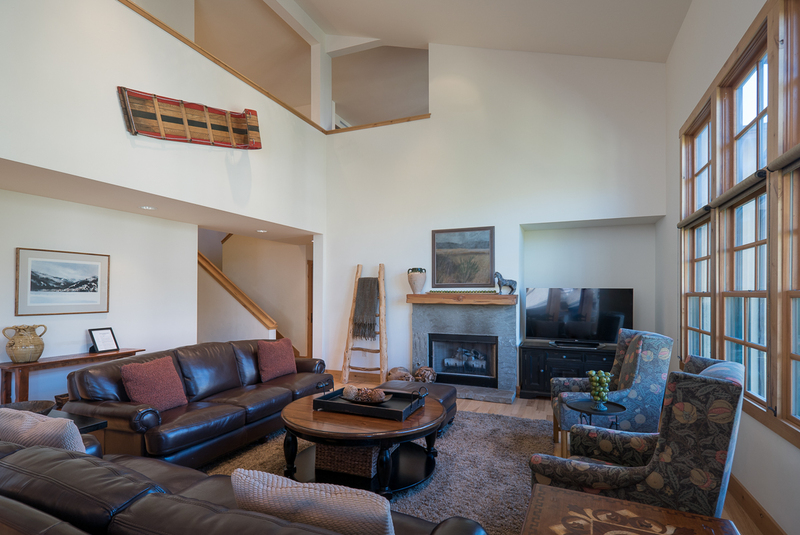 Inviting retreat above Warm Springs Creek with hot tub, river rock fireplaces and mountain views. 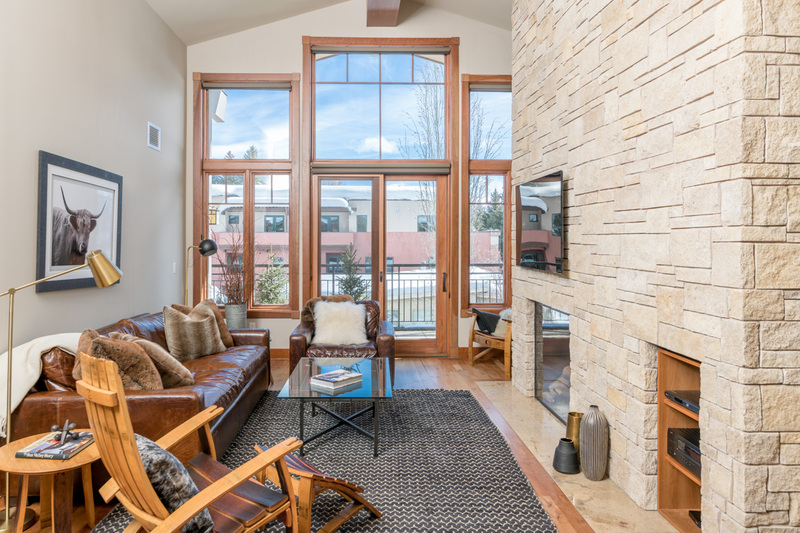 Modern luxury home in exclusive Golden Eagle neighborhood with spectacular mountain views, fire pit, fitness suite, and library. 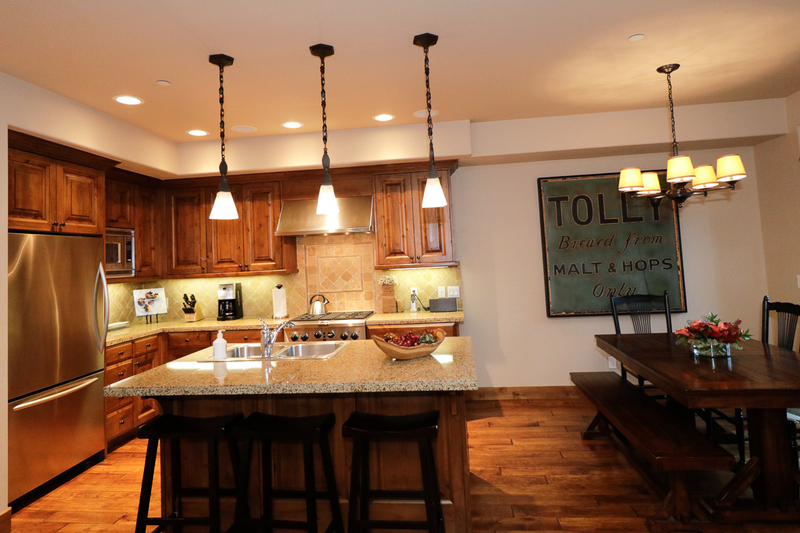 Luxury townhomes at the base of Warm Springs with creek and mountain views -- every detail considered. 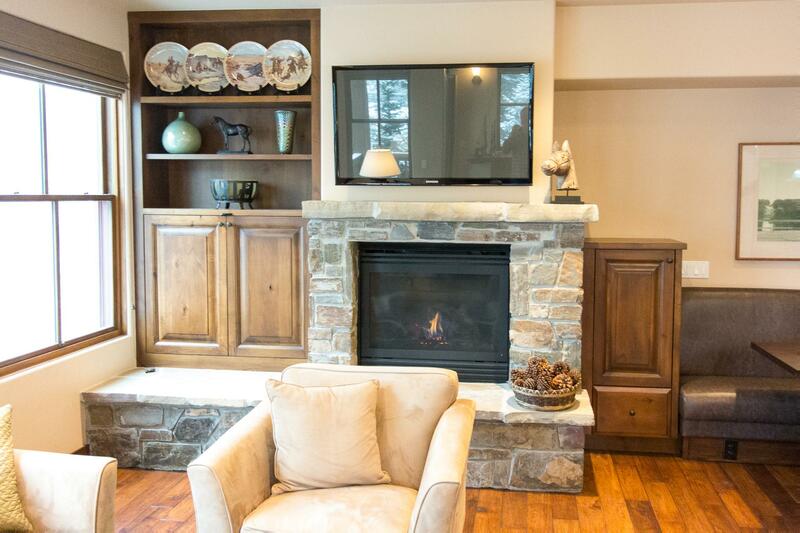 Clubhouse amenities included. 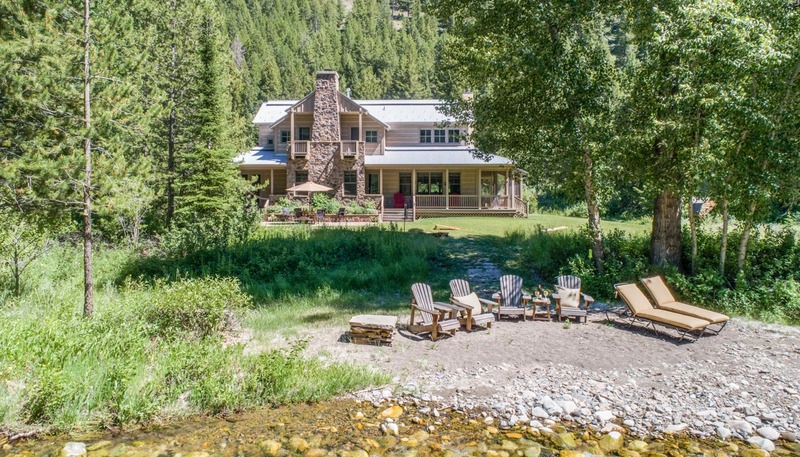 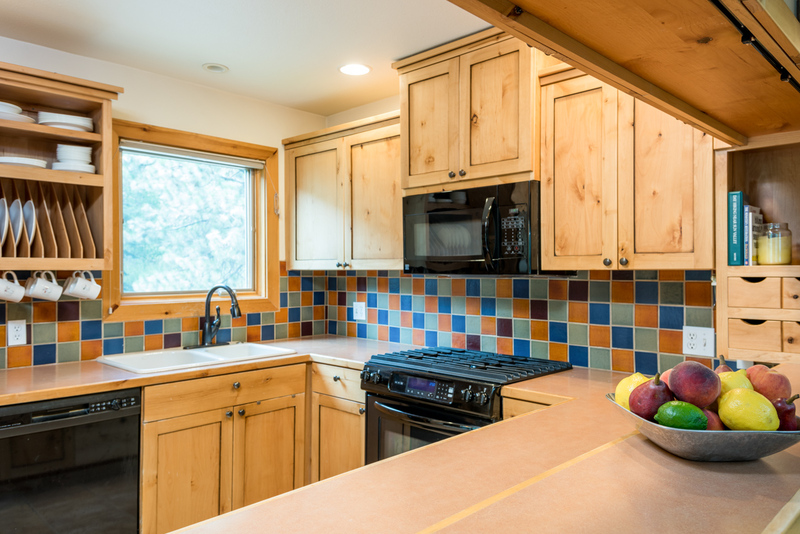 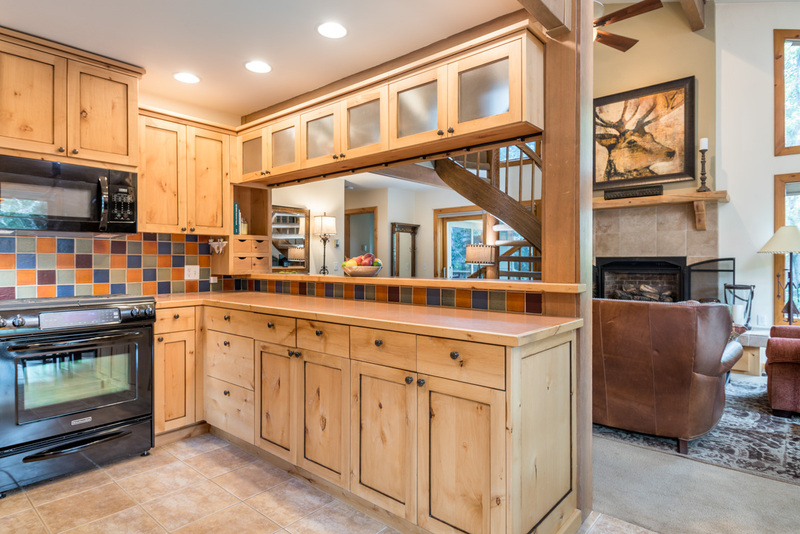 Spacious home on Big Wood River, surrounded by mountain trails -- enjoy direct access to trout fishing, hiking, biking and cross-country skiing. 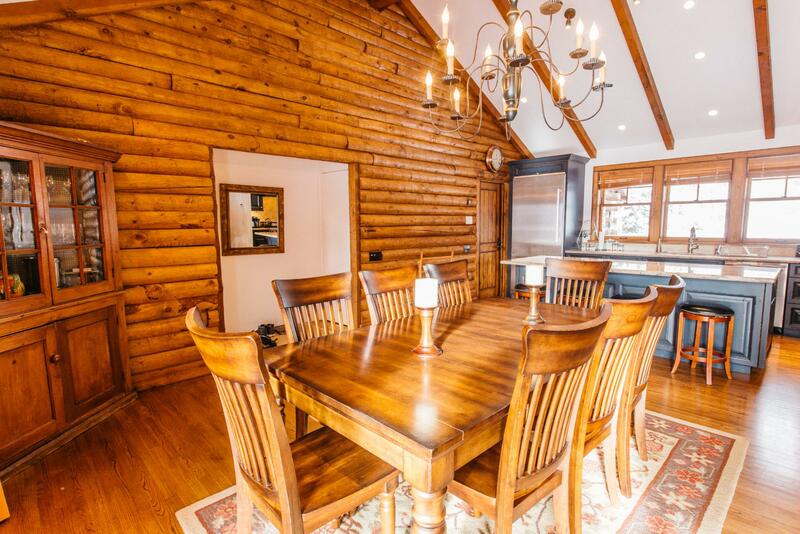 Inviting log cabin and separate apartment on sprawling grounds with abundant wildlife, offering private fishing access and walking paths. 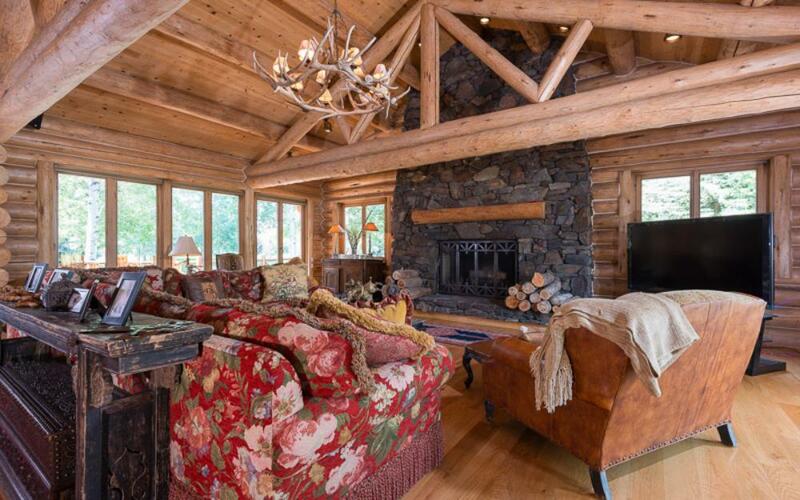 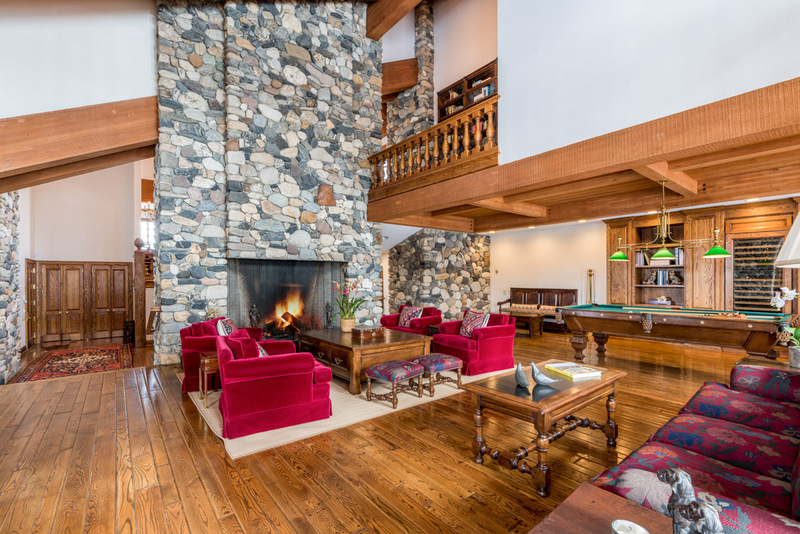 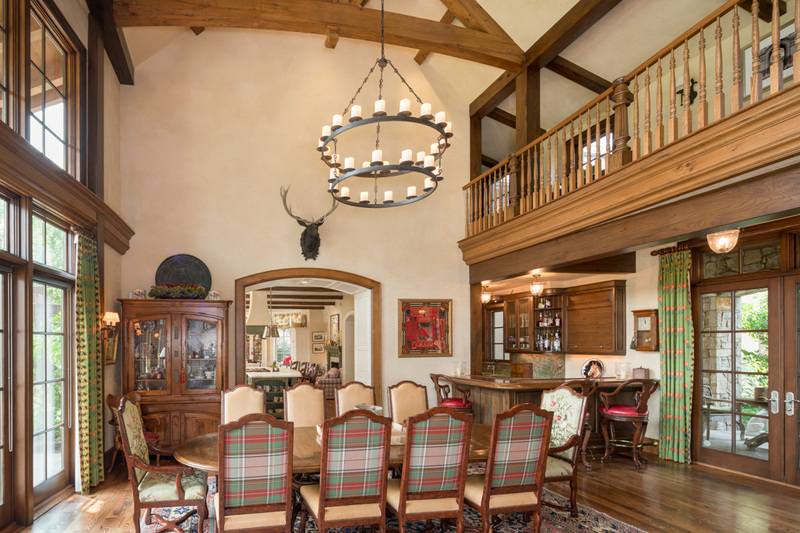 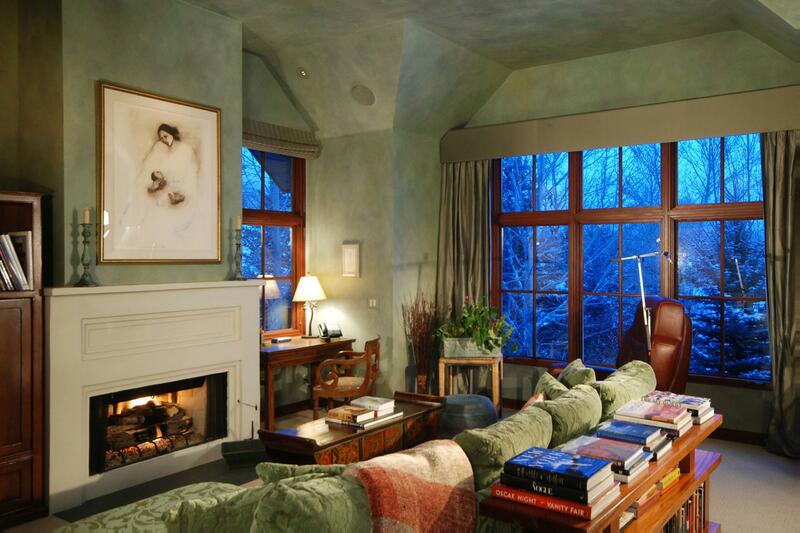 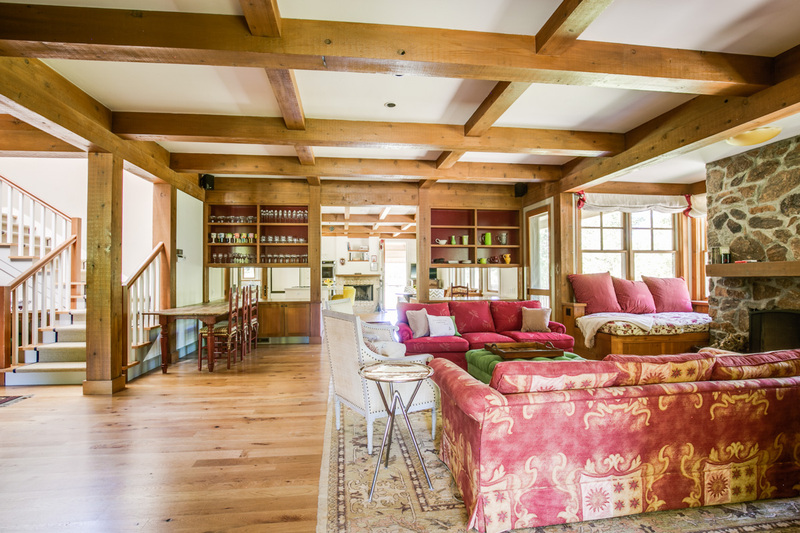 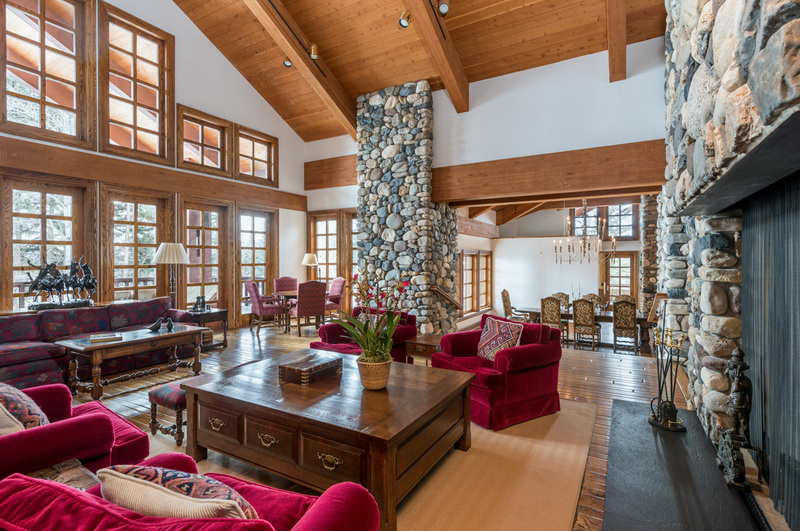 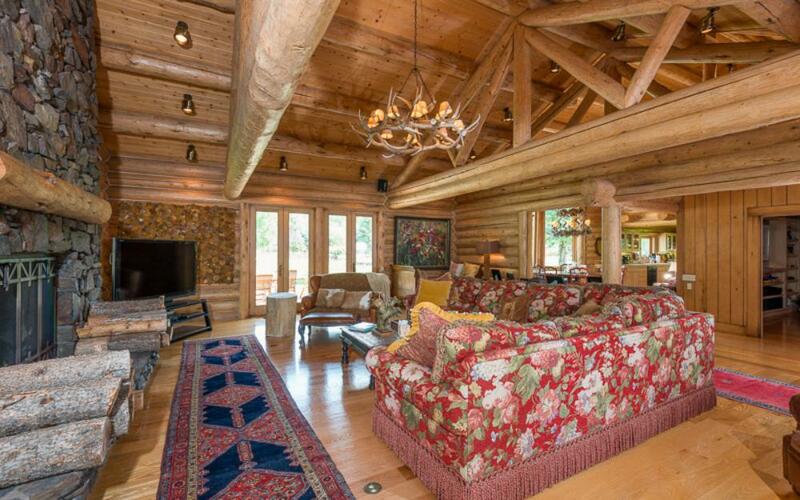 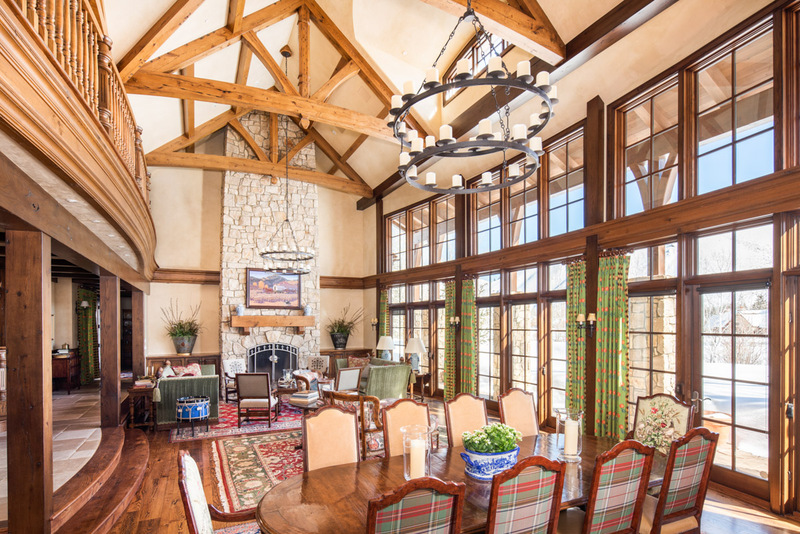 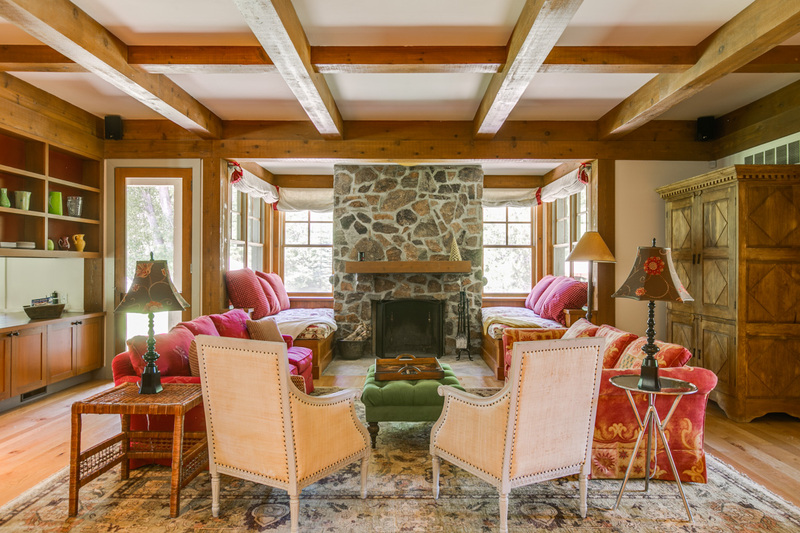 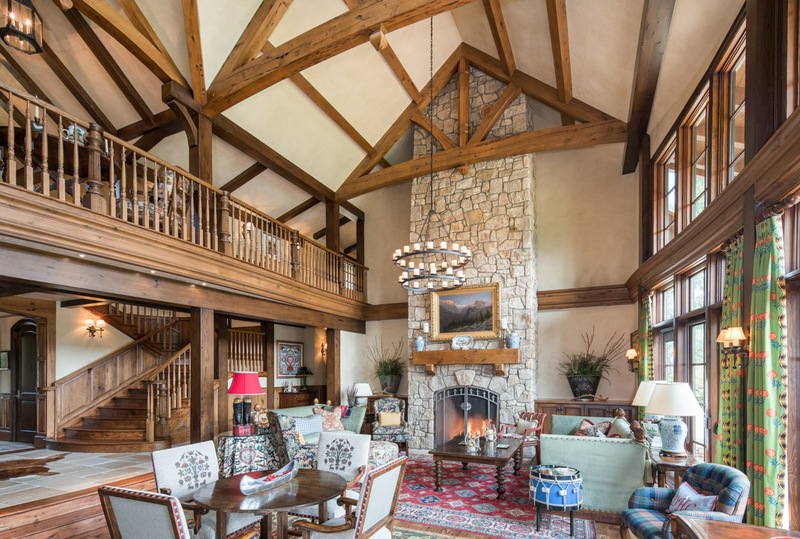 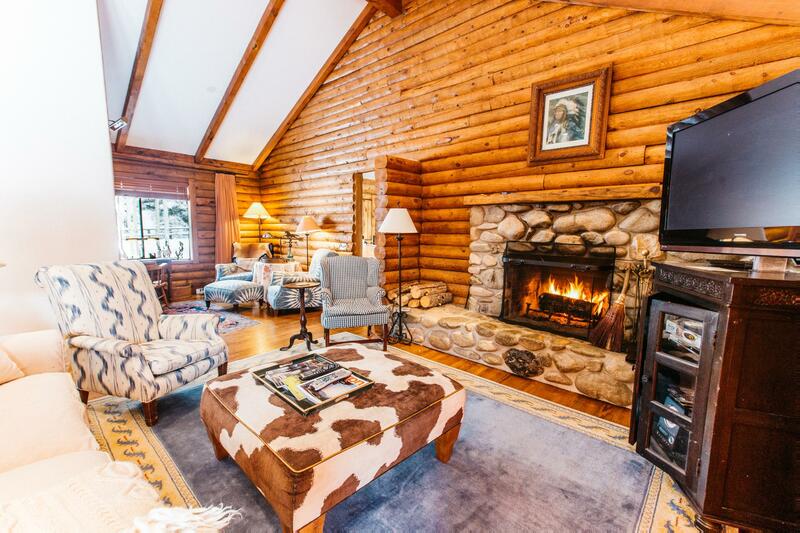 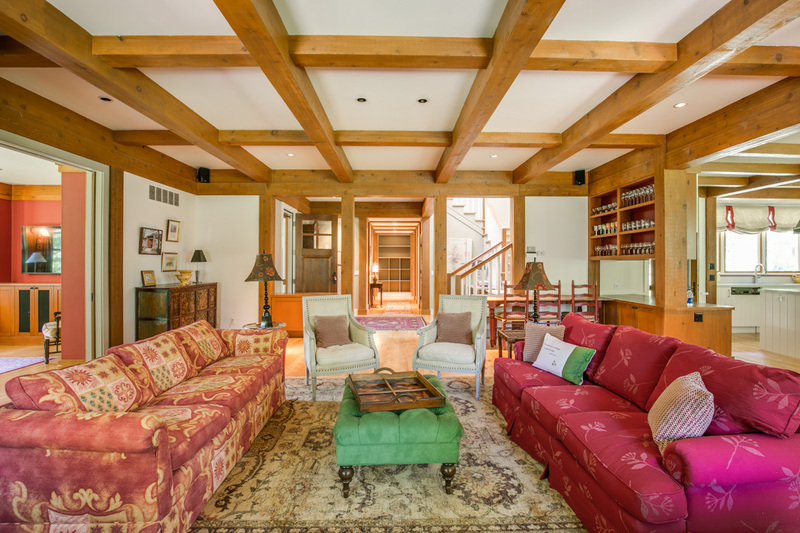 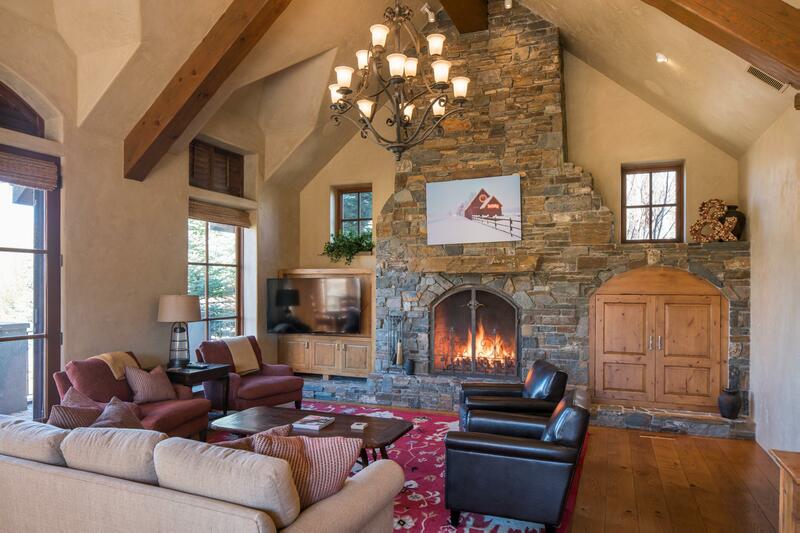 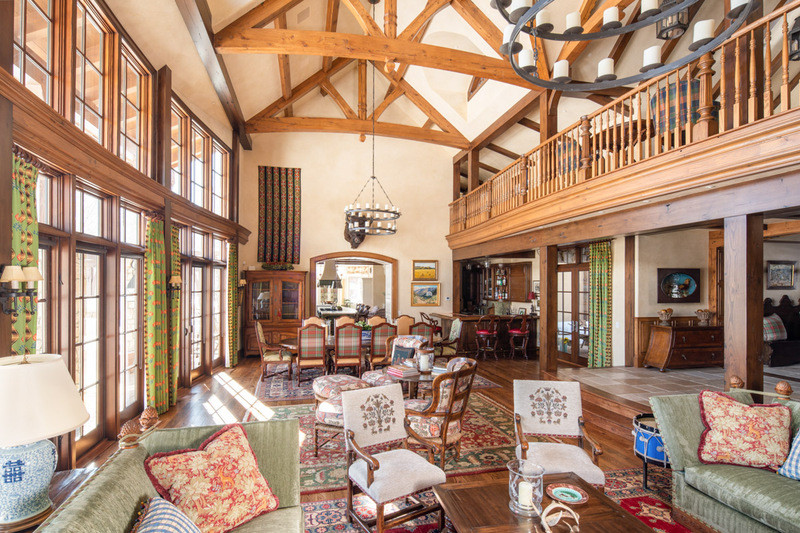 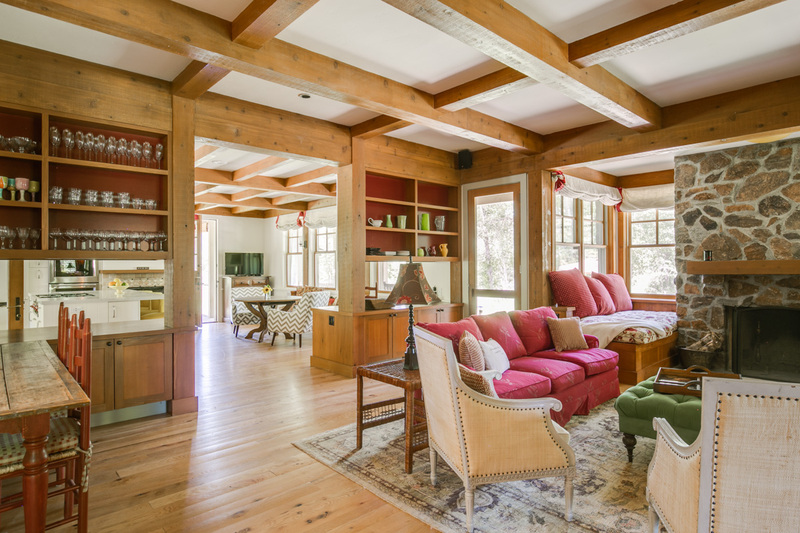 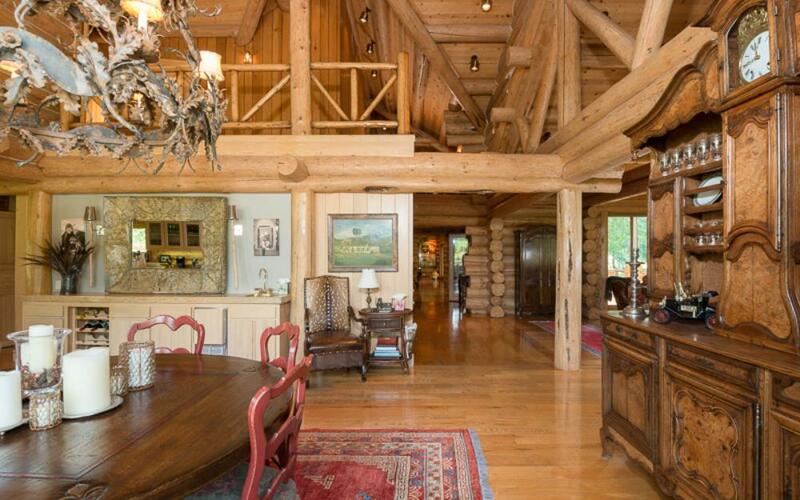 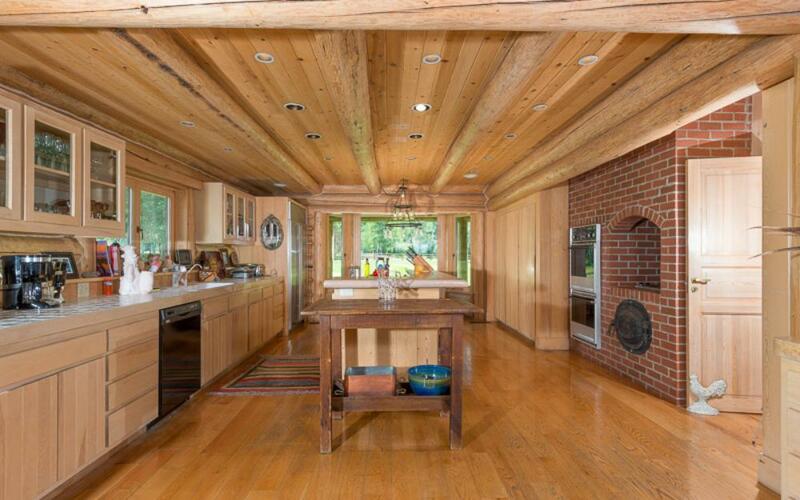 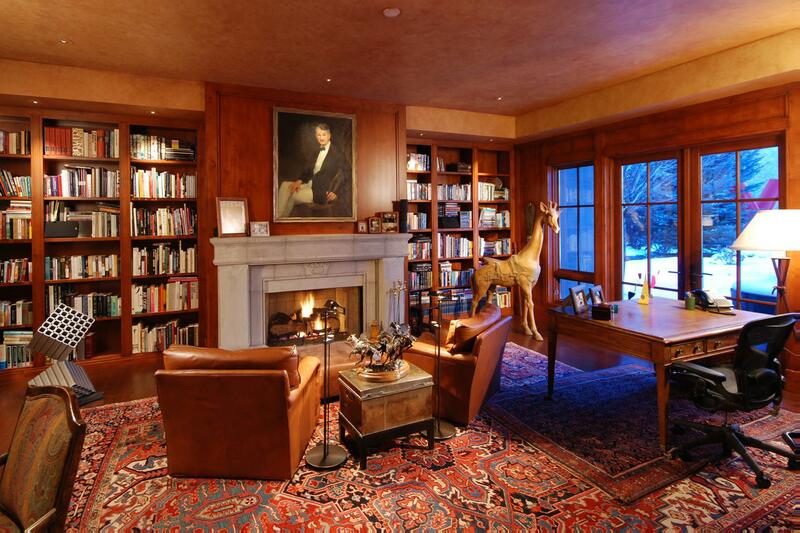 8-bedroom classic ski lodge on 85-acre gated property with sprawling grounds, abundant wildlife and guest house. 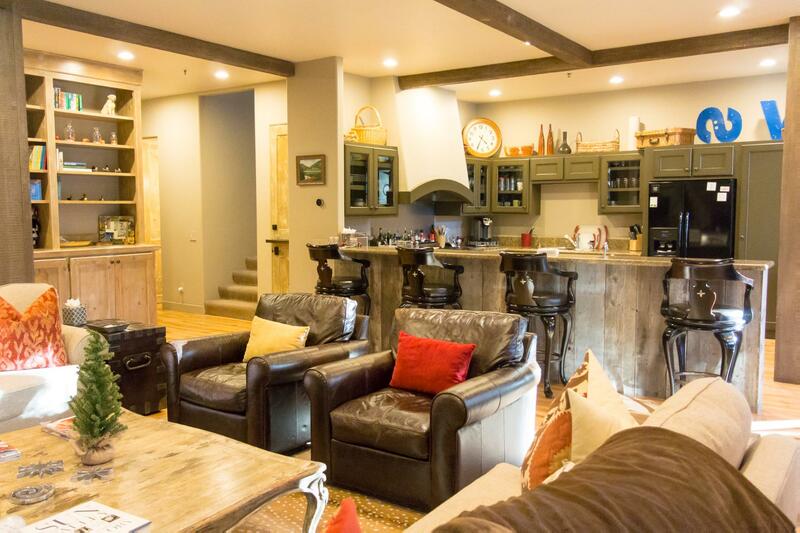 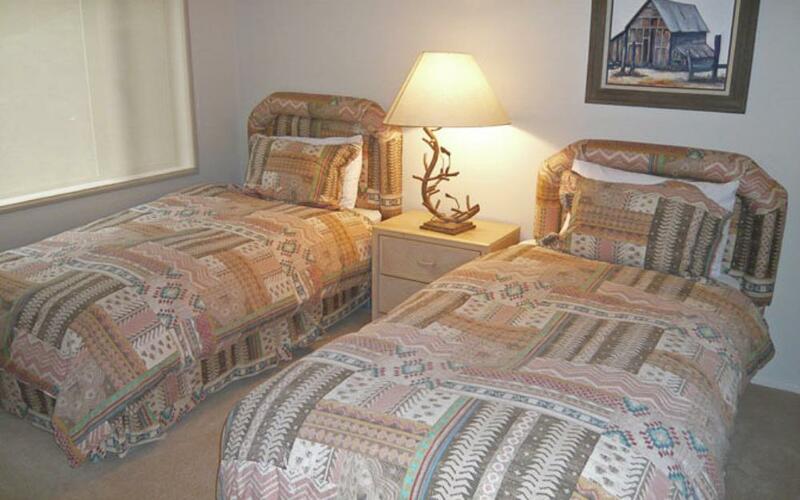 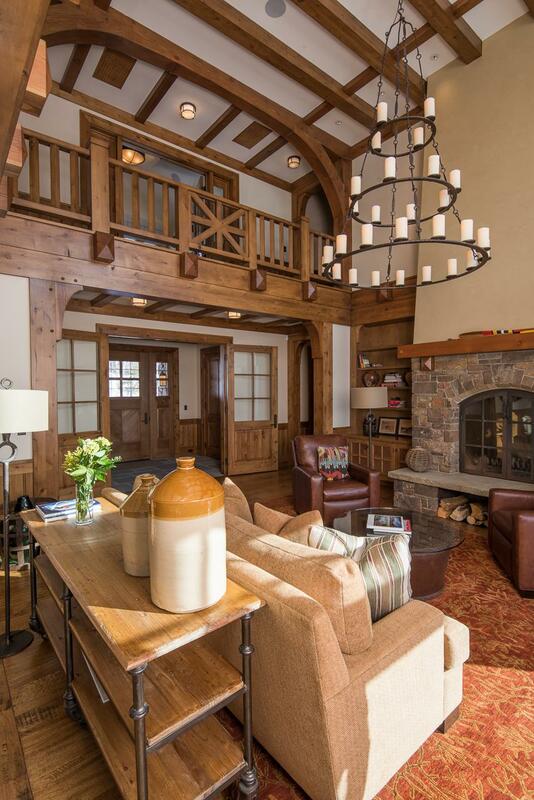 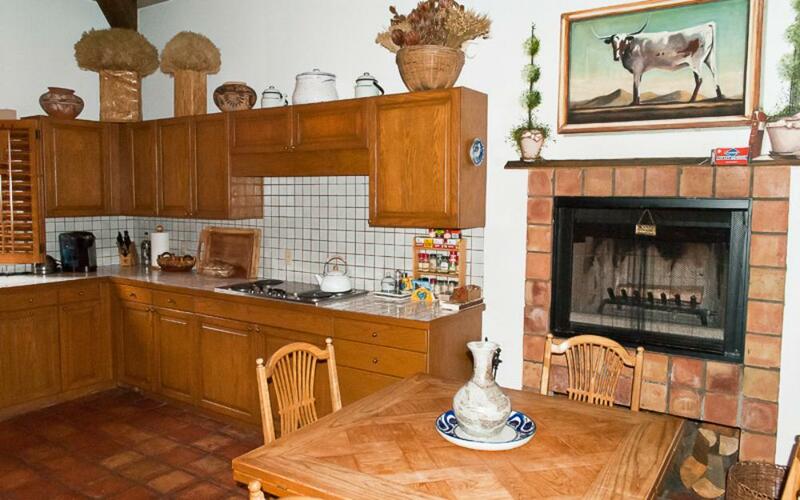 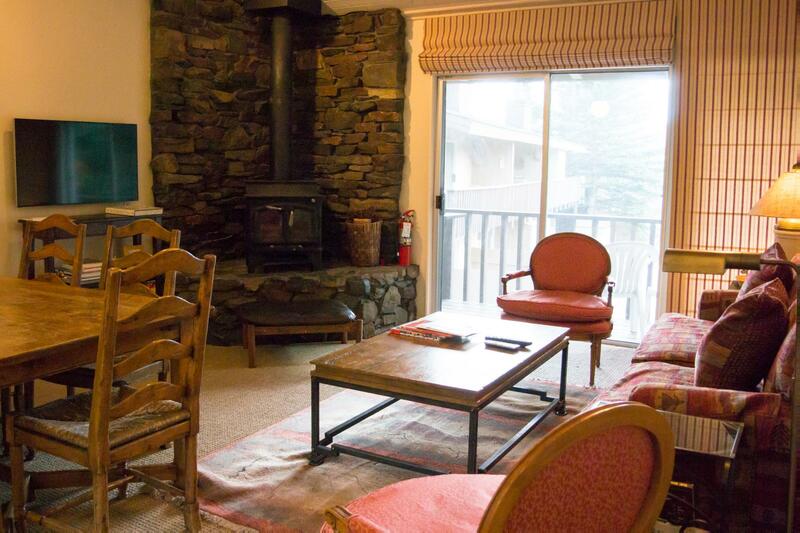 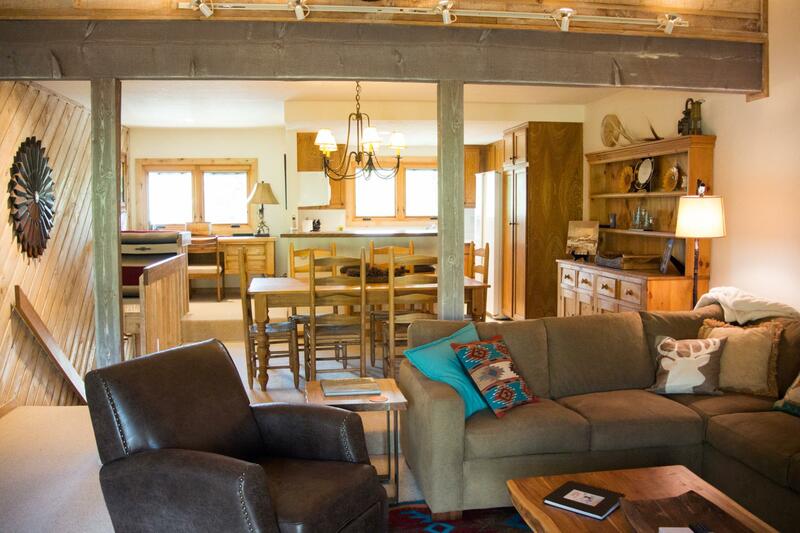 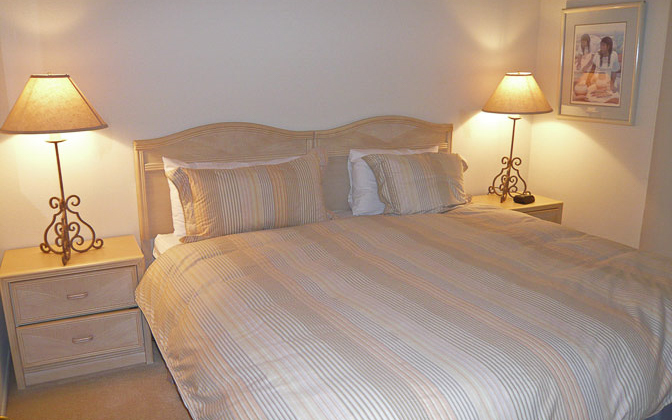 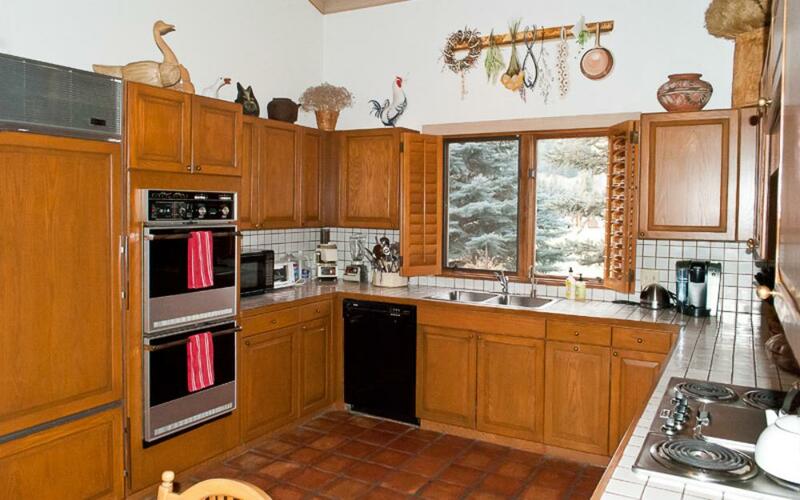 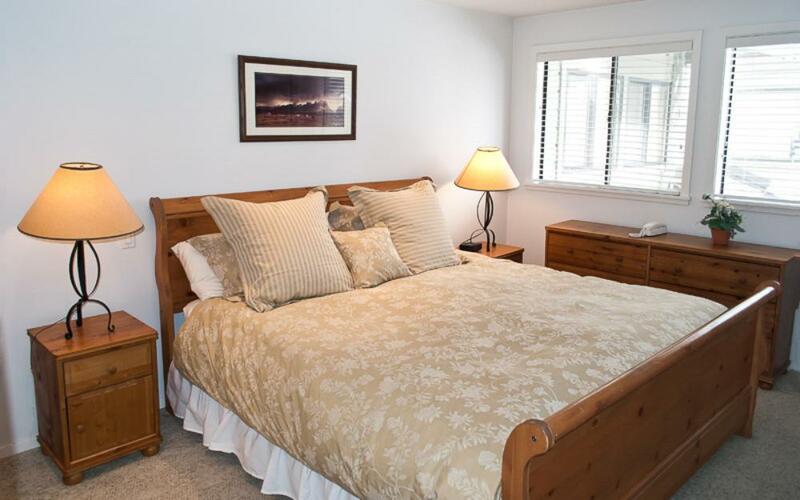 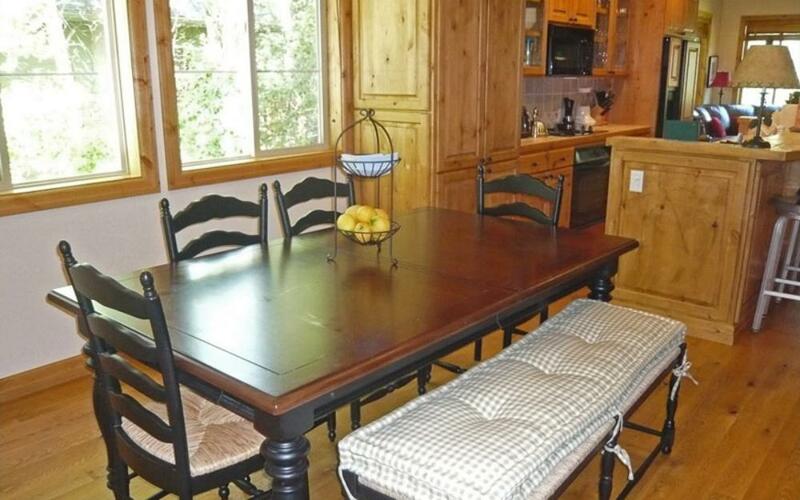 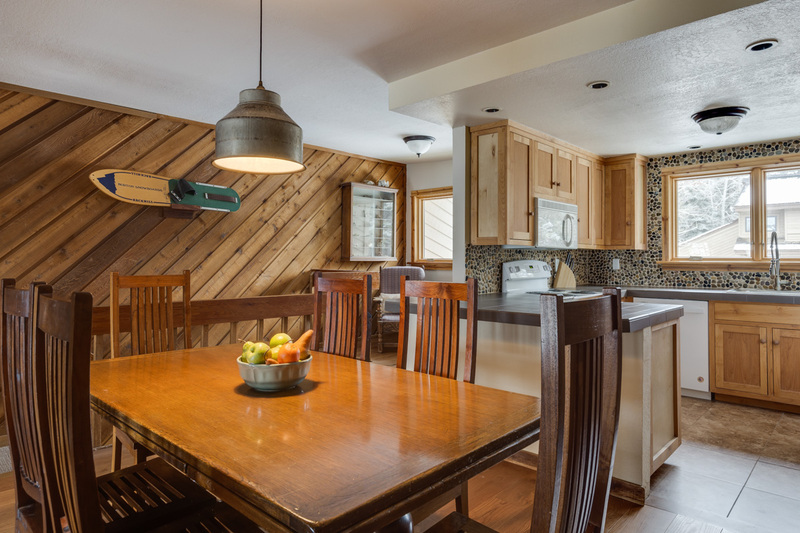 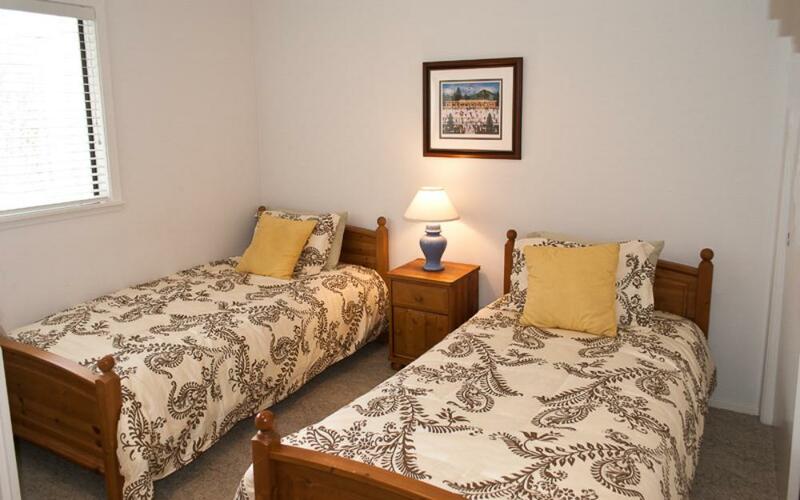 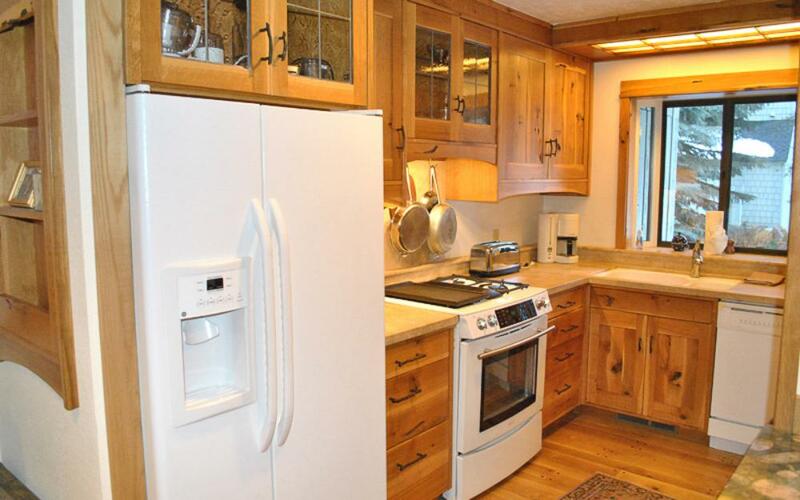 Family-friendly condo with mountain views and hot tub access -- short walk to chairlift. 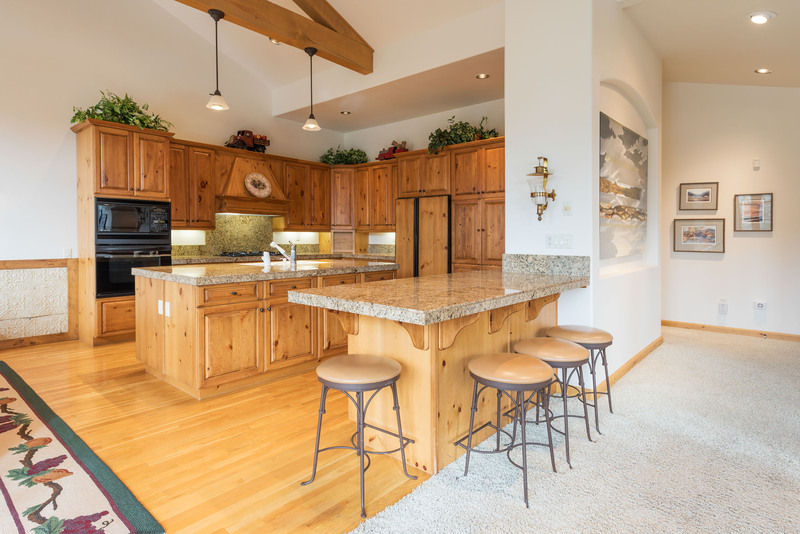 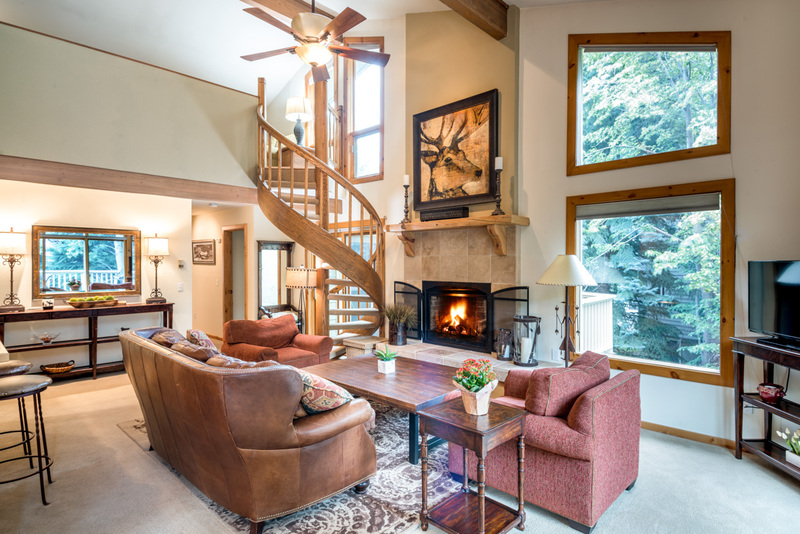 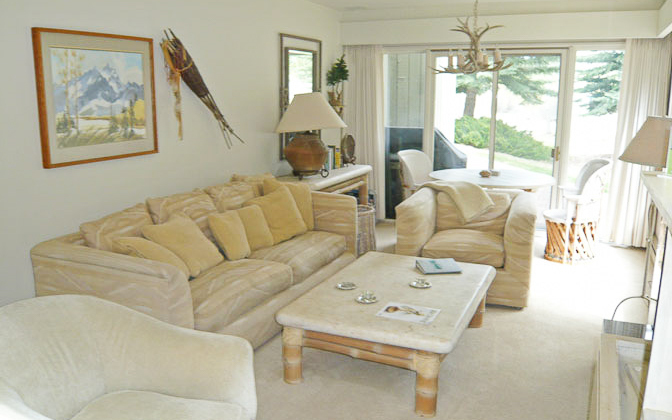 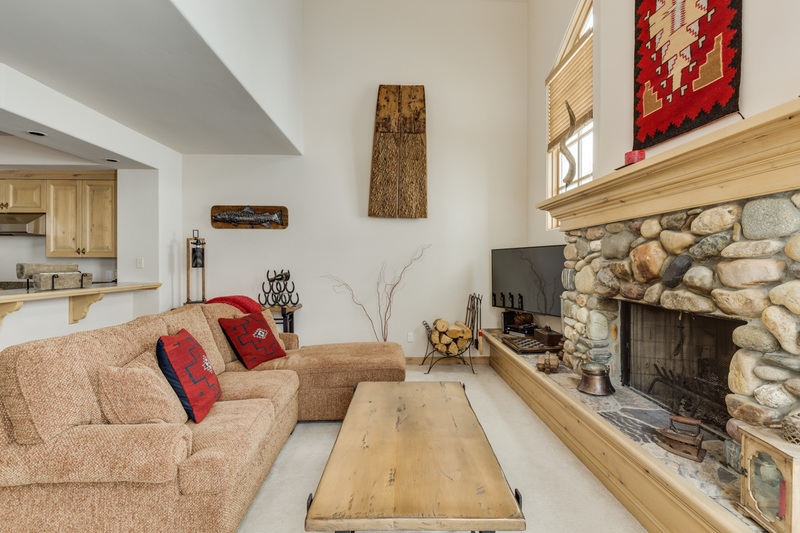 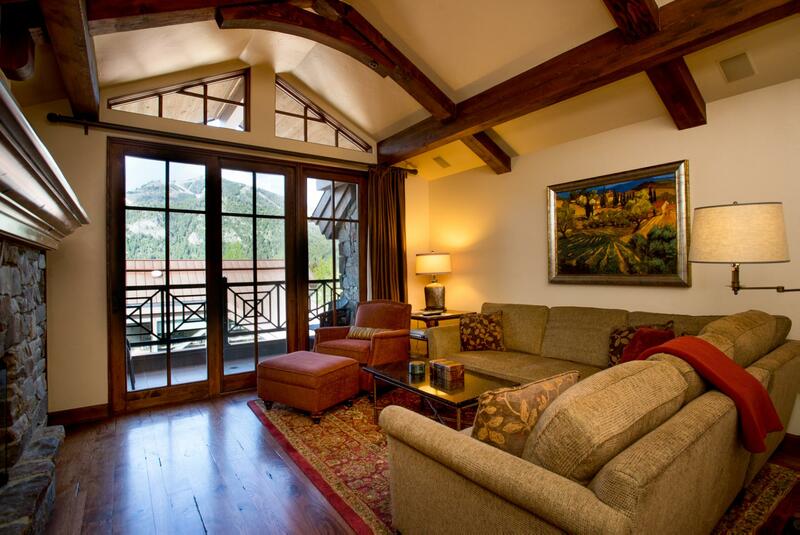 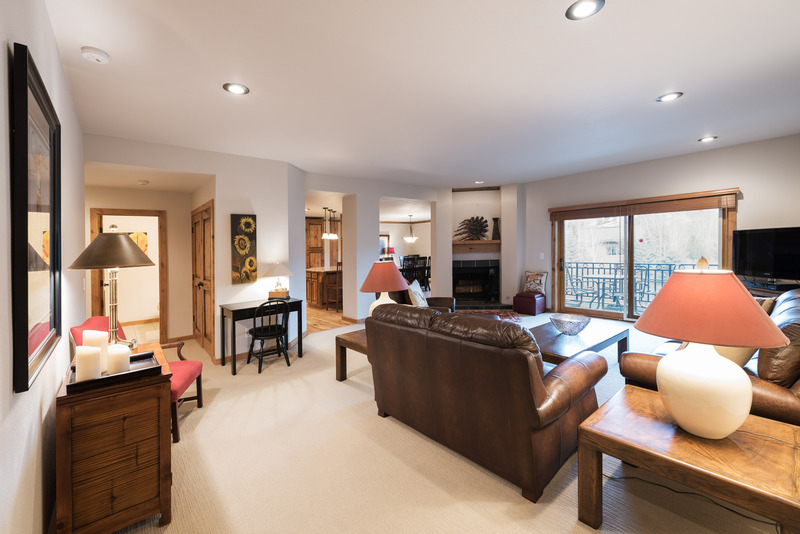 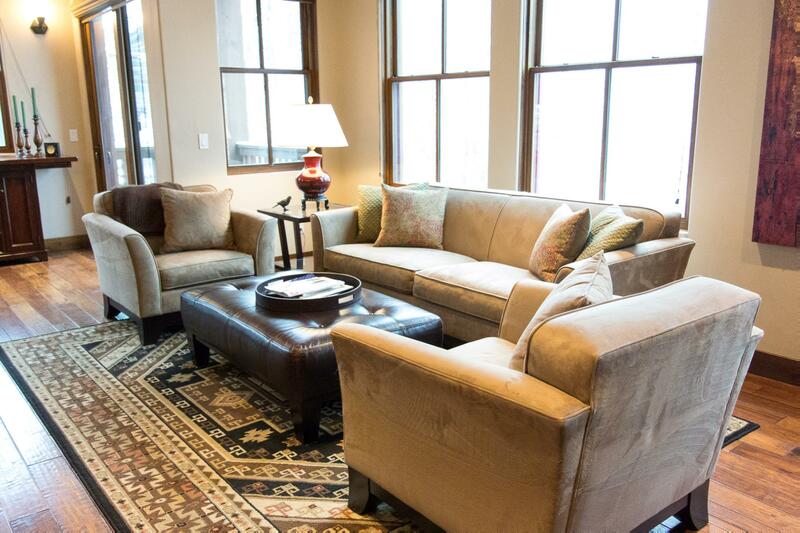 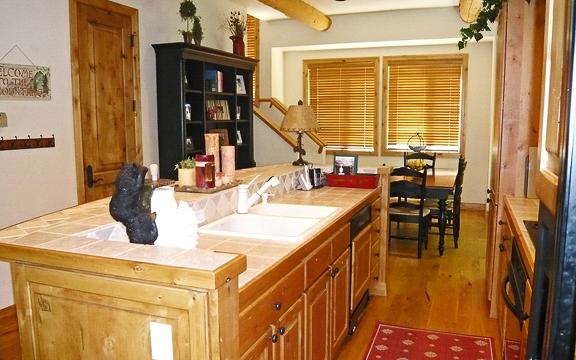 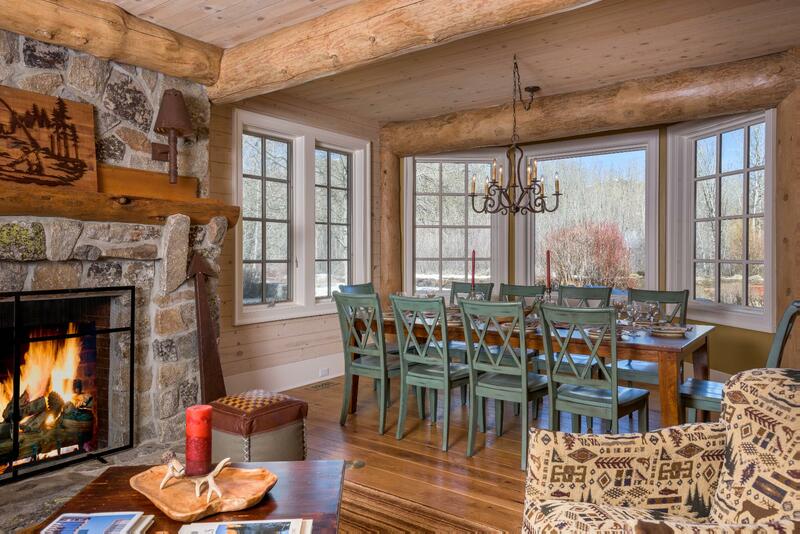 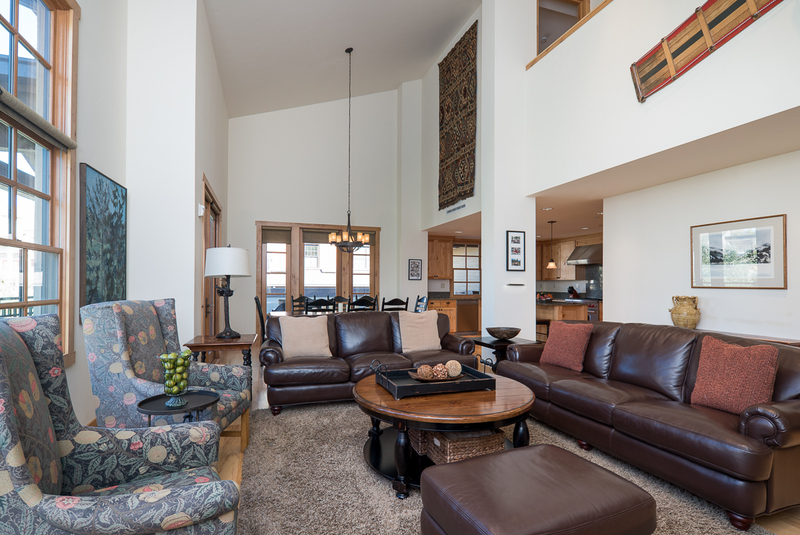 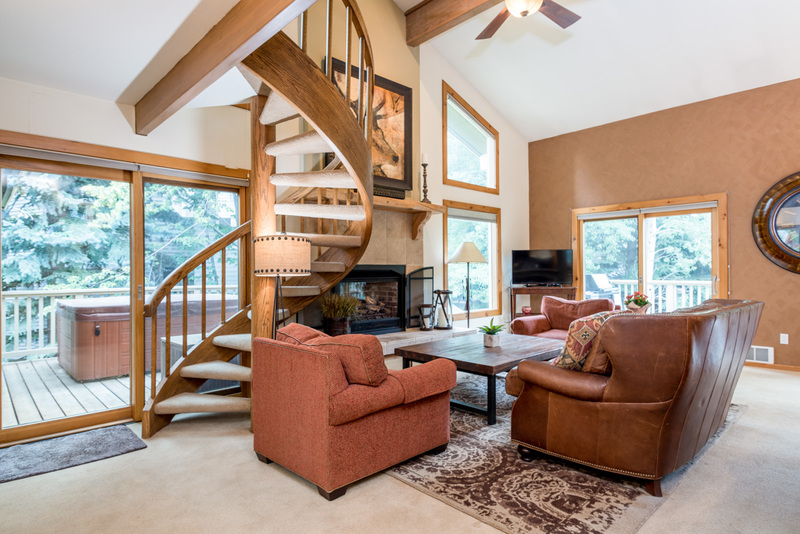 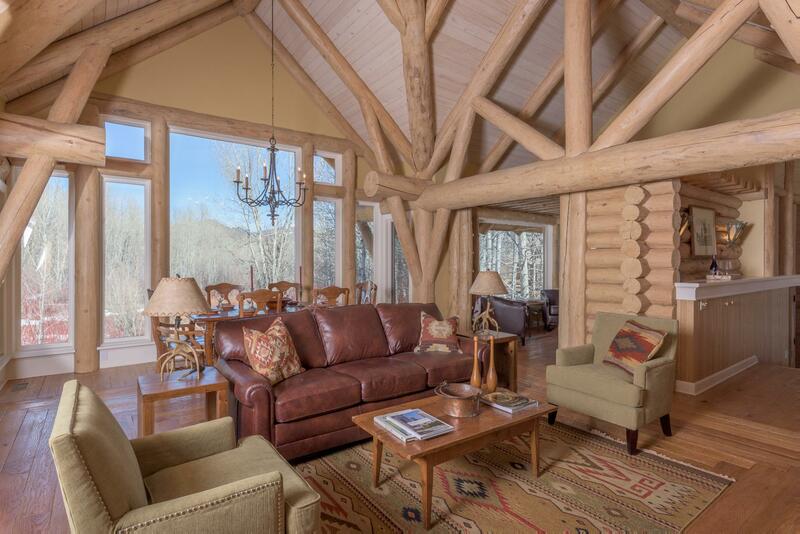 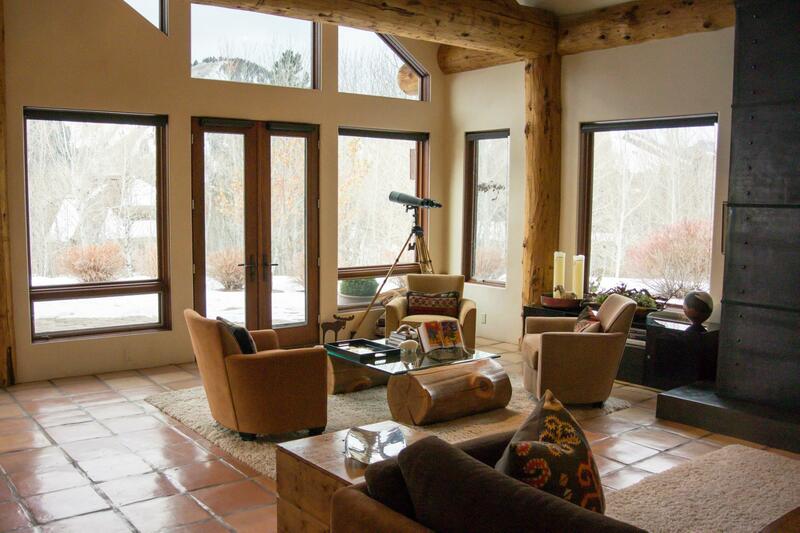 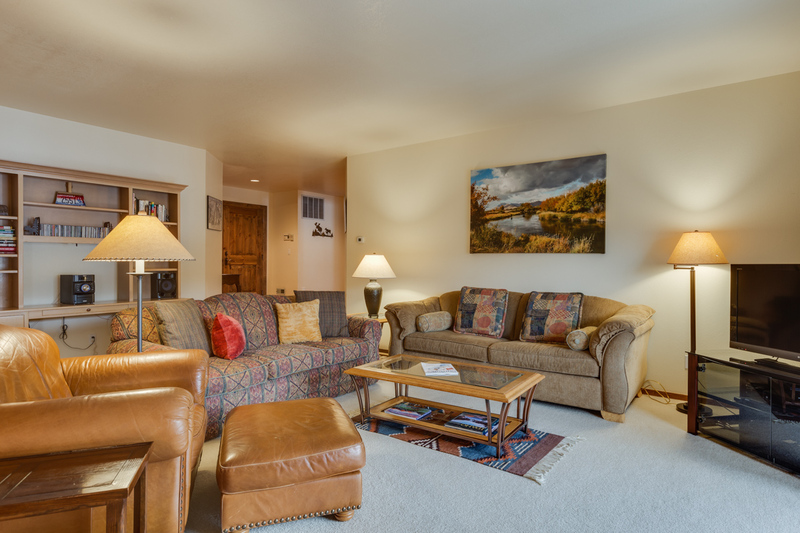 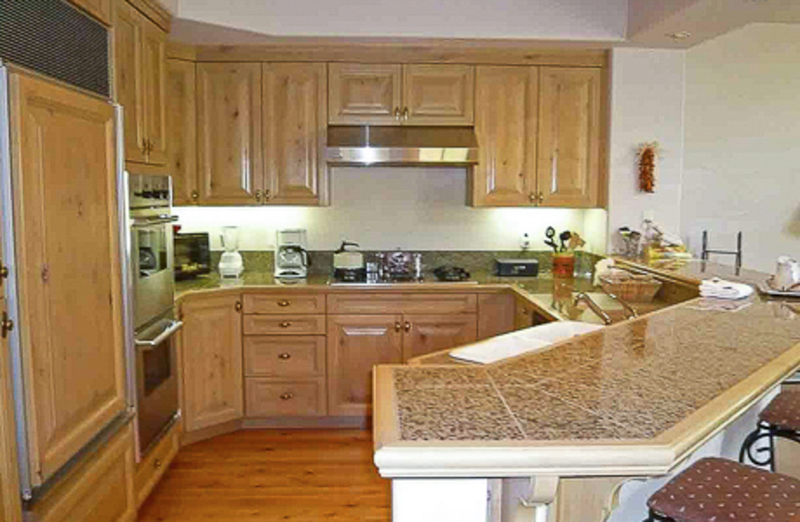 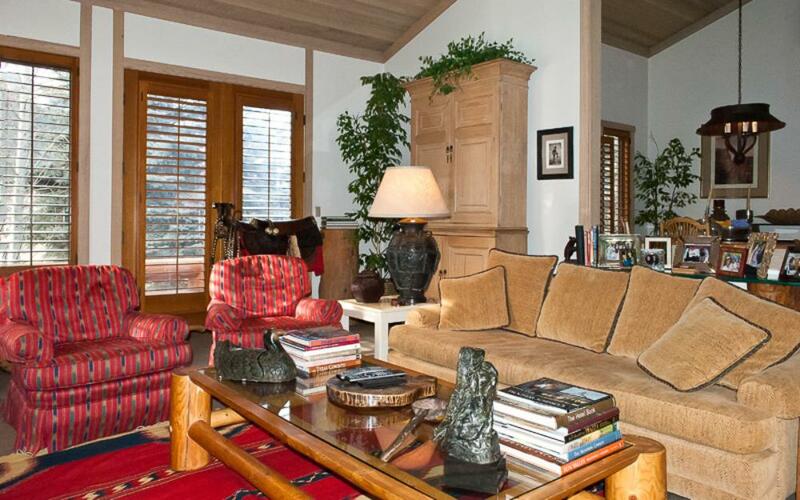 Light-filled condo on Warm Spring Creek with mountain vista views, steps from the lifts. 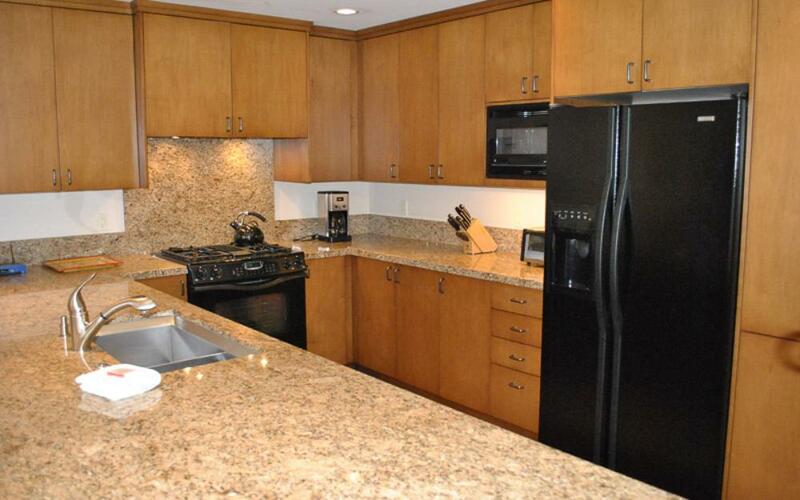 Adjacent condo available to reserve for larger groups. 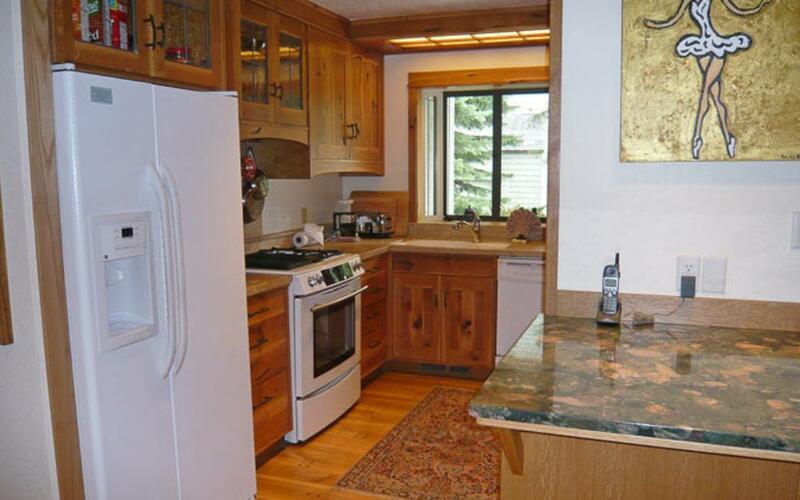 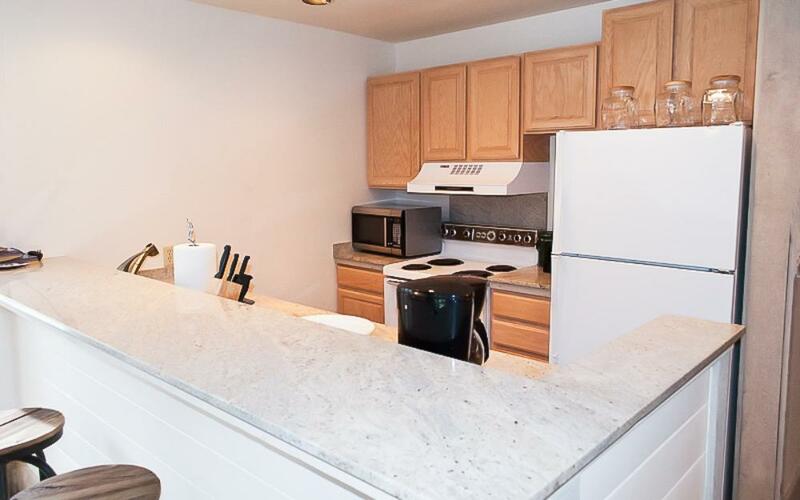 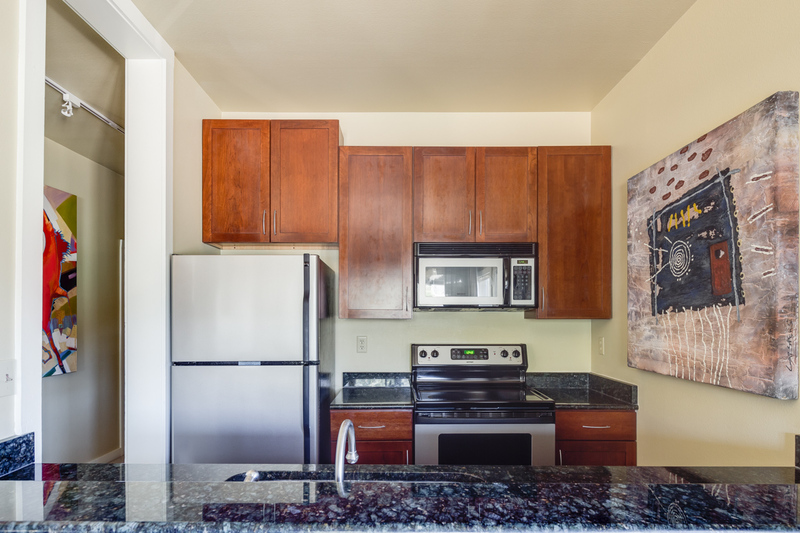 Remodeled corner condo next to Dollar Mountain with upgraded kitchen and expanded deck. 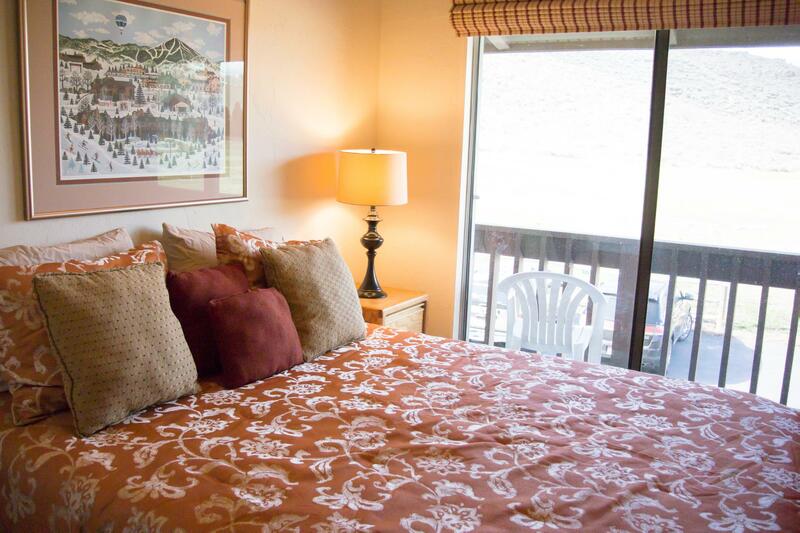 Enjoy access to shared pool and hot tub. 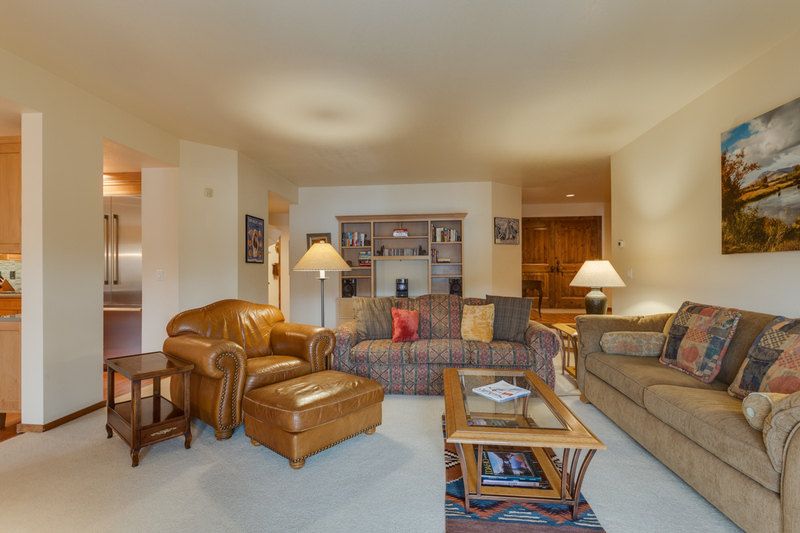 Airy, updated condo near Sun Valley Village with cheerful decor, mountain views and option to access resort amenities. 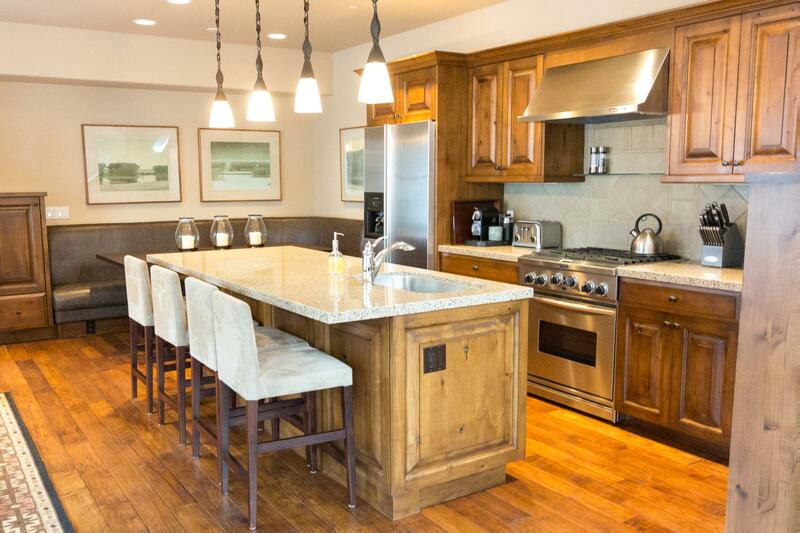 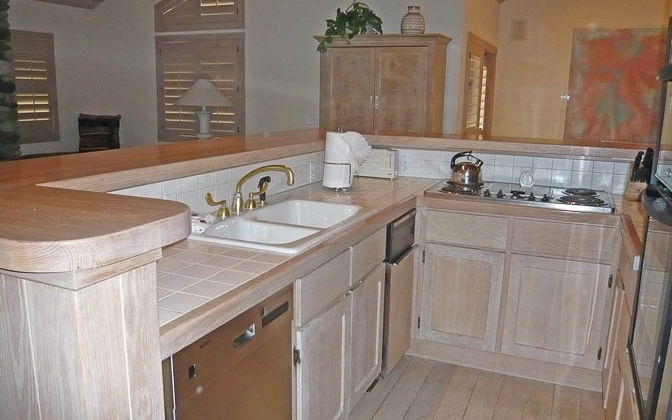 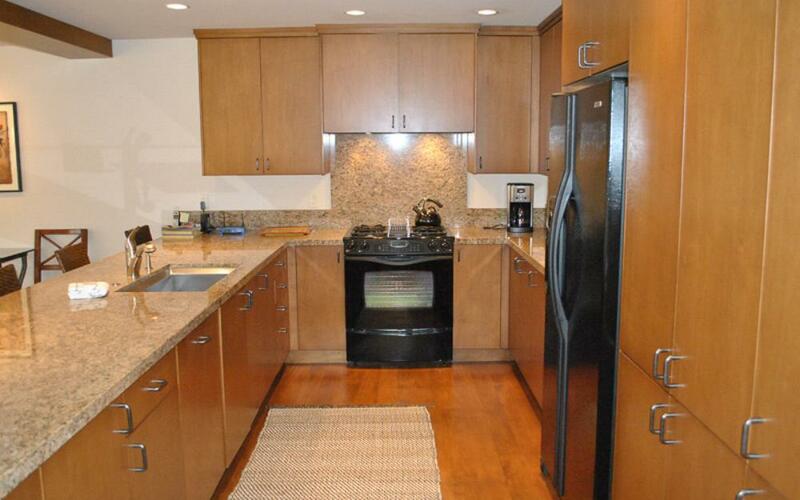 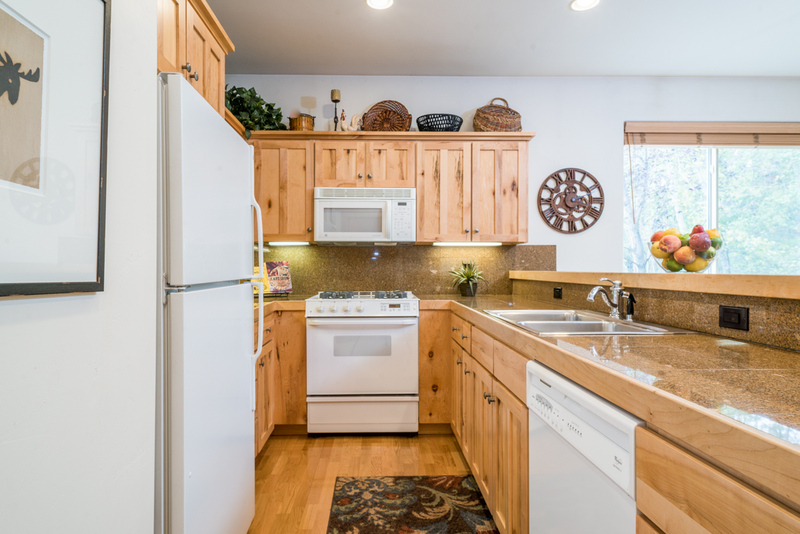 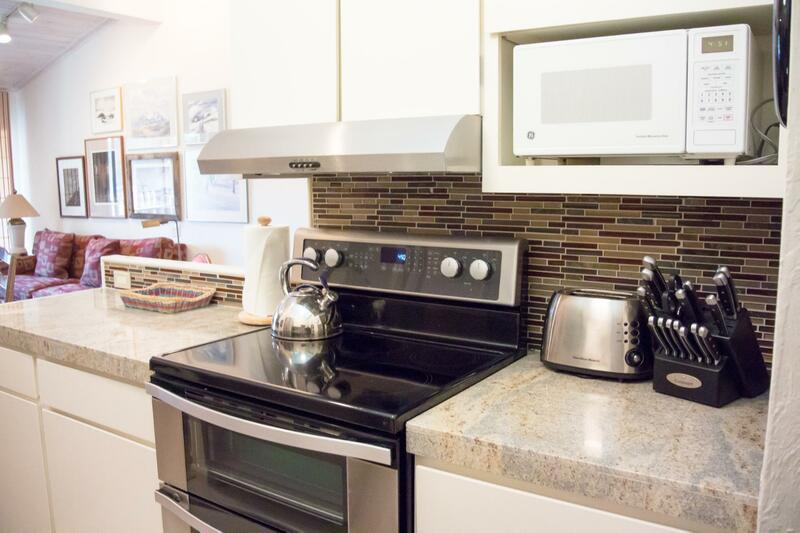 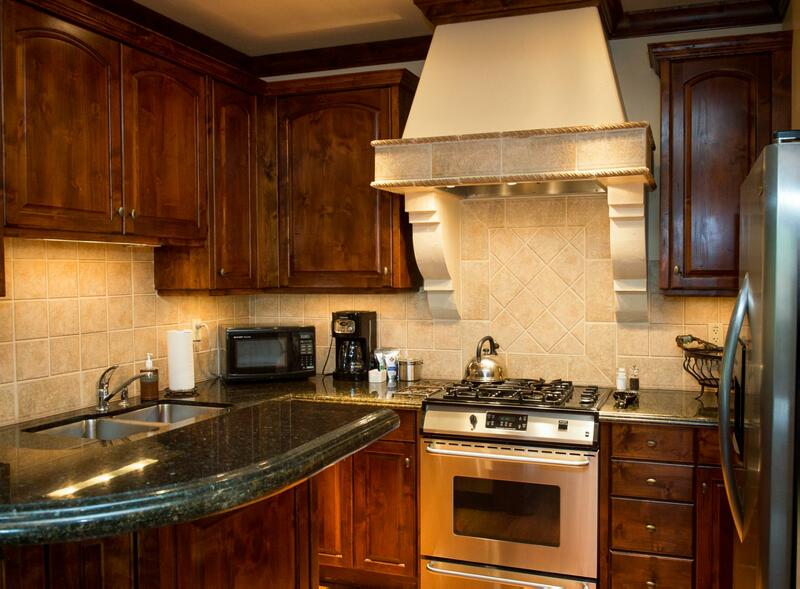 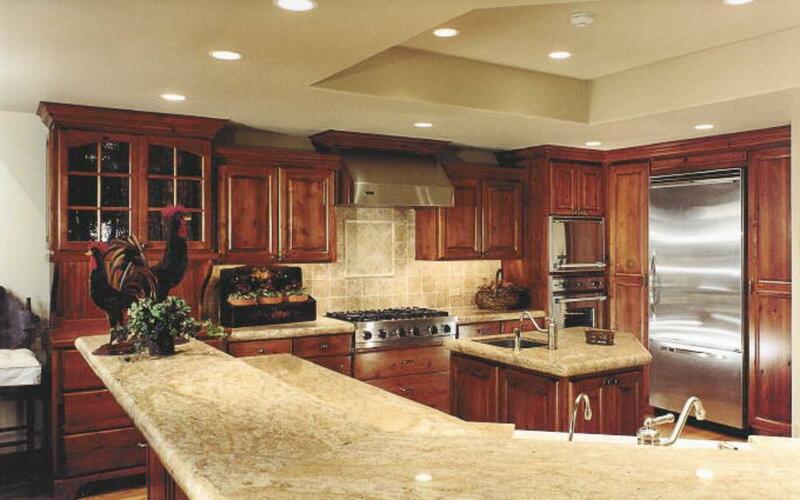 Newly remodeled condo with new appliances and luxury accents -- enjoy mountain views and full Sun Valley amenities. 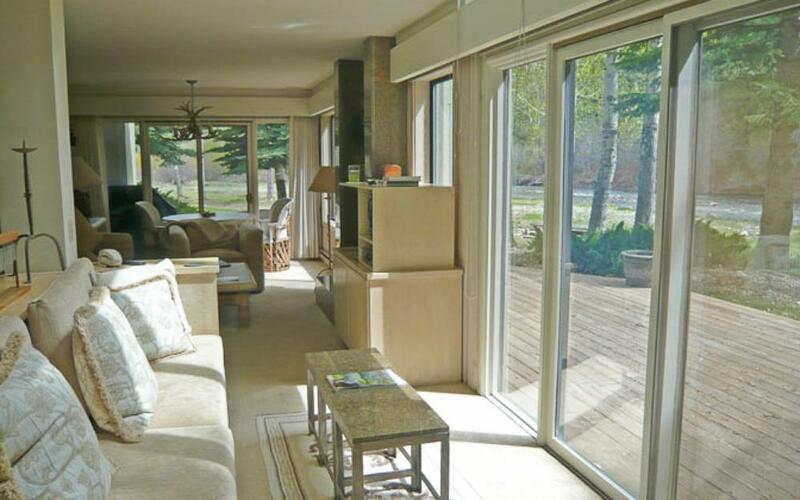 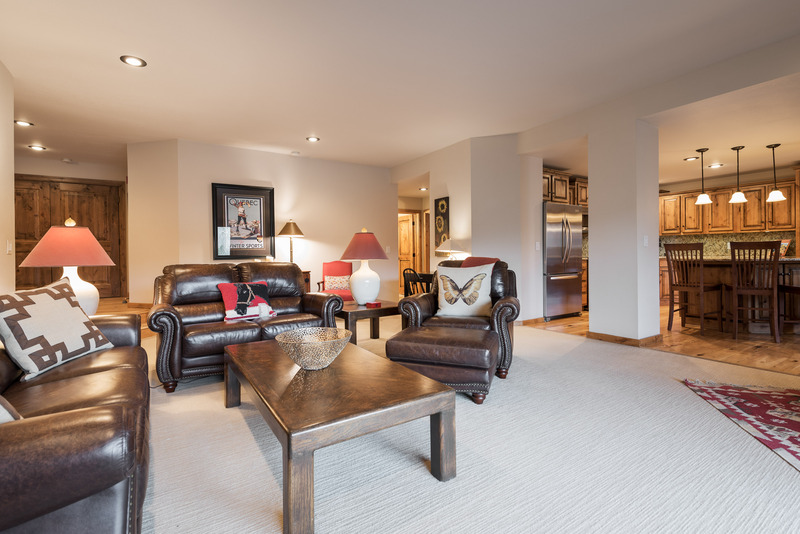 Beautifully decorated condo on Elkhorn golf course with a private deck, lush views and hot tub access. 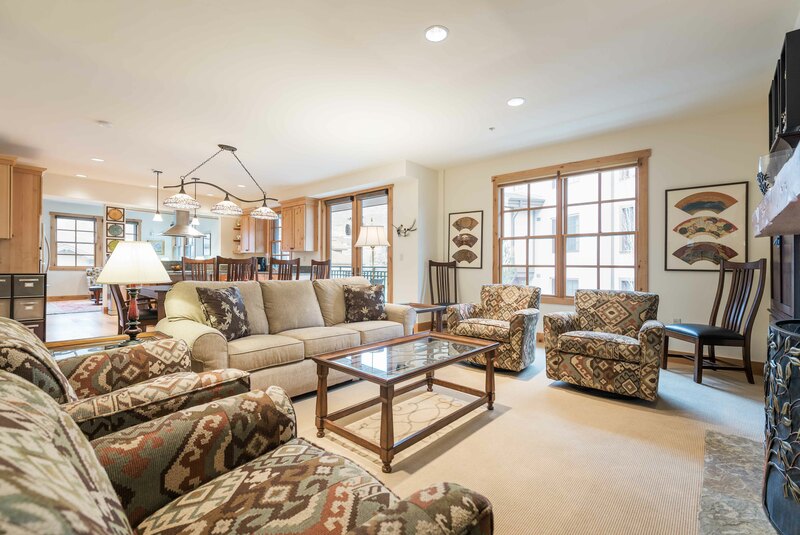 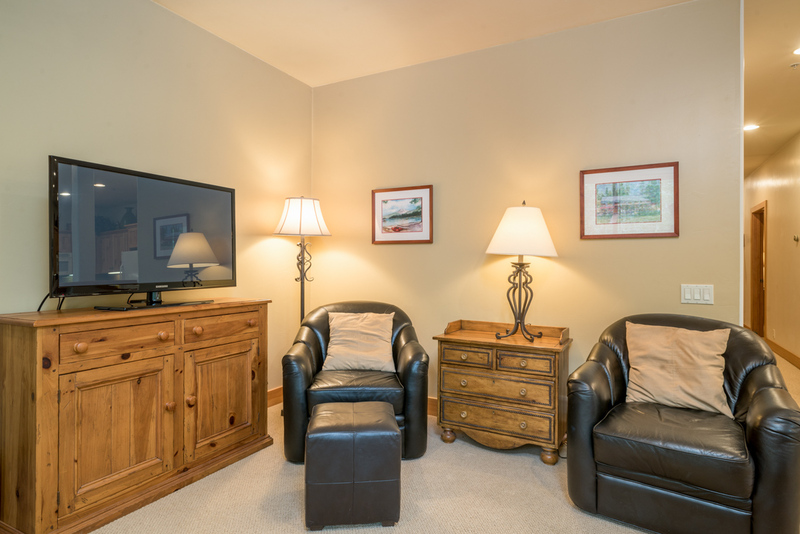 Spacious, remodeled corner condo with easy access to golf course, hot tub and tennis courts at Elkhorn Village. 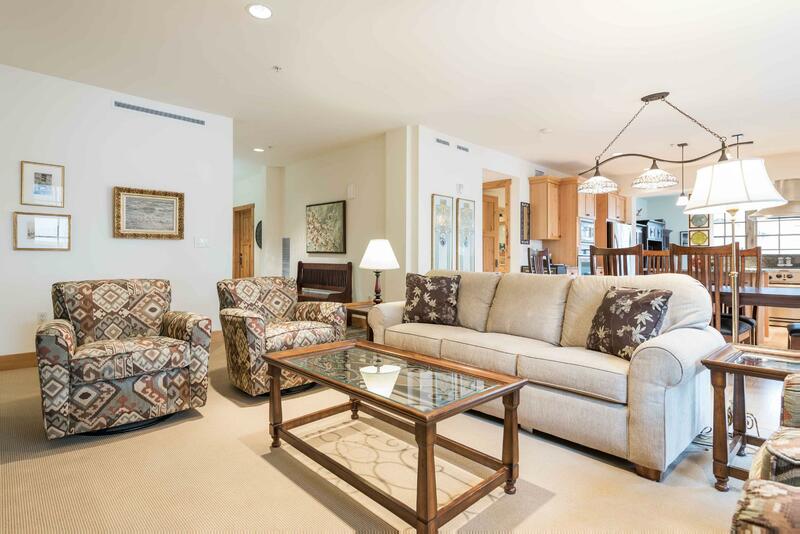 Family-friendly condo with loft, sweeping golf course and mountain views, wood fireplace, and clubhouse amenities. 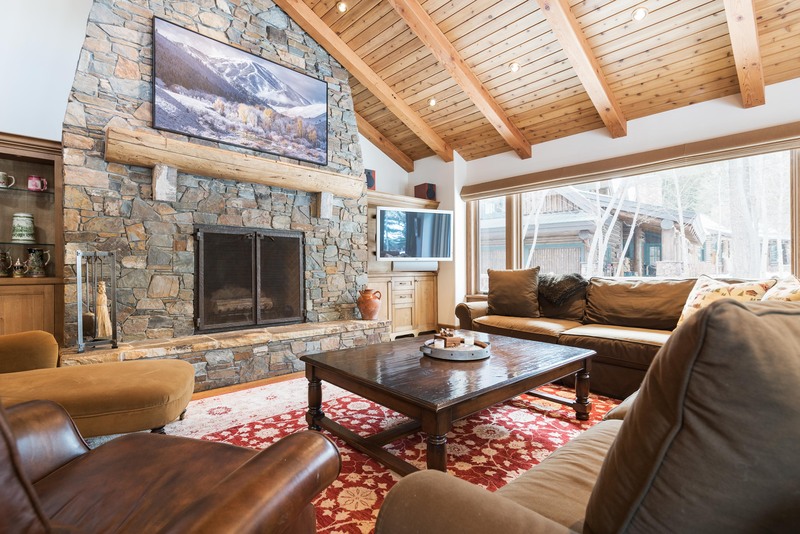 Inviting, centrally located condo with media room, mountain views and access to resort amenities -- walk to Sun Valley Village. 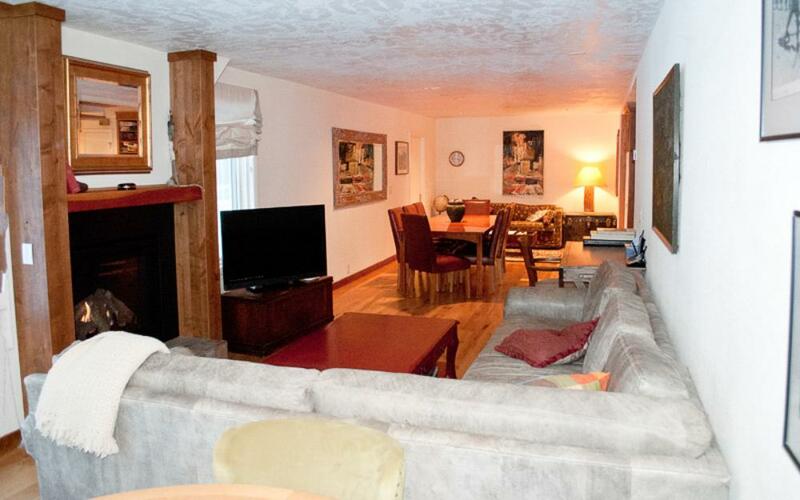 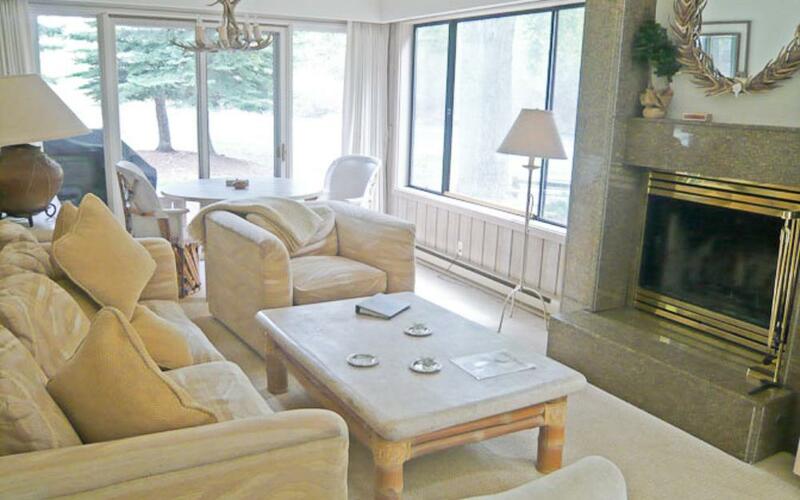 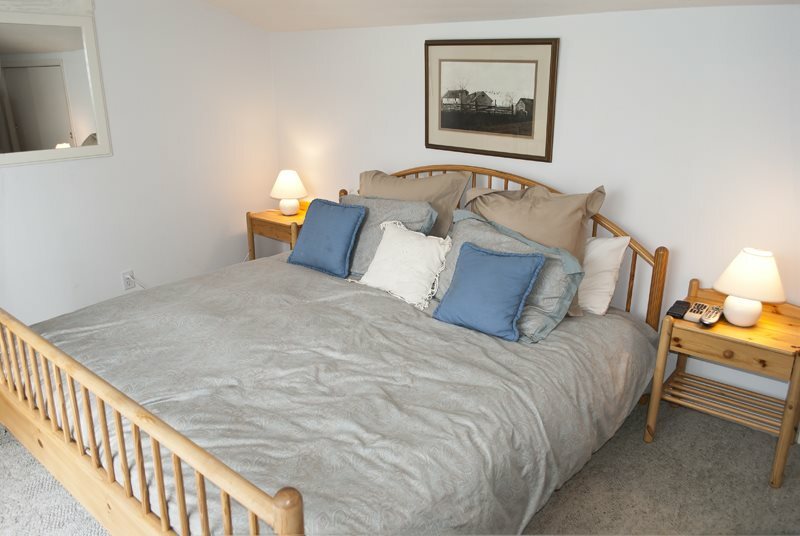 Sunny slope-side condo with private deck and access to hot tub, sauna and swimming pool. 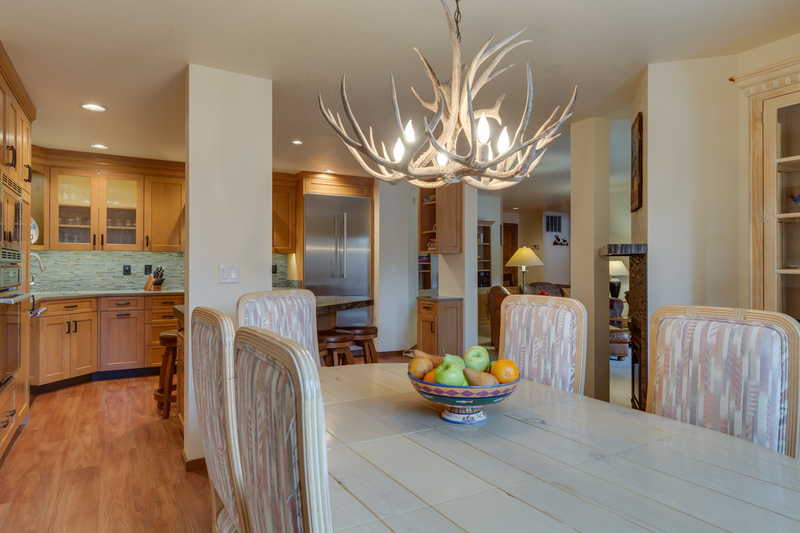 Charming remodeled ski condo with mountain views, Southwestern accents and option to access full resort amenities. 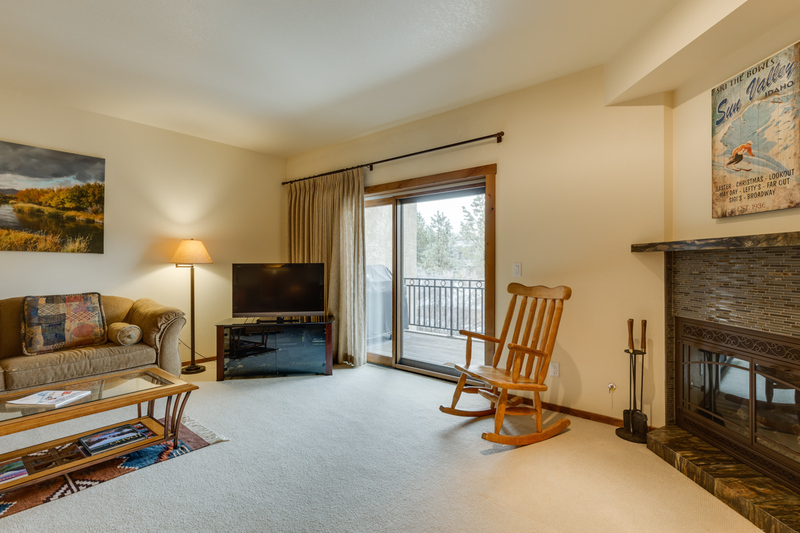 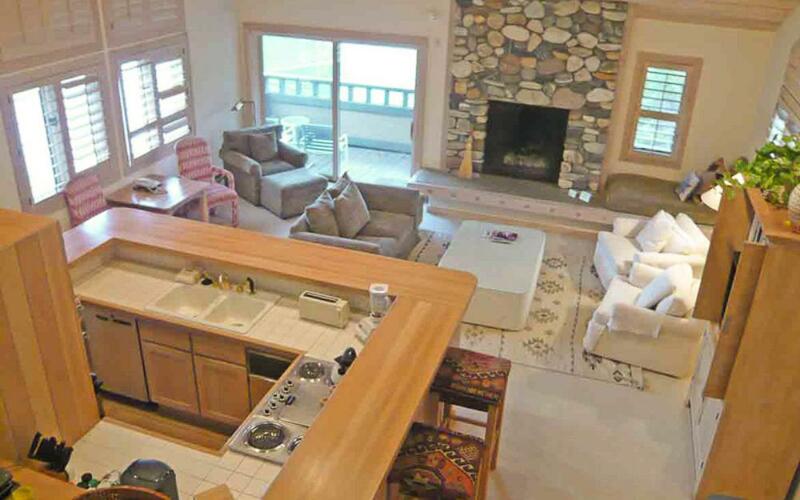 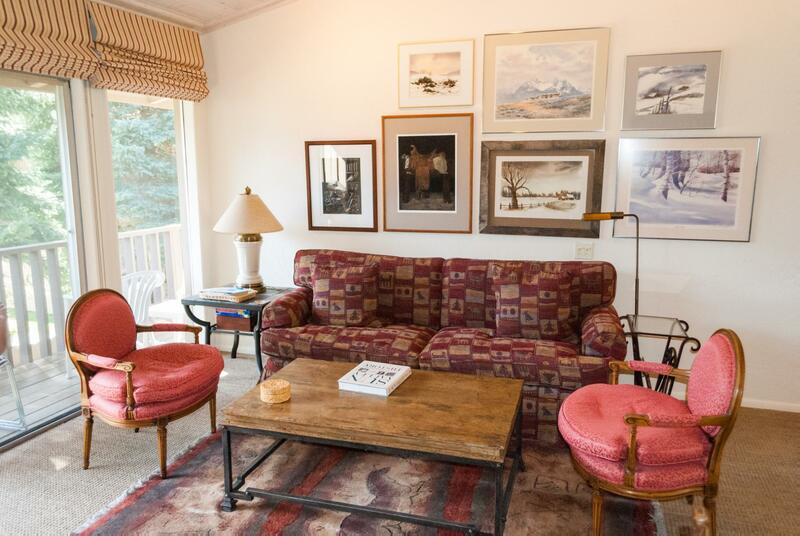 Tranquil mountain condo with relaxing deck and Bald Mountain views -- walk to Sun Valley Village and The Pavilion. 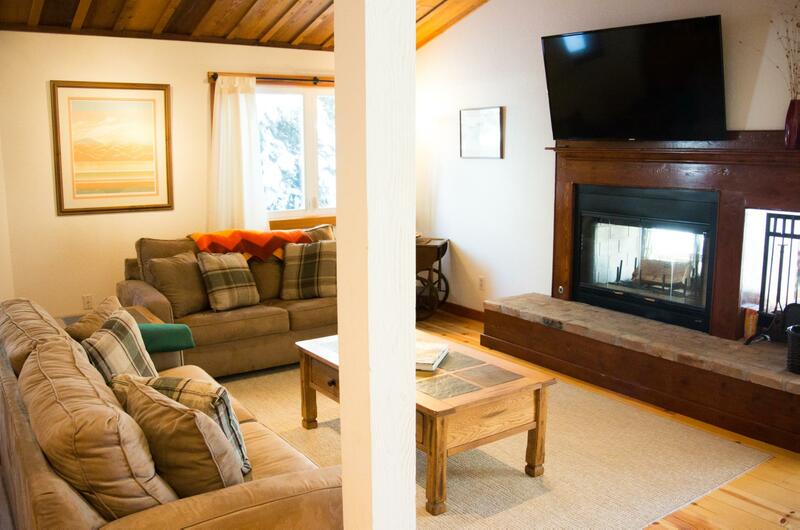 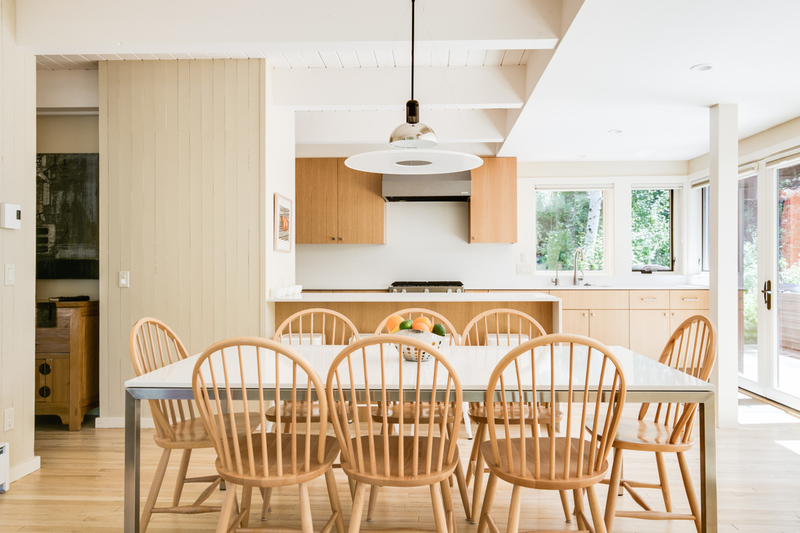 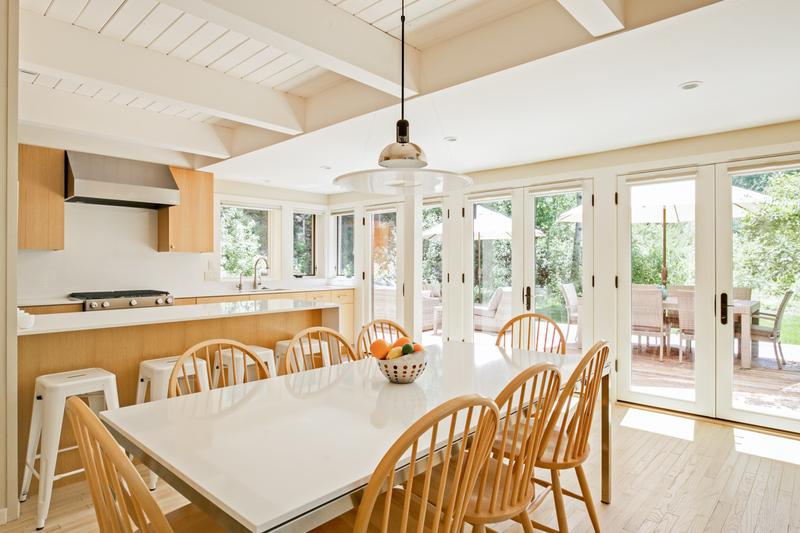 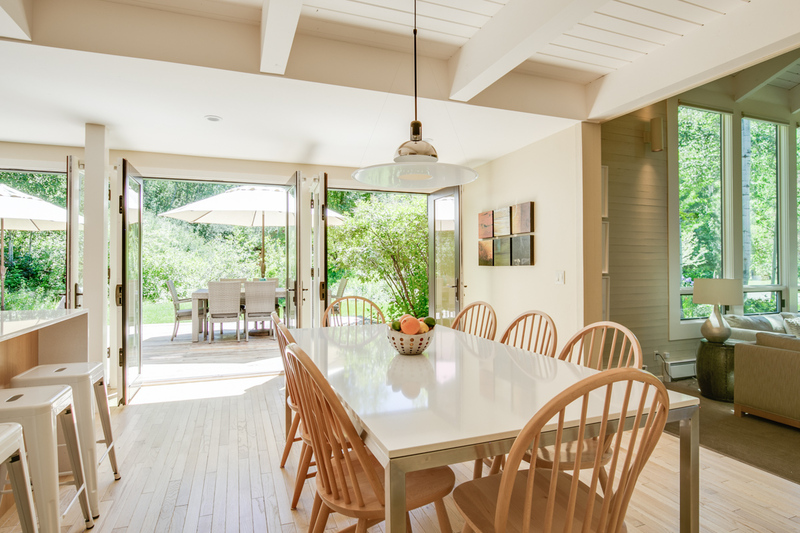 Leave the stressful family reunions behind and let Natural Retreats plan a perfect vacation for your family in beautiful Sun Valley where infectious cheeriness and sunshine will help you create great new memories. 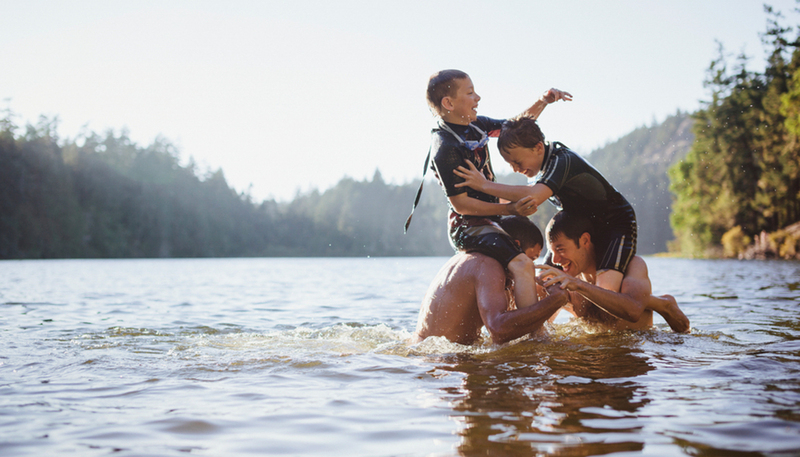 Whether it’s Grandpa showing Junior how to tie the perfect fly or Mom taking the helm at Redfish Lake, Sun Valley has all the fun you need to ensure that your family reunion is one that will be remembered for generations. 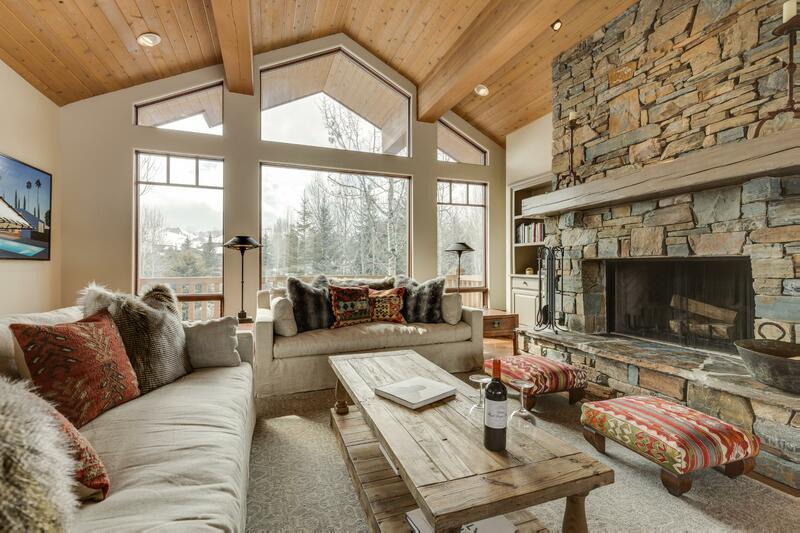 Whether you are planning an epic ski trip or a relaxing mountain escape, Sun Valley, Idaho is the place to be this Spring. 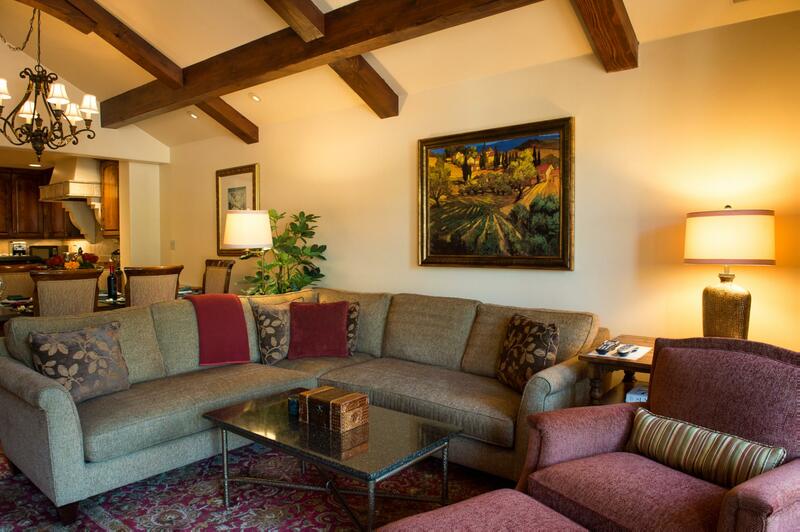 Enjoy 25% off stays in select homes from now until May 30th.